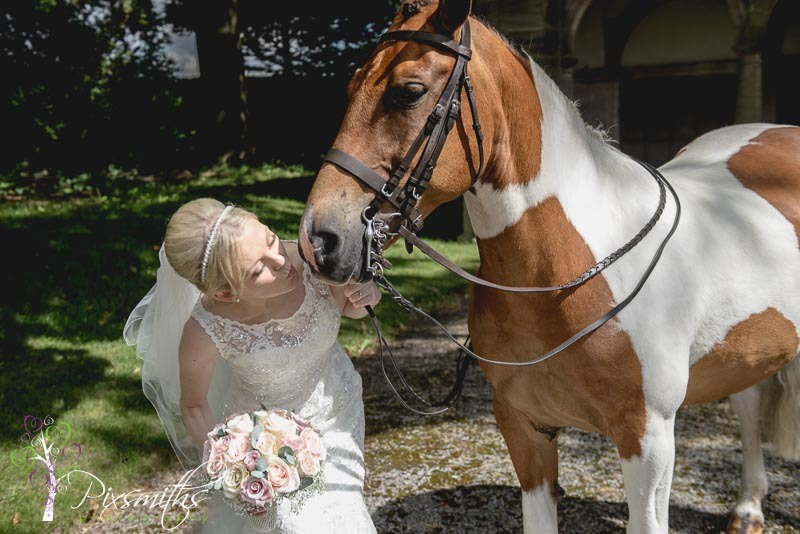 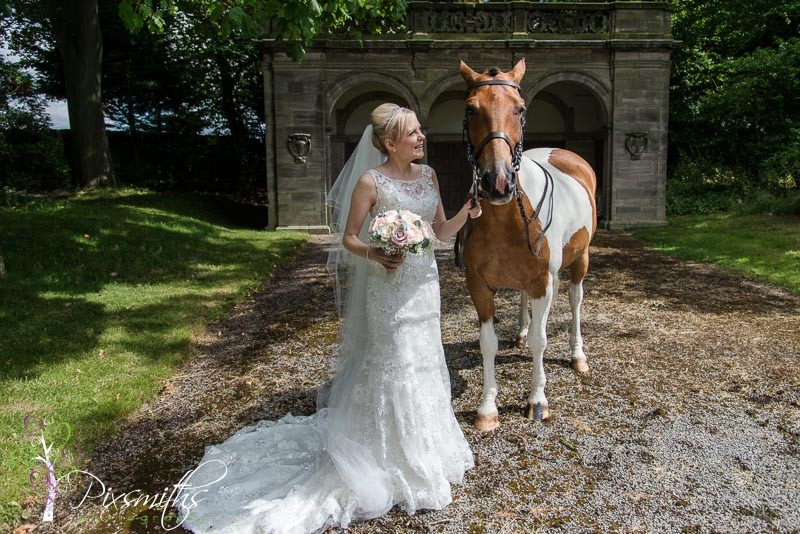 Natalie and Brian met through their mutual love of horses. 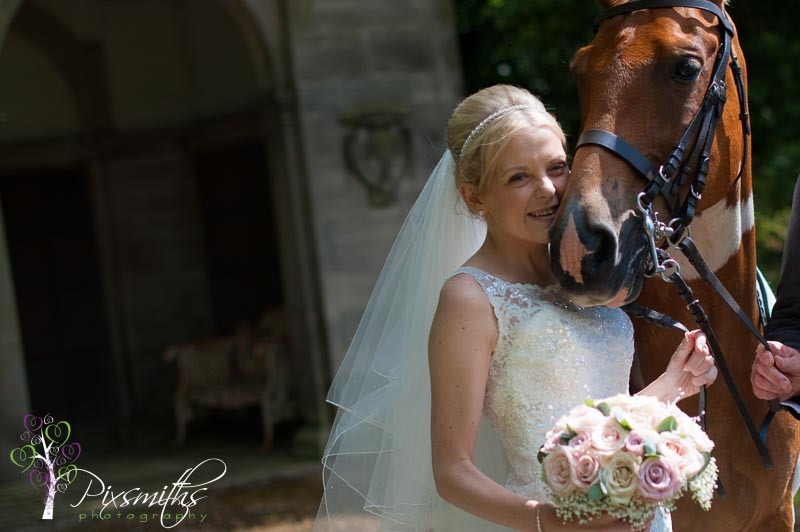 Brian was in the mounted police – he was the one to lead the Grand National horses out. 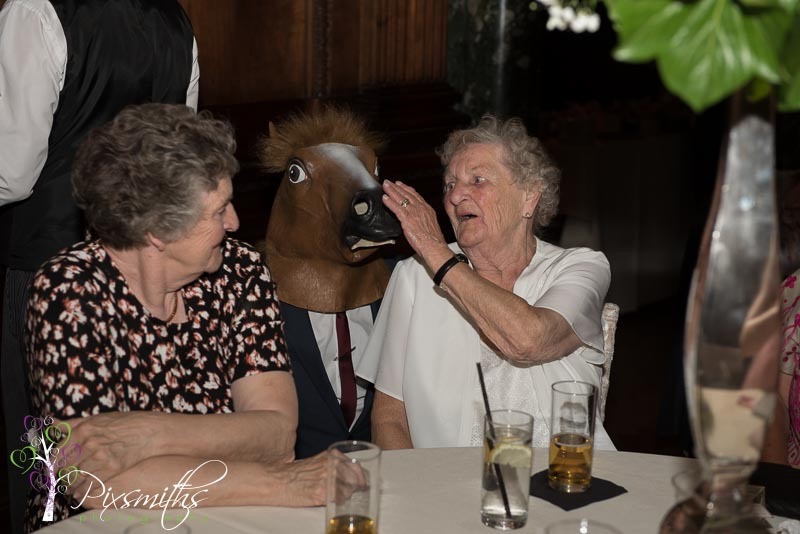 He now trains difficult horses. 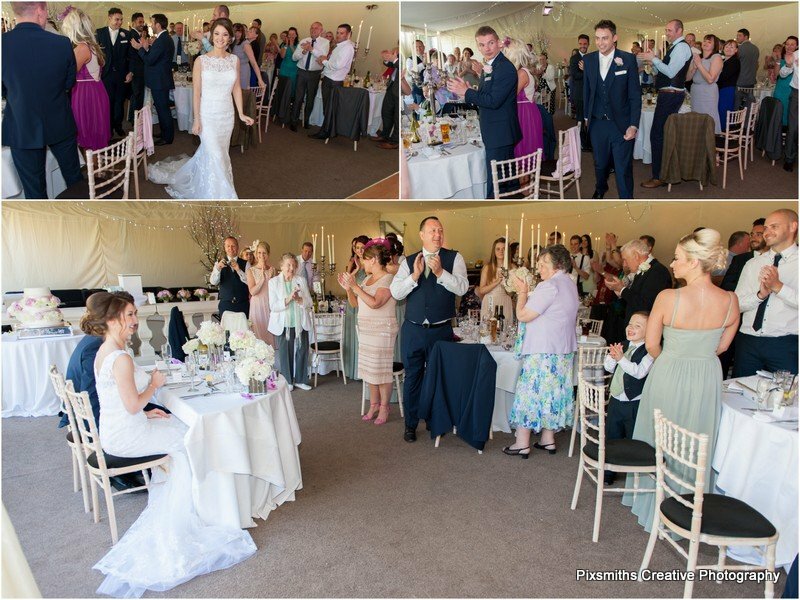 Huge thanks to Leo’s carers for bringing him along, it helped make Natalie’s day perfect. 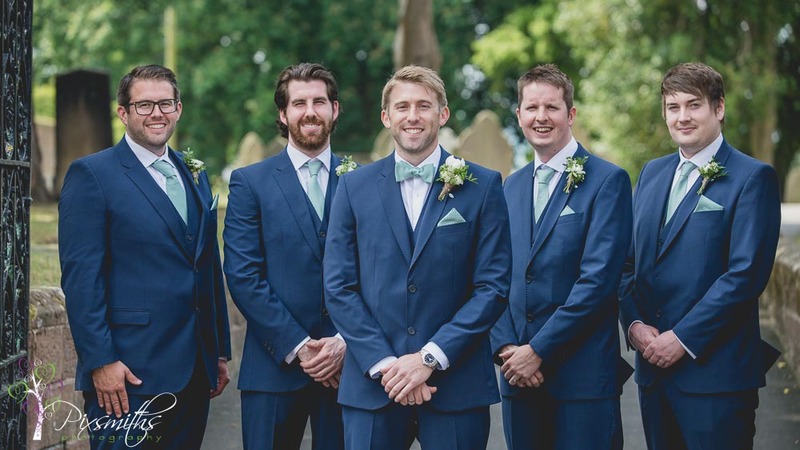 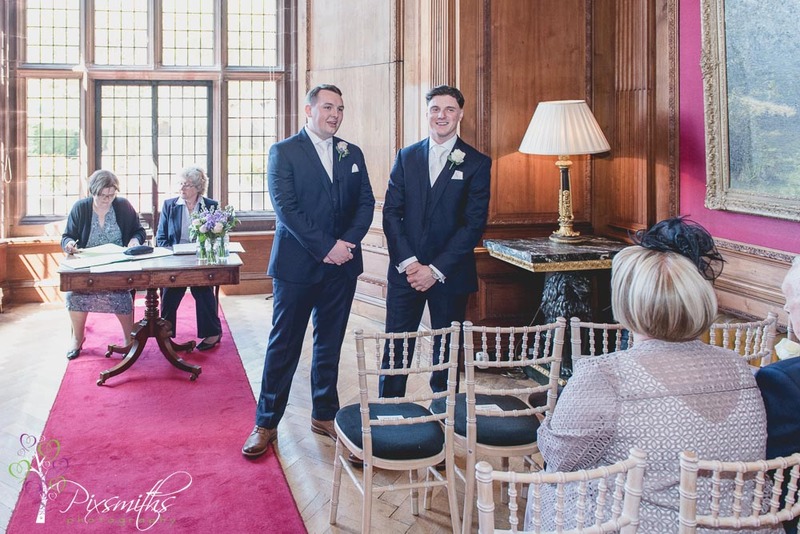 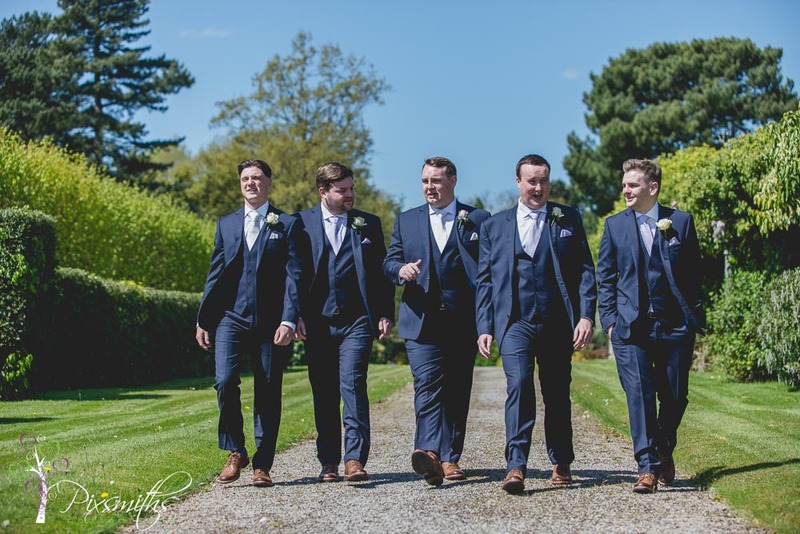 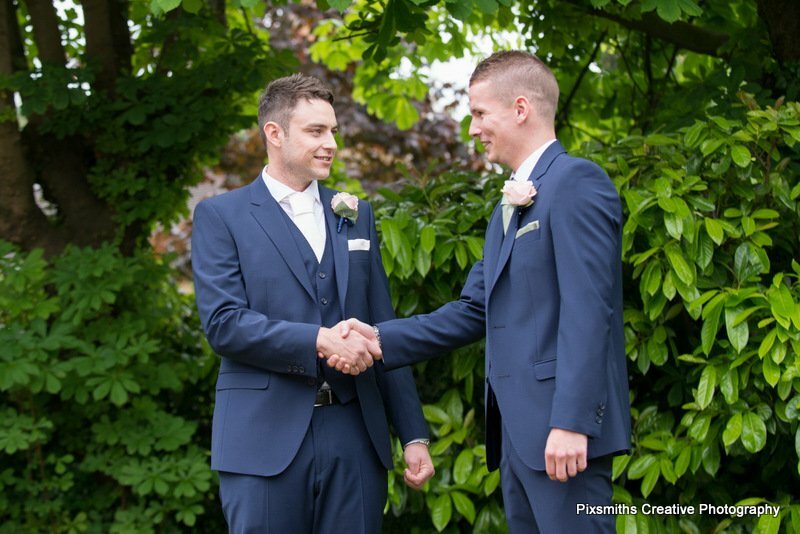 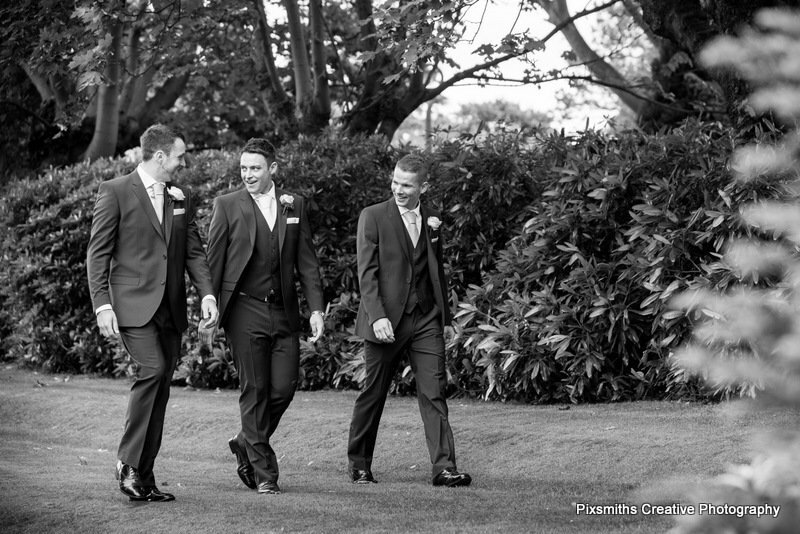 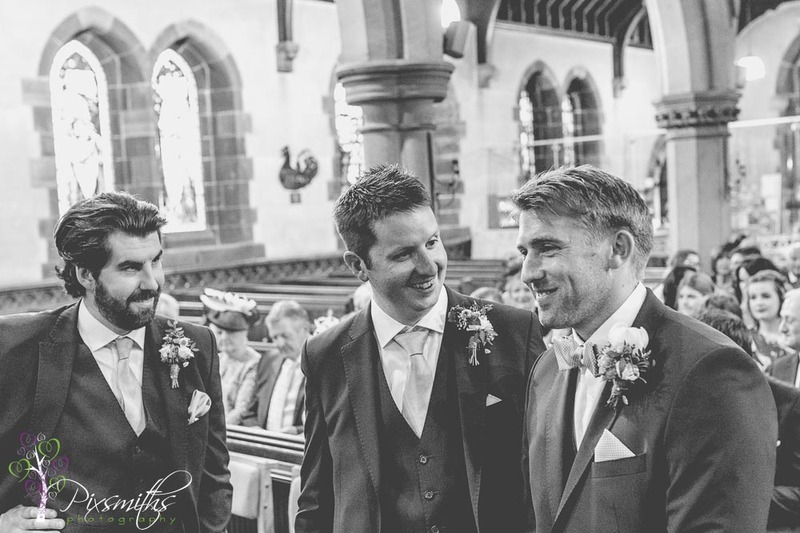 A little delay with the cars for the groomsmen but in itself a blessing as the men then missed a bit of a shower before their shots – silver lining and and all that! 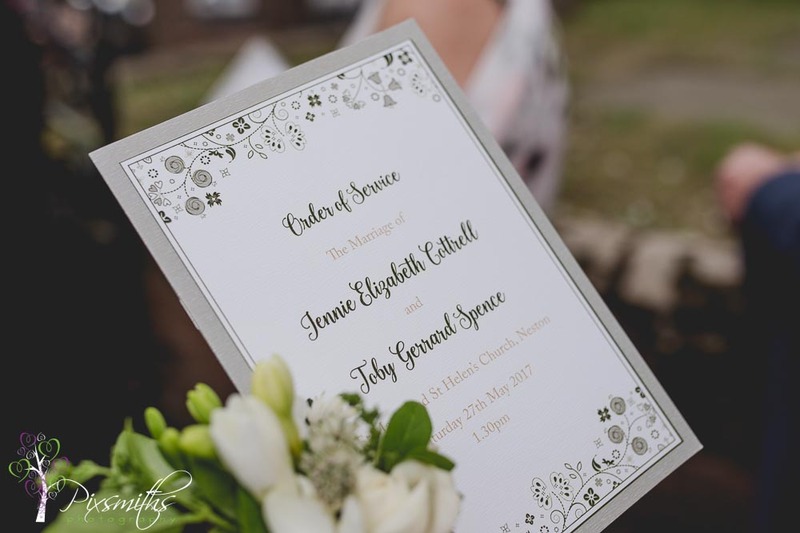 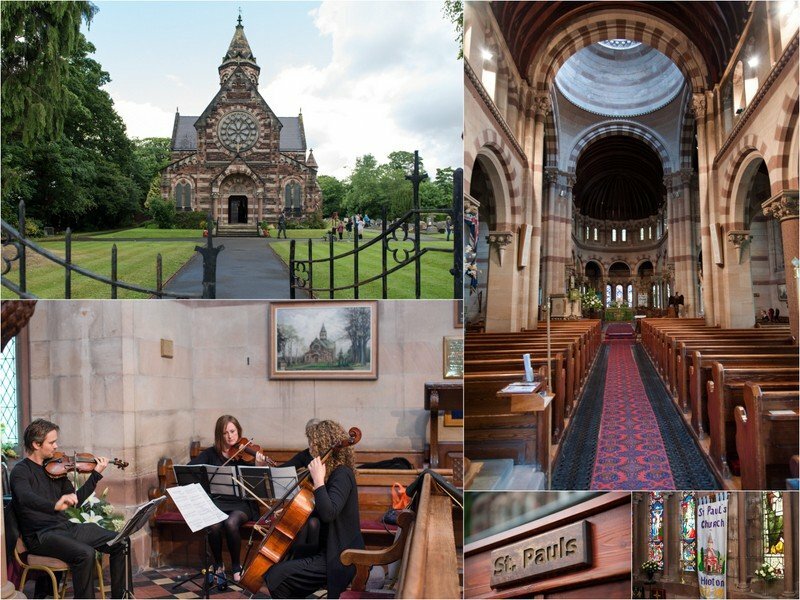 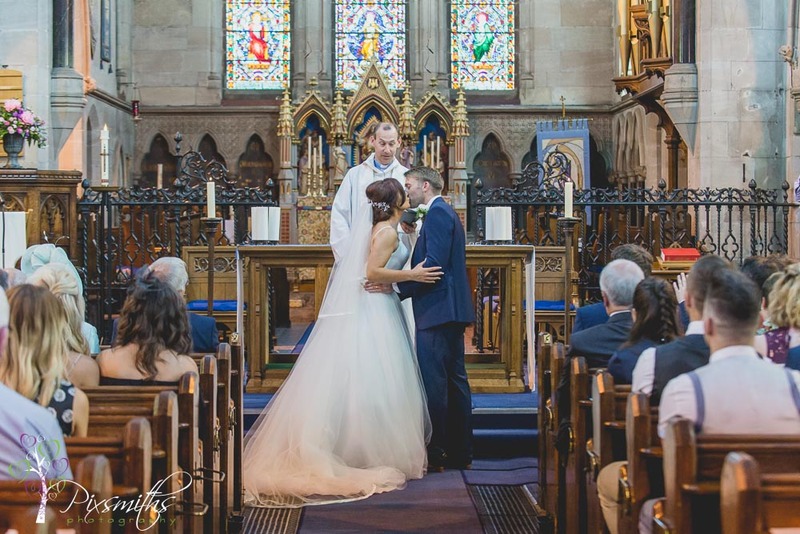 Next a ceremony at St Paul’s church in Hooton – a stunning church designed in the style of Lombardy architecture, with its coloured layers …akin to a wedding cake! 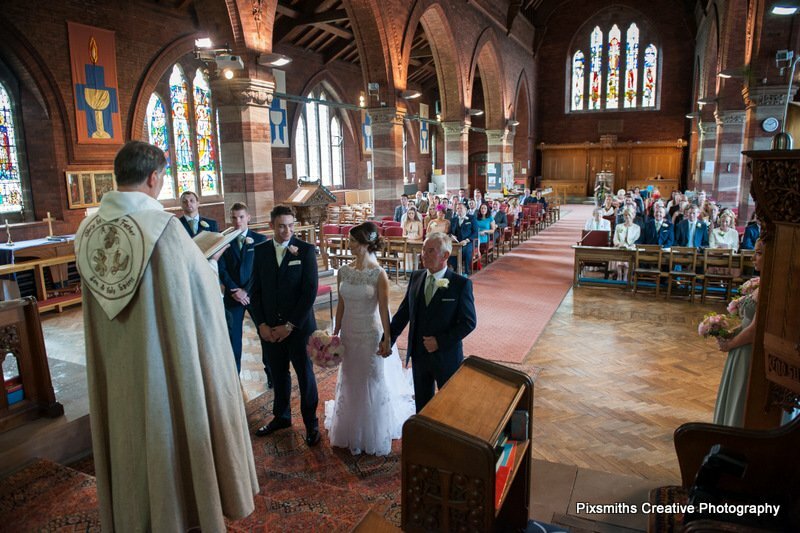 The minister was so accommodating to everyone , even the photographers!..really hope to be back at this church! 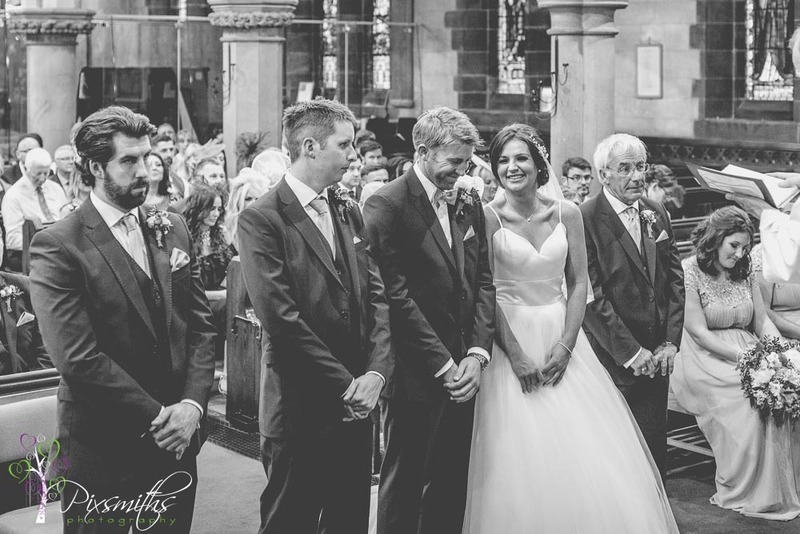 Natalie won’t mind me saying this but her eyesight is problematic, she has and is undergoing surgery ..so it was very touching of Brian to say that he wouldn’t watch Natalie walk down the aisle but would wait til she was right alongside side him so she could see his reaction, this just about sums up the loving caring relationship of this couple, so tender and true. 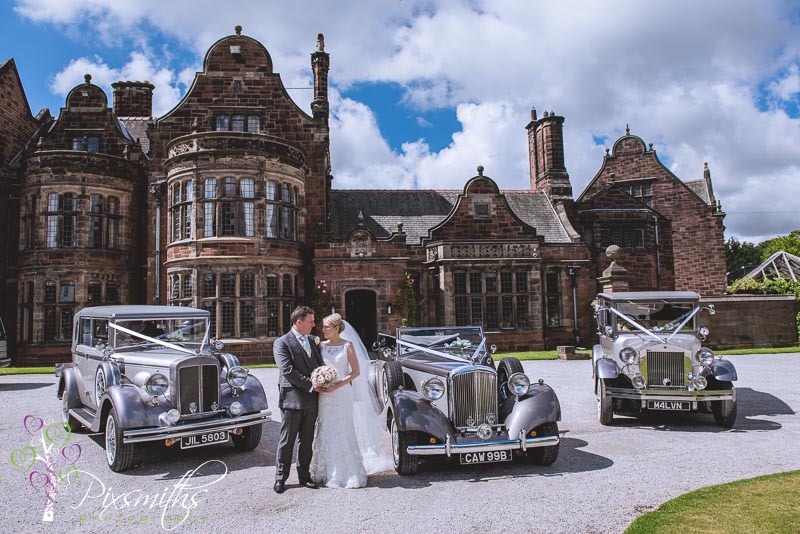 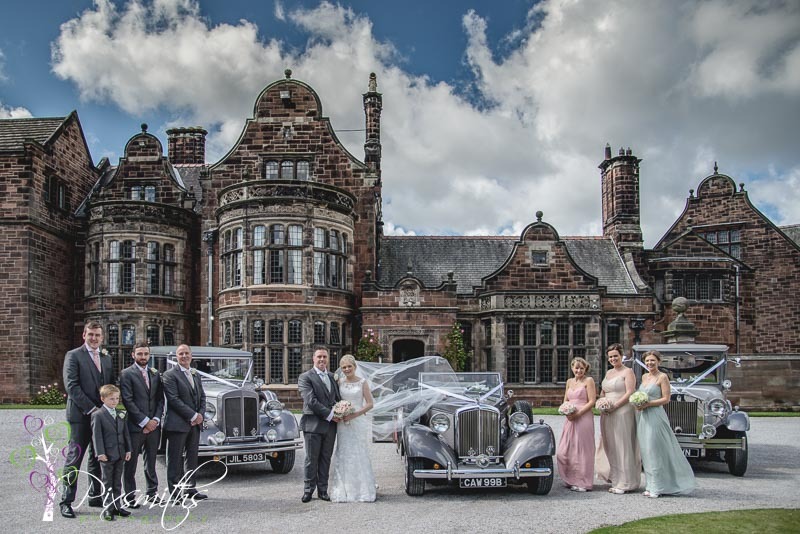 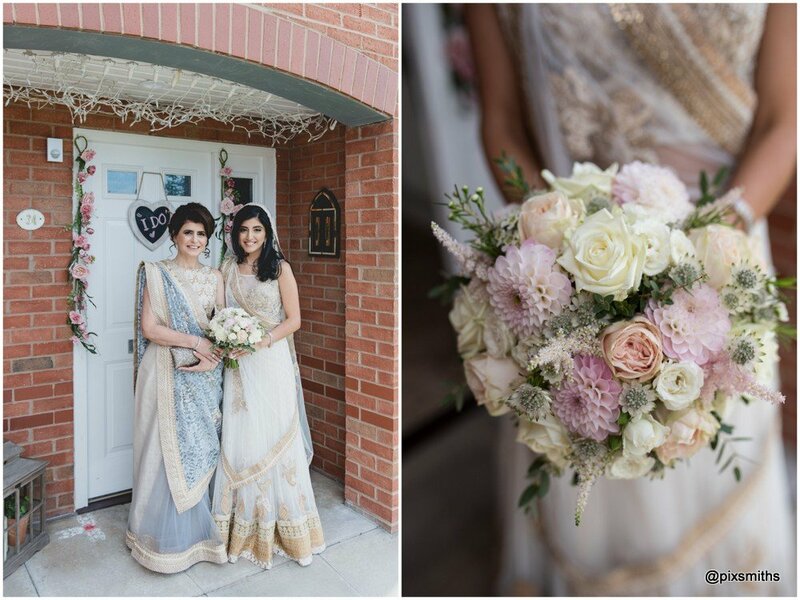 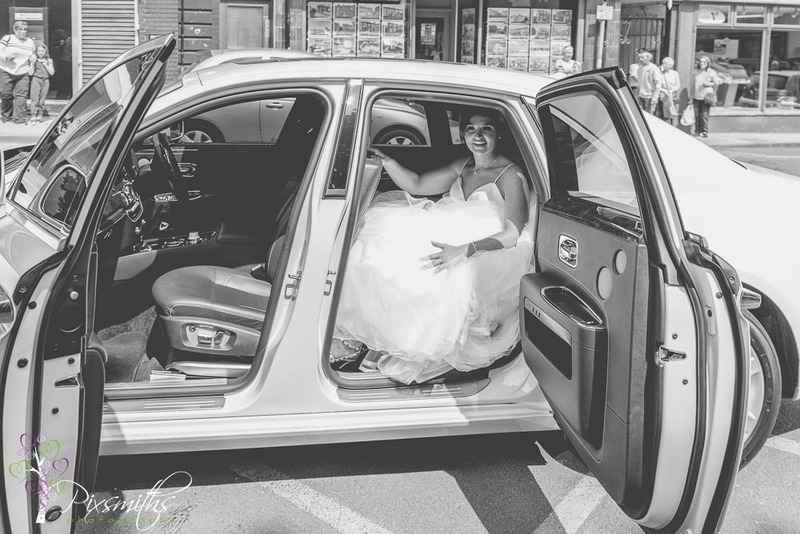 Thornton Manor is always a grand special place for a wedding – the beautiful cars from Malvern Wedding Cars graced the courtyard entrance and made for a special picture with the bridal party. 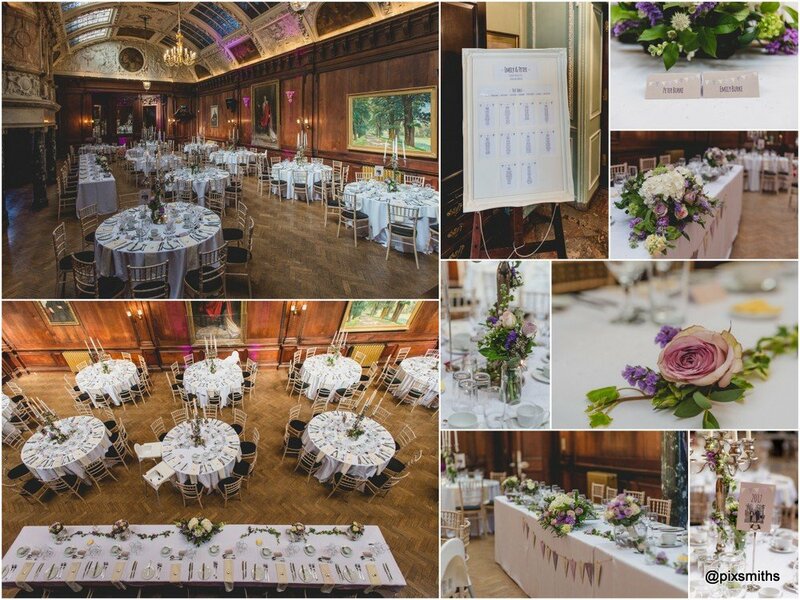 The room was dressed fantastically by Carol Anne also, the touches of flowers in the chairs were gorgeous. 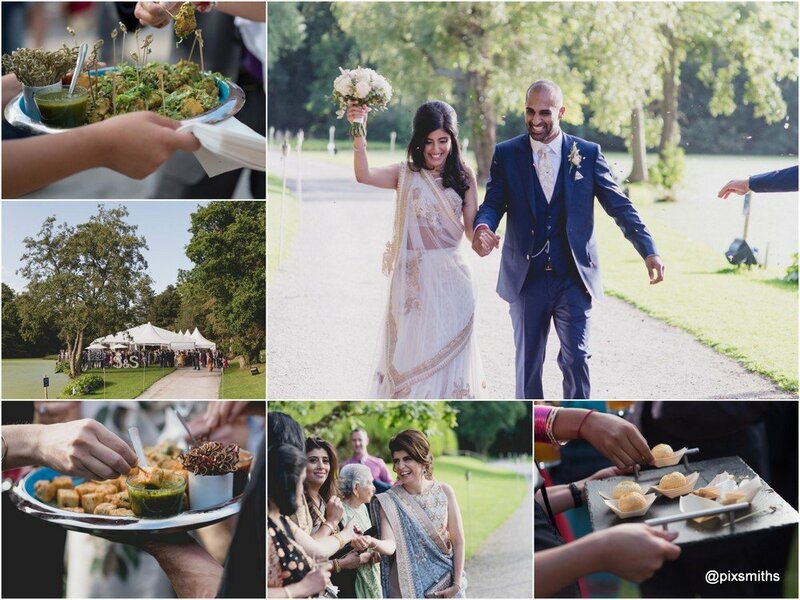 Wonderful food and also ice-cream made for an enjoyably memorable wedding breakfast. 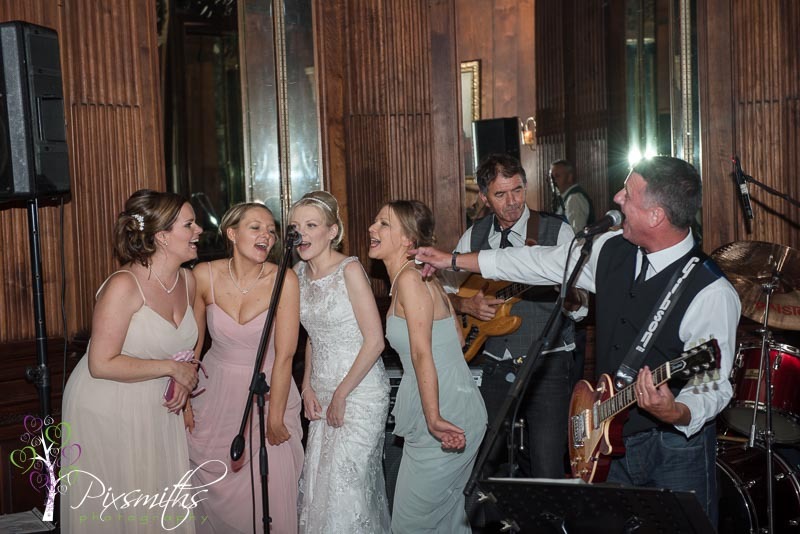 The evening entertainment went down well with the band Mid Life Crisis who sang a fab personalised song for Natalie and Brian – went down a storm! 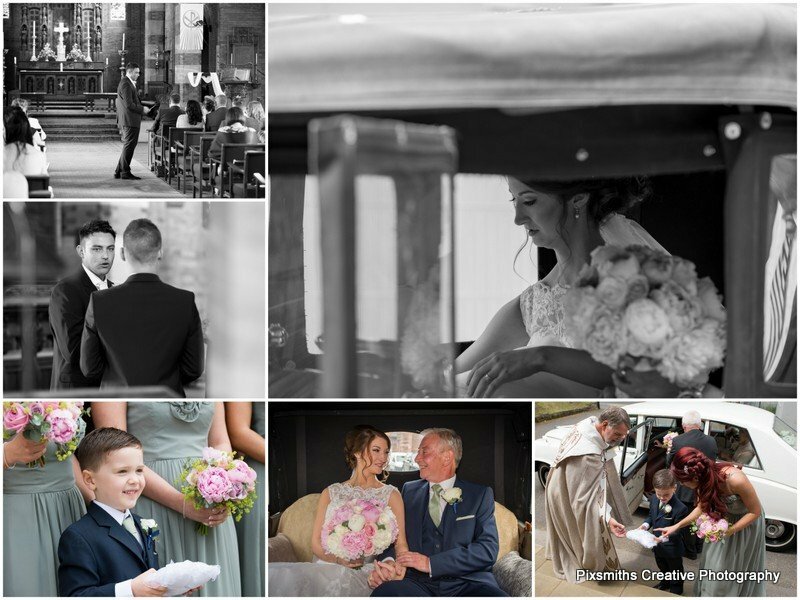 We wish them so much happiness and health for the future and hope you enjoy a few of the many images from their wedding day memories. 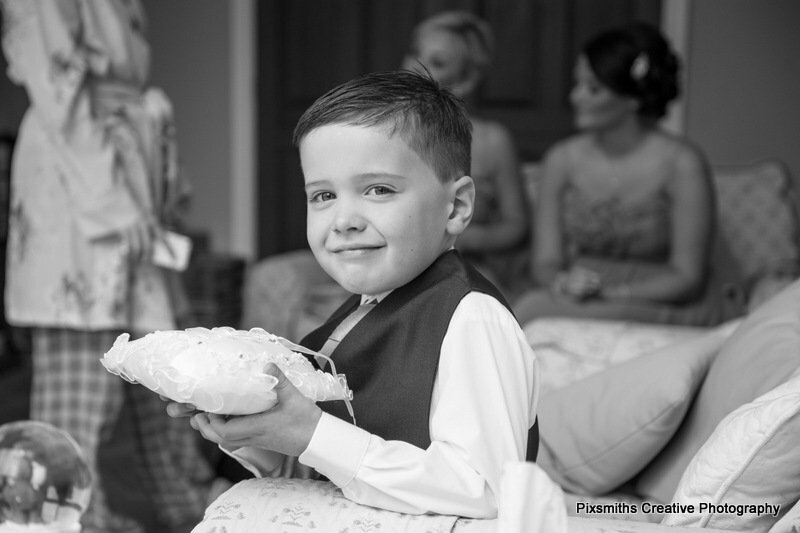 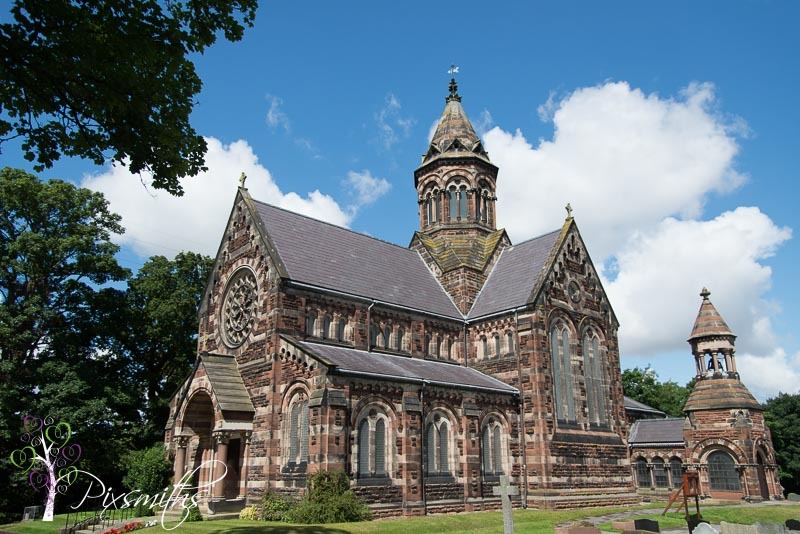 Images can be purchased from our on-line gallery – just ask! 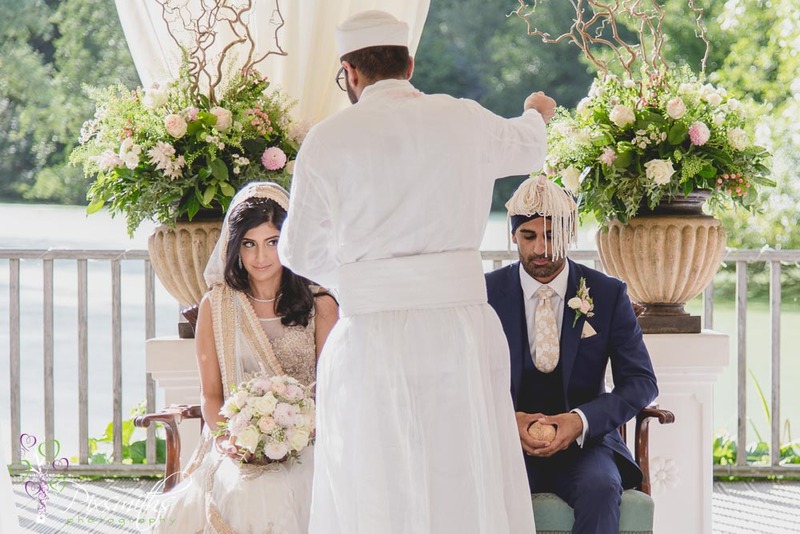 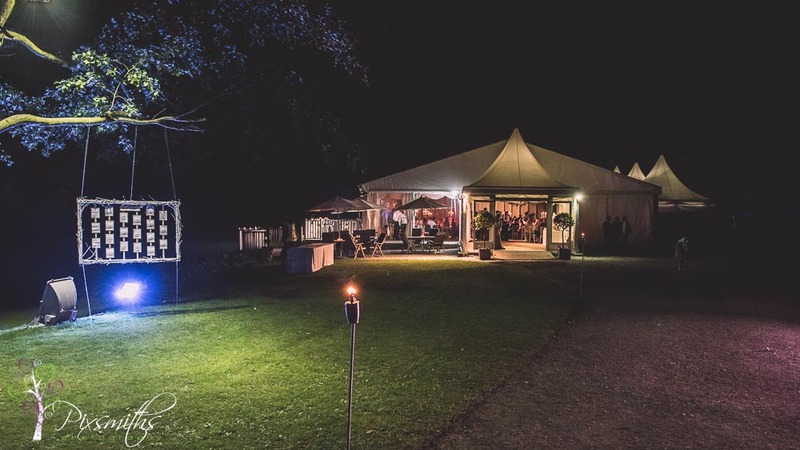 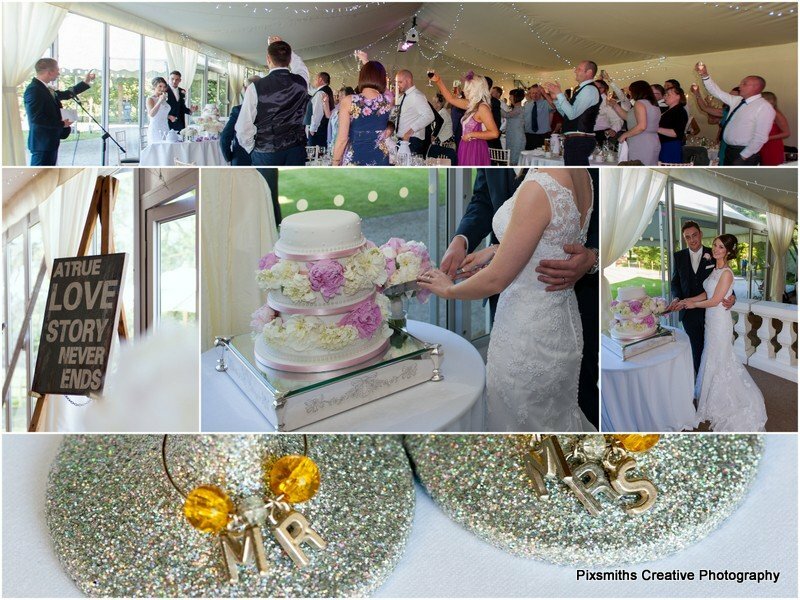 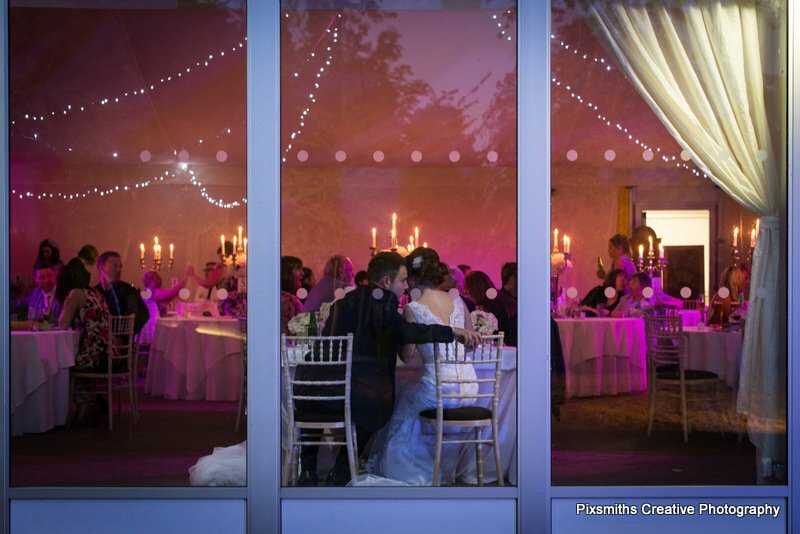 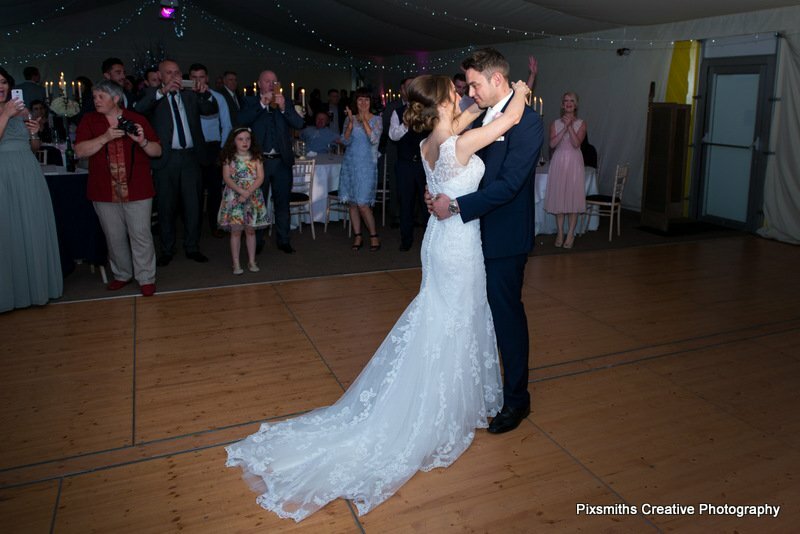 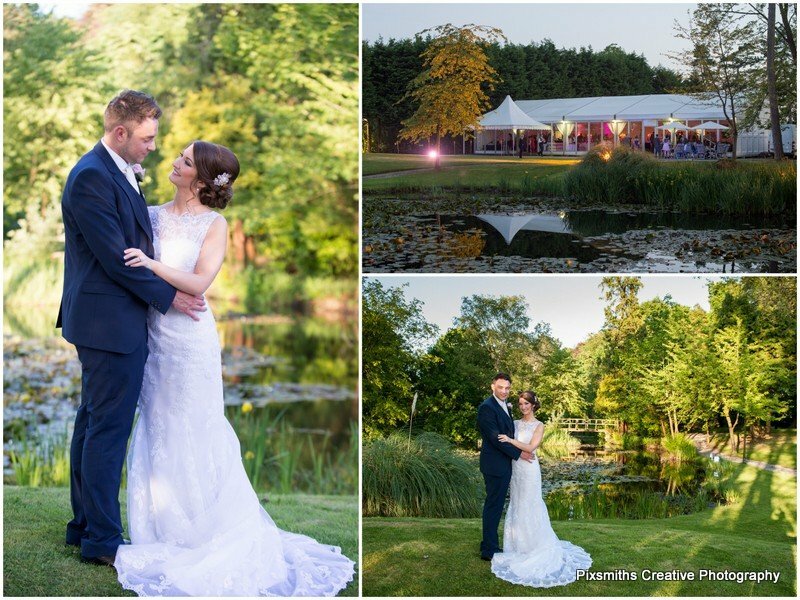 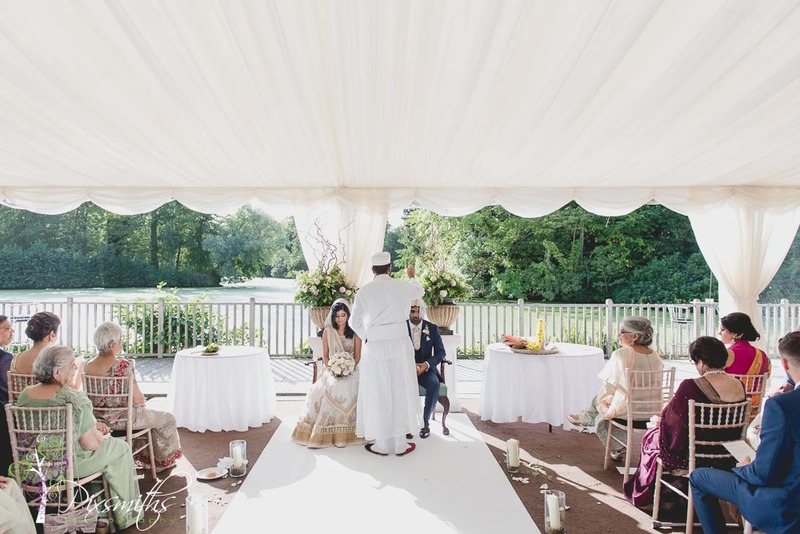 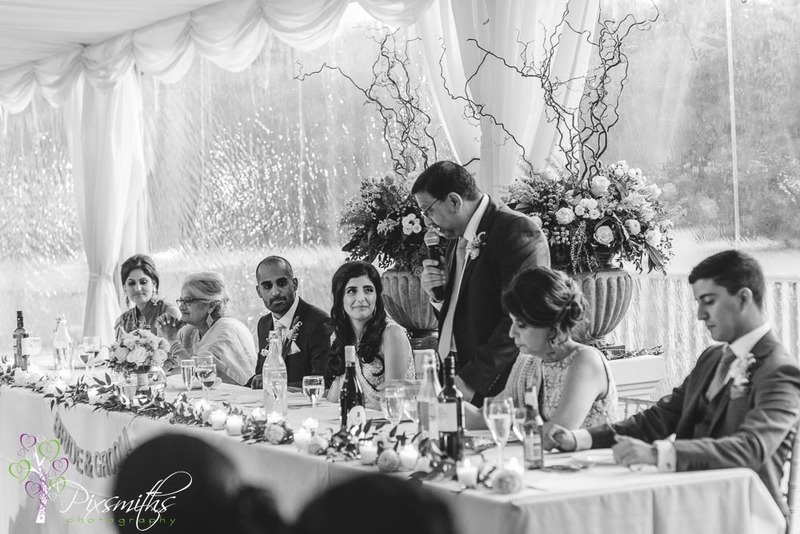 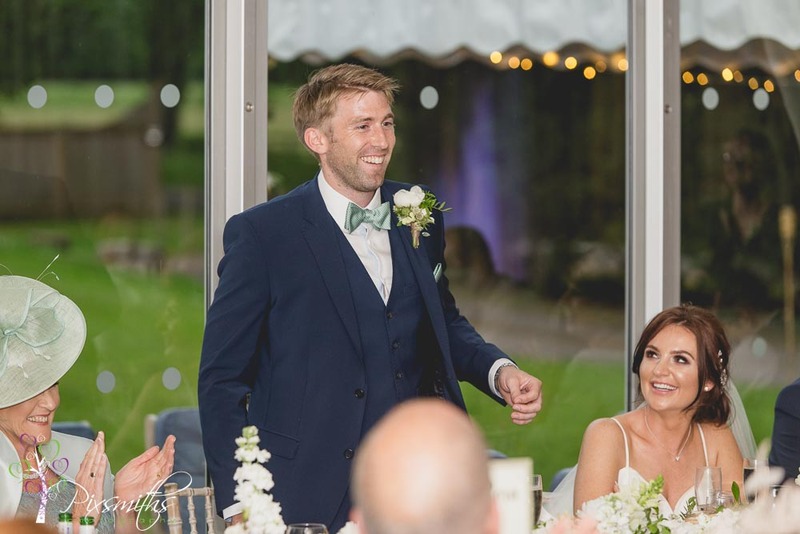 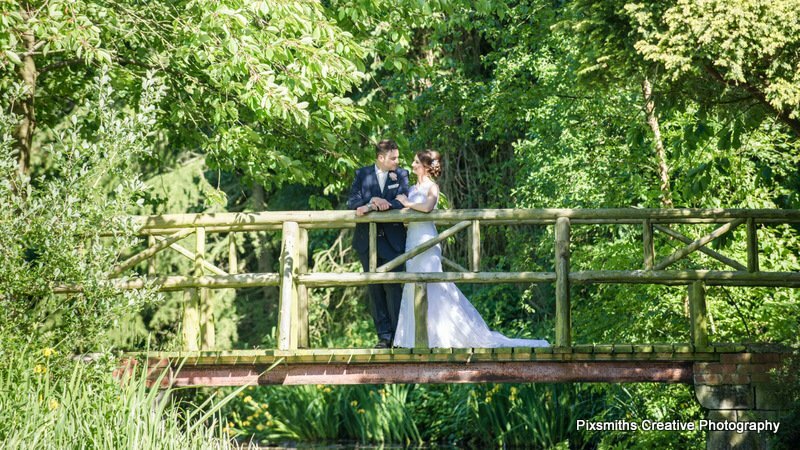 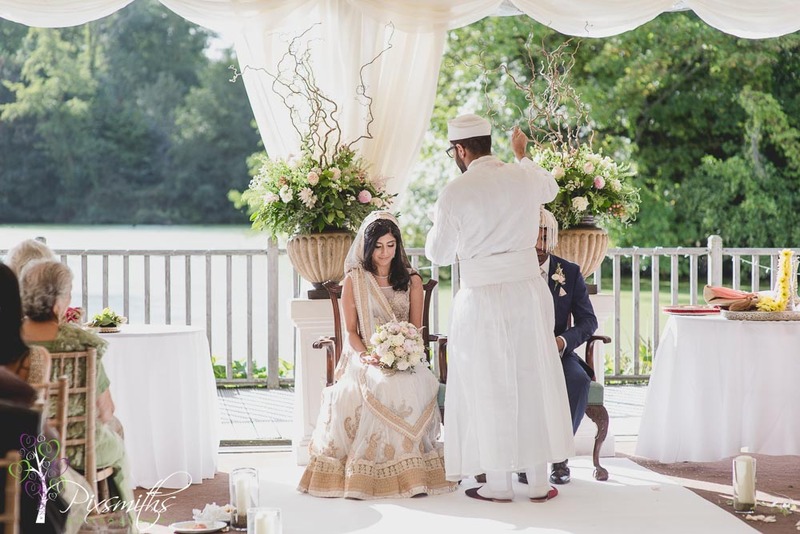 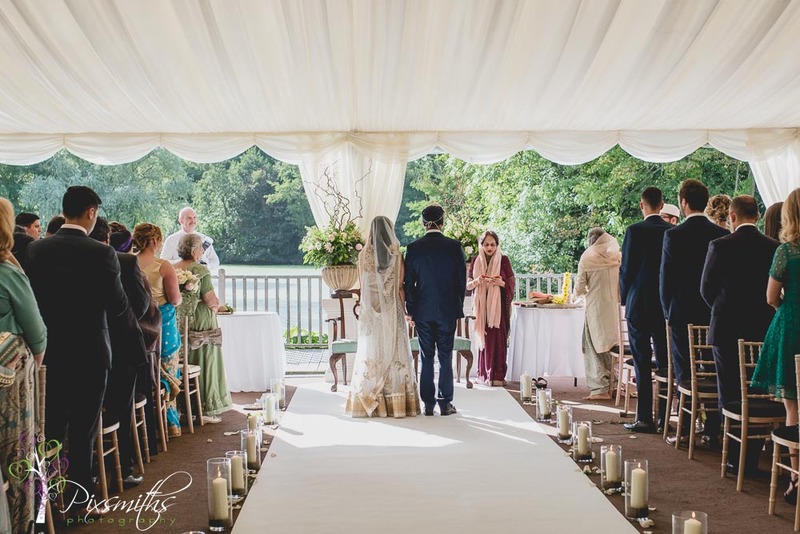 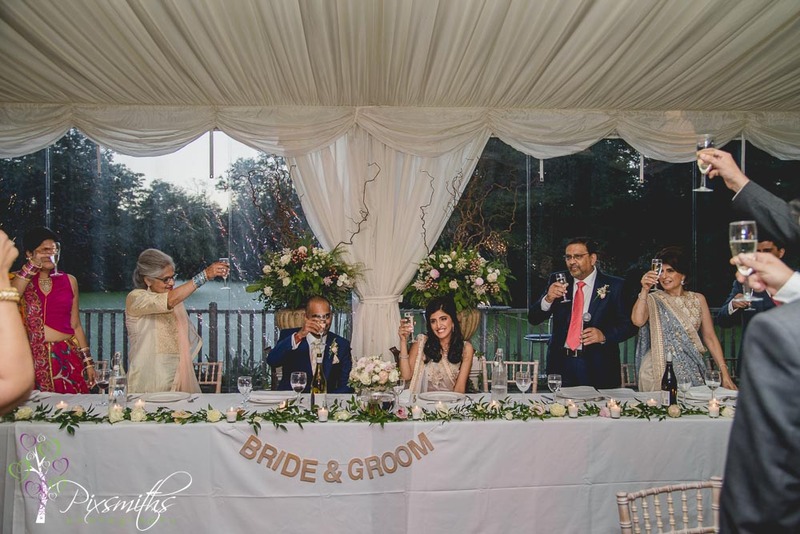 If you are planning a Thornton Manor wedding, whether it be in the main house or one of the waterside marquees we’d love to hear from you so please get in touch fora quote and to see more examples like this summer Waterside Pavilion wedding. 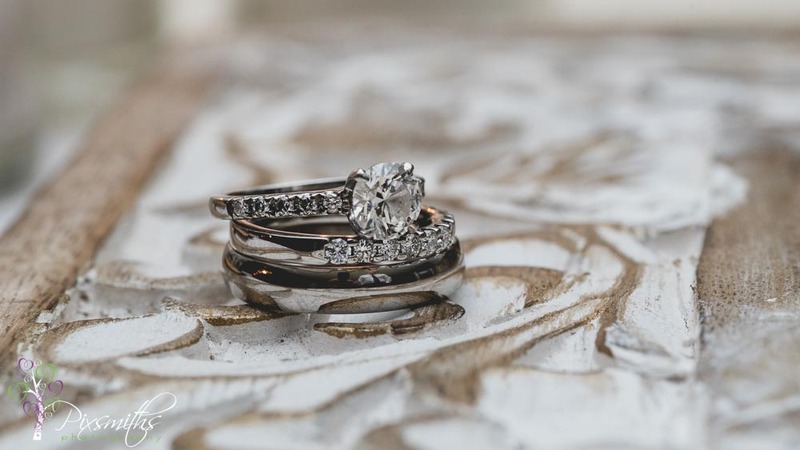 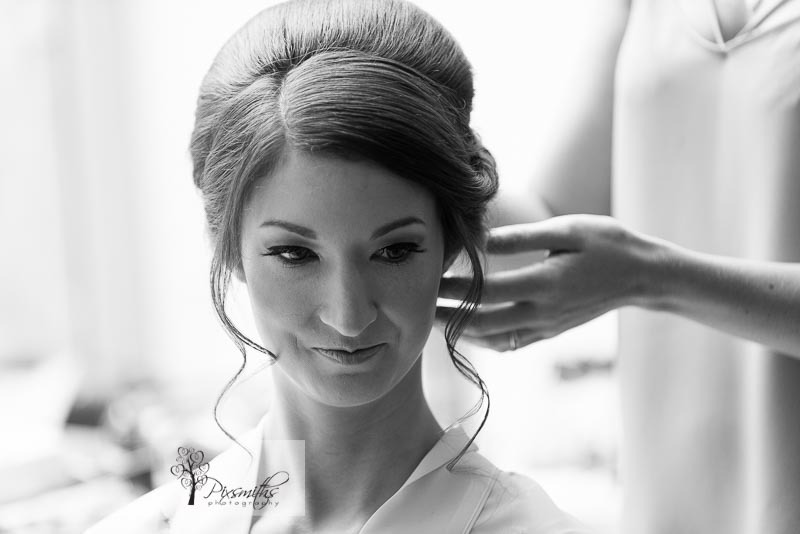 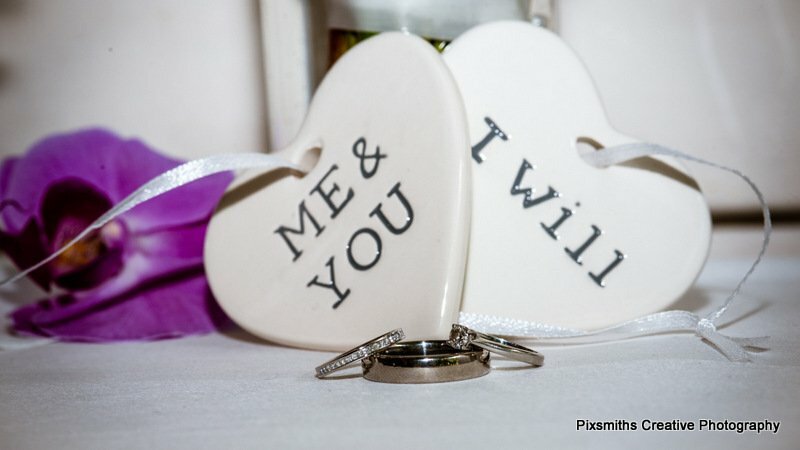 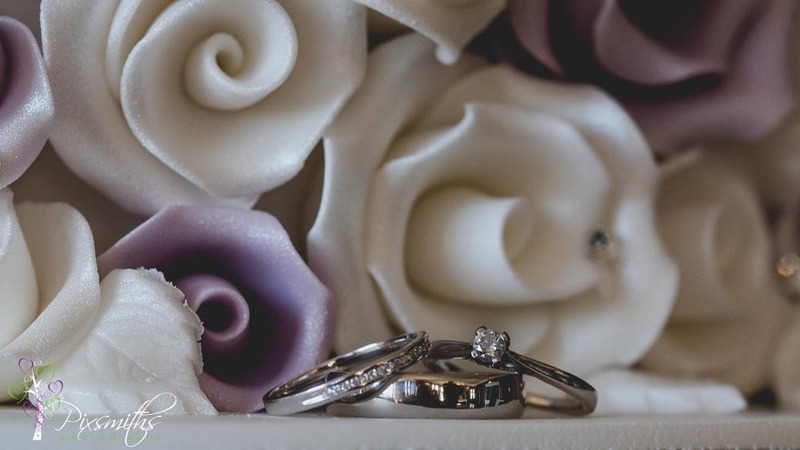 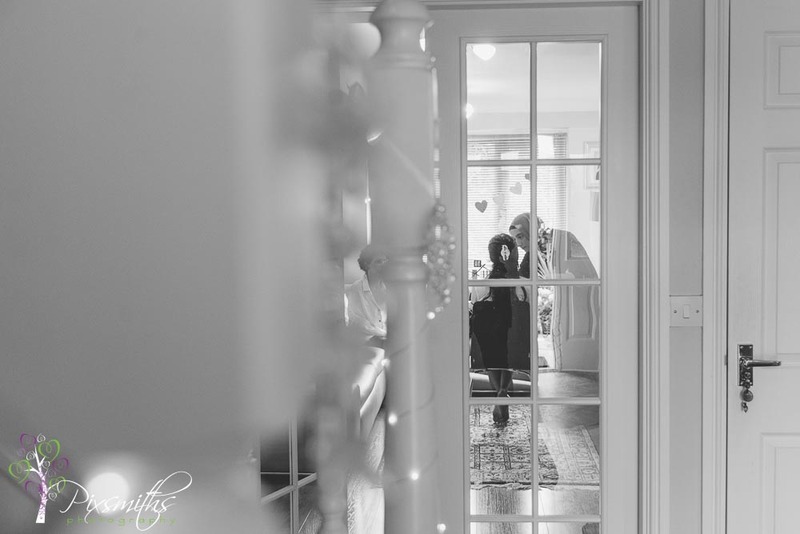 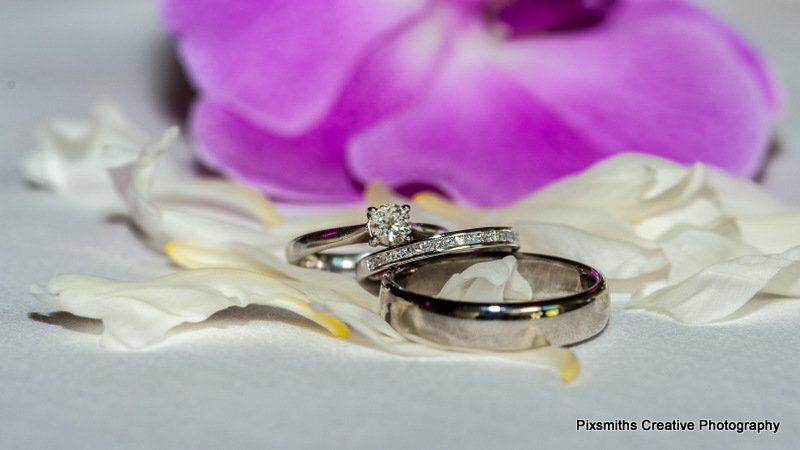 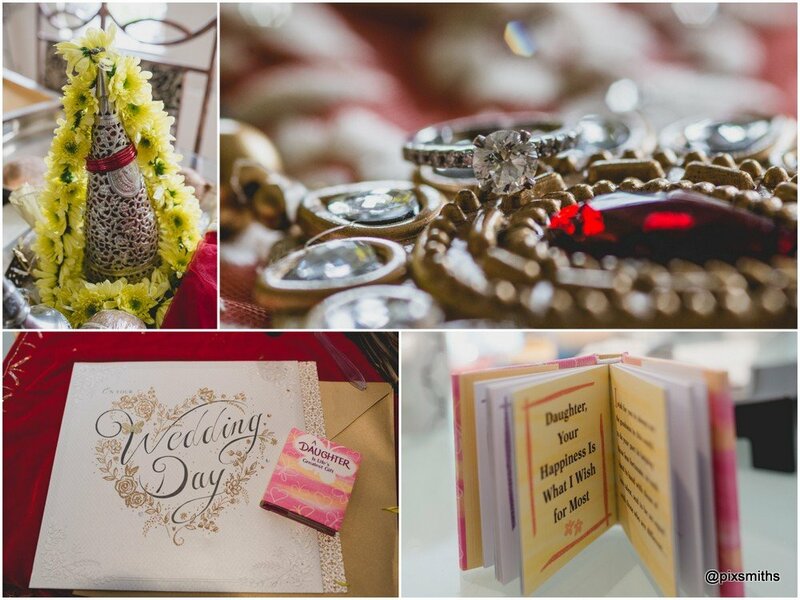 A wedding booked many months in advance and eagerly awaited! 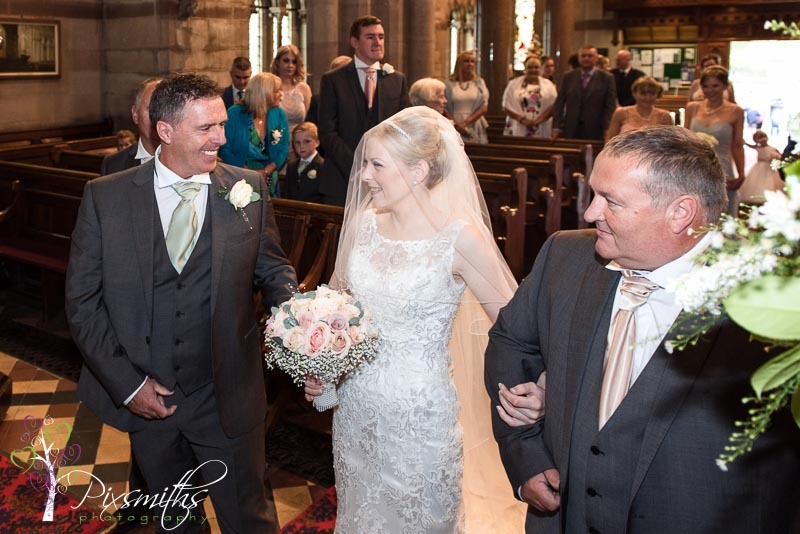 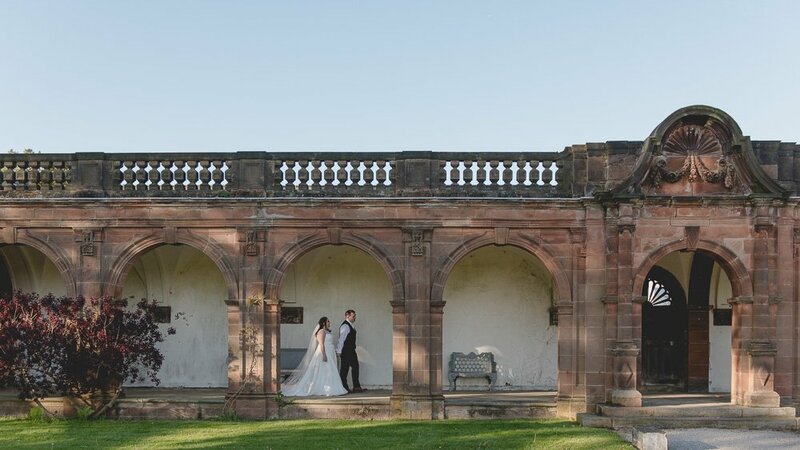 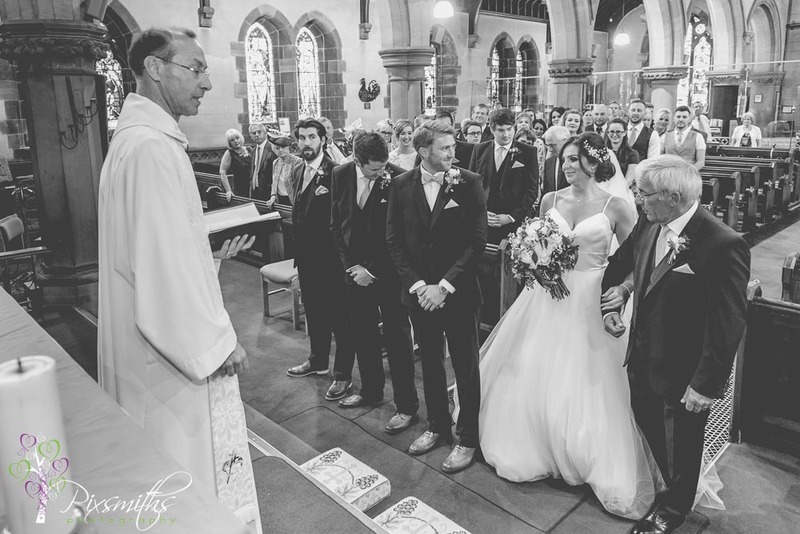 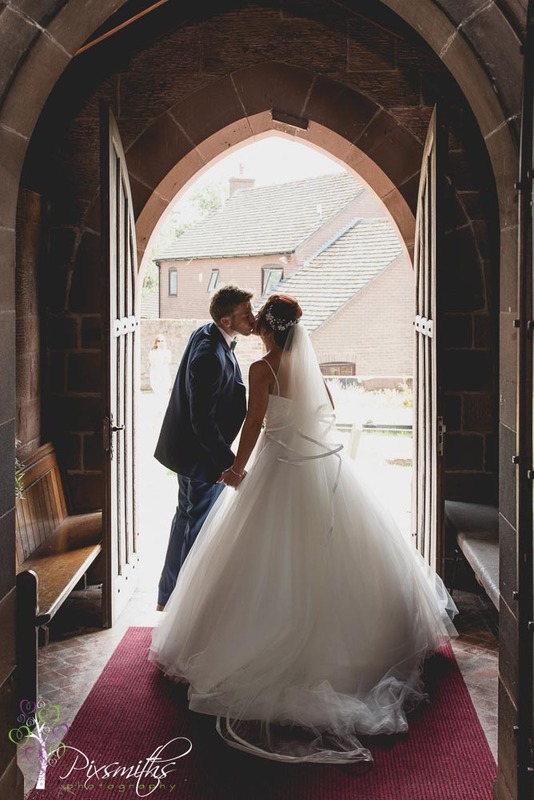 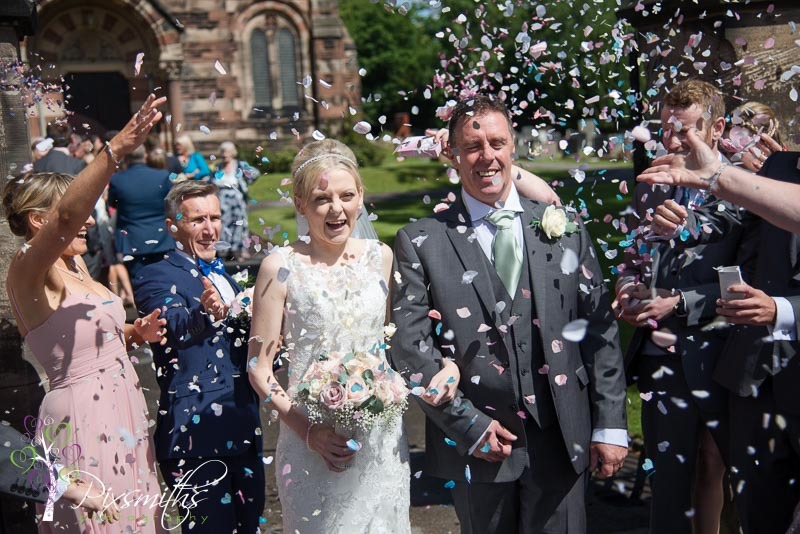 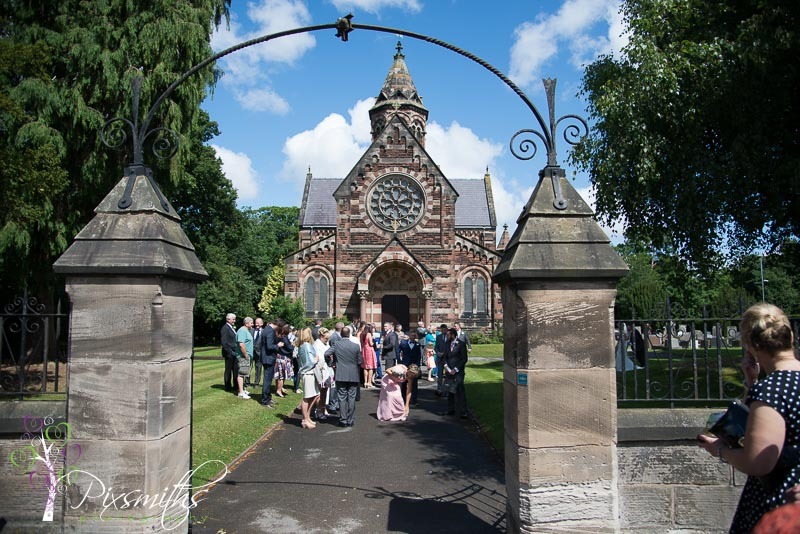 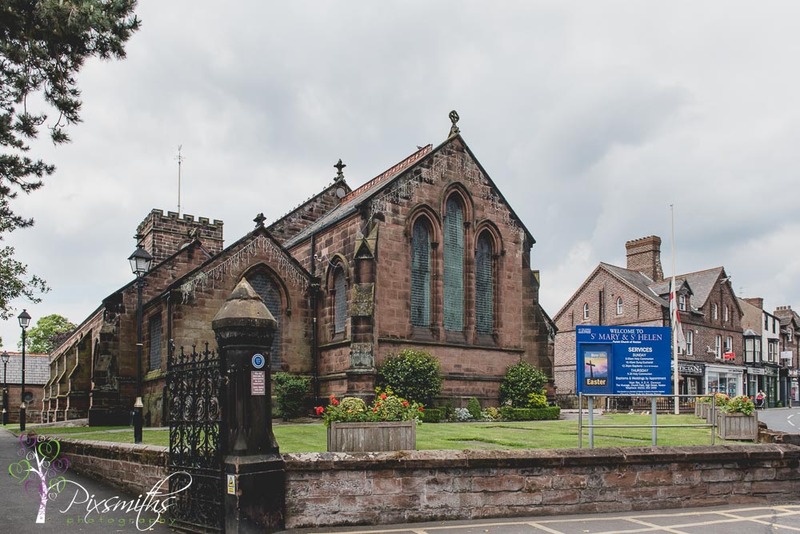 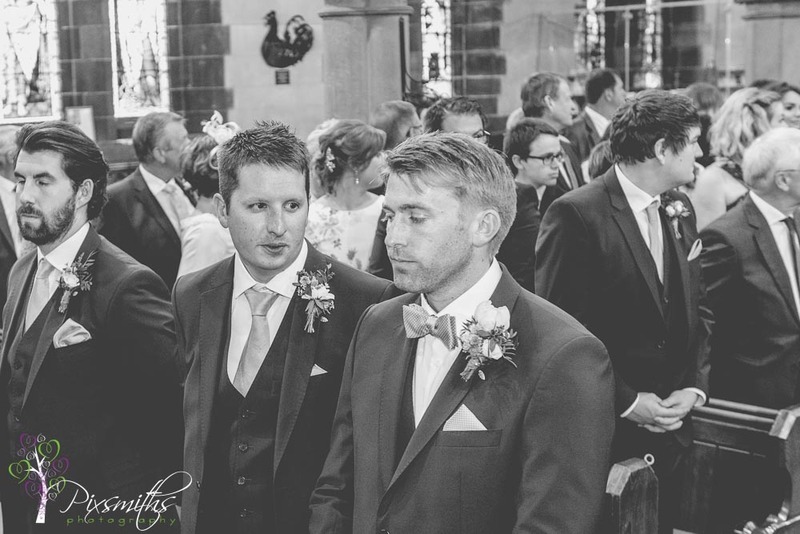 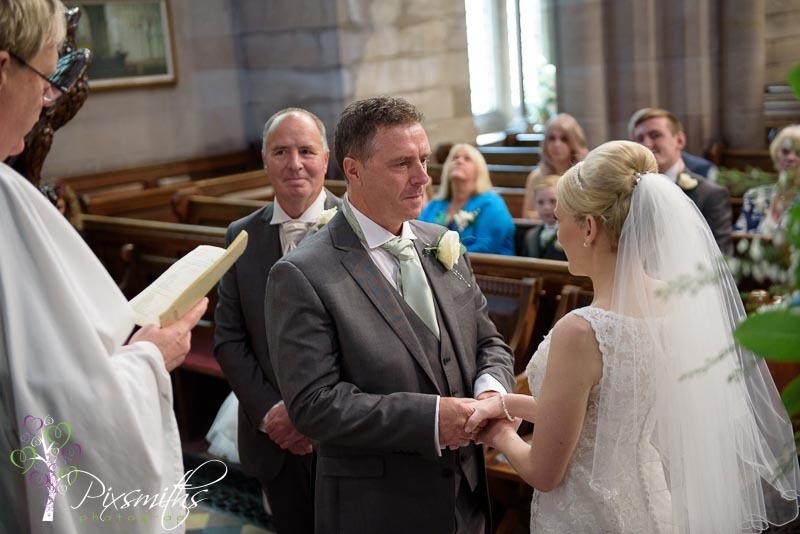 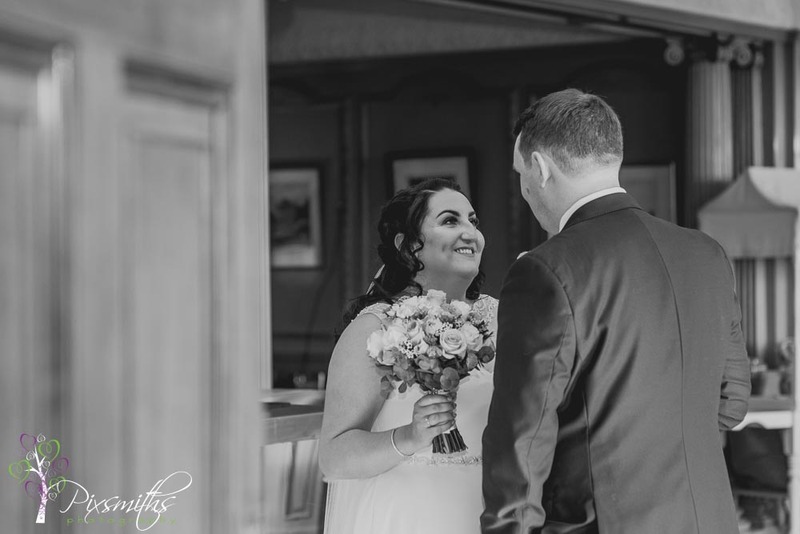 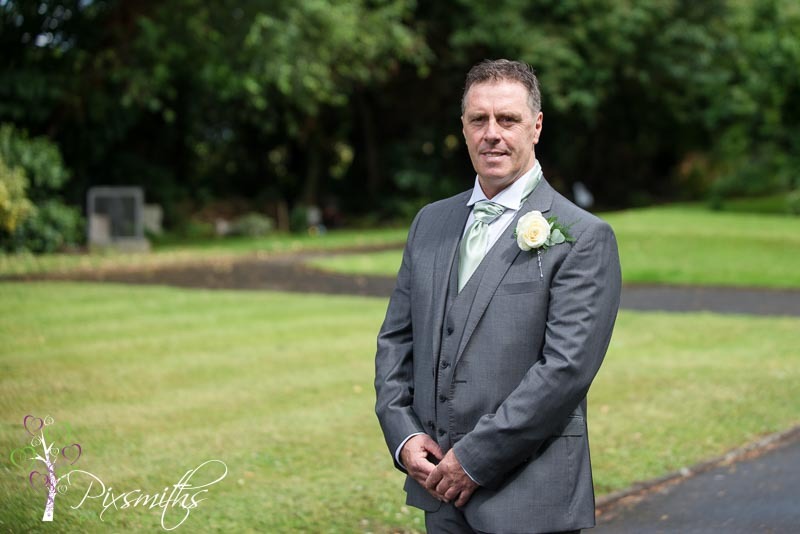 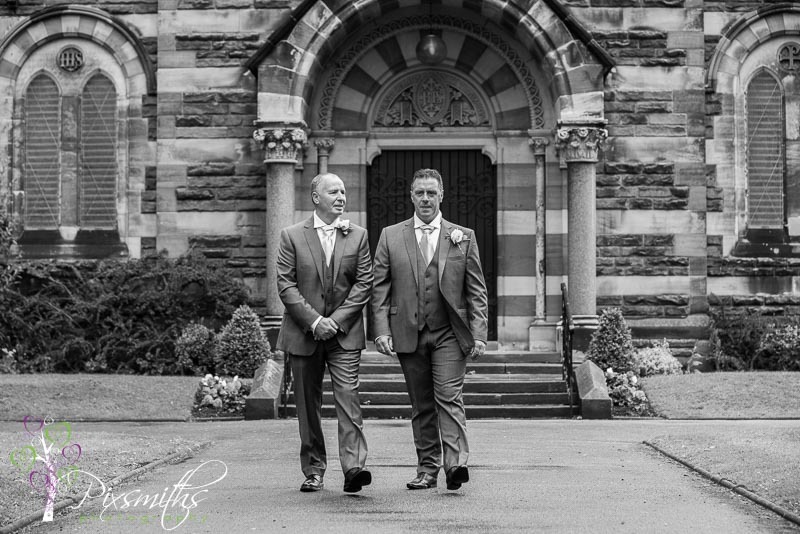 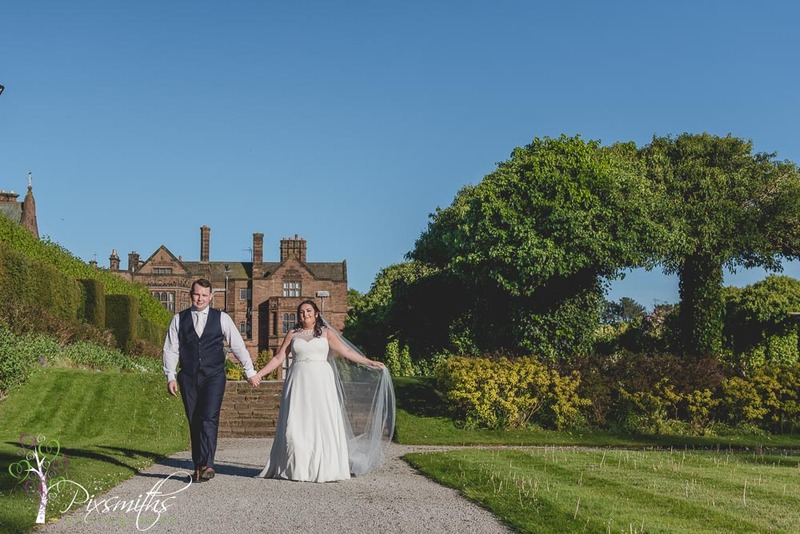 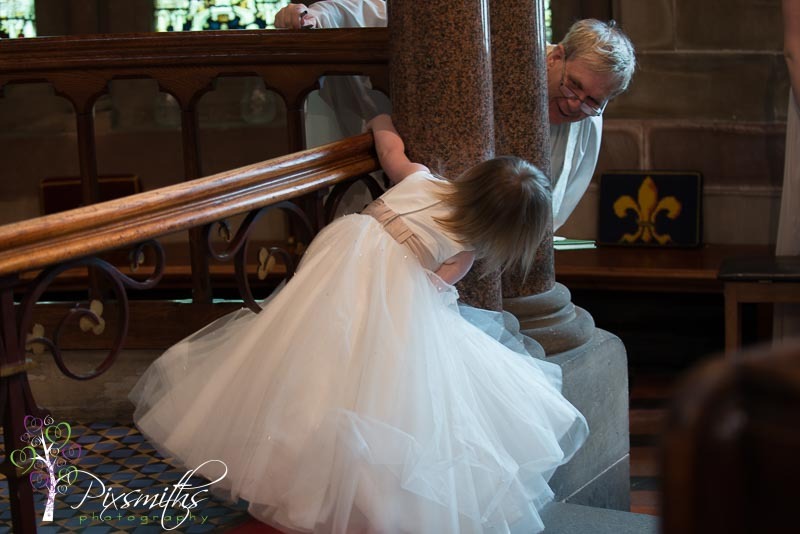 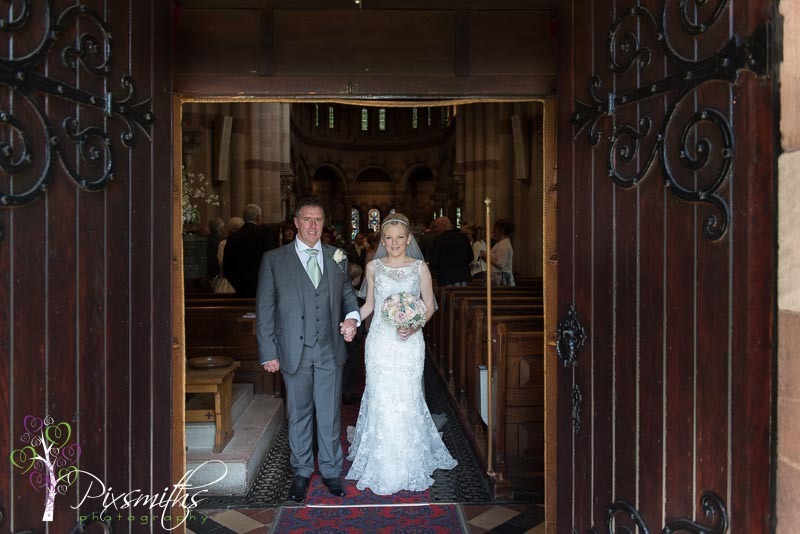 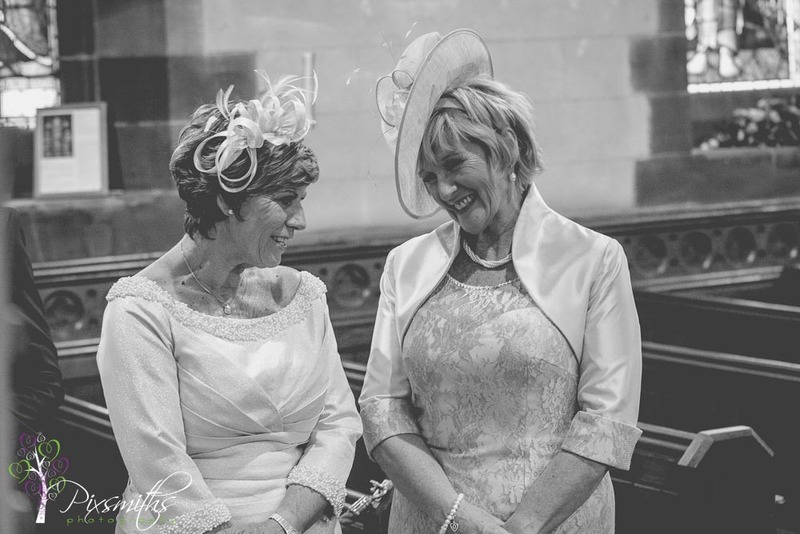 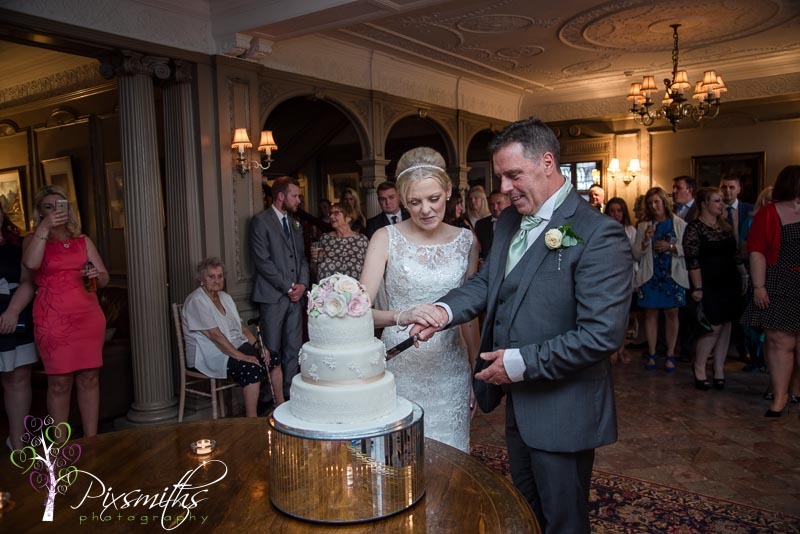 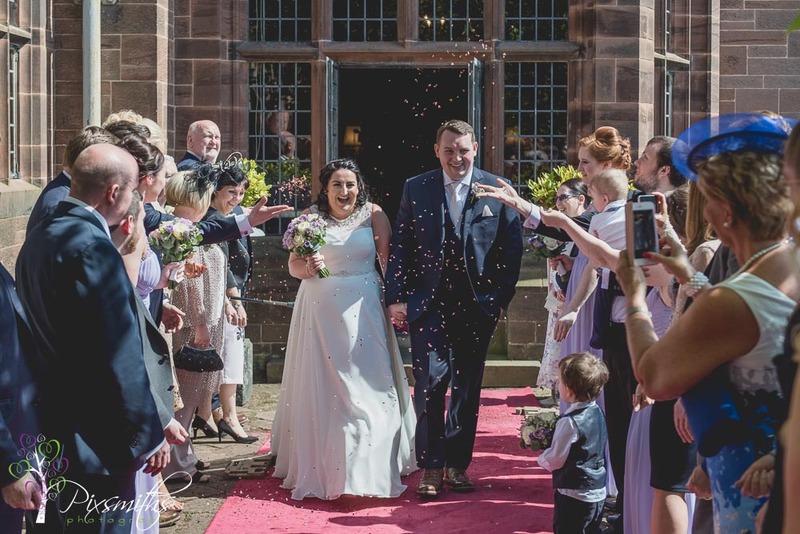 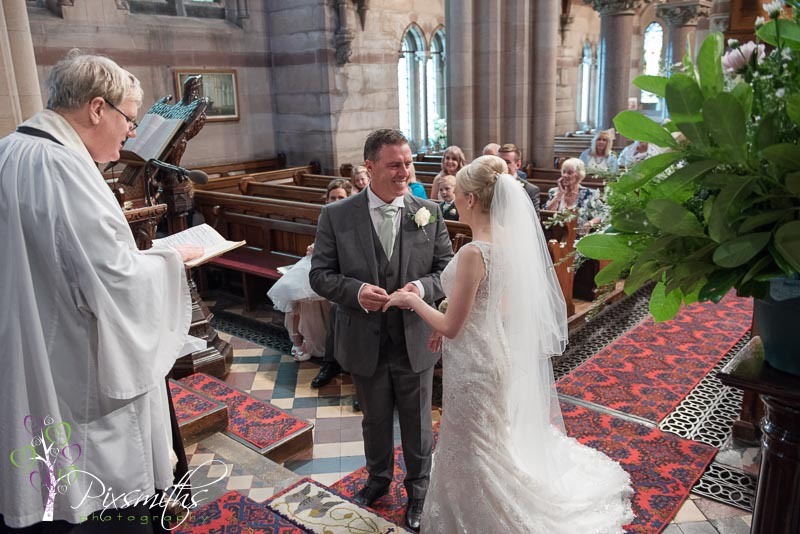 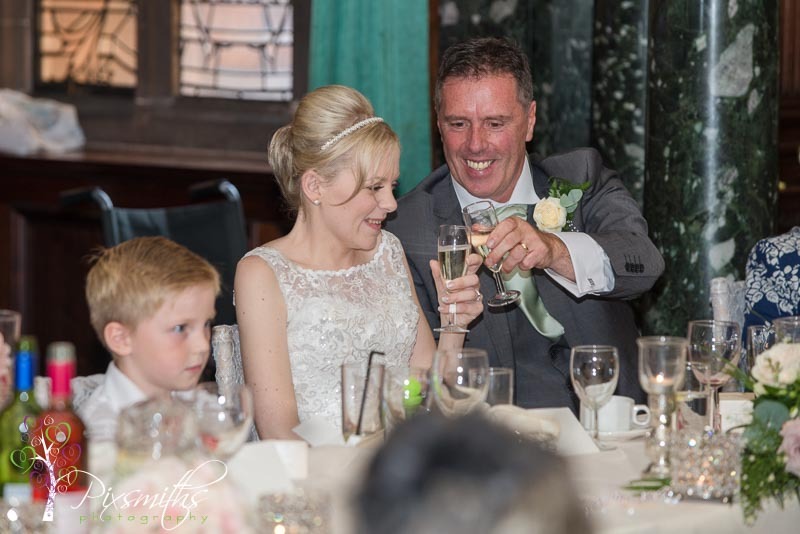 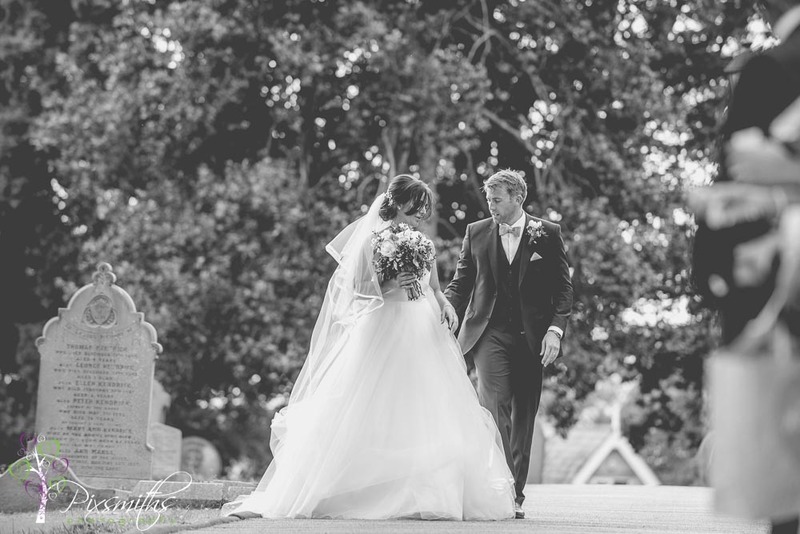 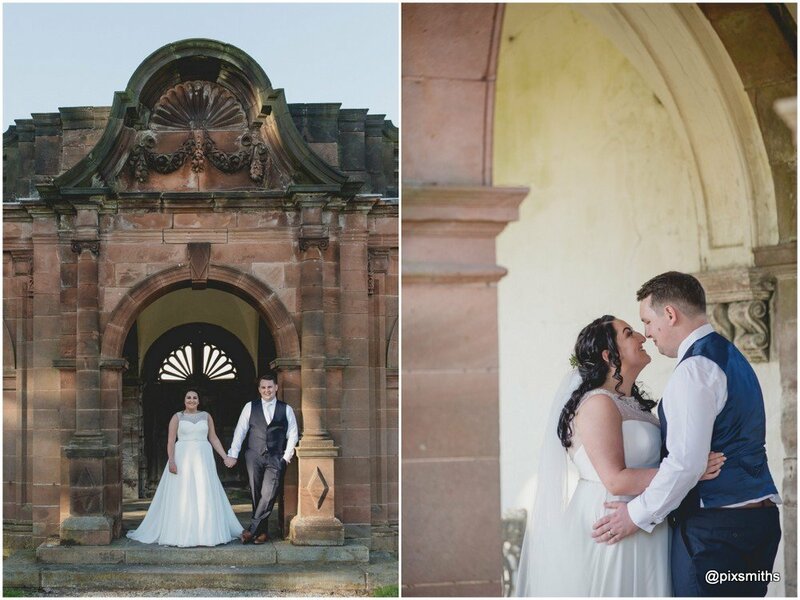 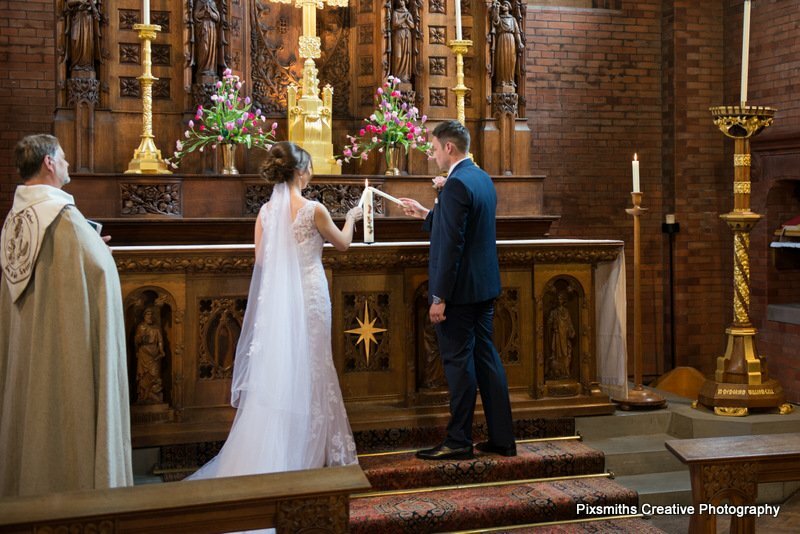 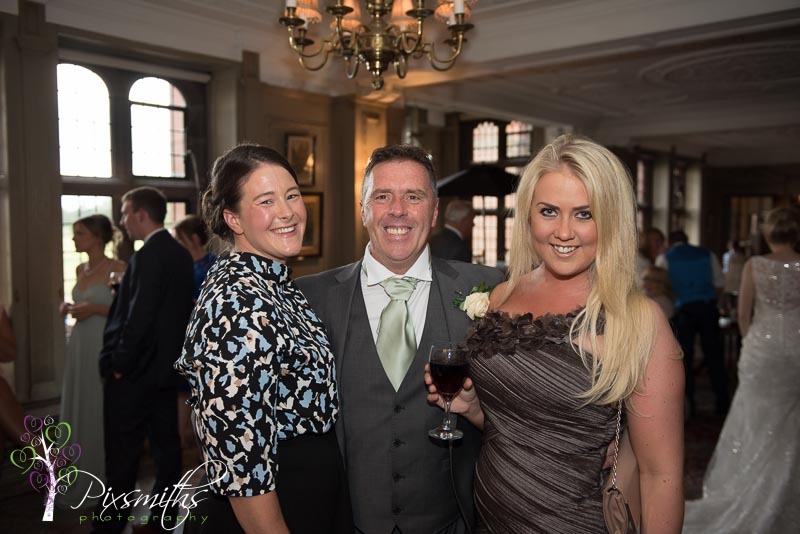 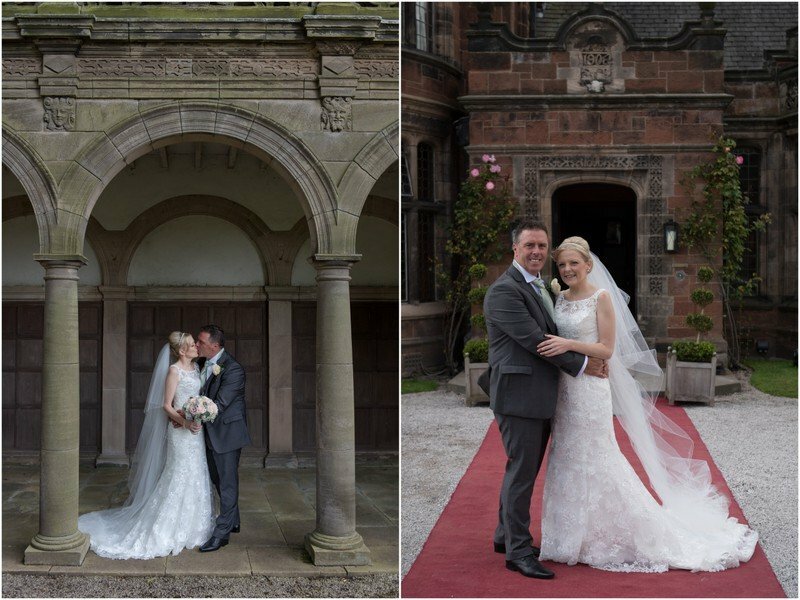 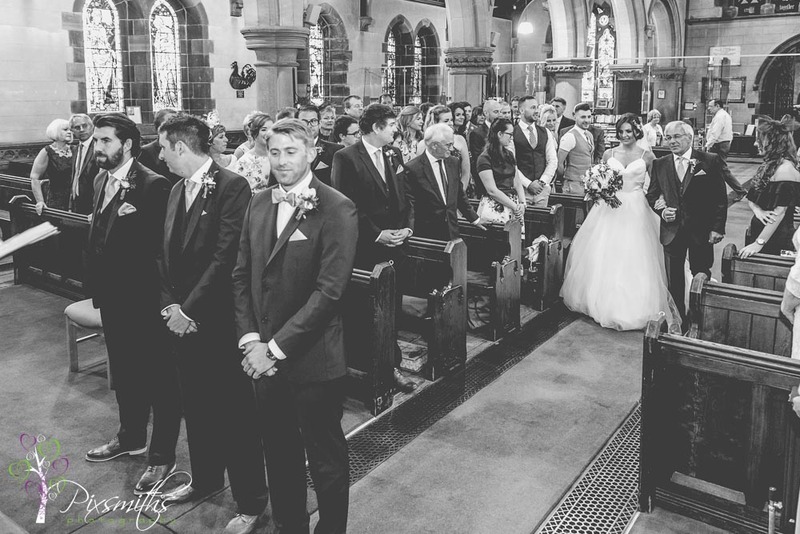 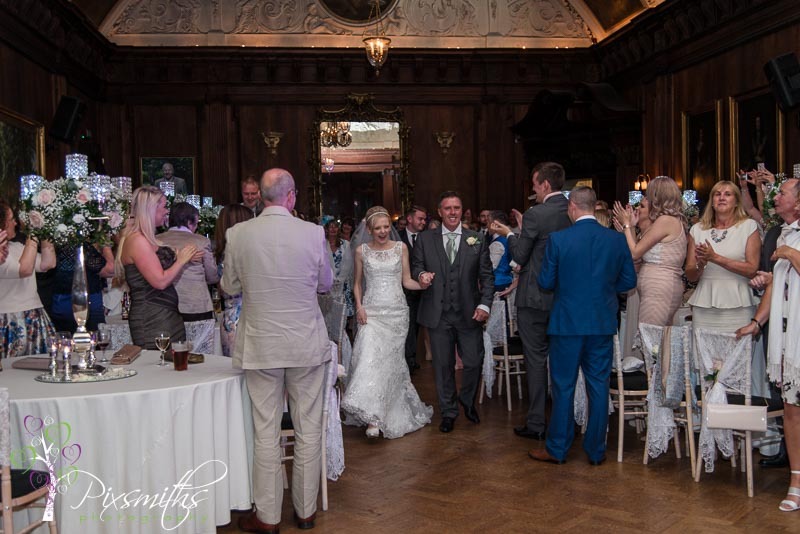 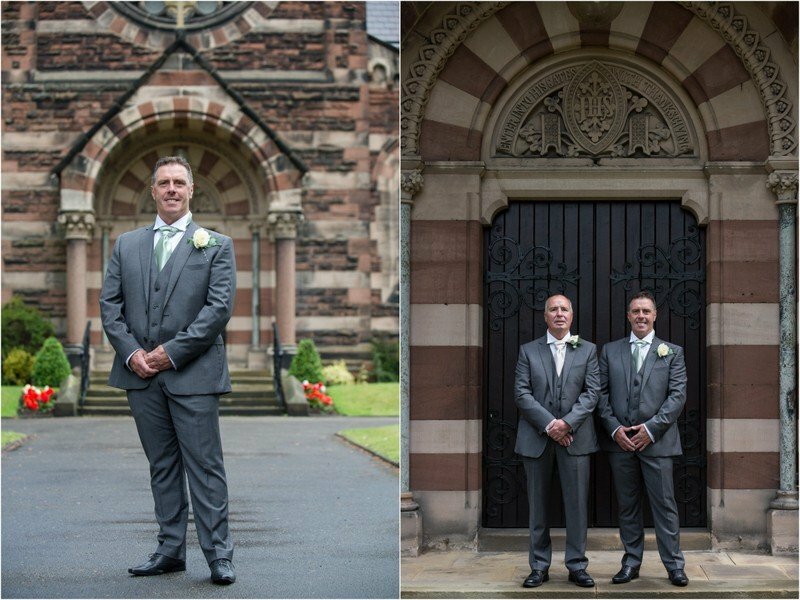 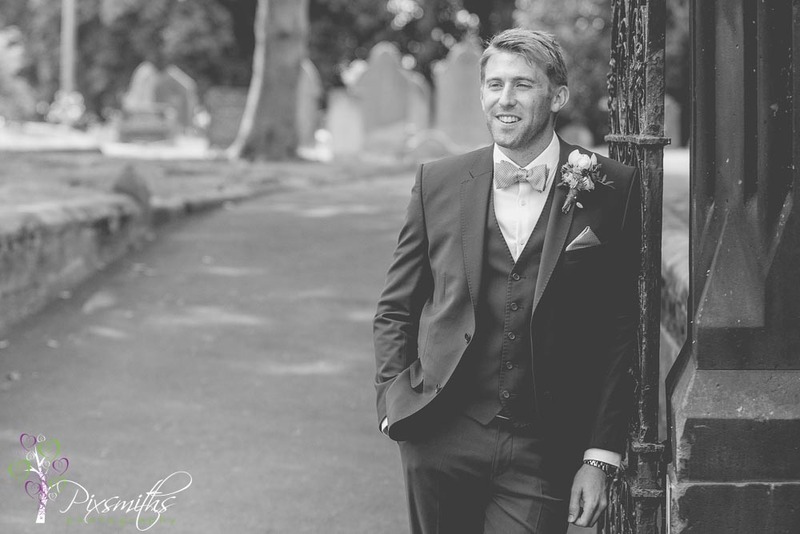 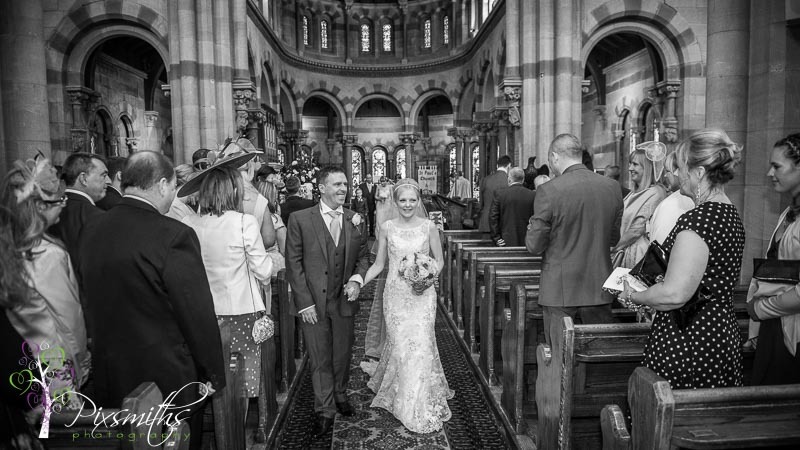 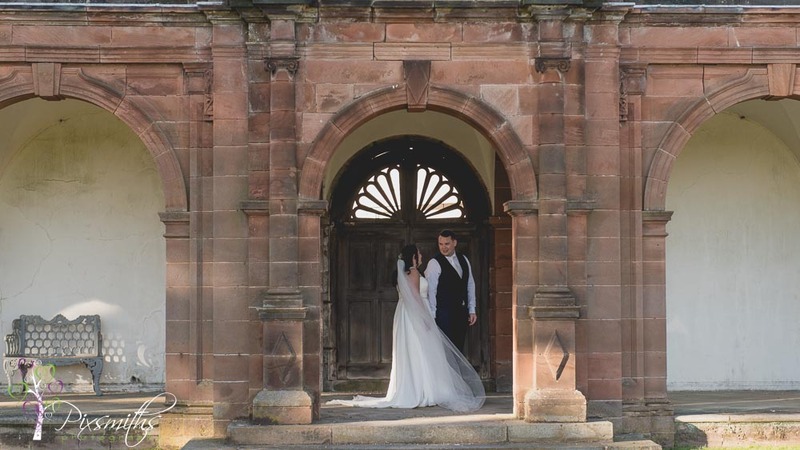 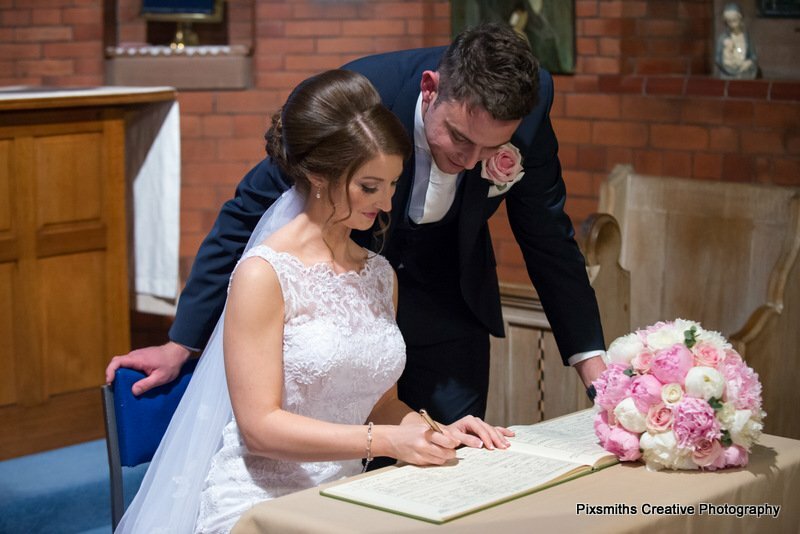 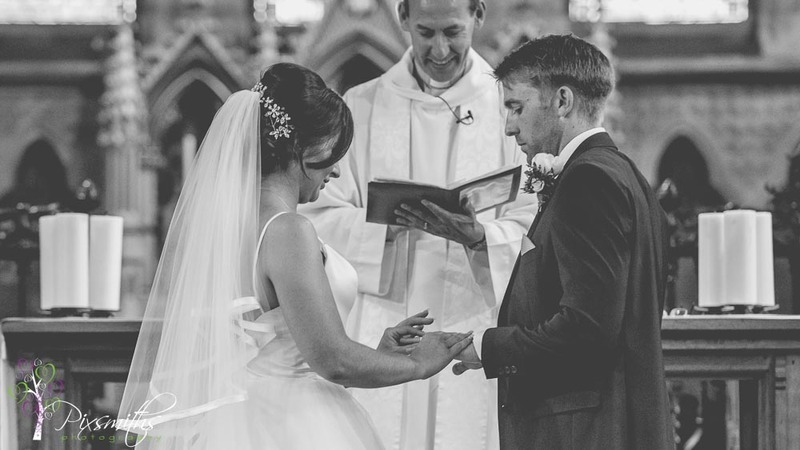 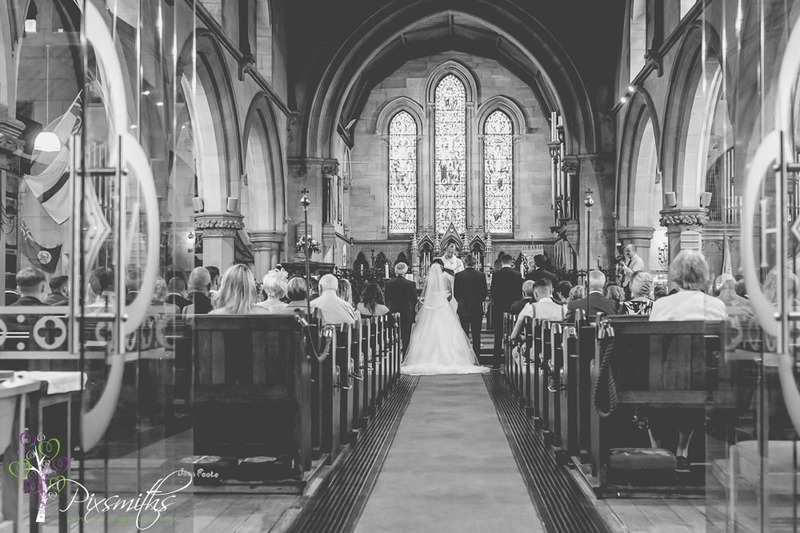 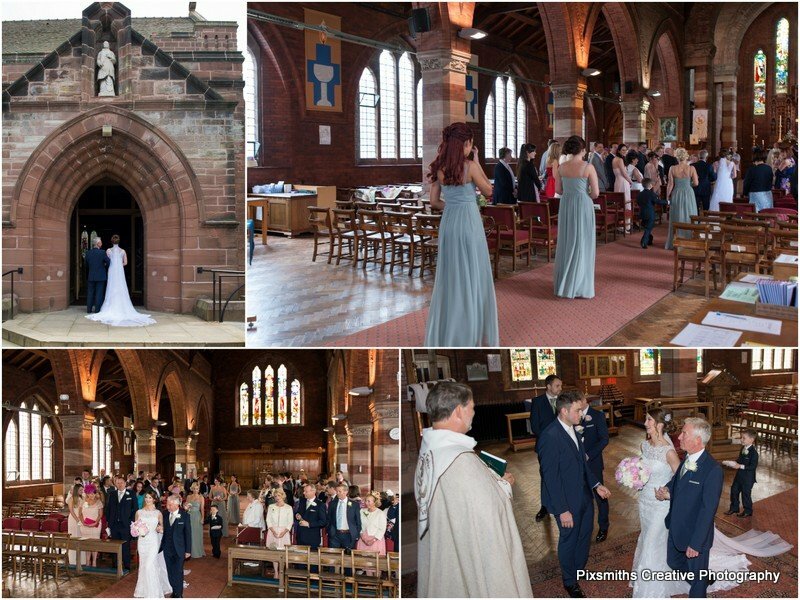 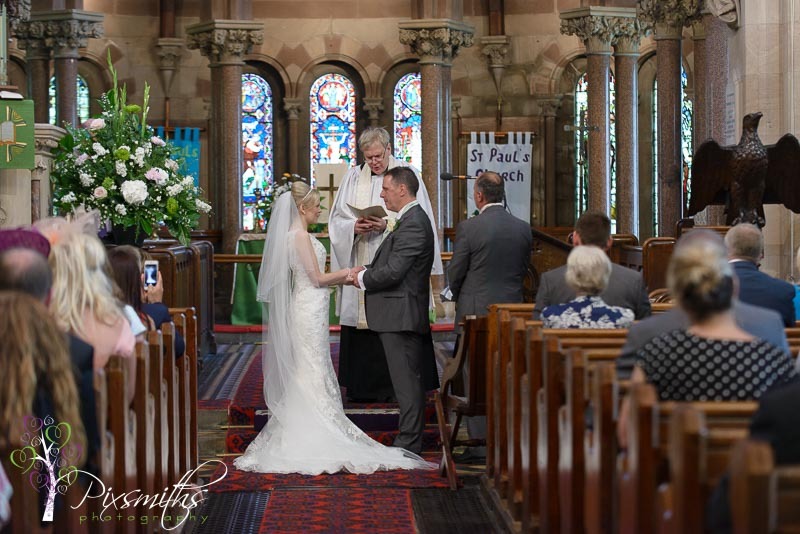 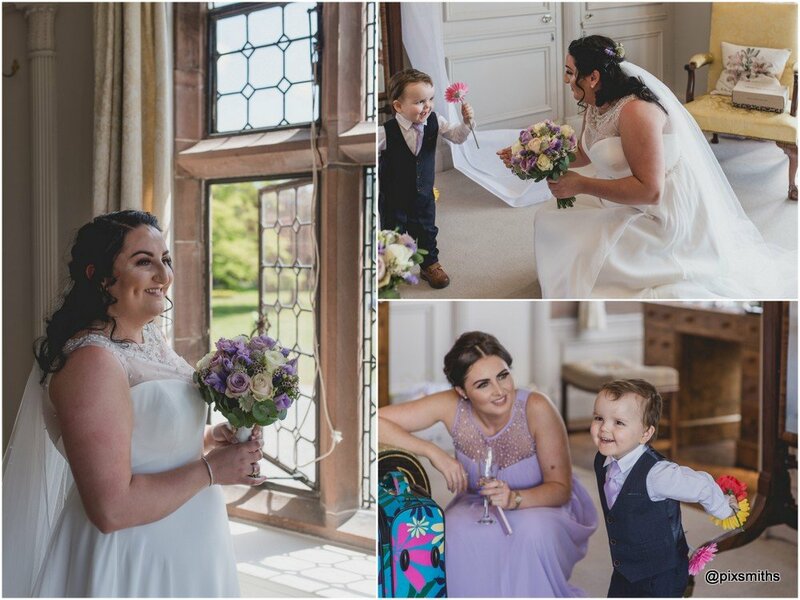 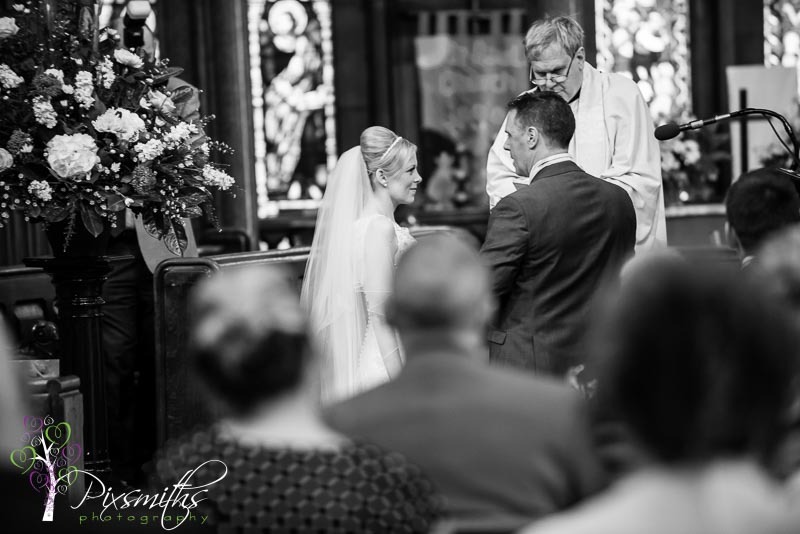 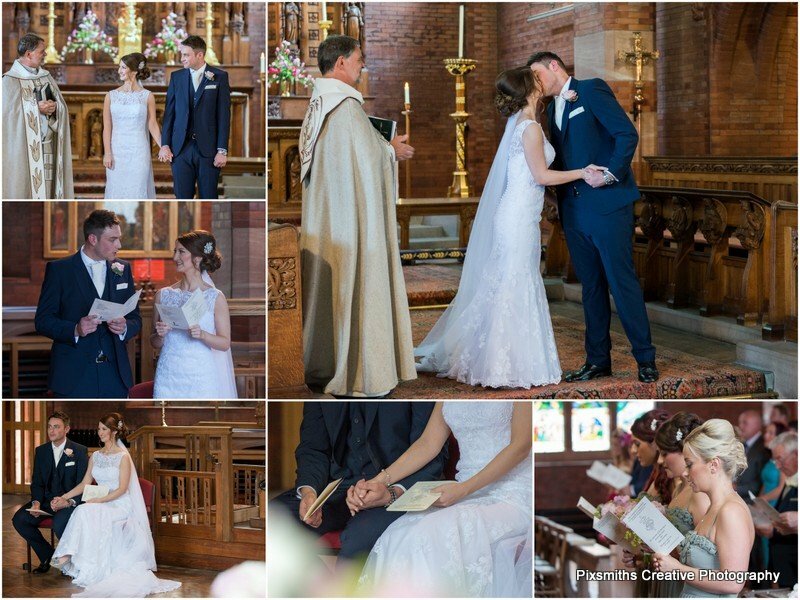 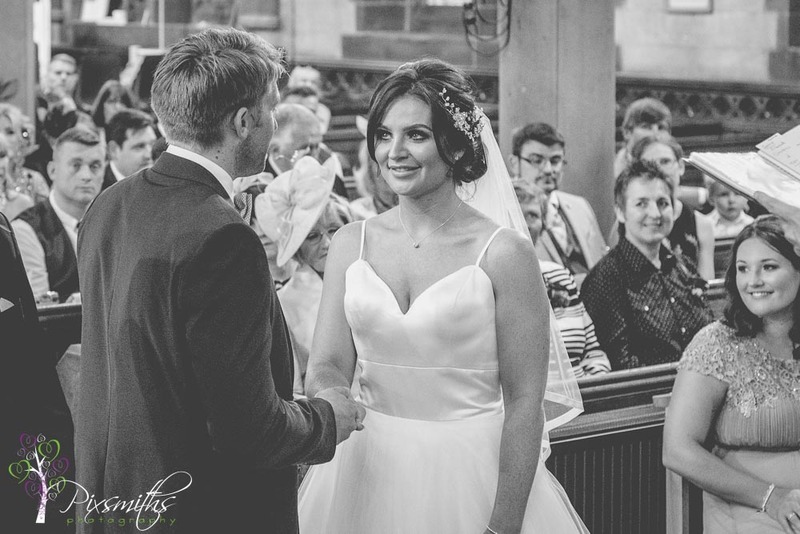 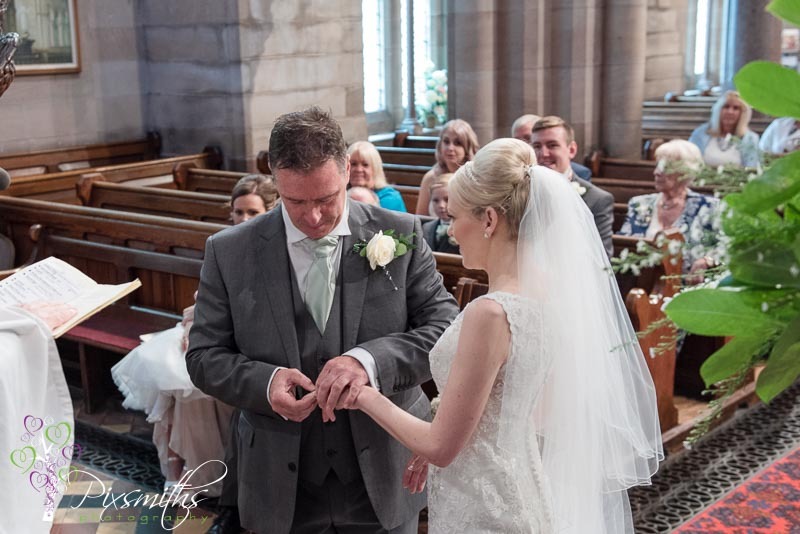 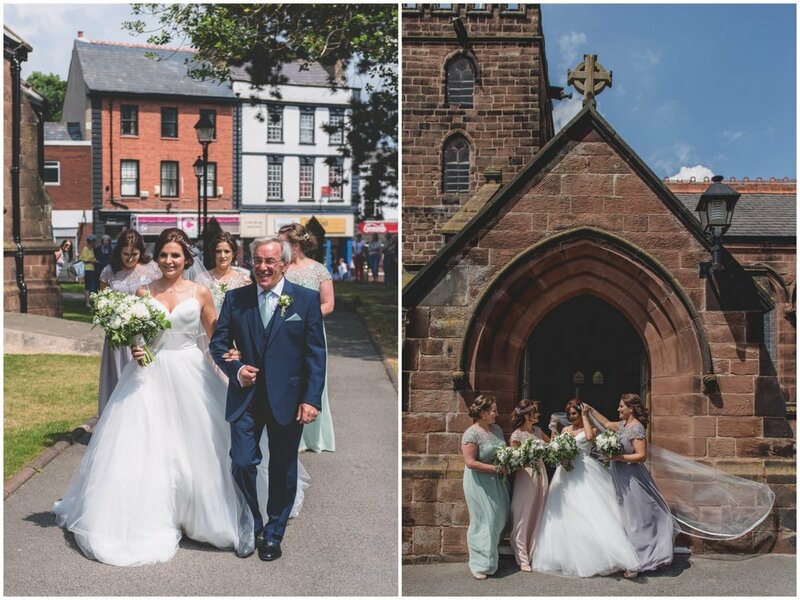 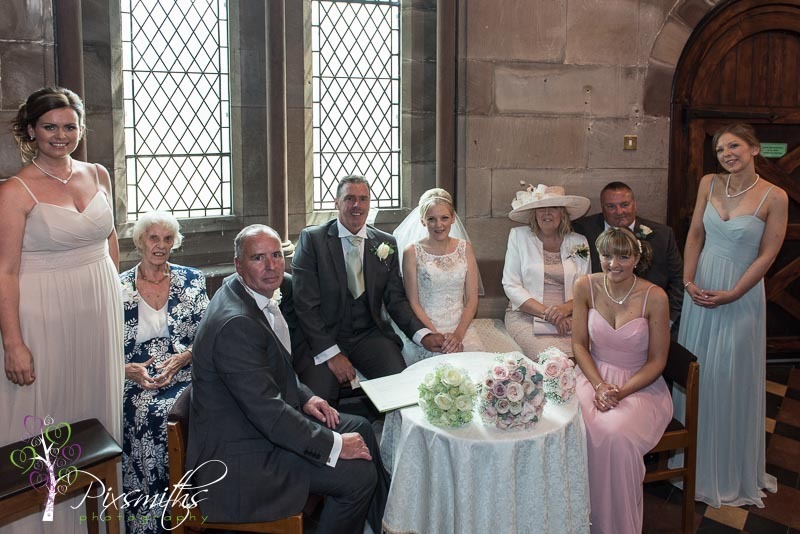 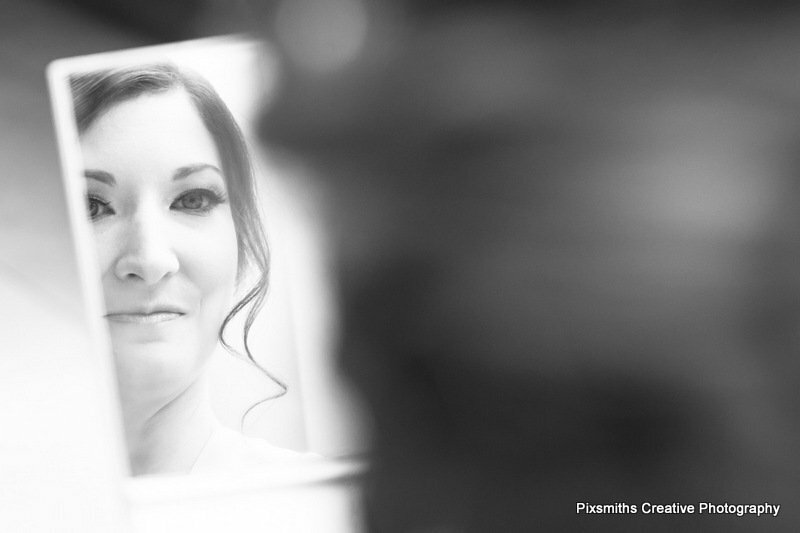 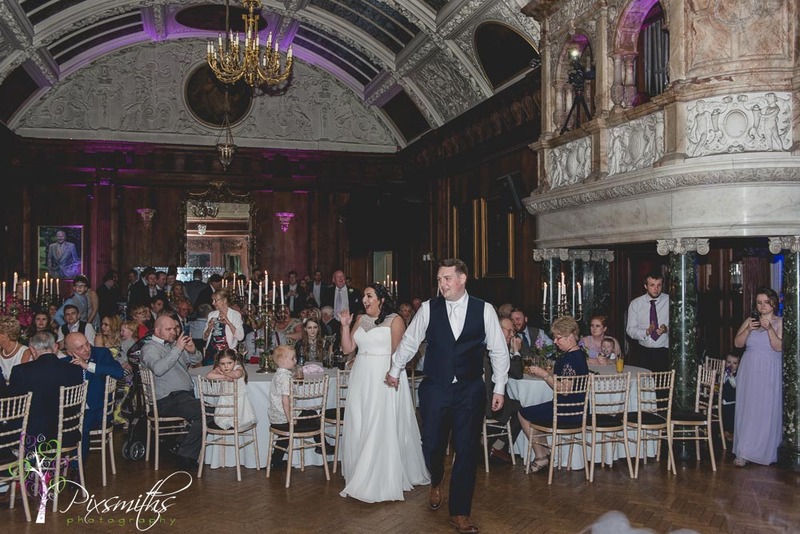 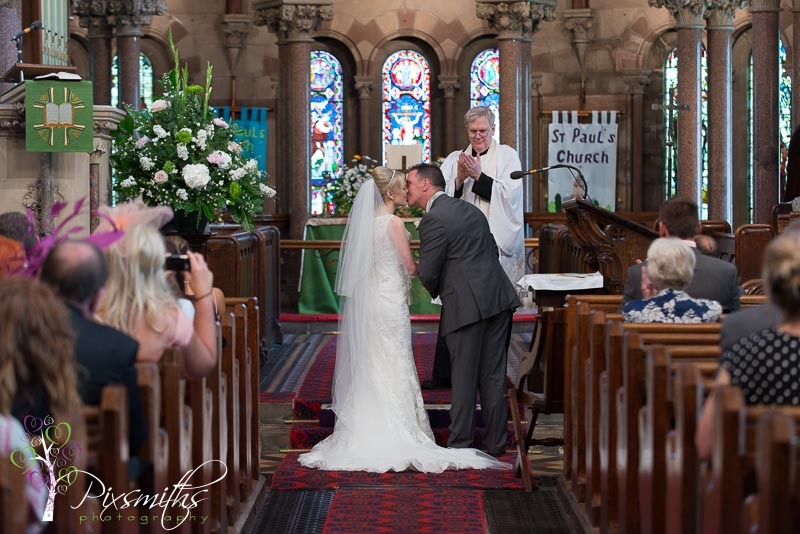 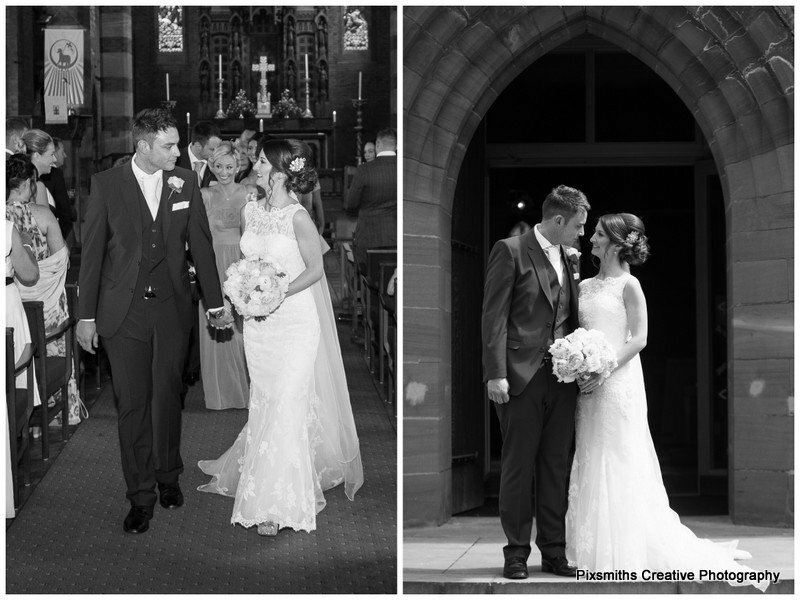 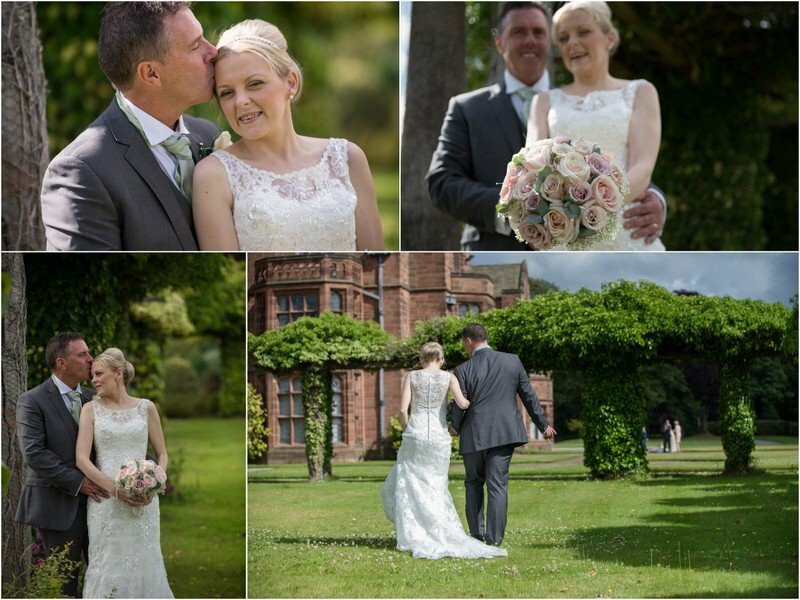 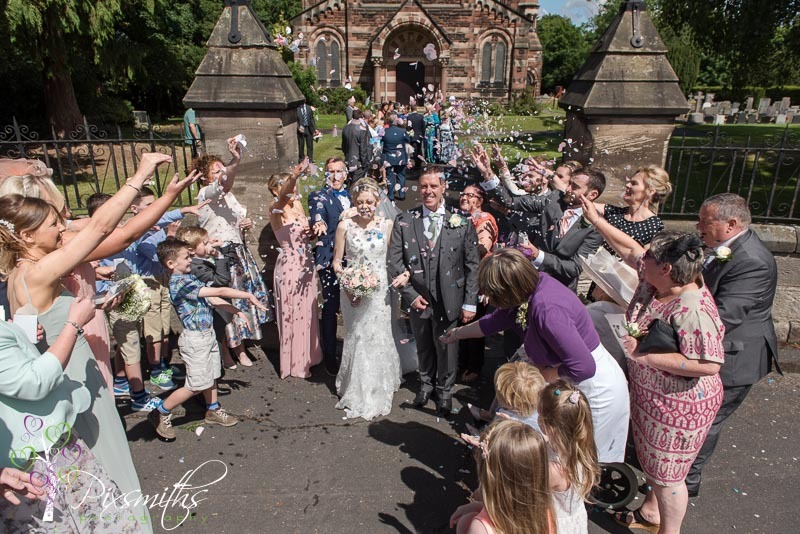 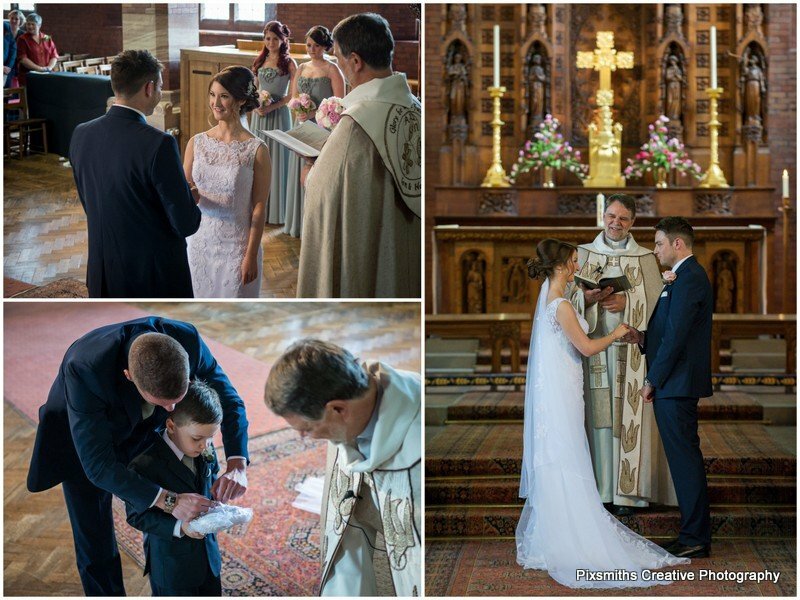 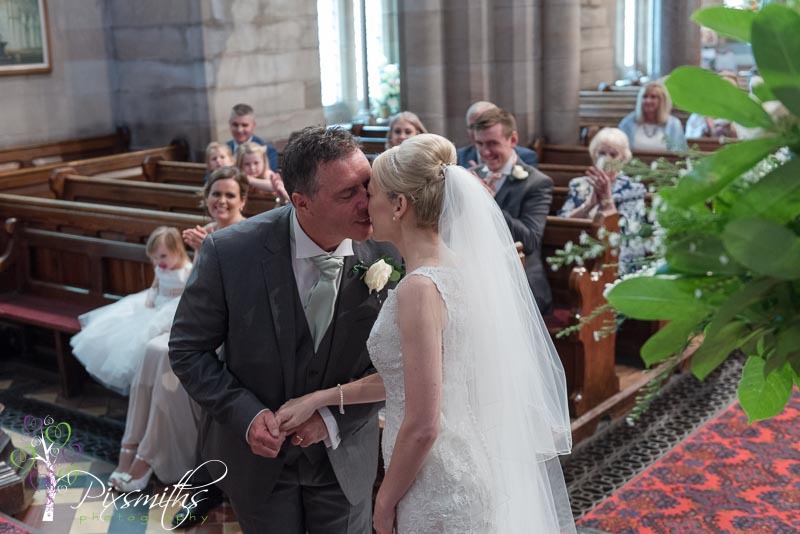 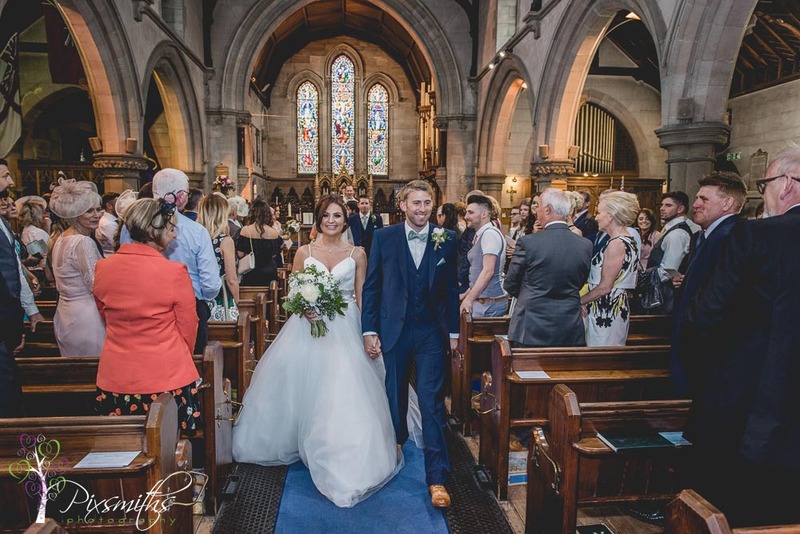 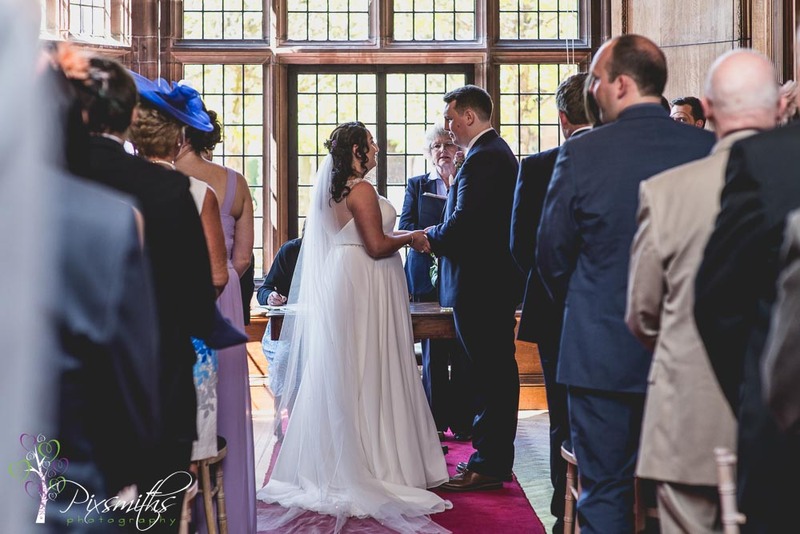 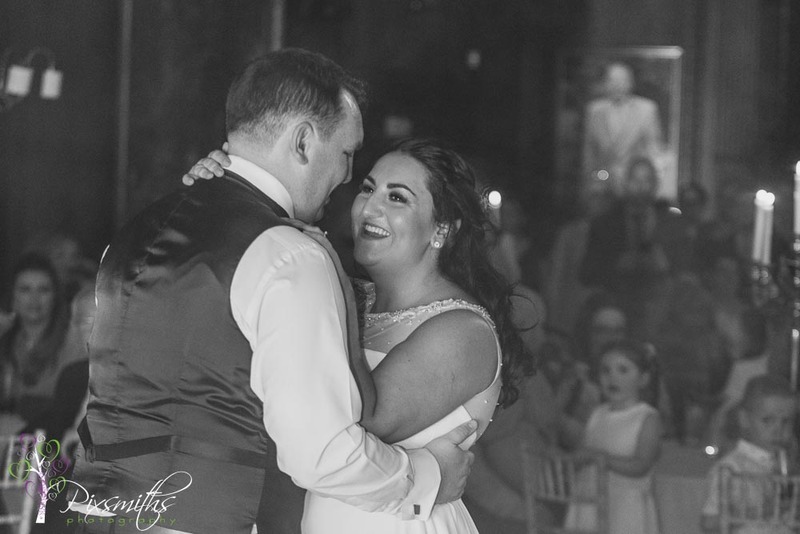 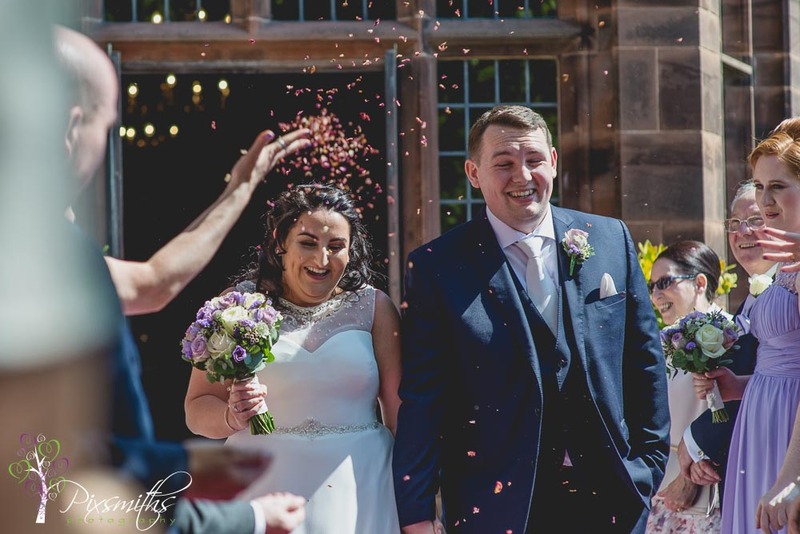 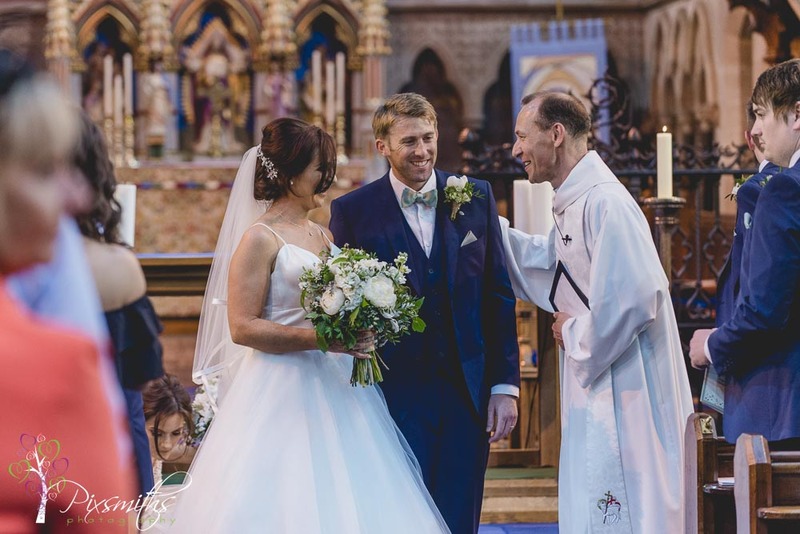 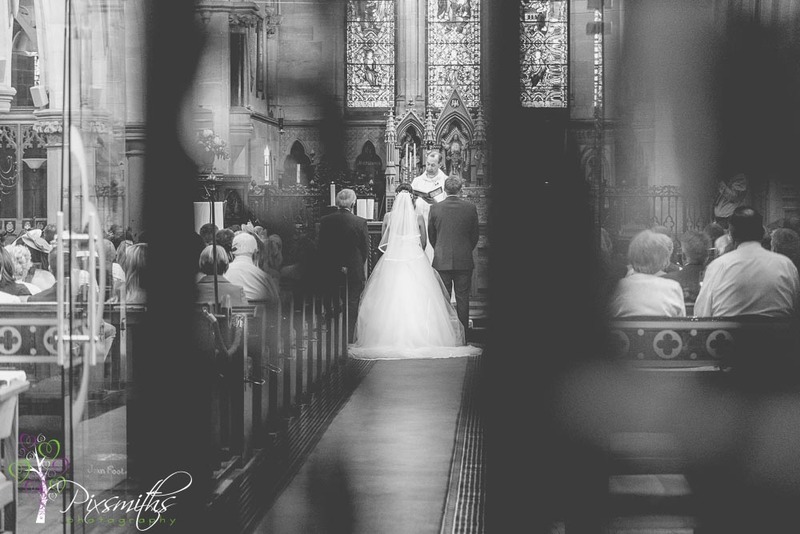 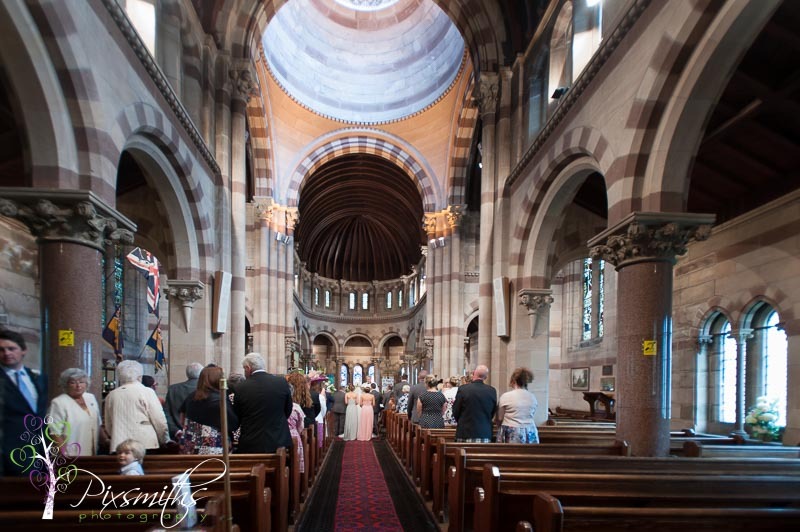 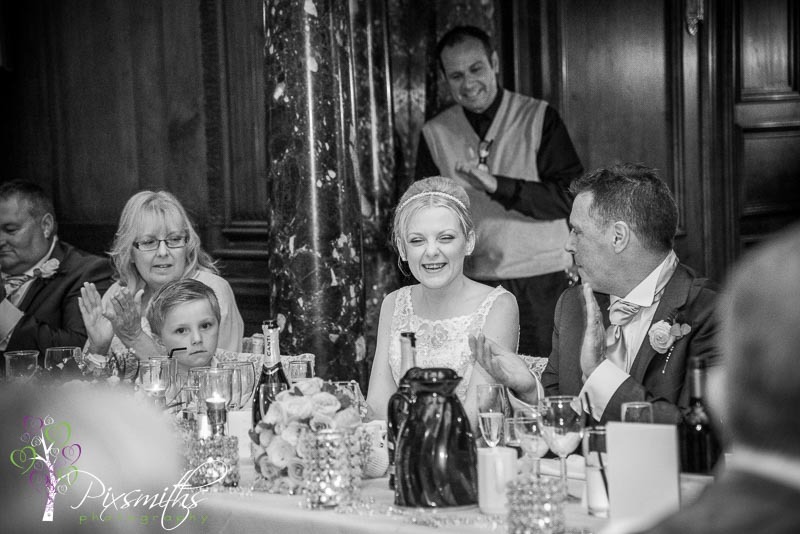 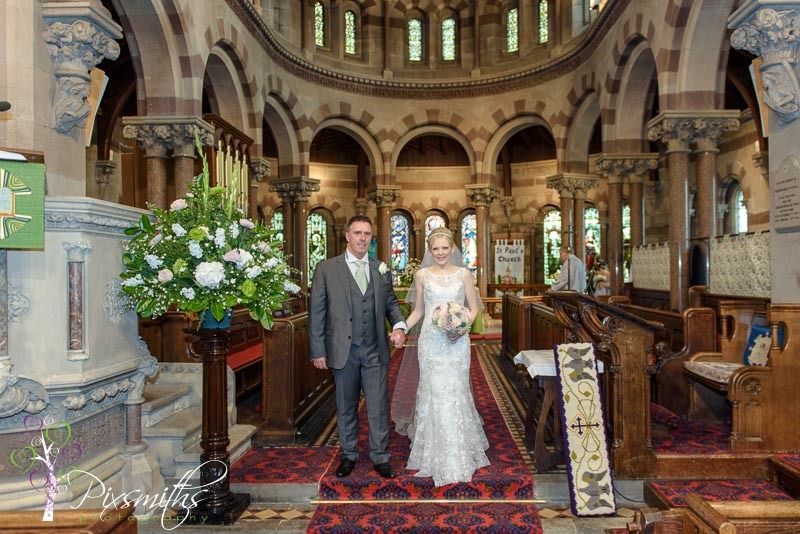 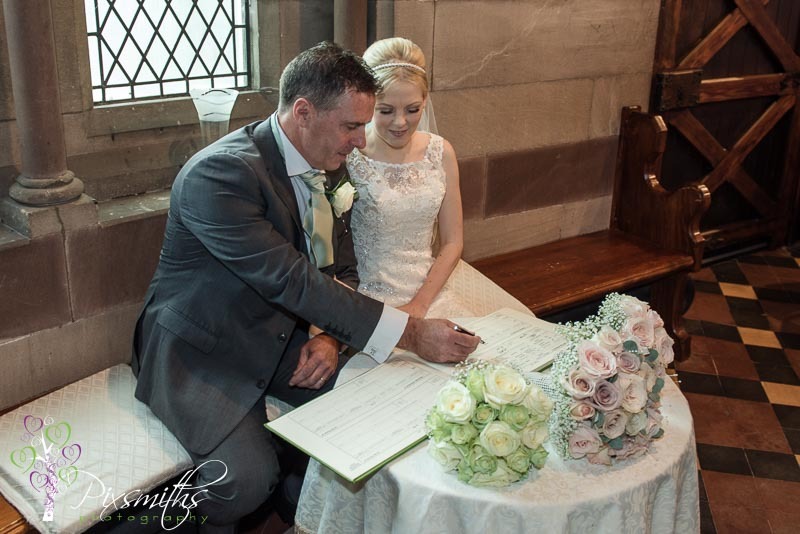 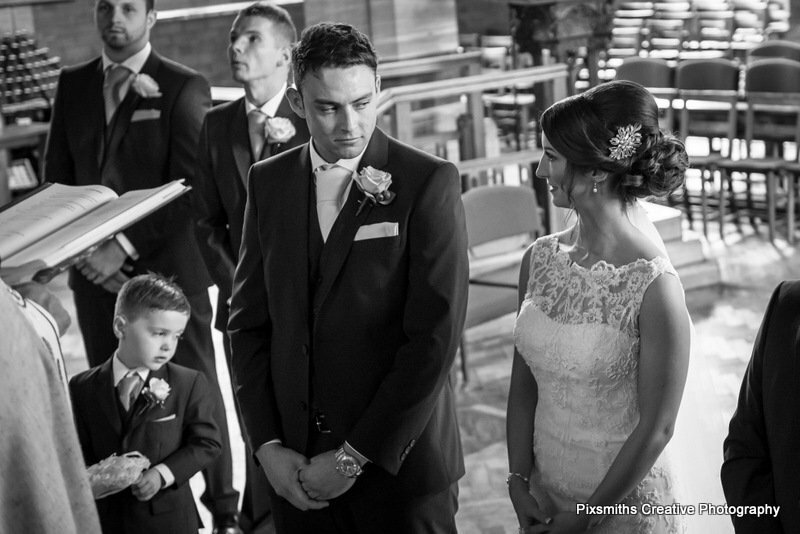 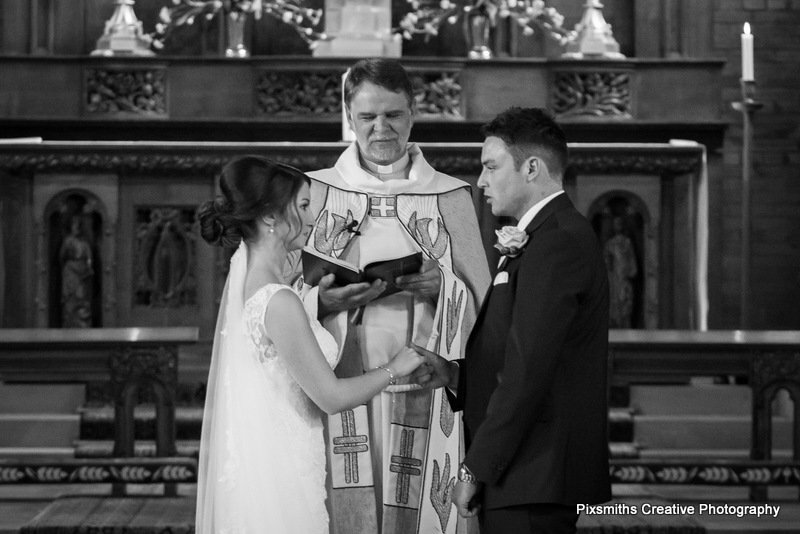 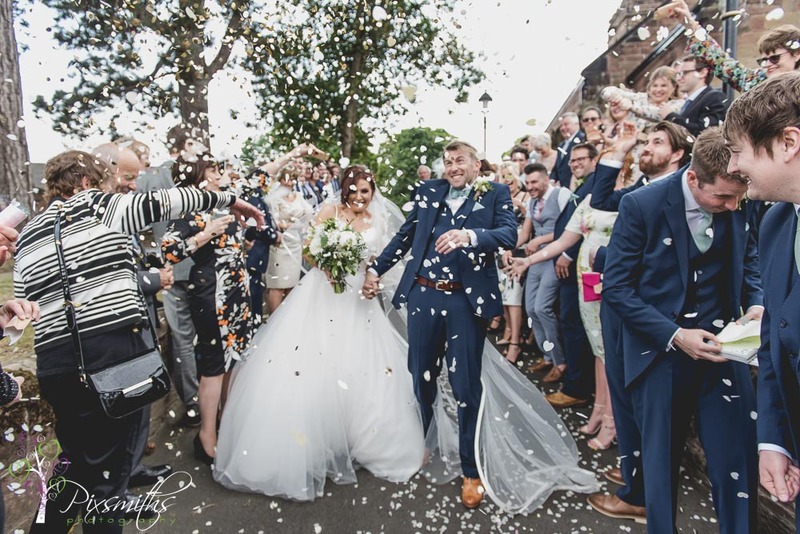 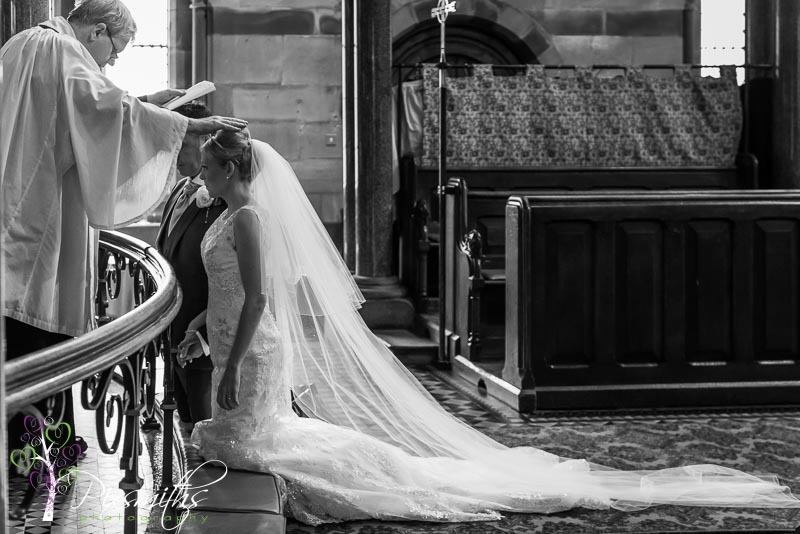 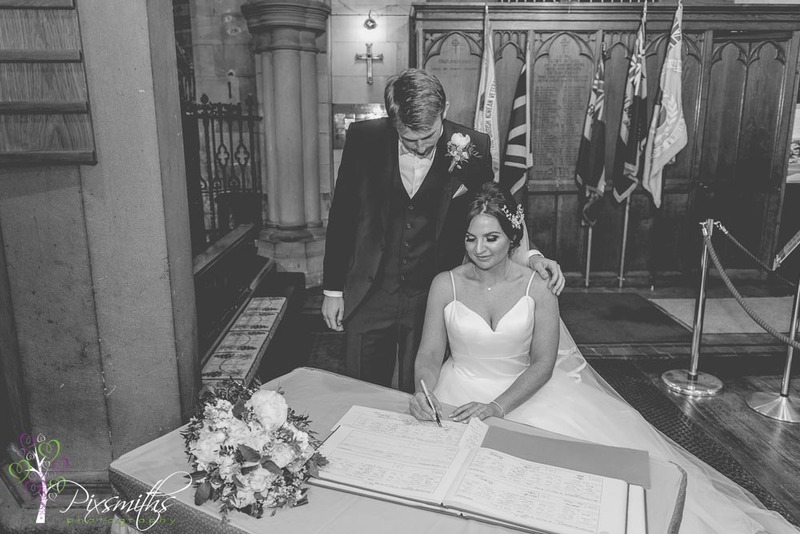 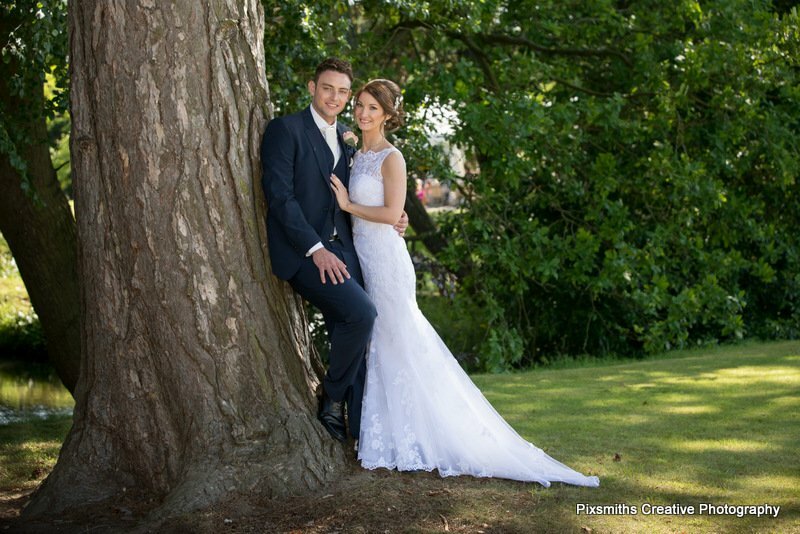 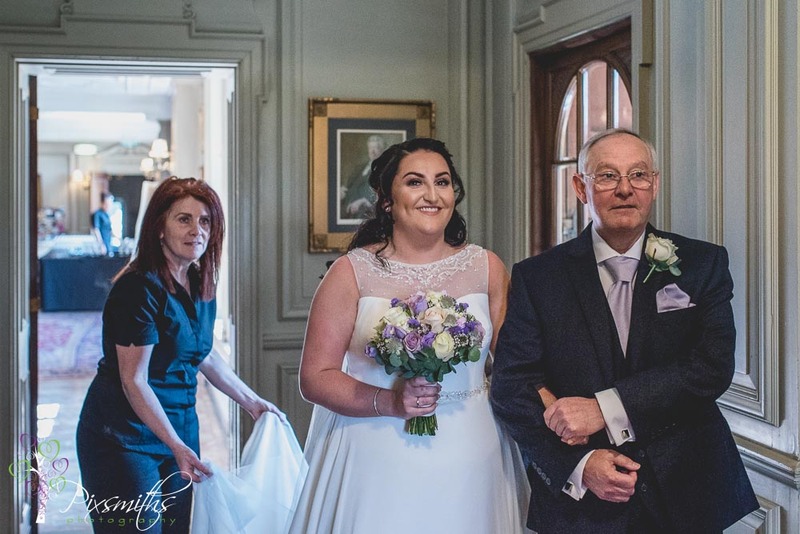 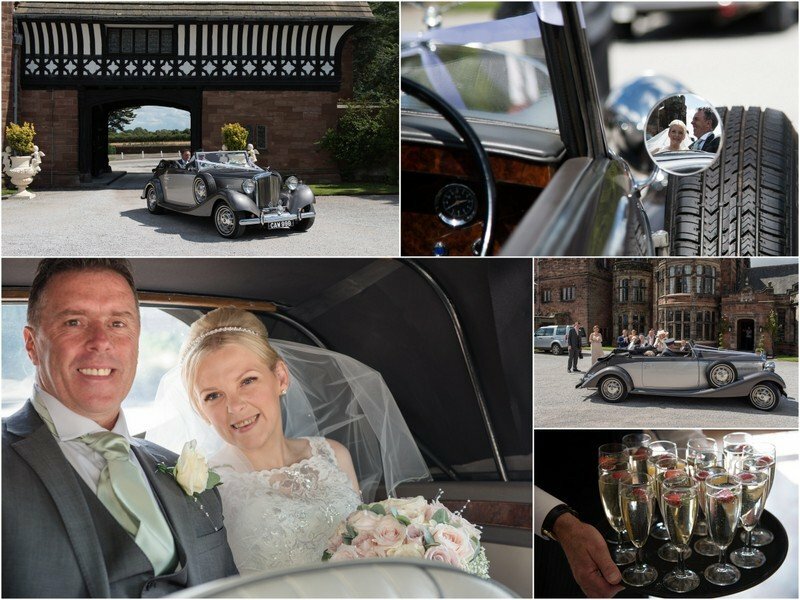 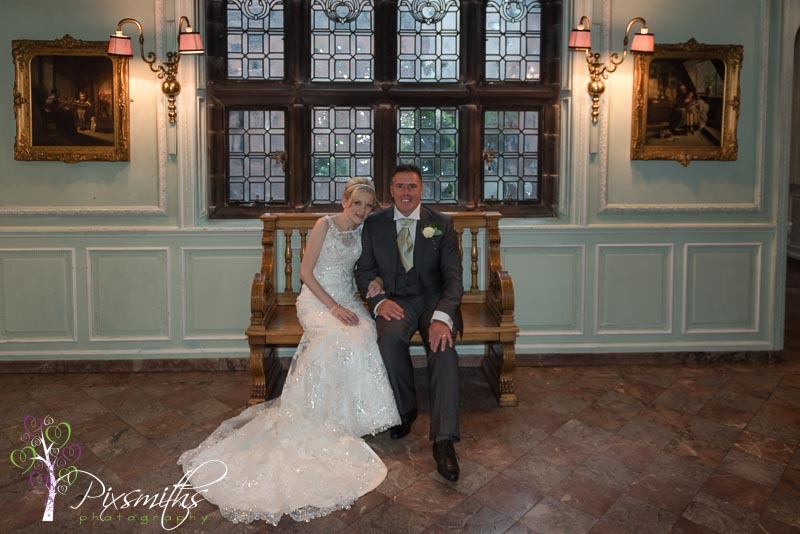 Wirral wedding photographers Pixsmiths Creative Photgraphy were honoured to capture the joy and love of the beautiful wedding of Jill and Anthony at St Stephens in Prenton, – loved the light in this church!, followed by a wonderful reception at Thornton Manor’s Waterside Pavillion. 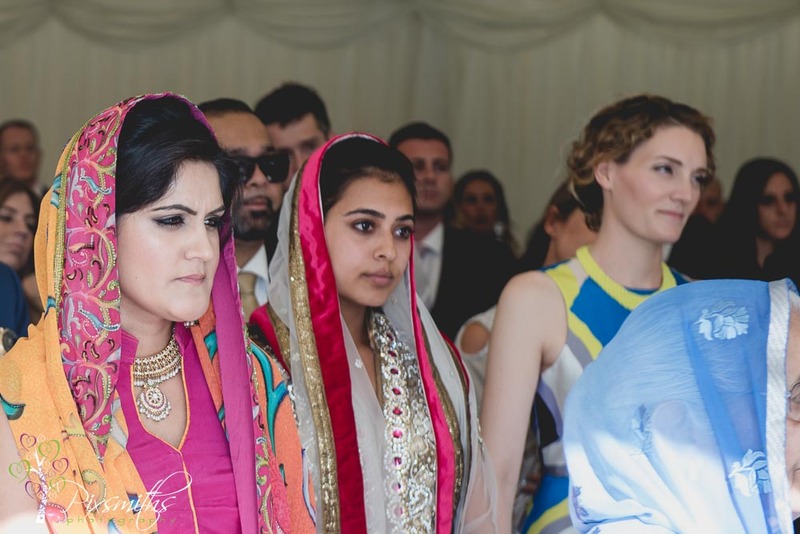 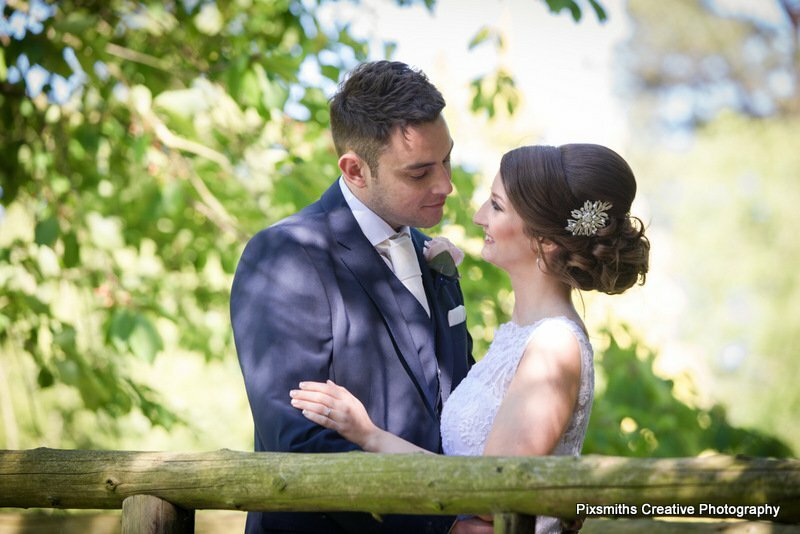 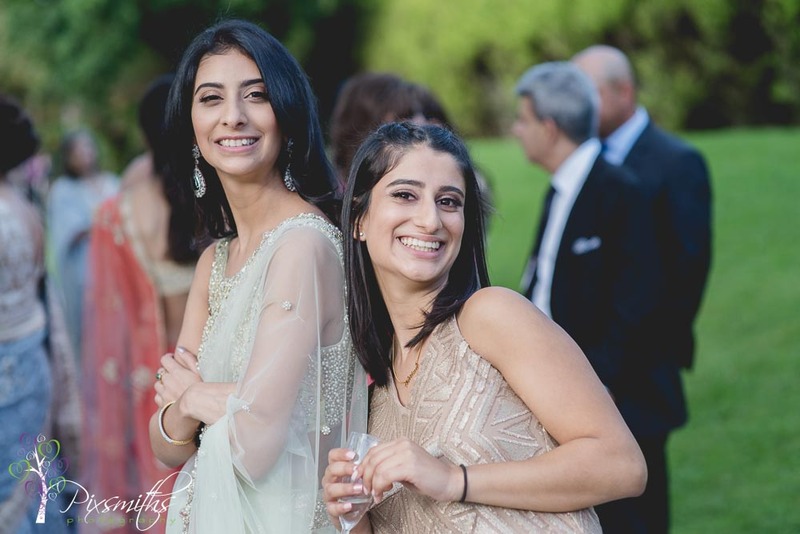 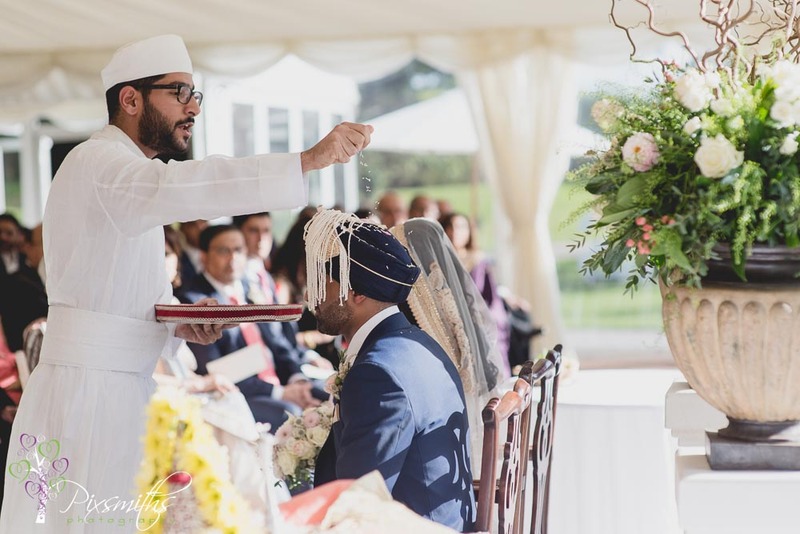 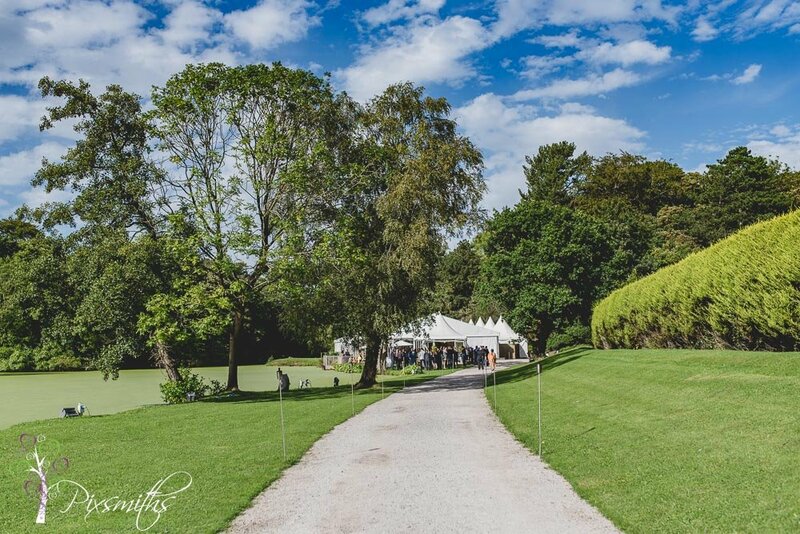 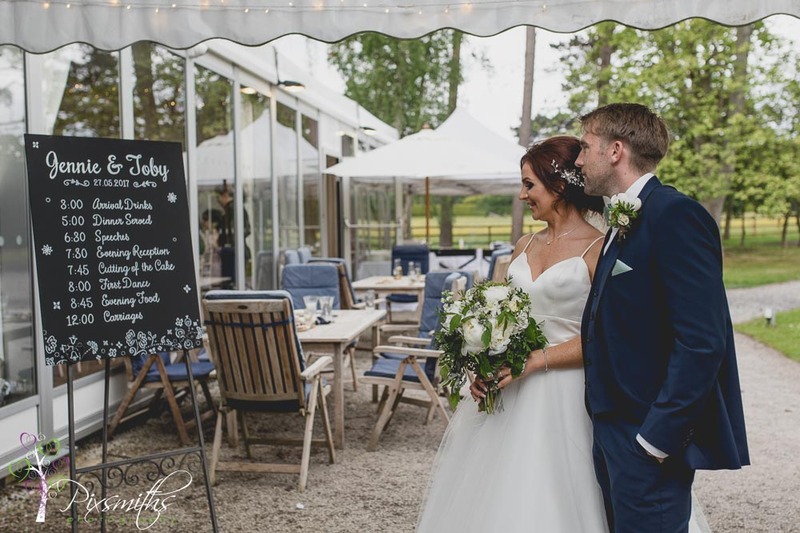 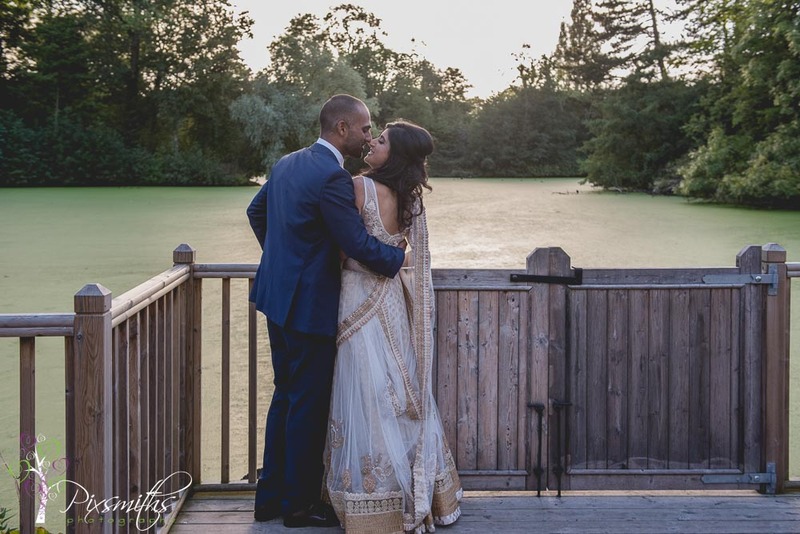 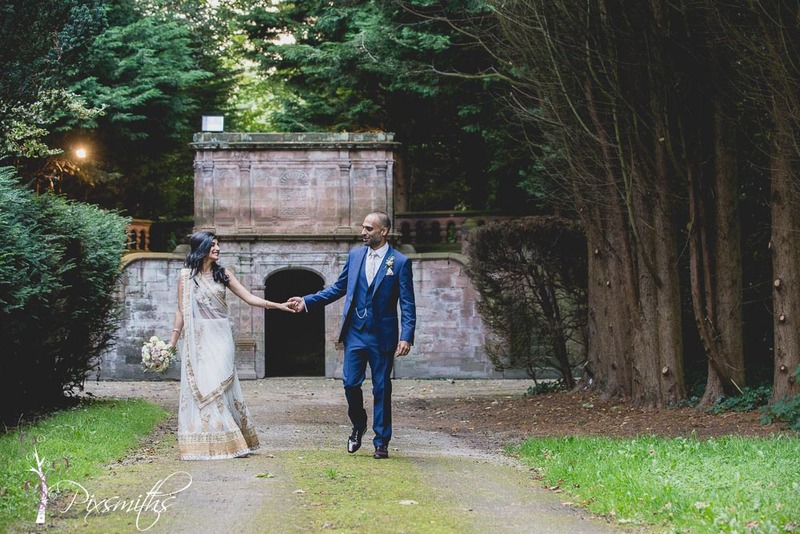 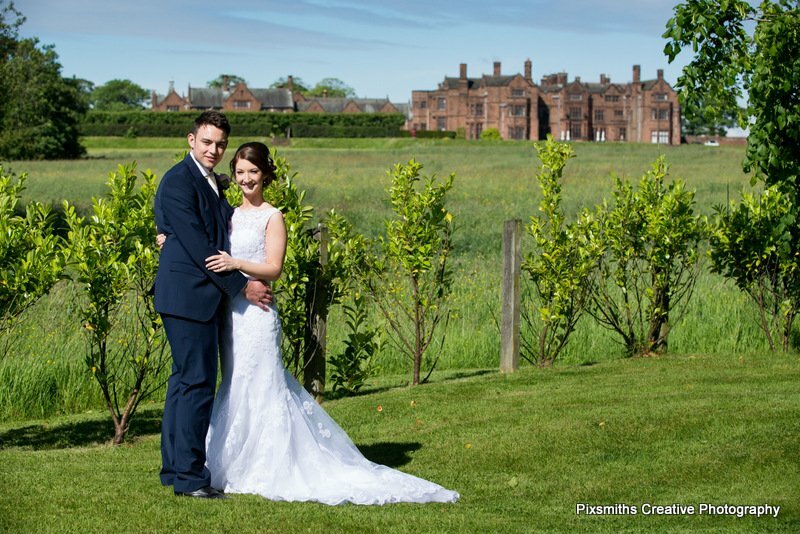 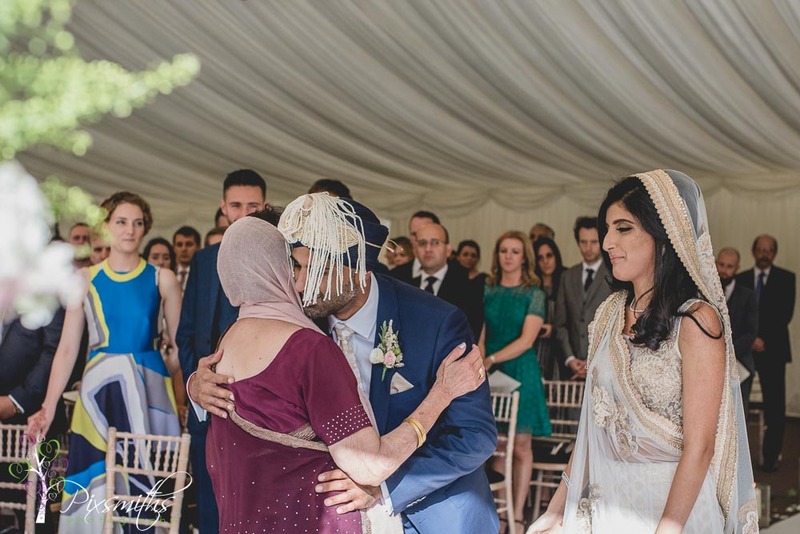 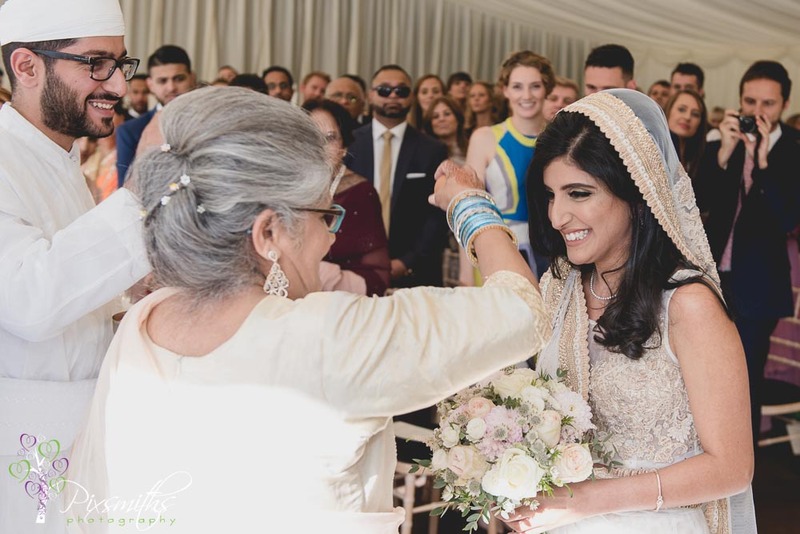 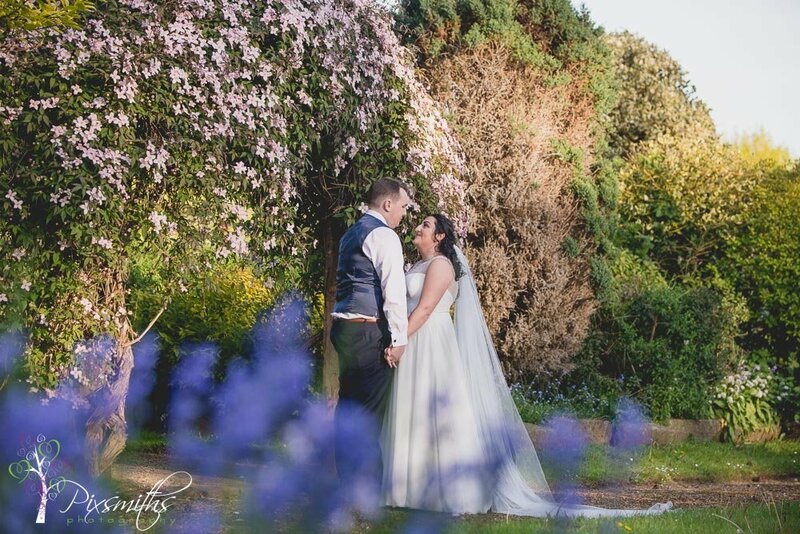 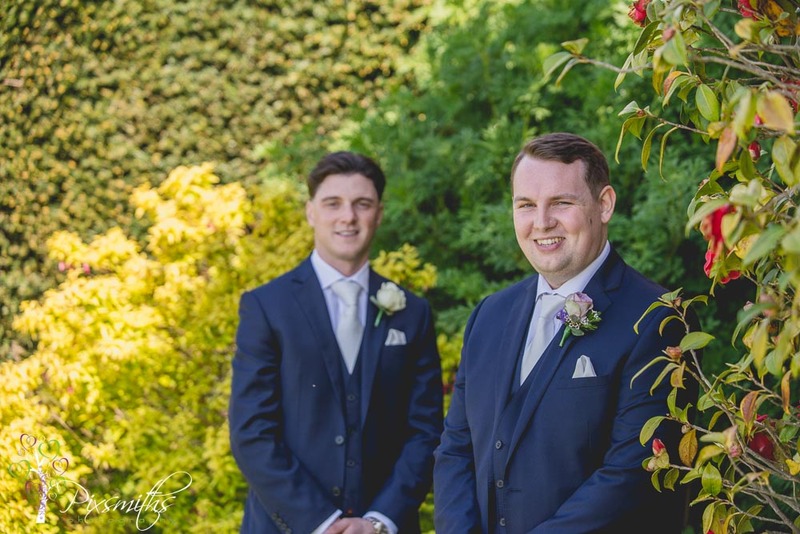 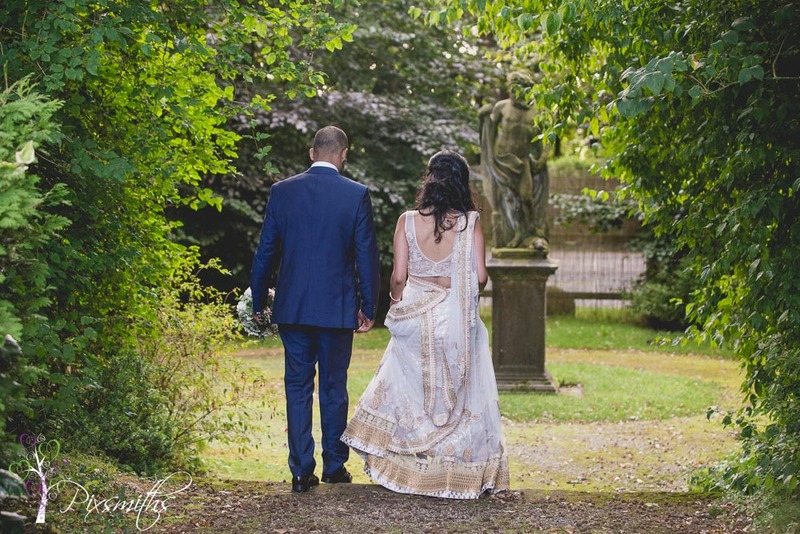 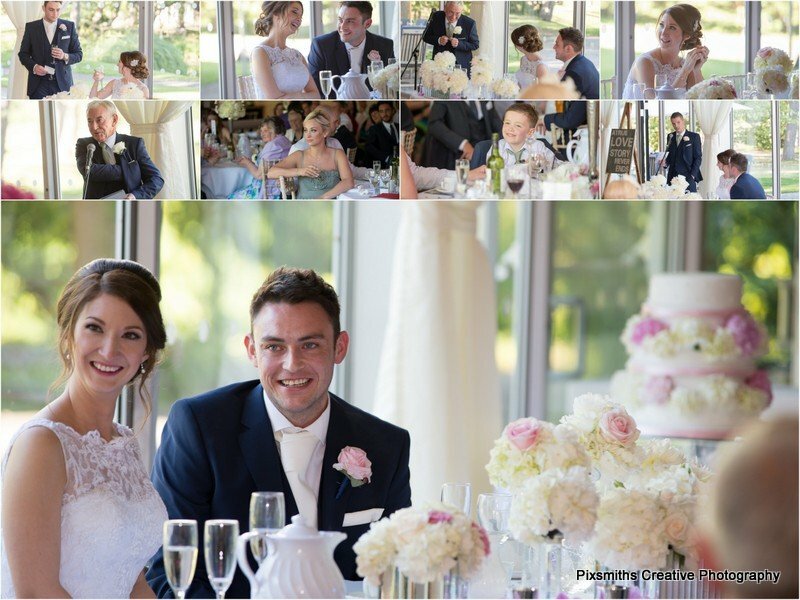 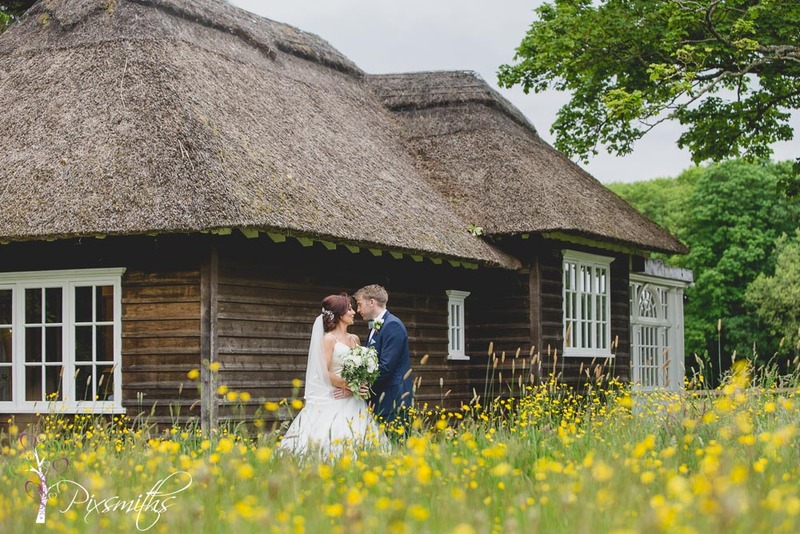 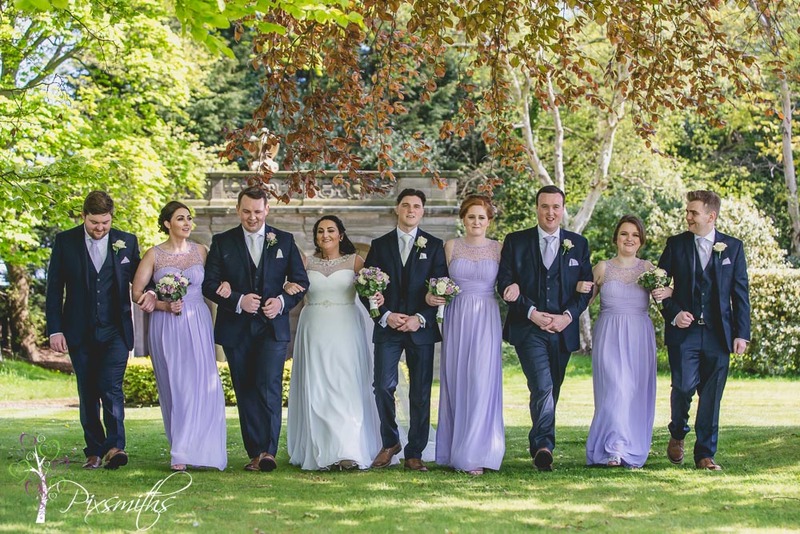 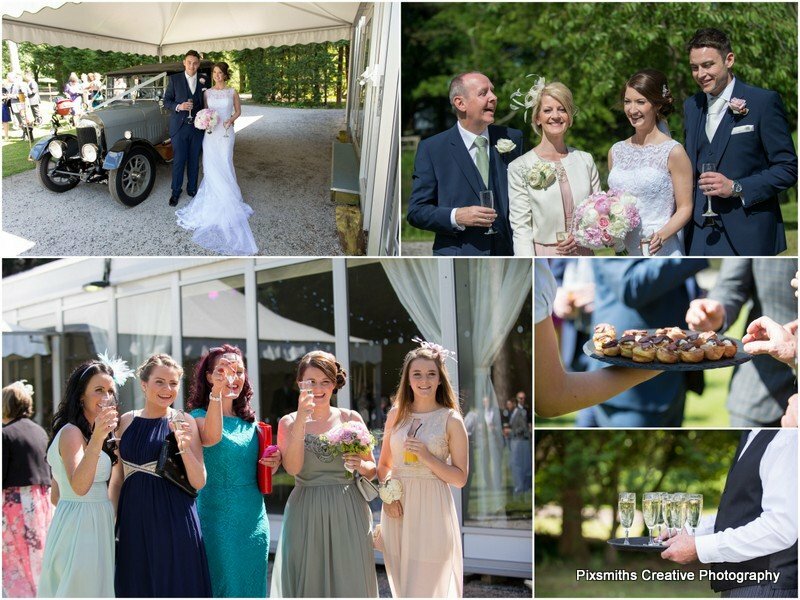 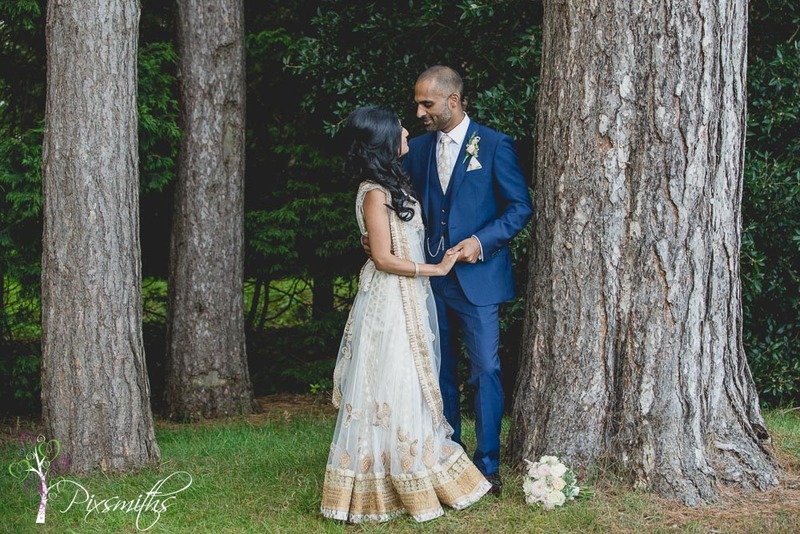 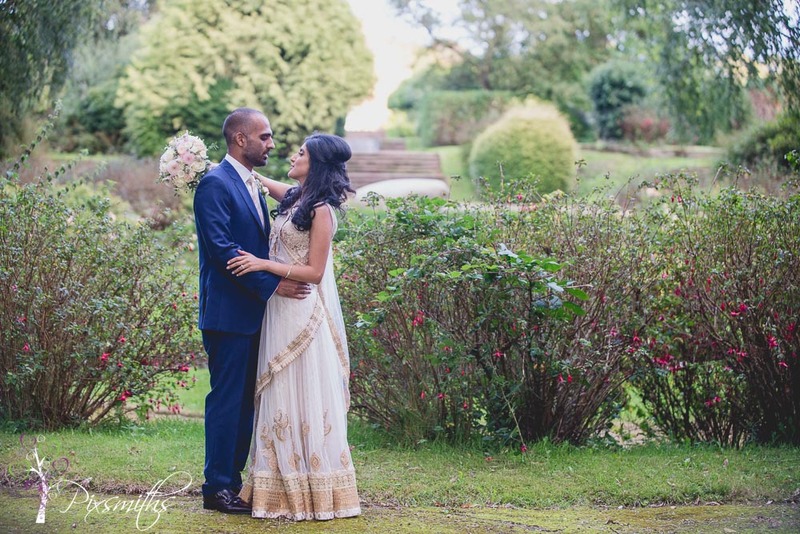 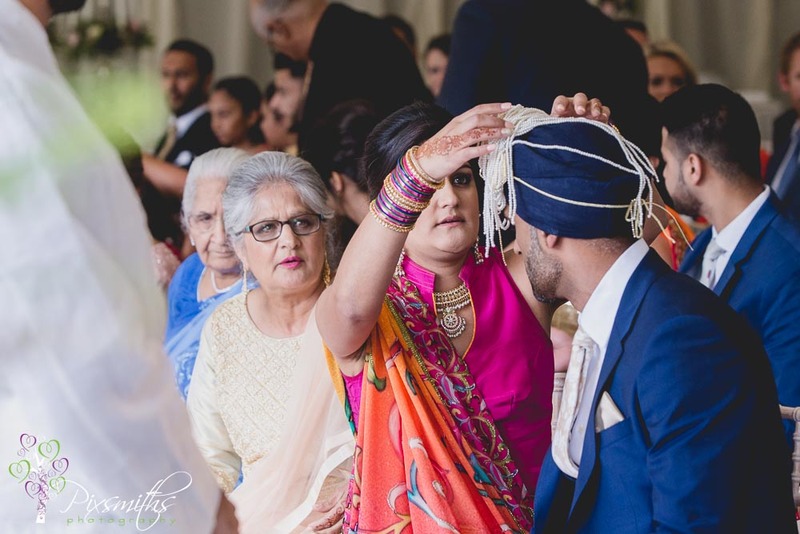 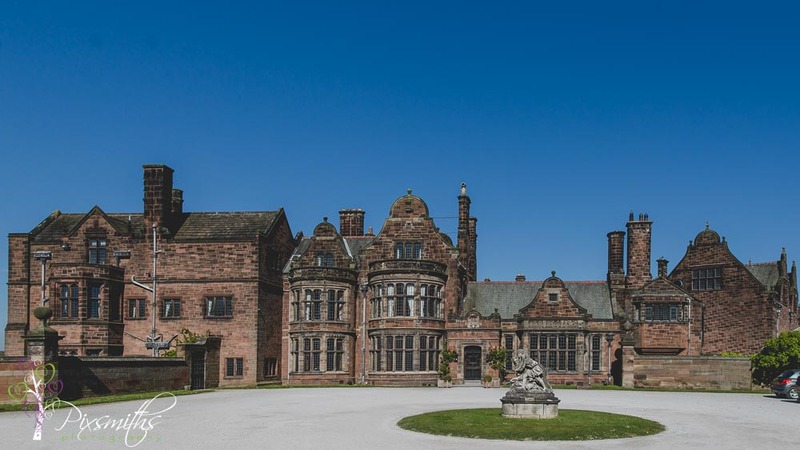 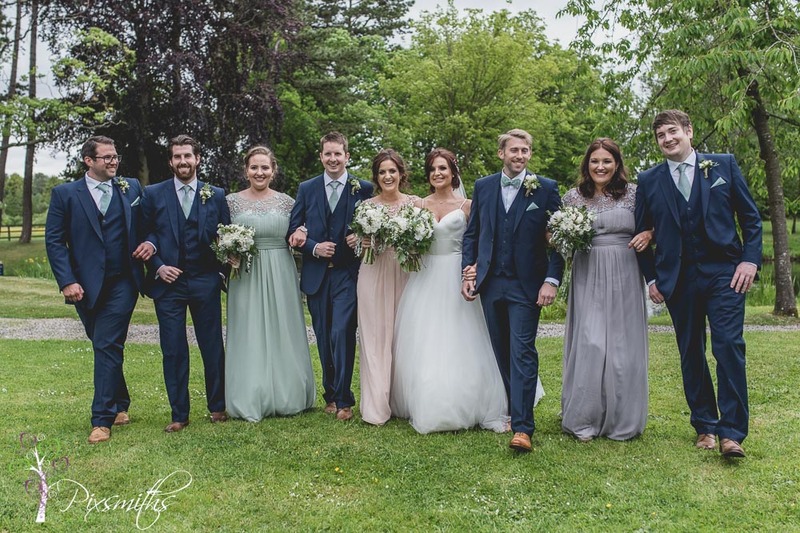 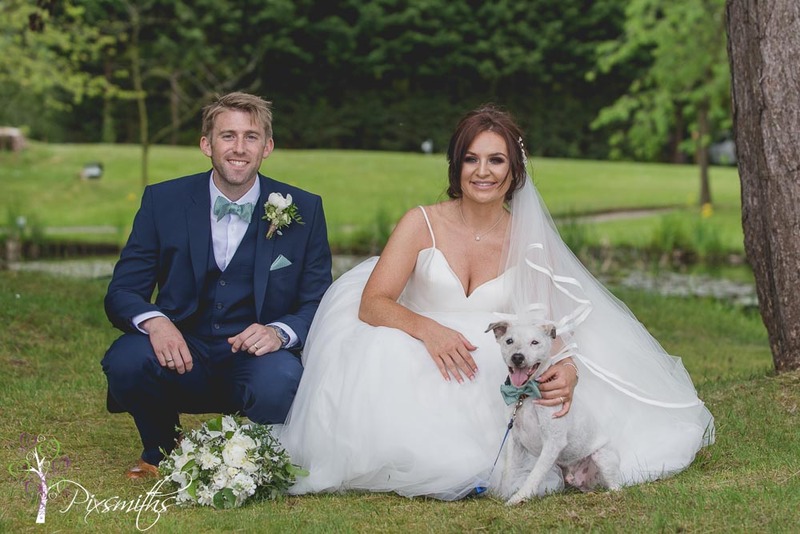 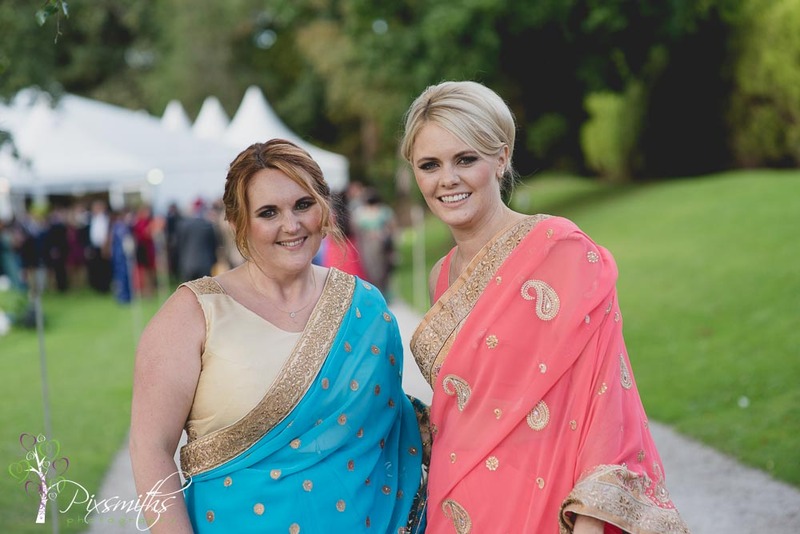 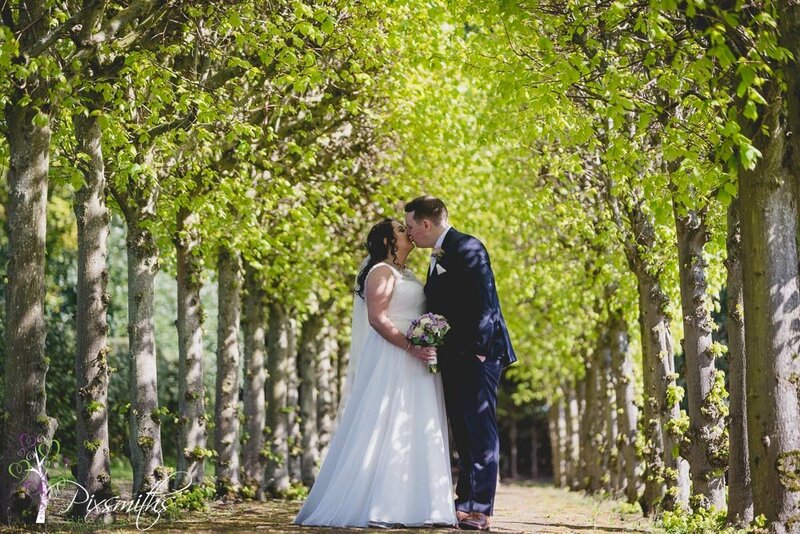 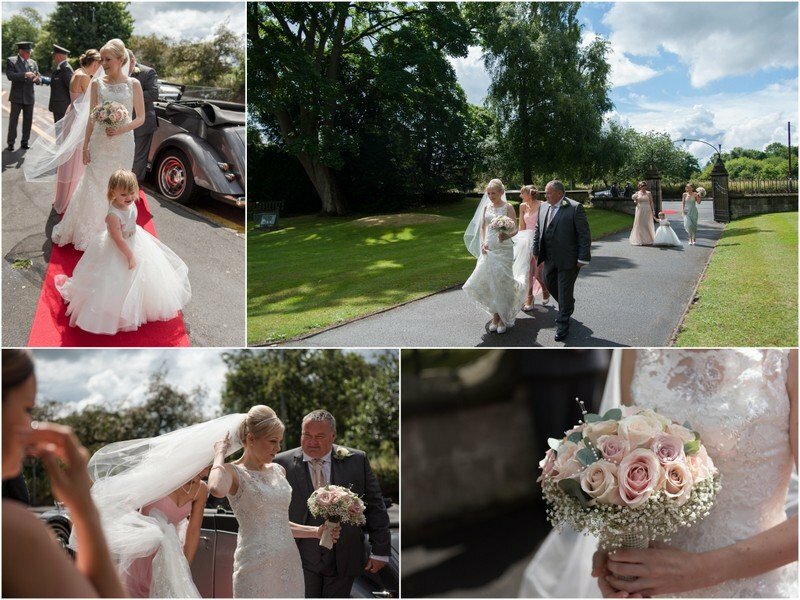 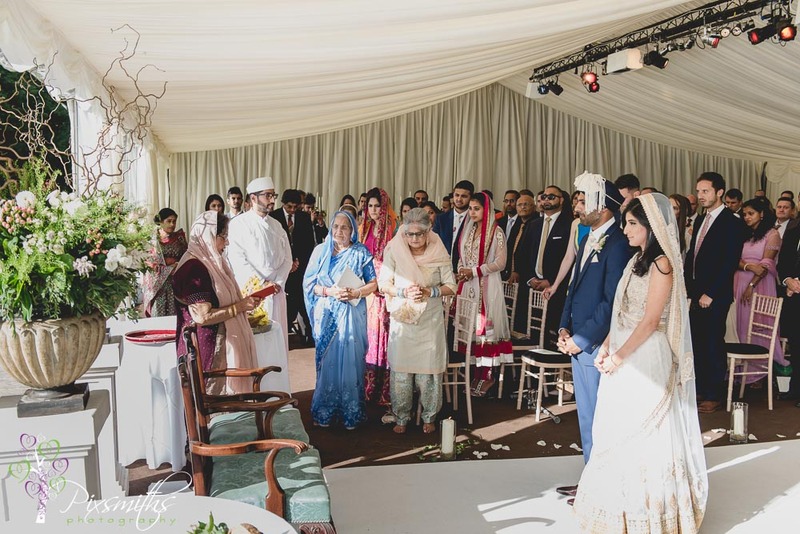 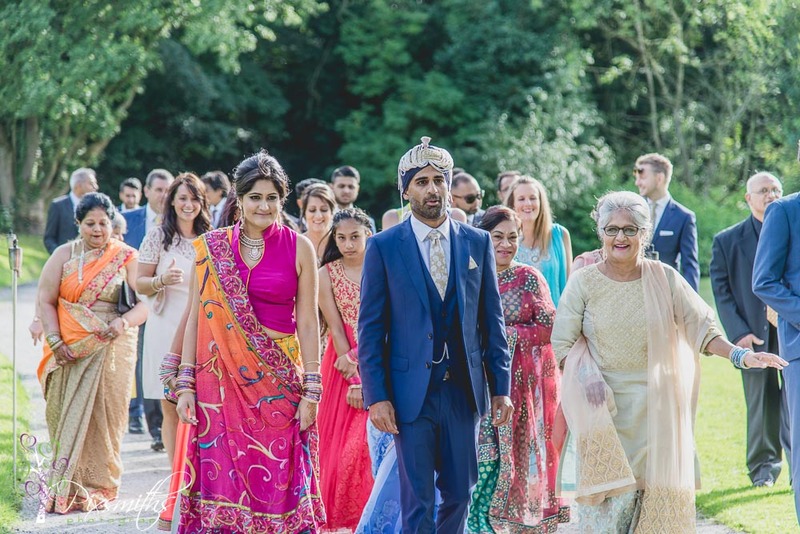 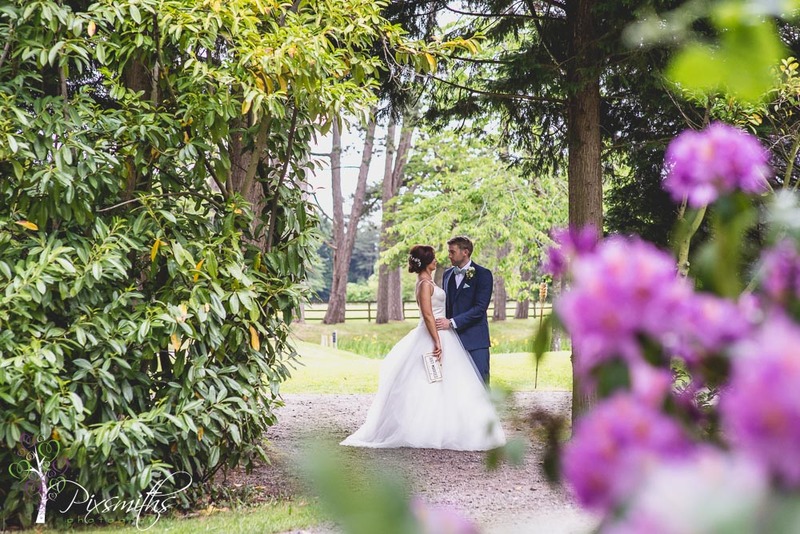 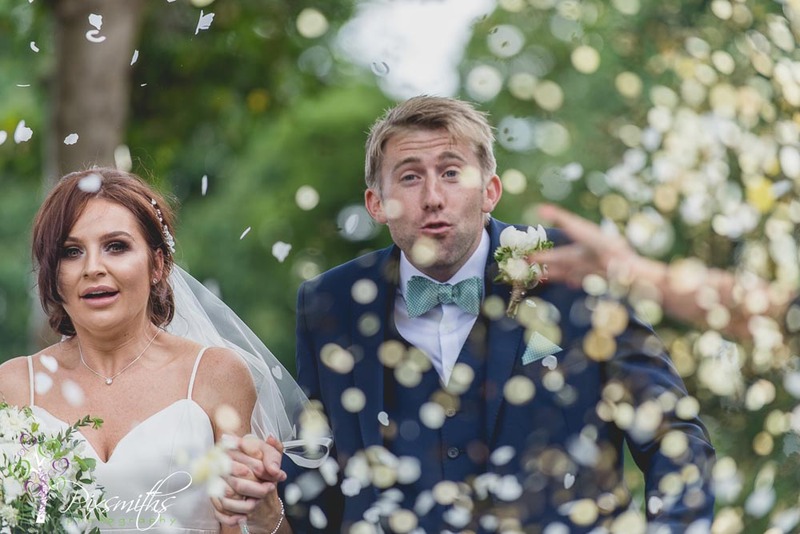 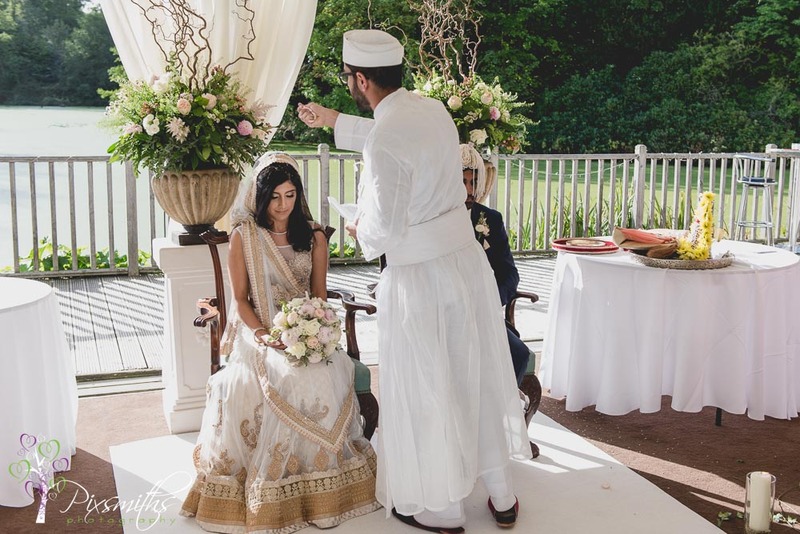 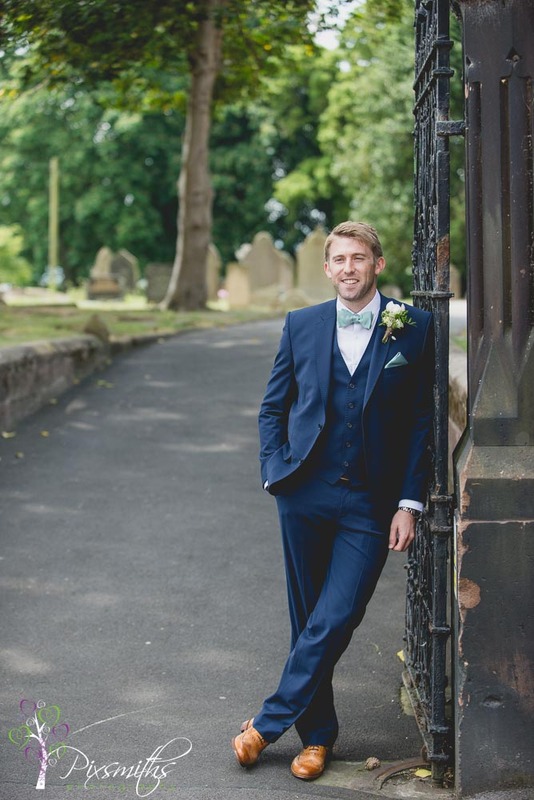 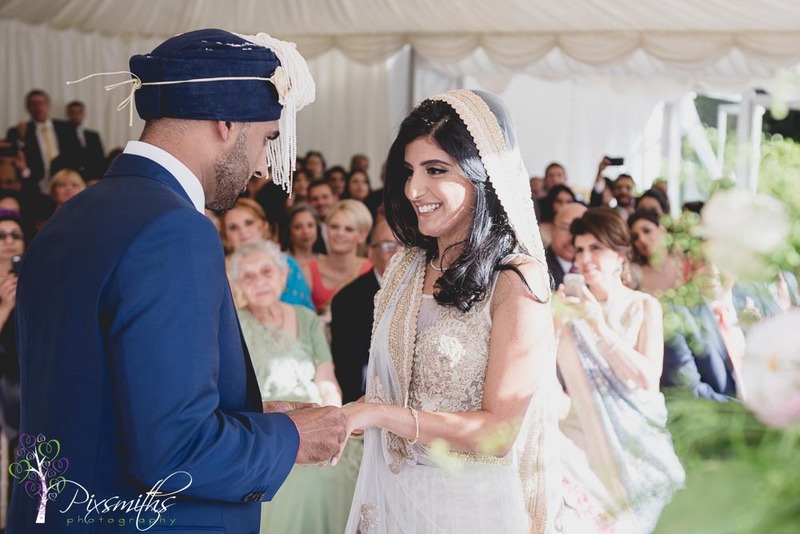 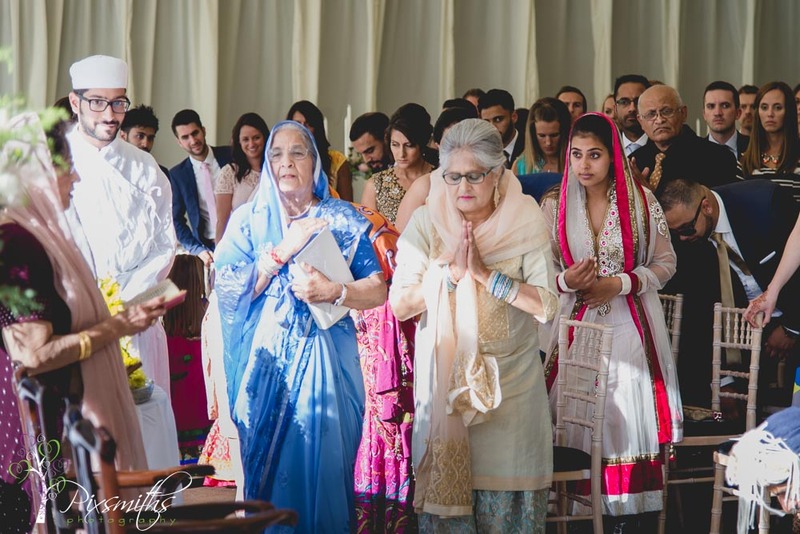 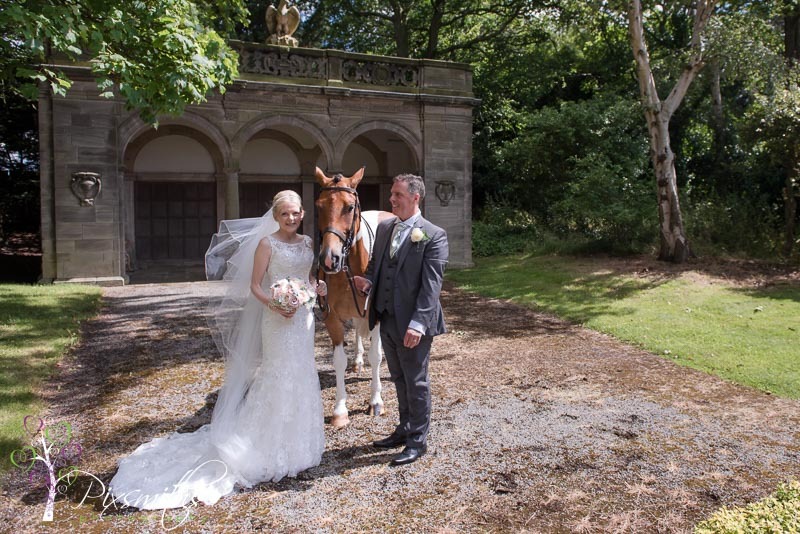 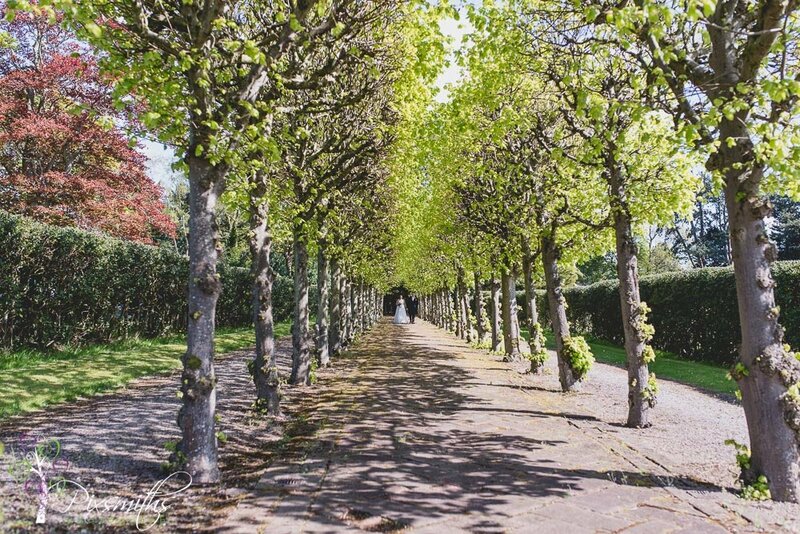 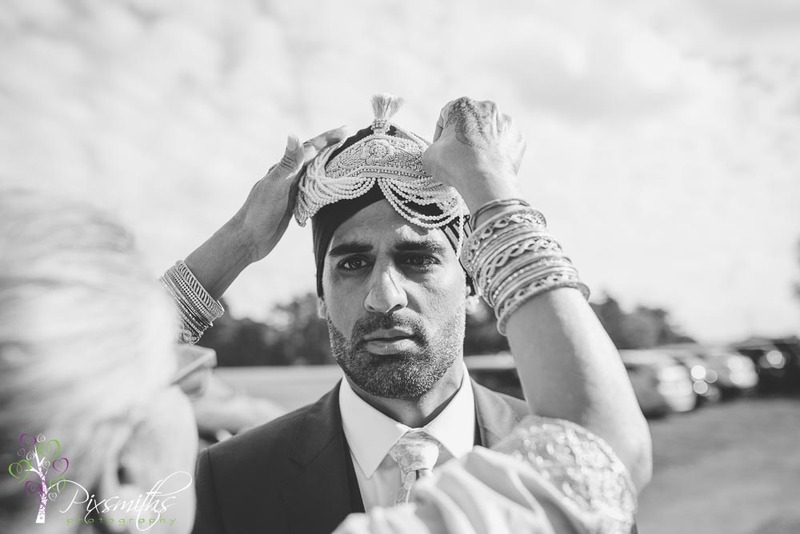 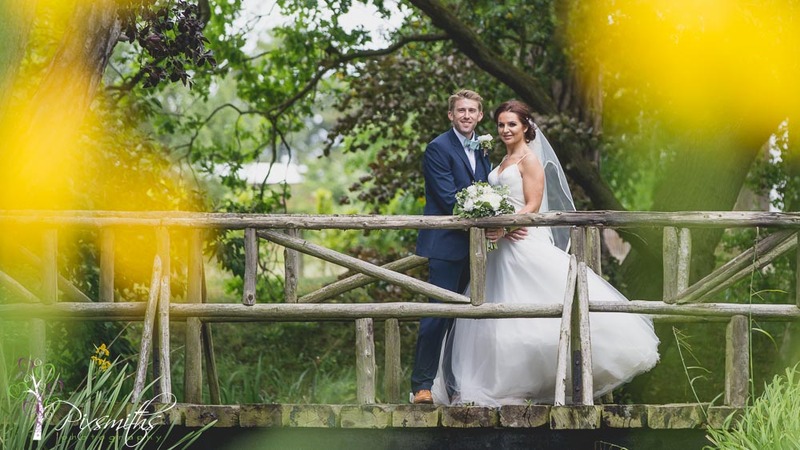 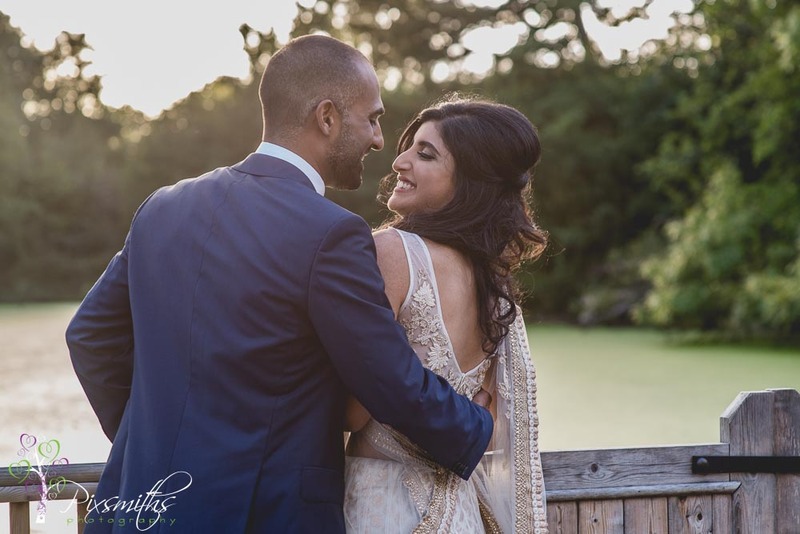 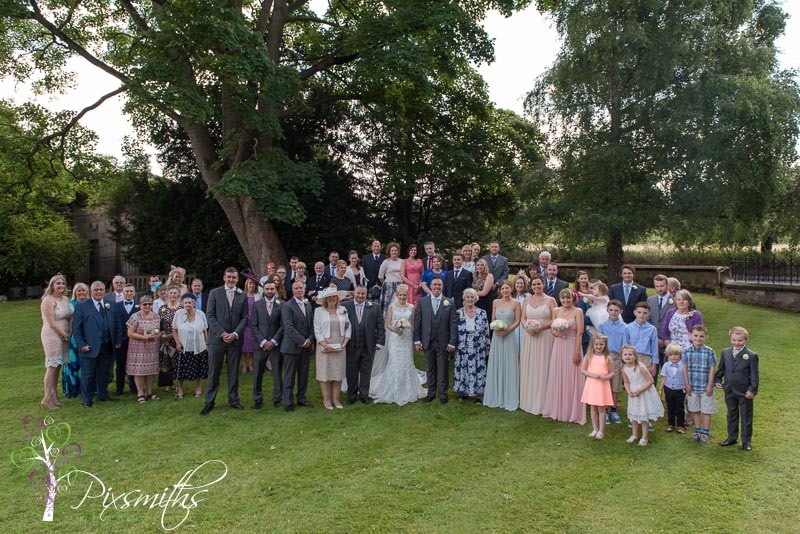 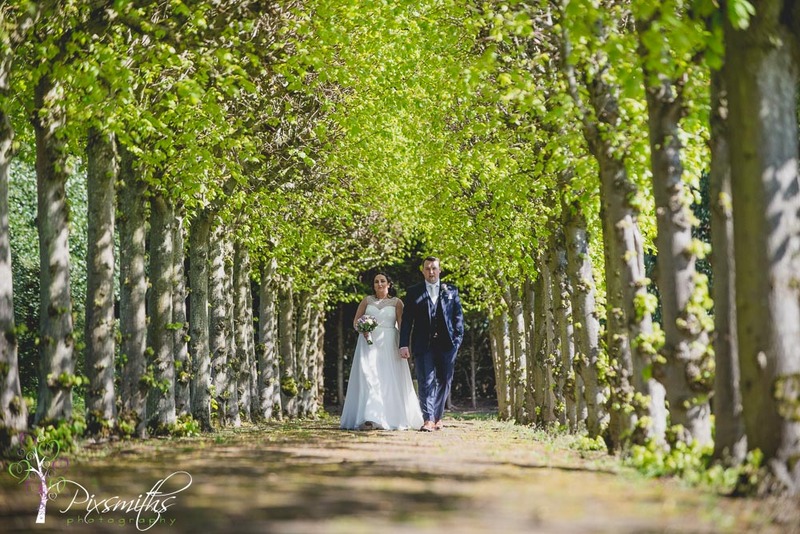 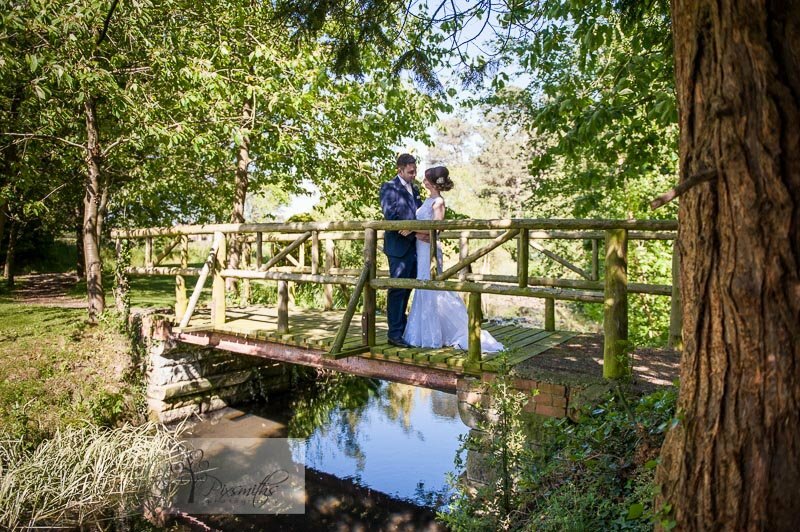 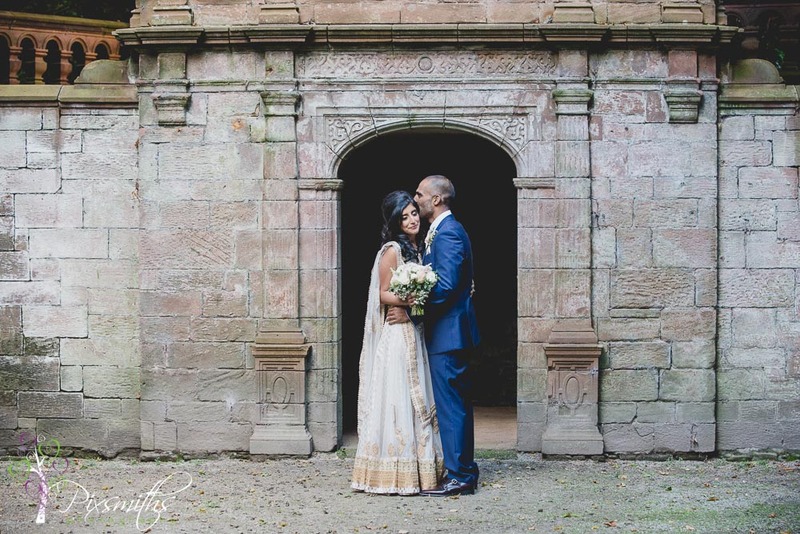 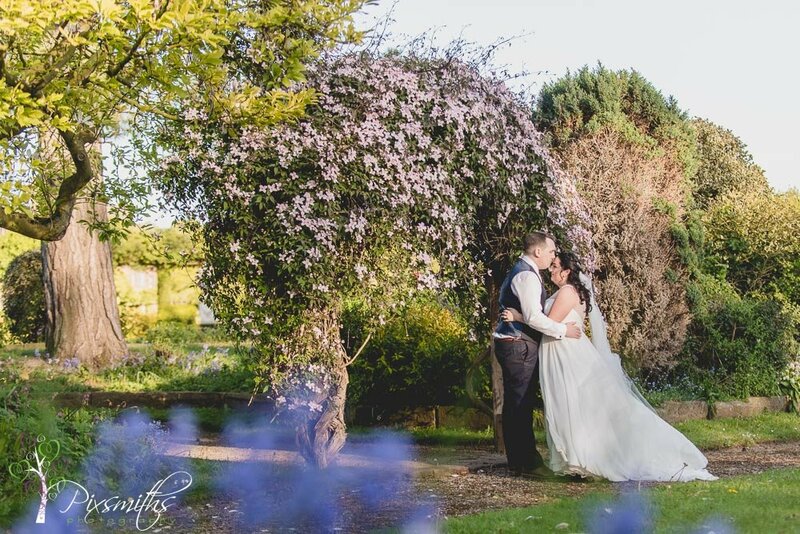 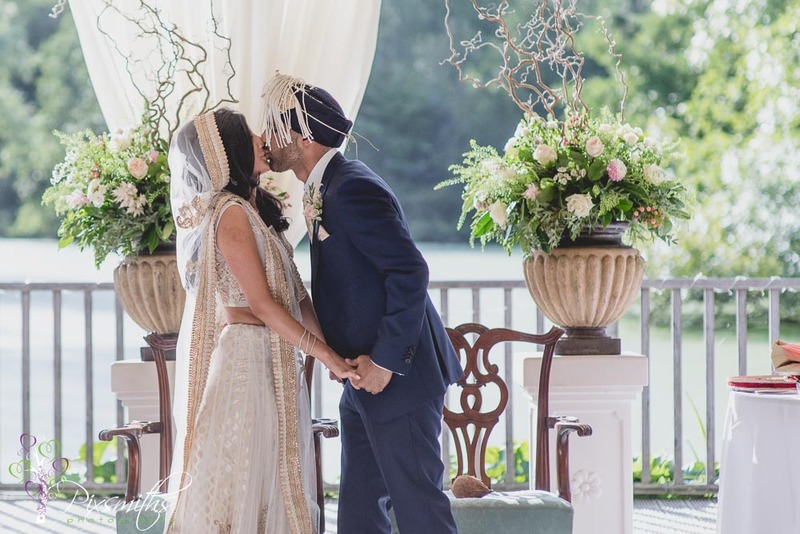 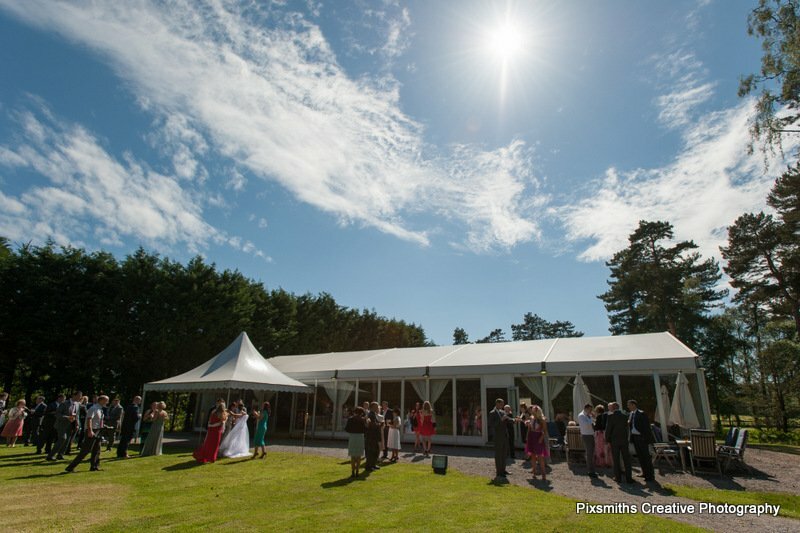 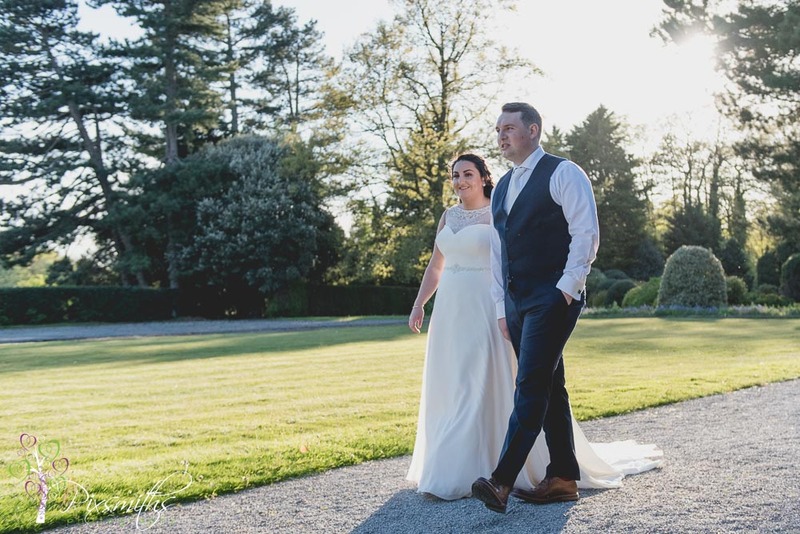 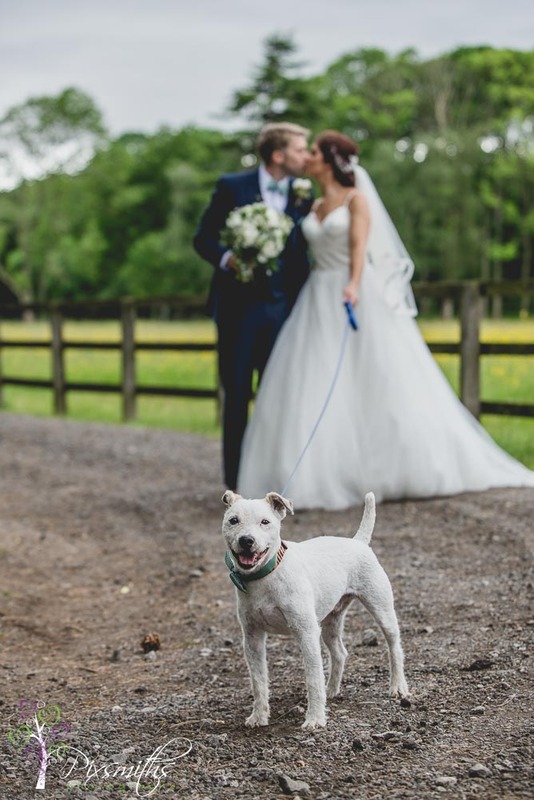 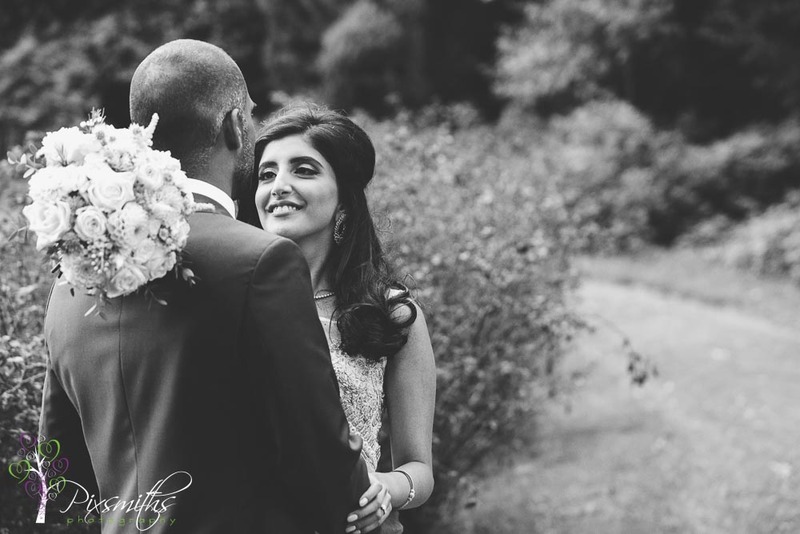 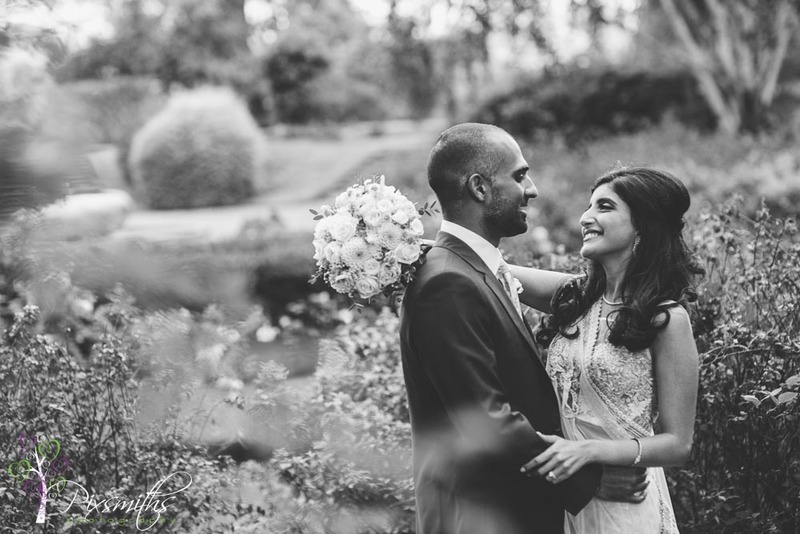 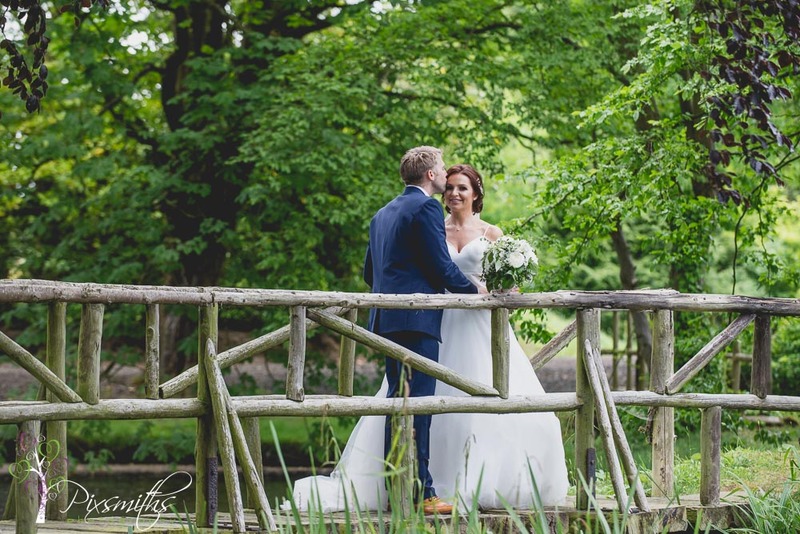 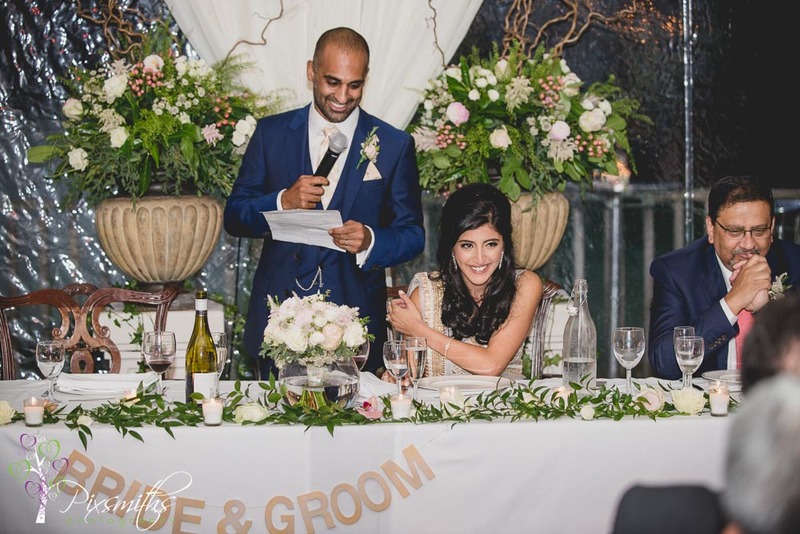 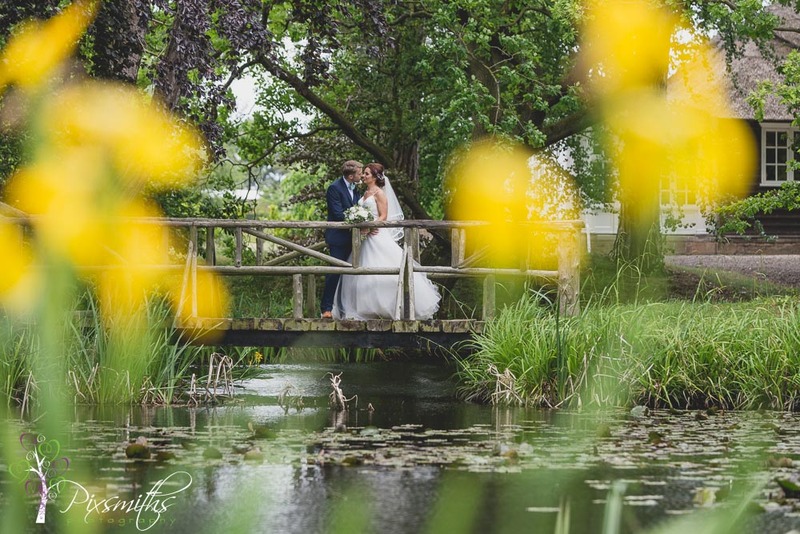 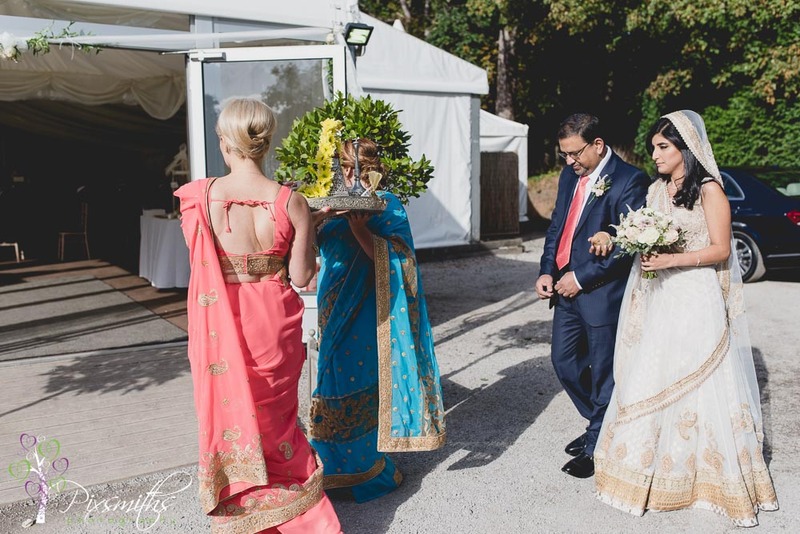 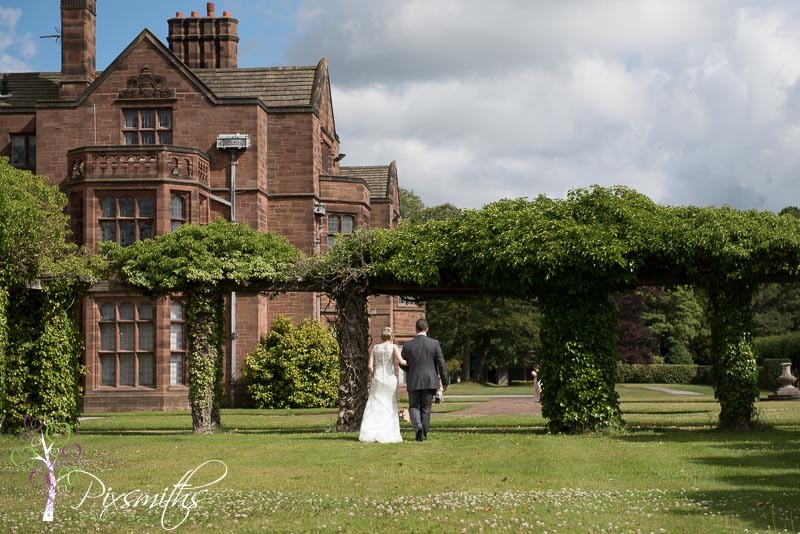 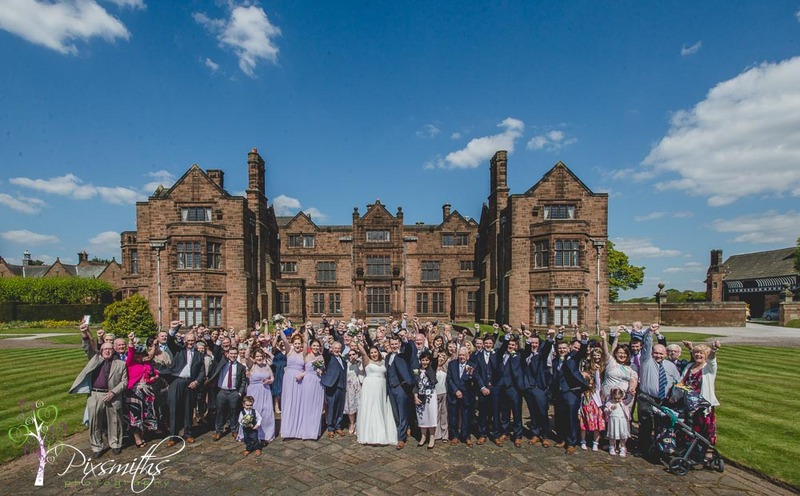 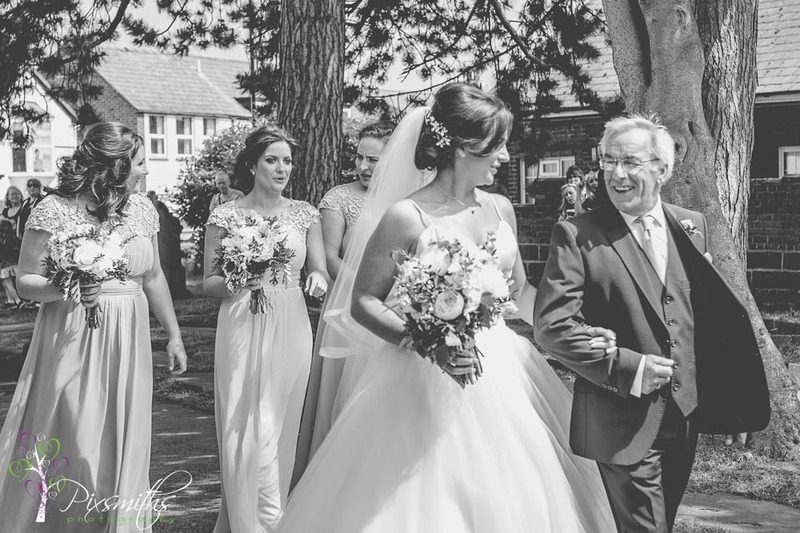 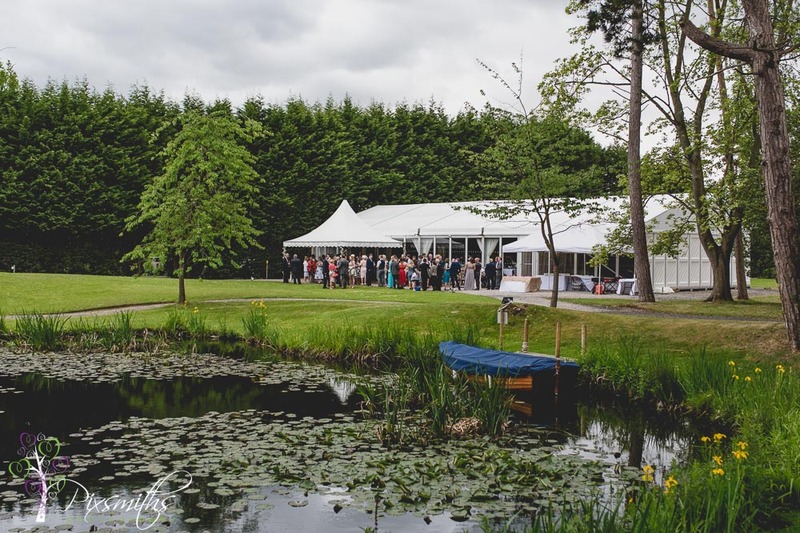 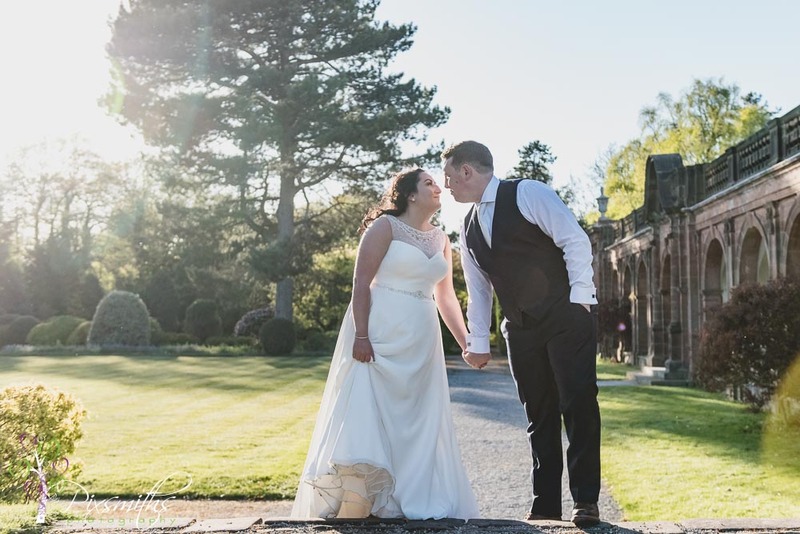 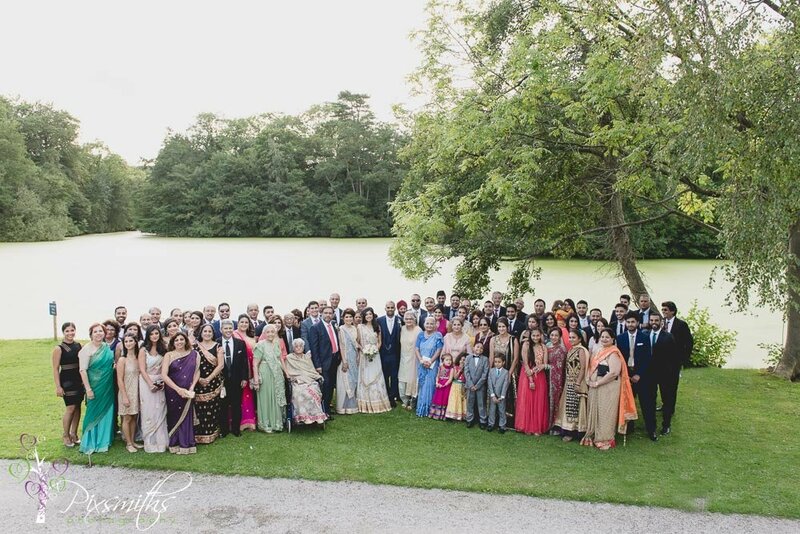 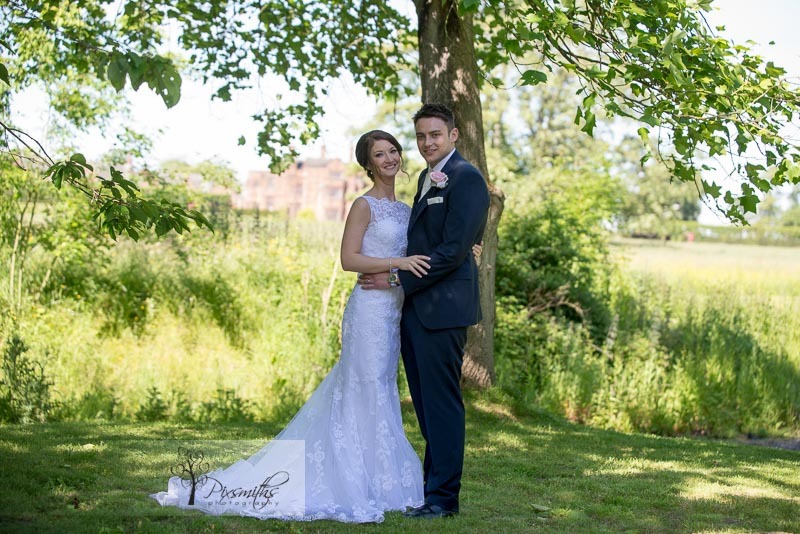 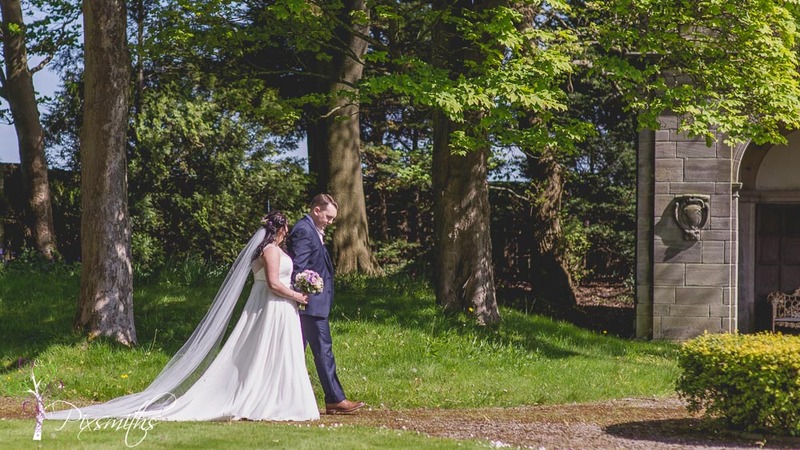 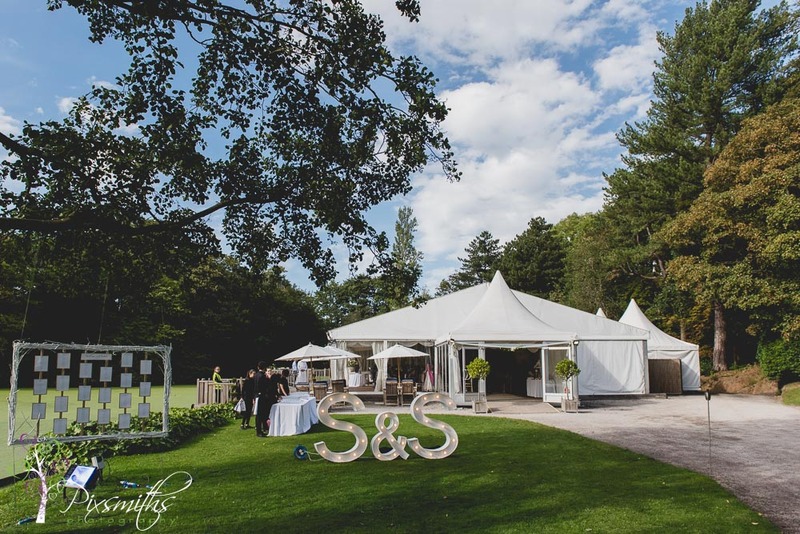 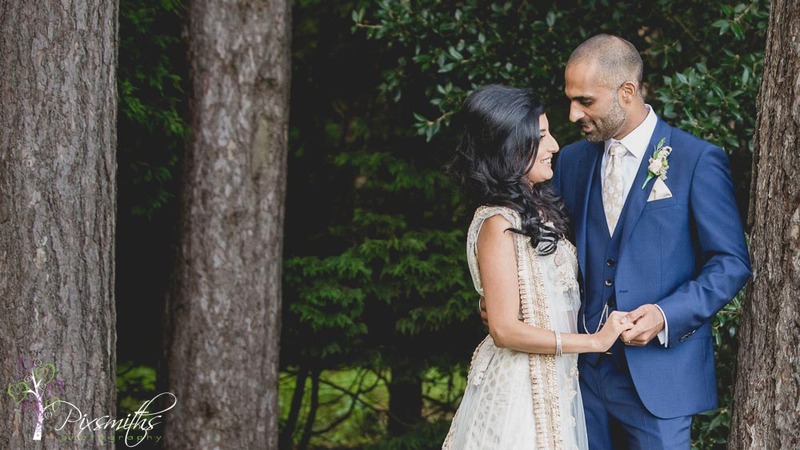 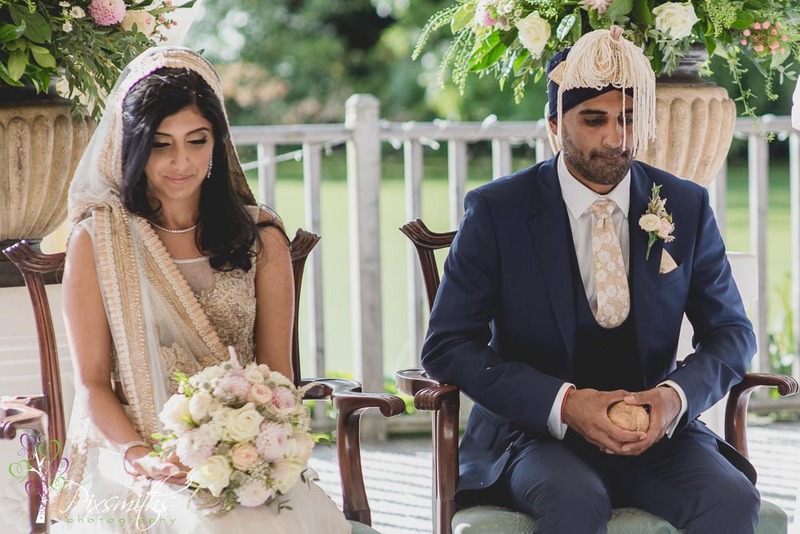 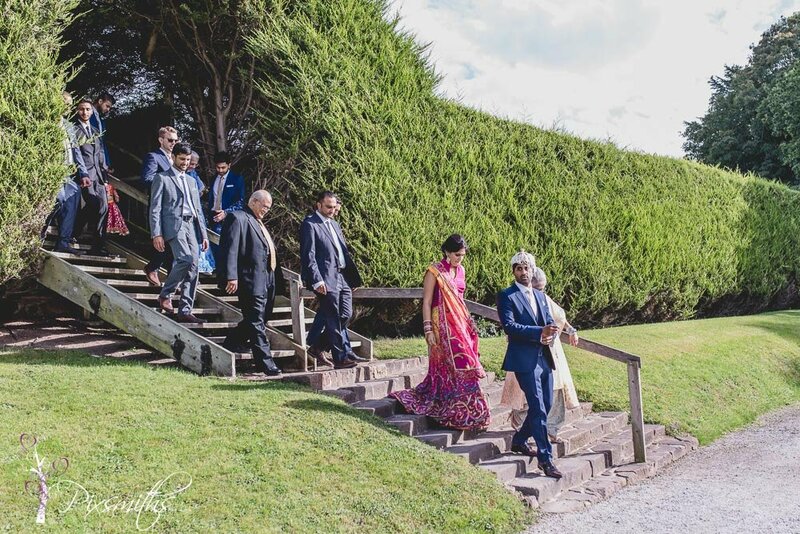 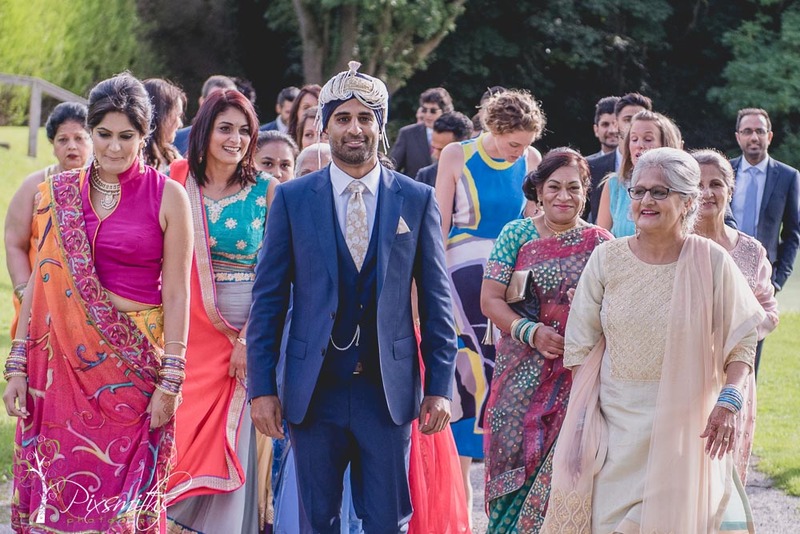 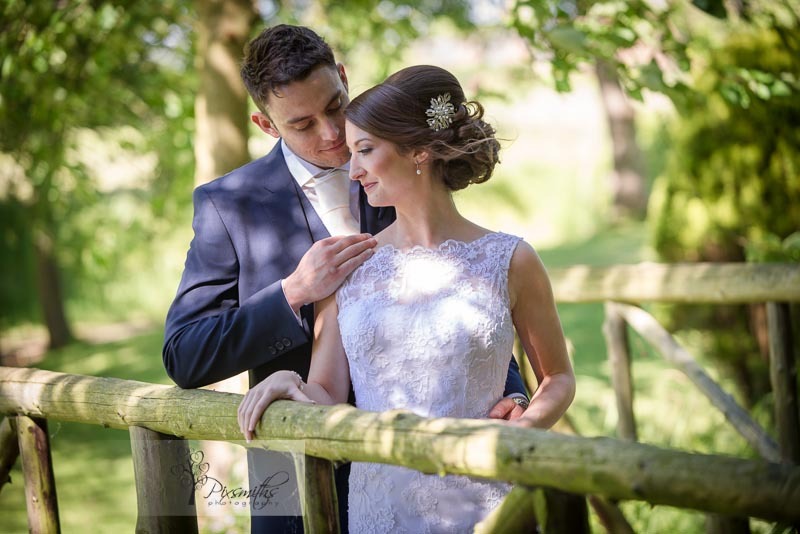 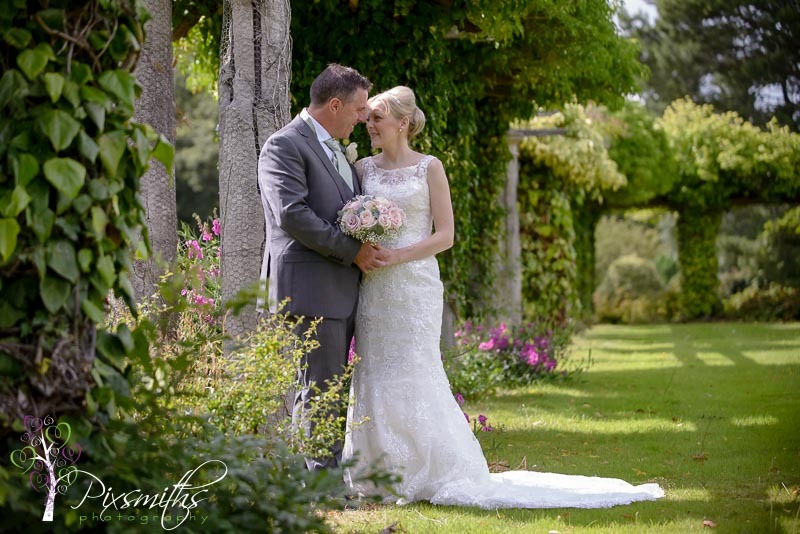 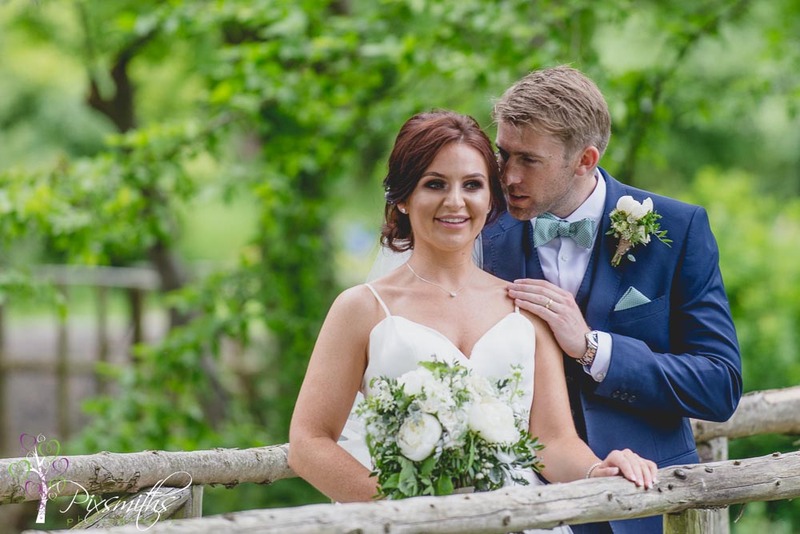 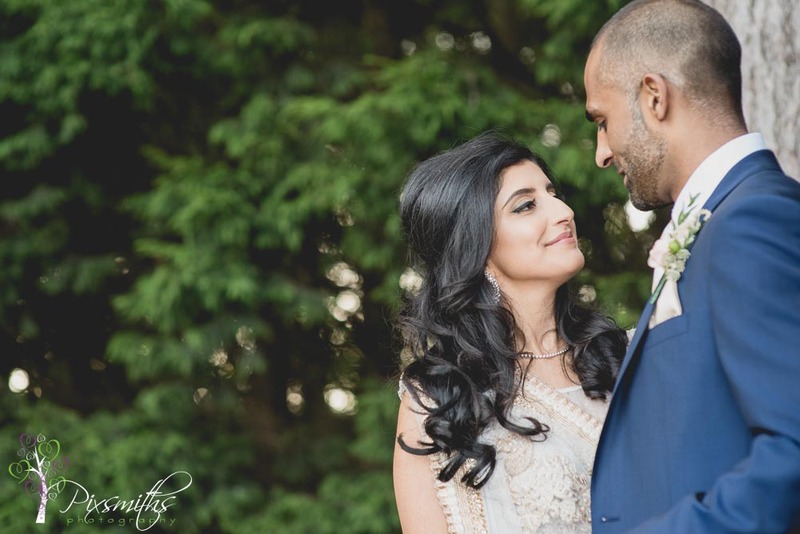 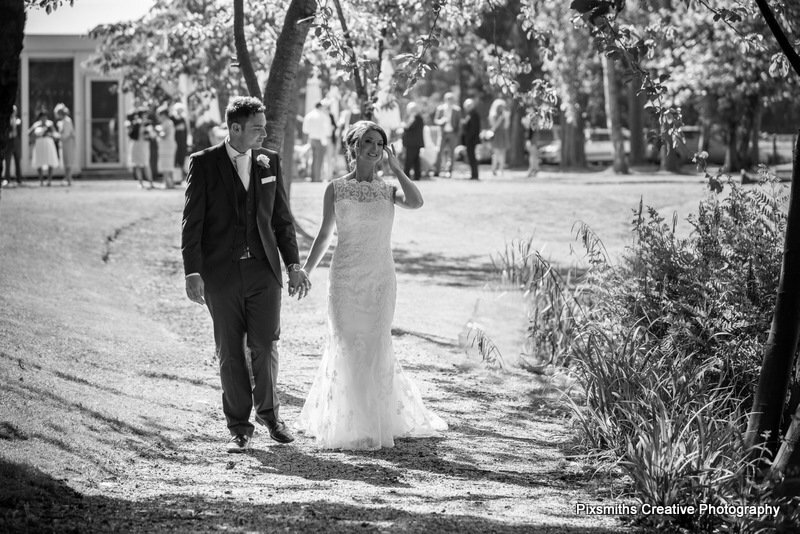 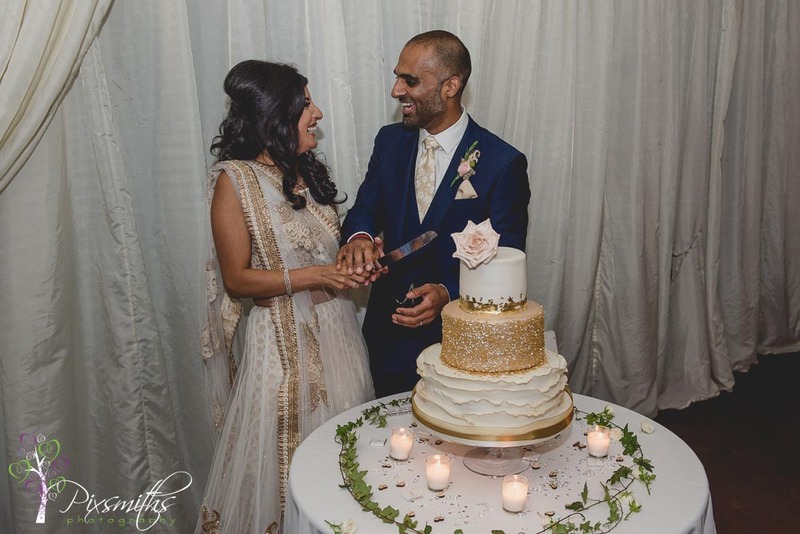 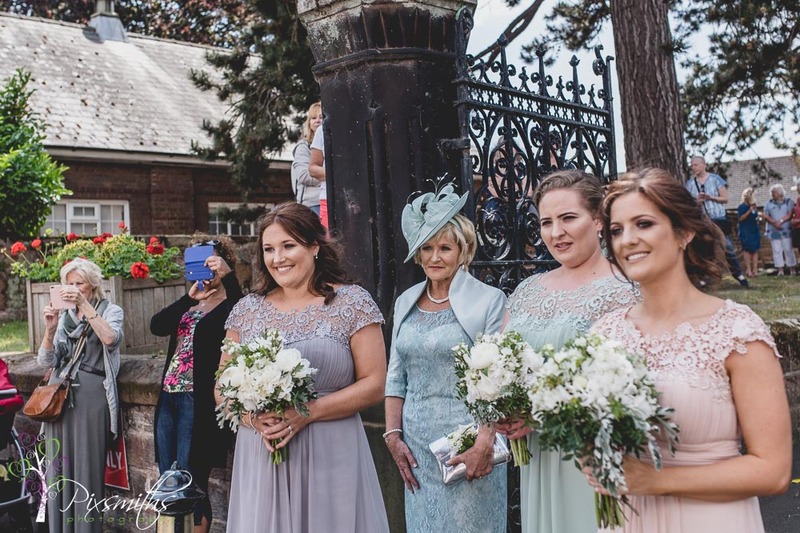 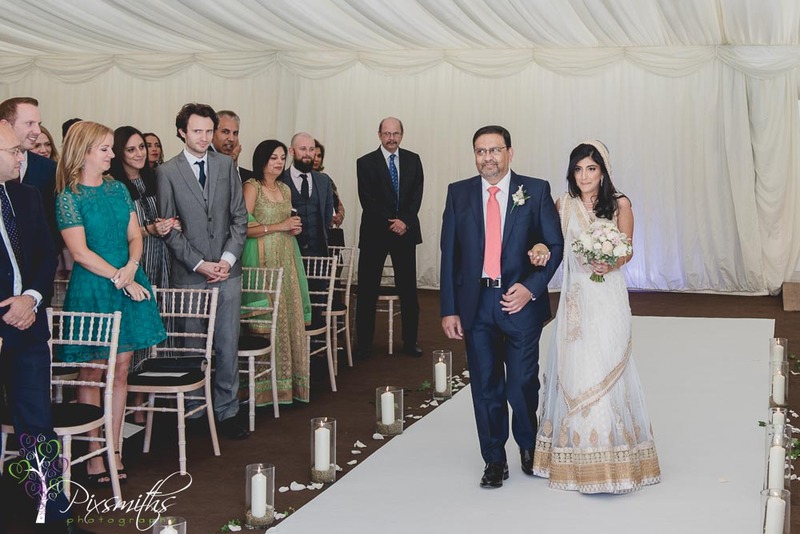 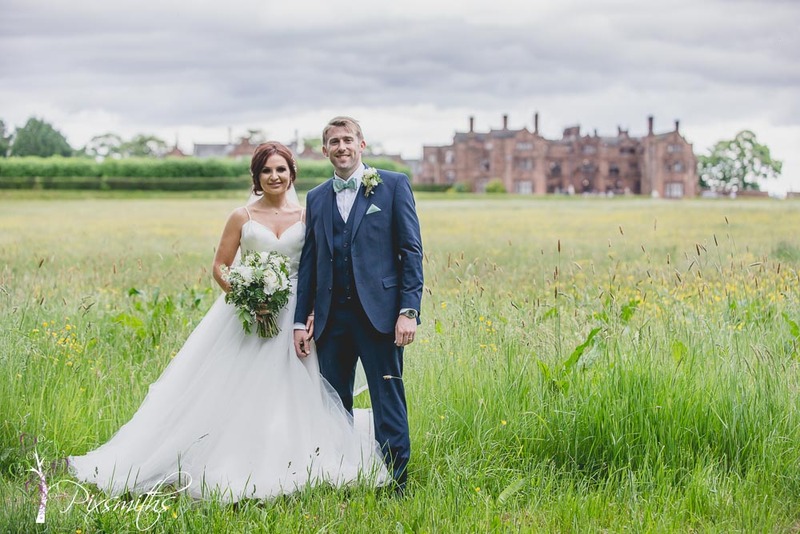 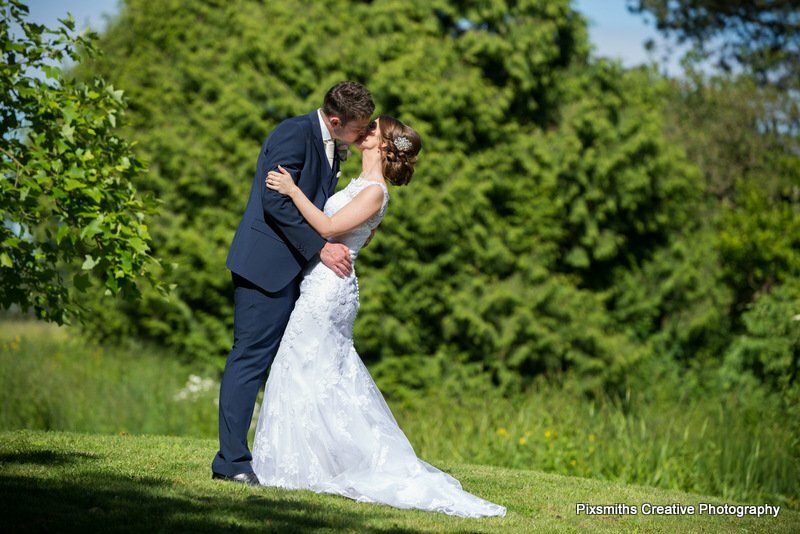 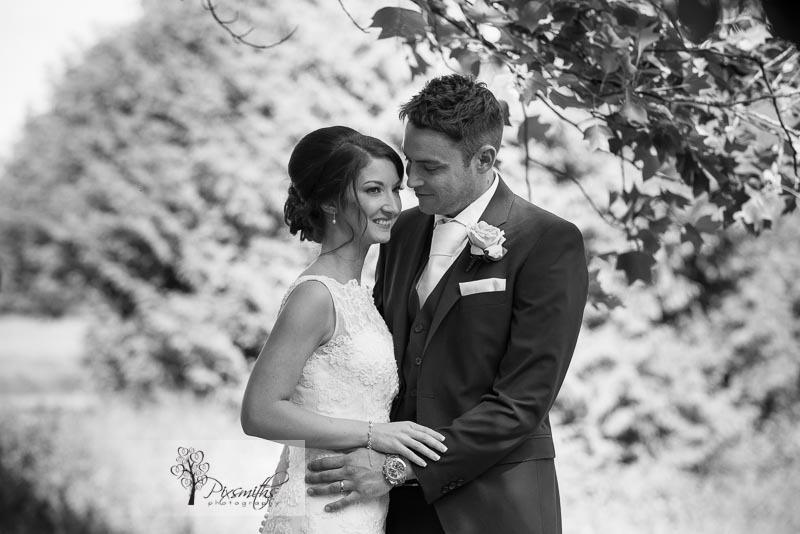 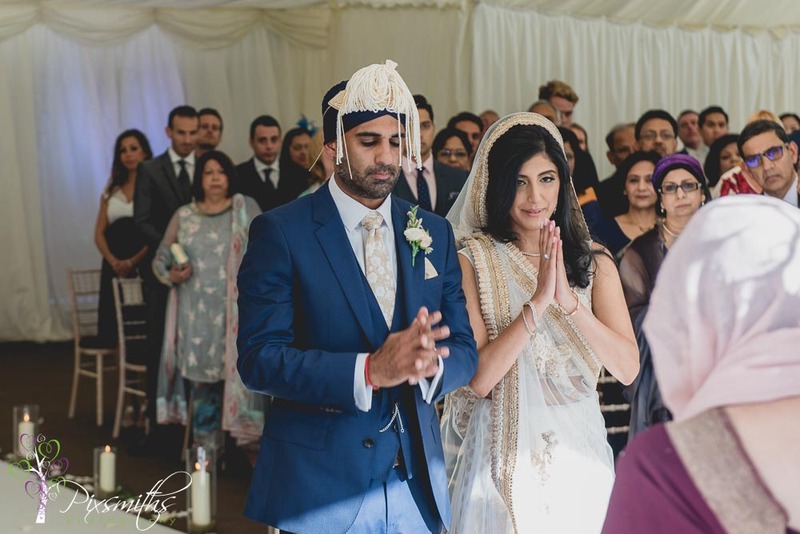 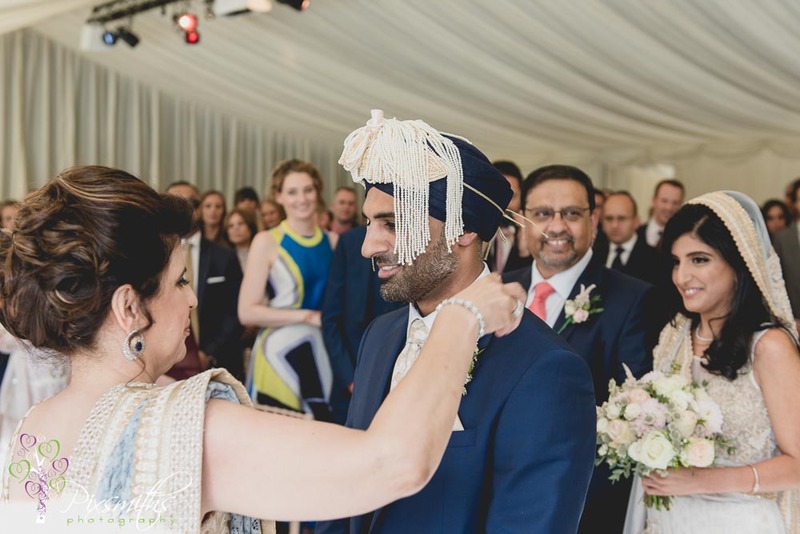 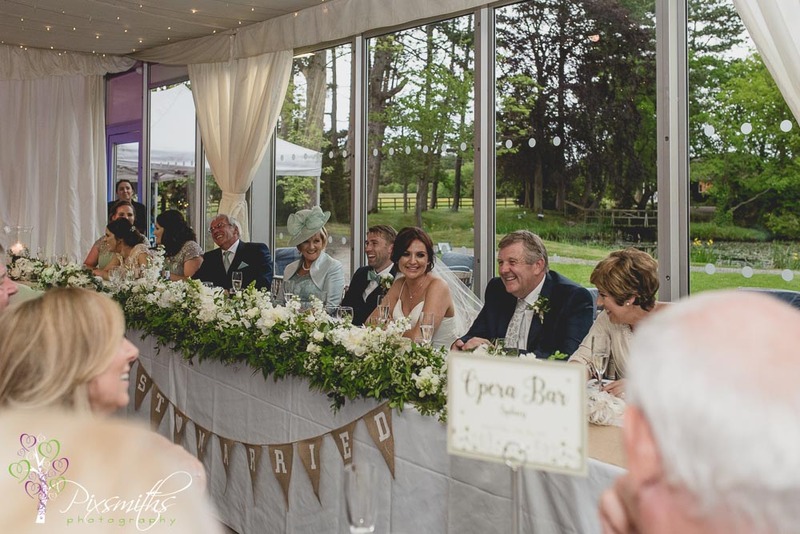 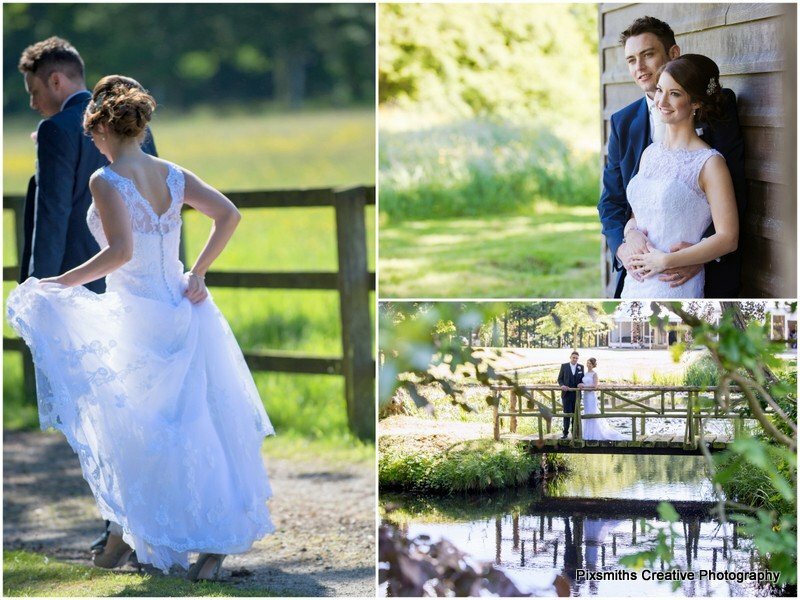 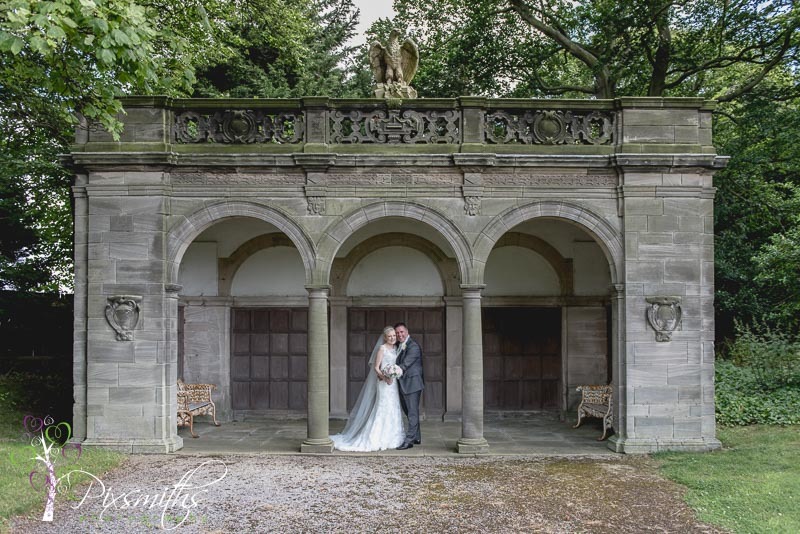 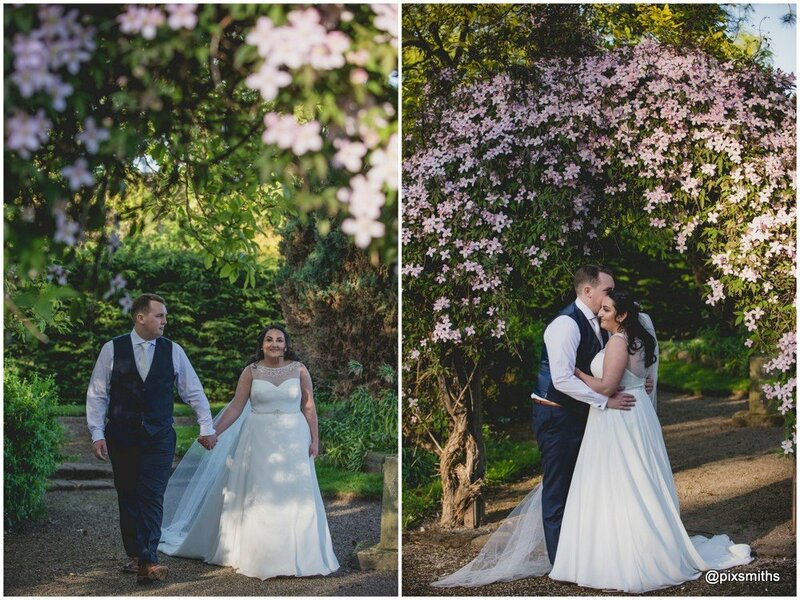 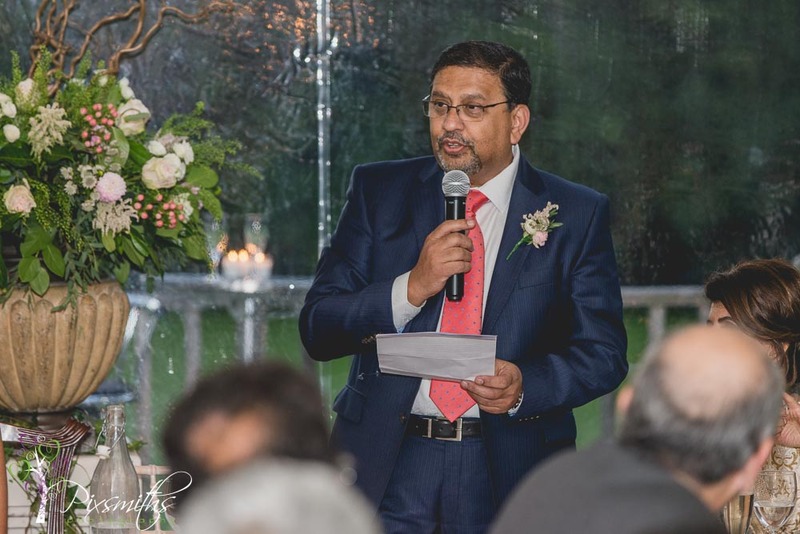 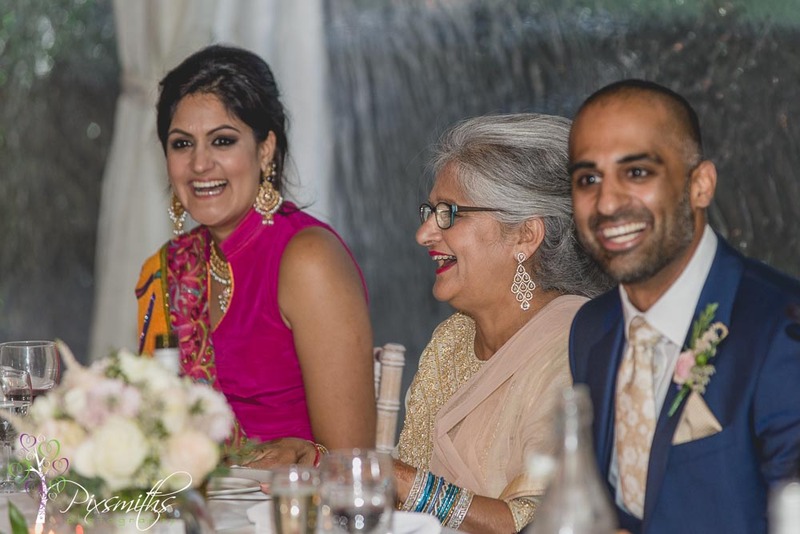 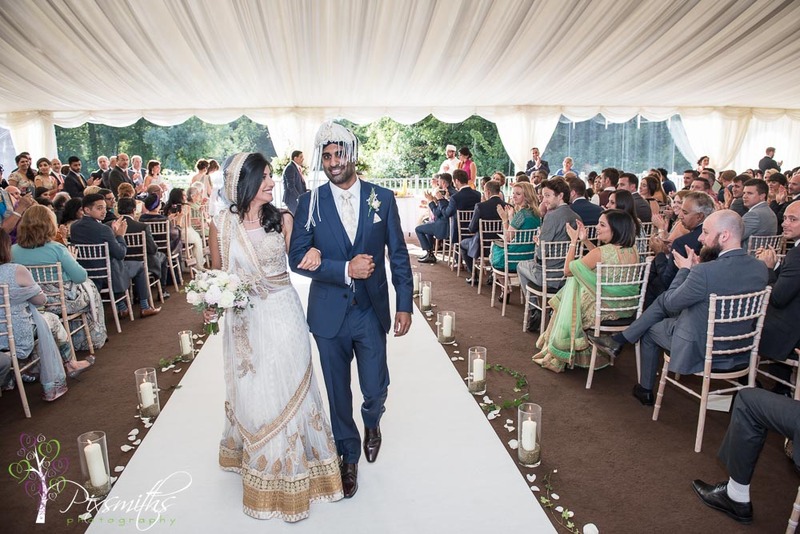 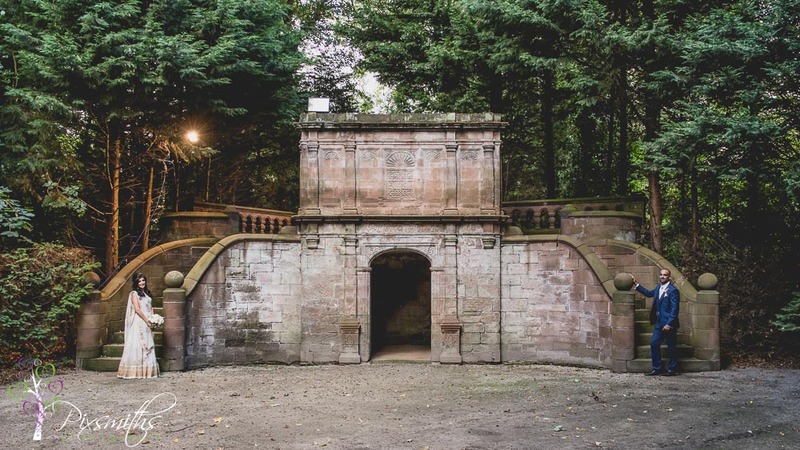 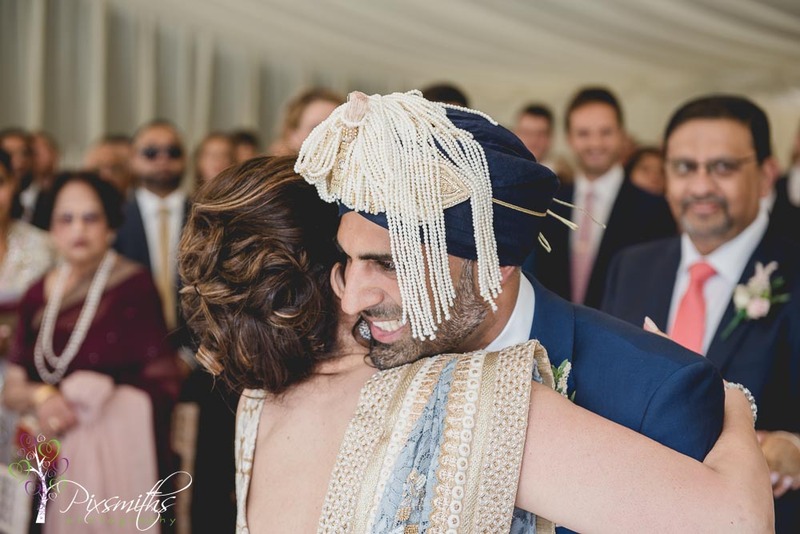 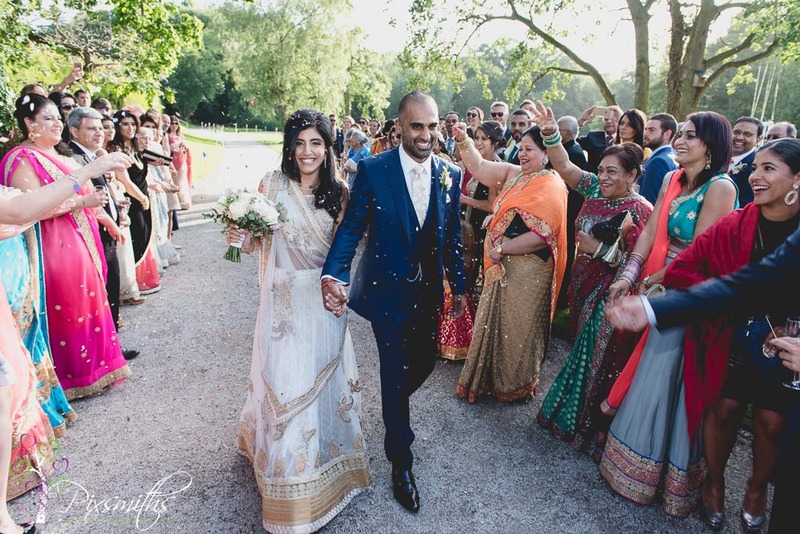 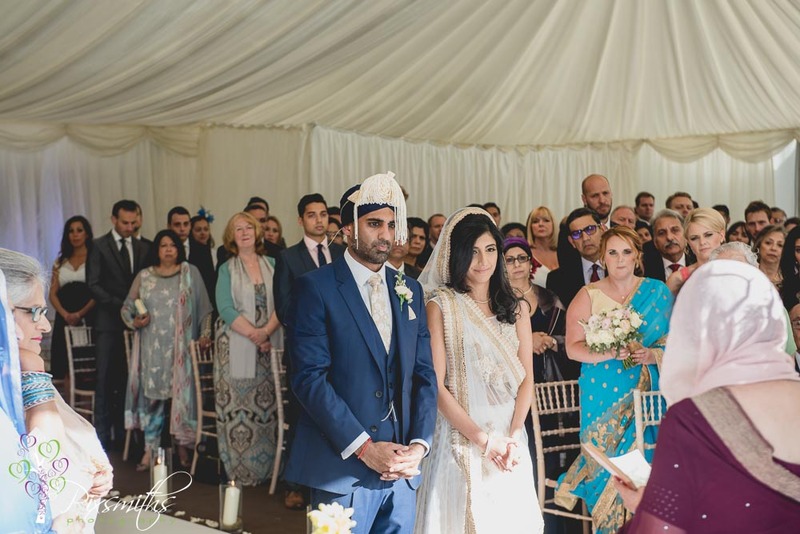 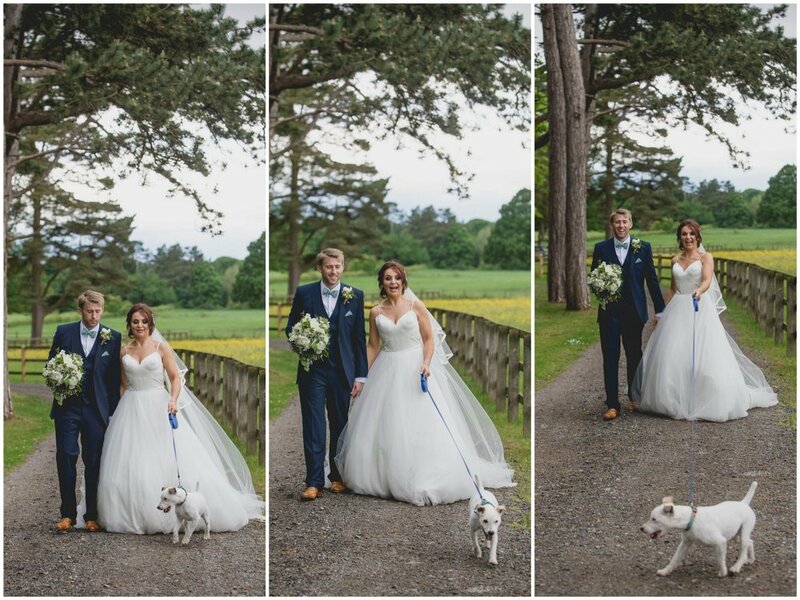 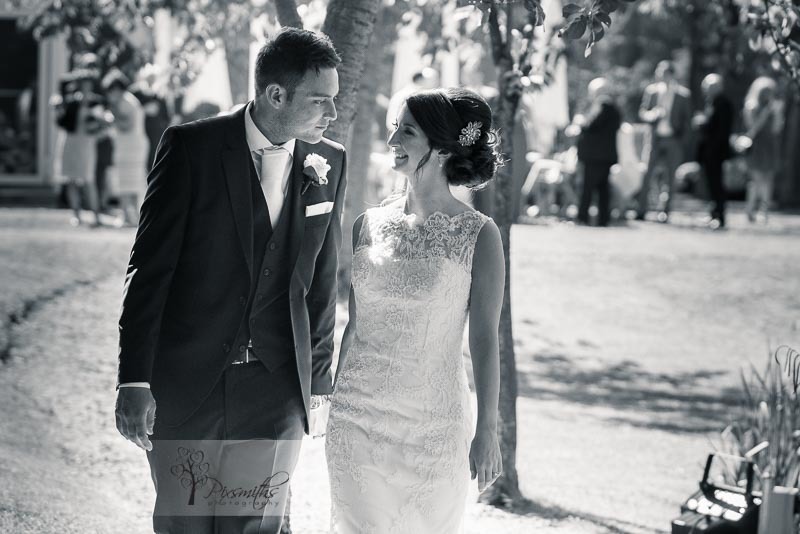 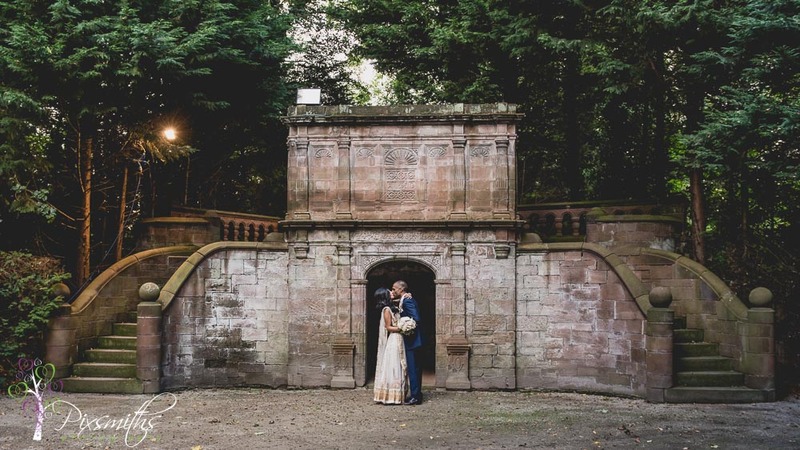 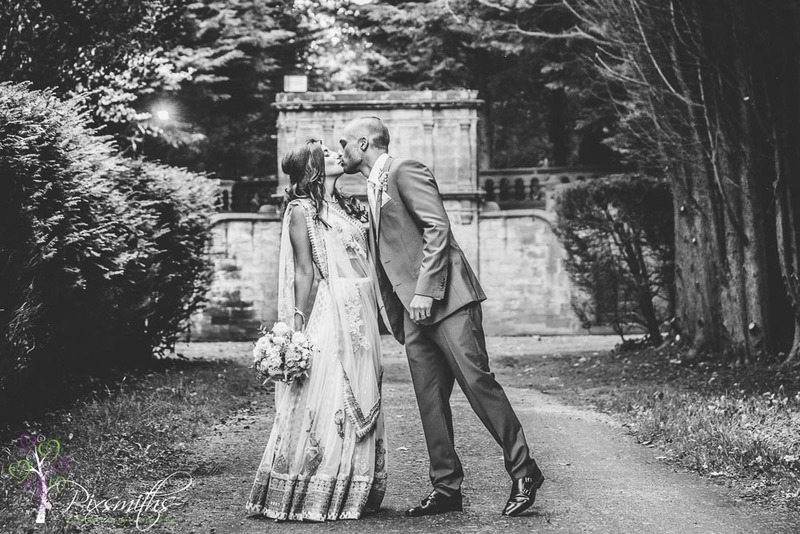 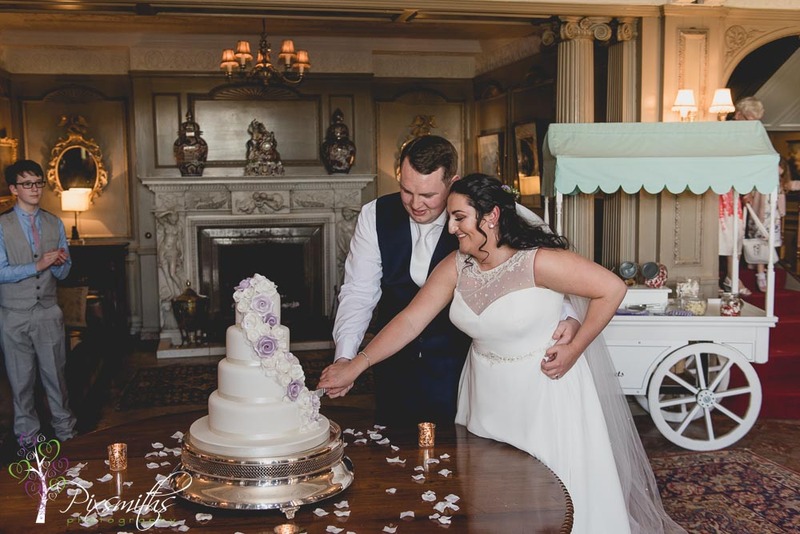 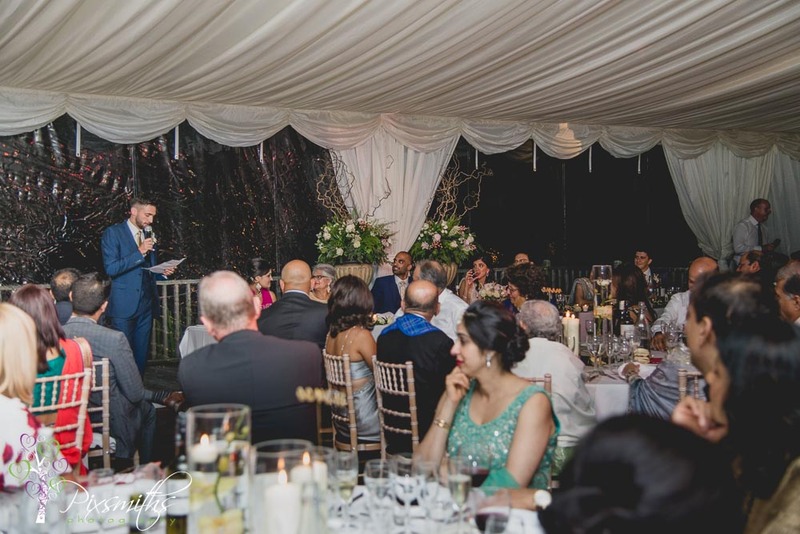 The grounds round here just lend themselves to beautiful images and we were blessed with sunny skies on this particular day and family and friends could enjoy the relaxed atmosphere and enjoy themeselves as they celebrated the wedding day. 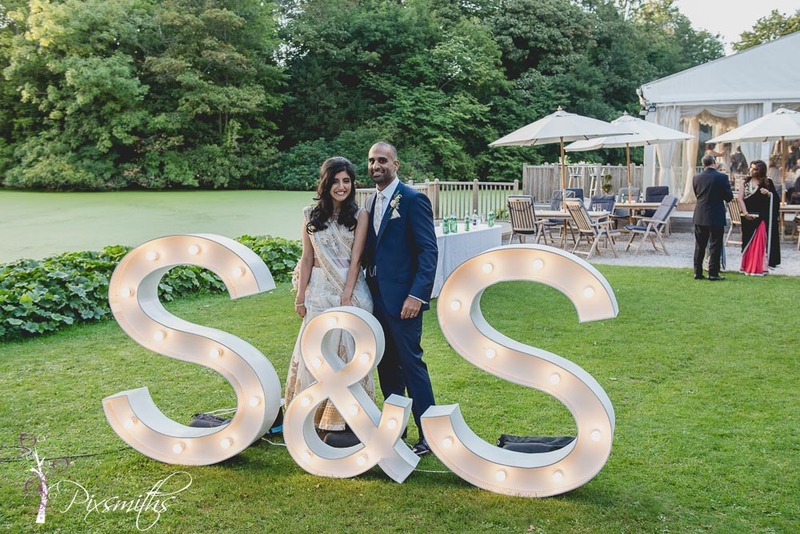 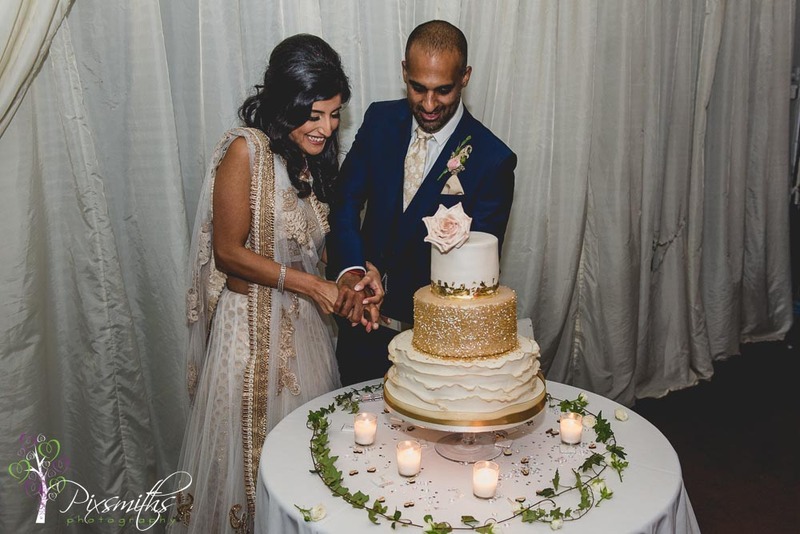 A gorgeous sweetheart table for the two of them at the reception – what a great idea! 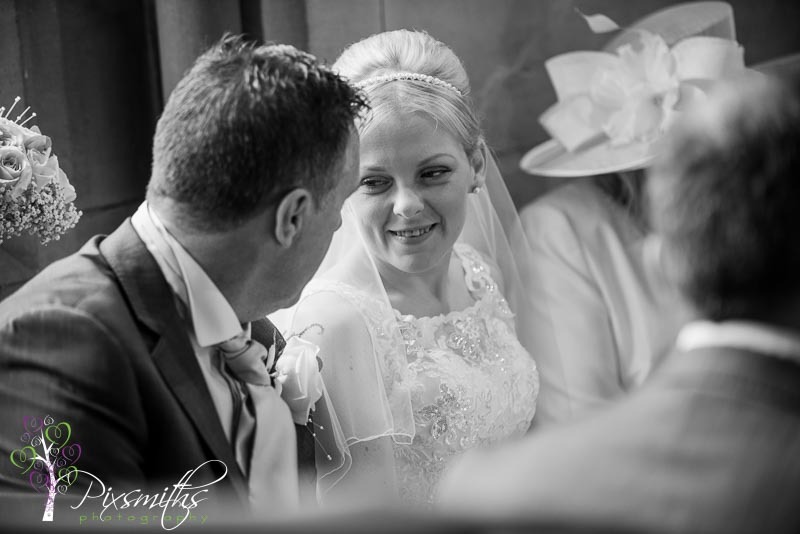 Many congratulations Jill and Anthony thank you for choosing us and we wish you much happiness in the future x. 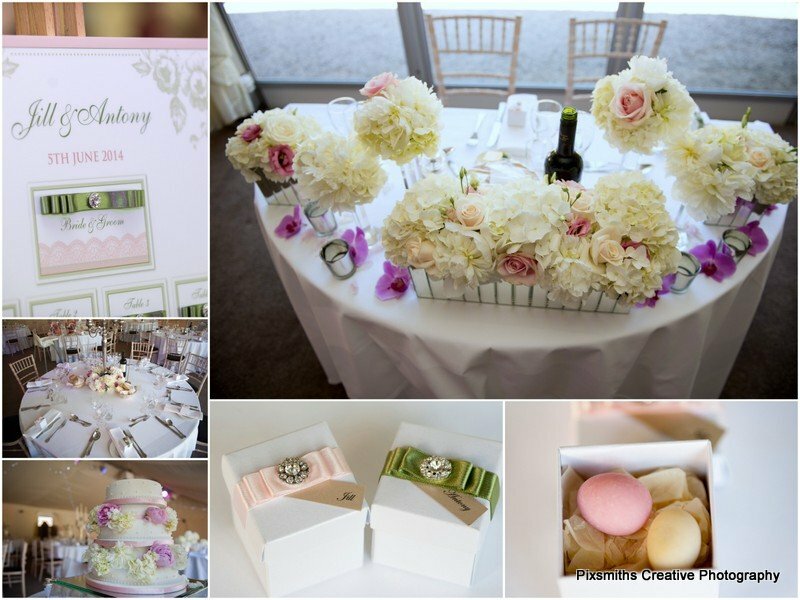 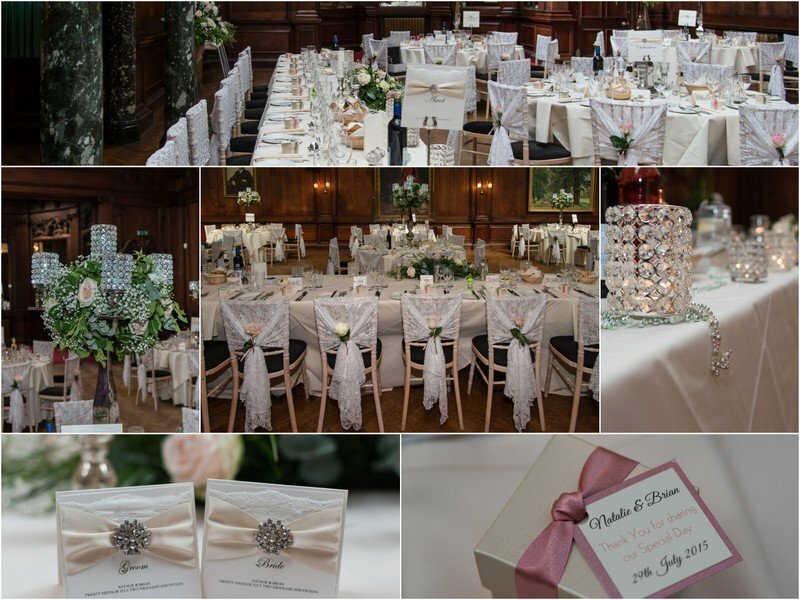 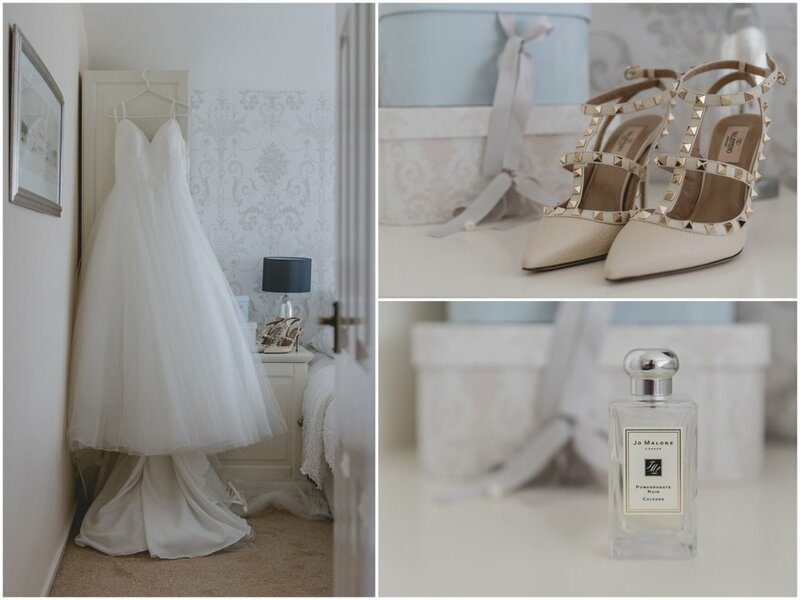 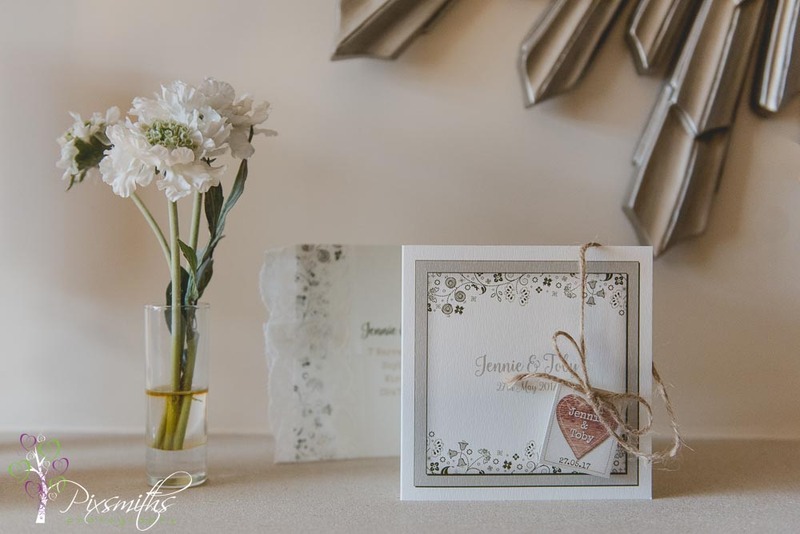 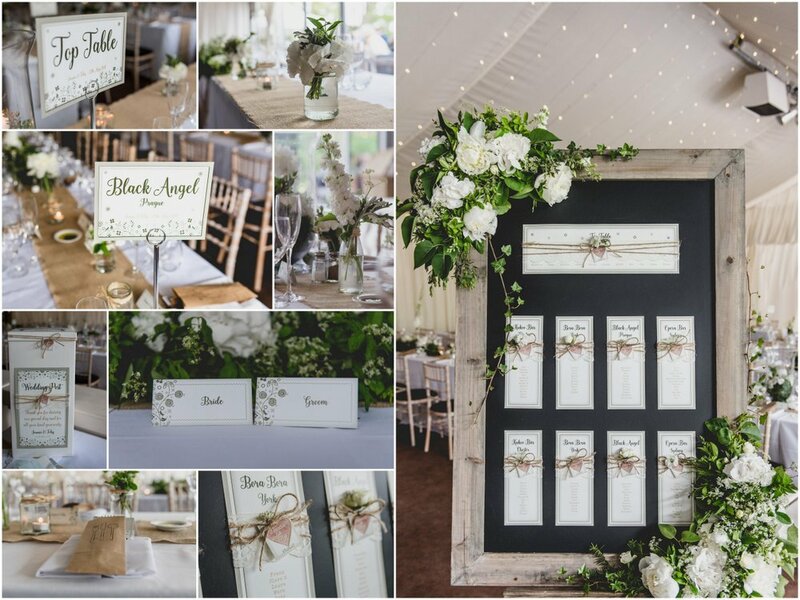 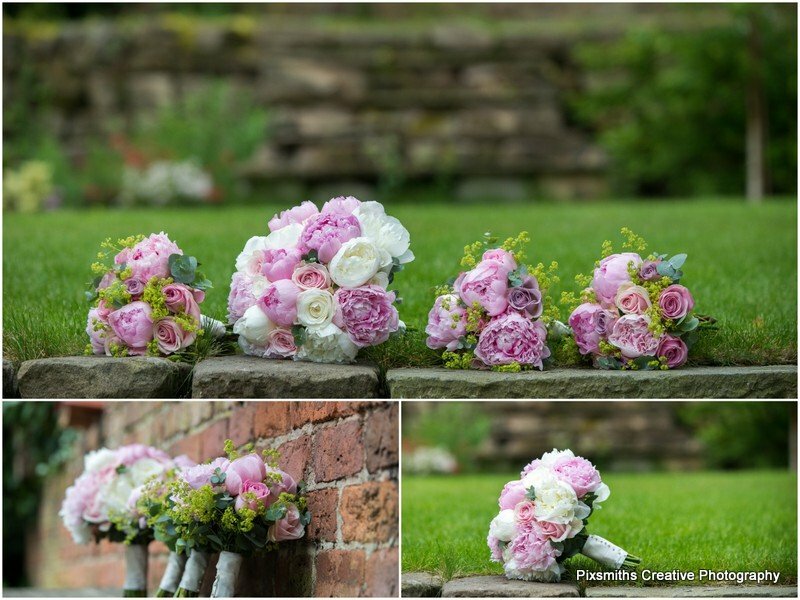 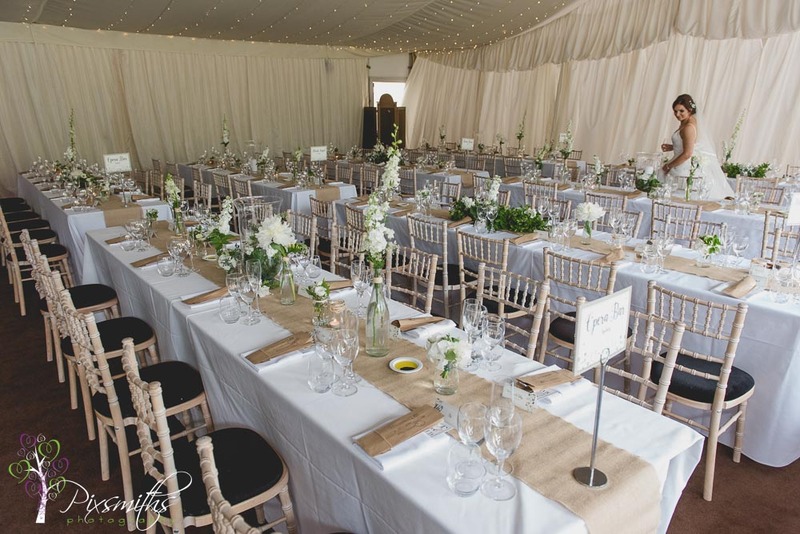 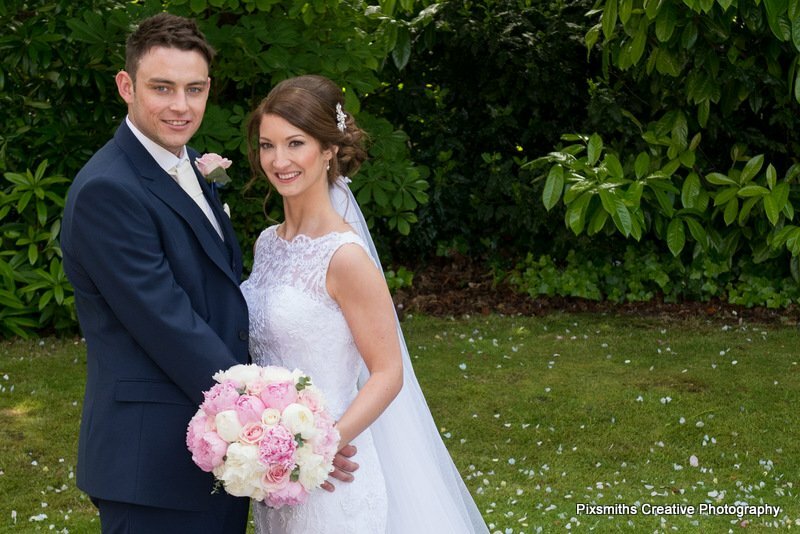 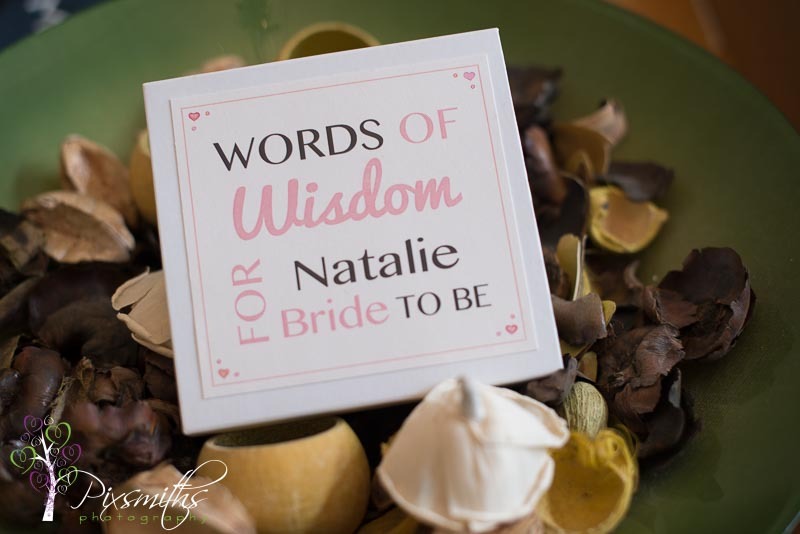 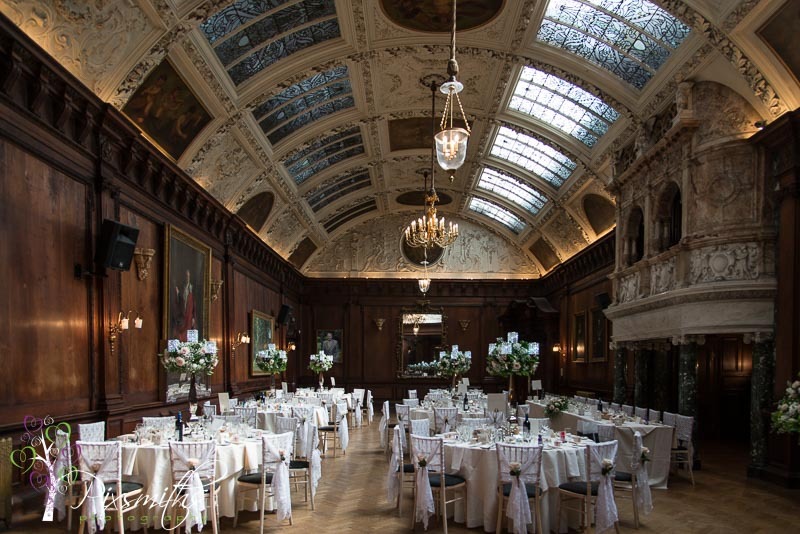 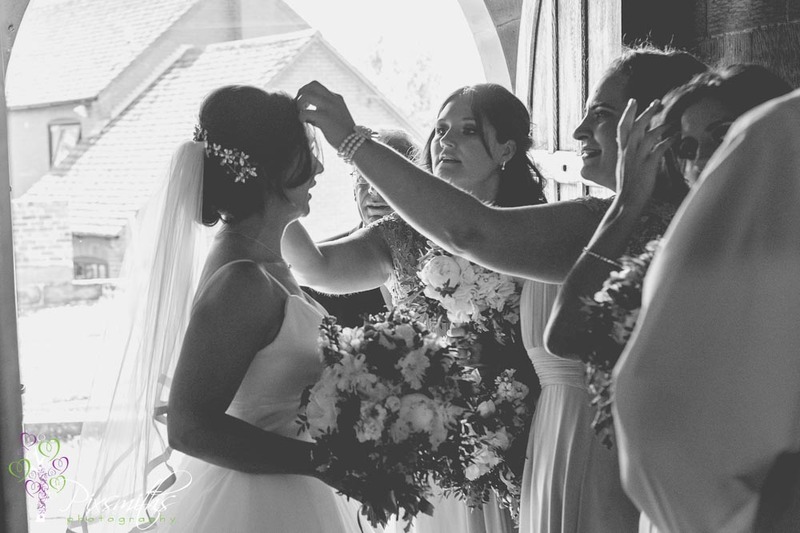 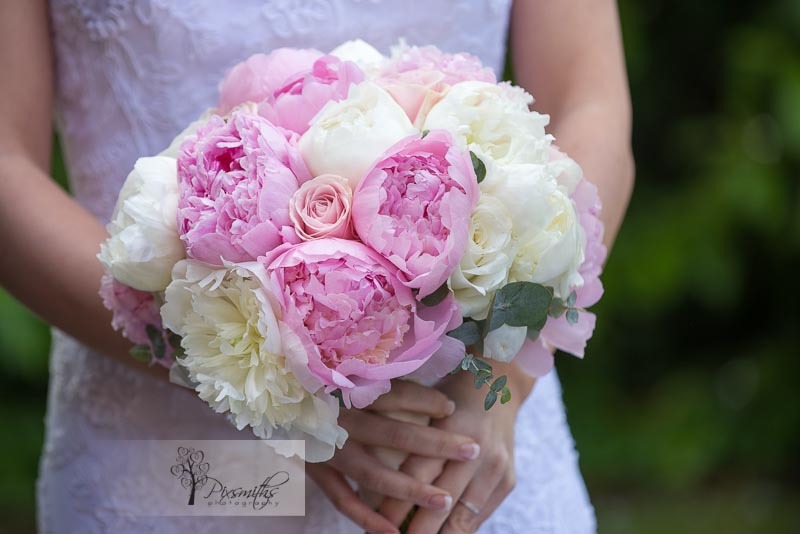 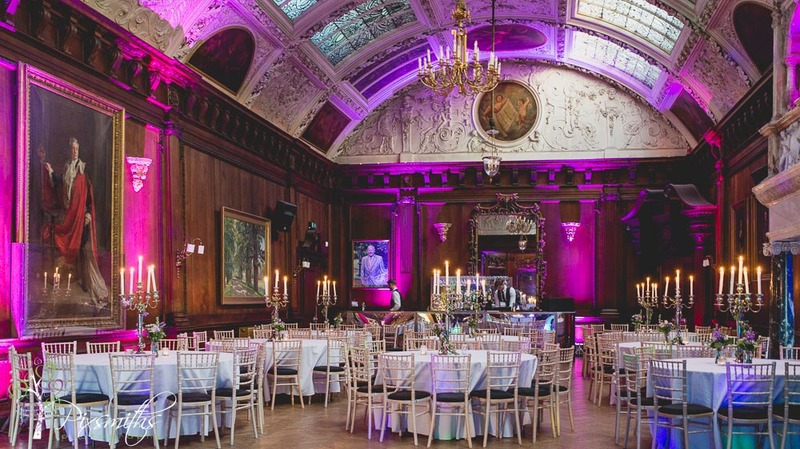 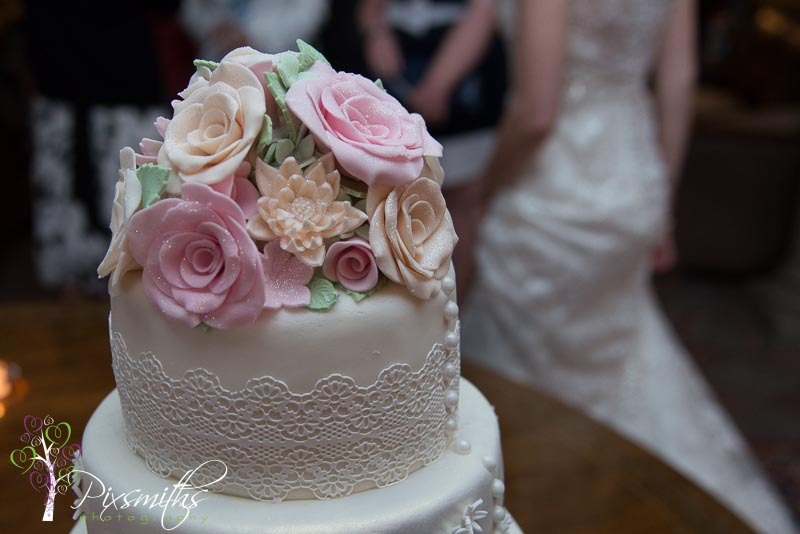 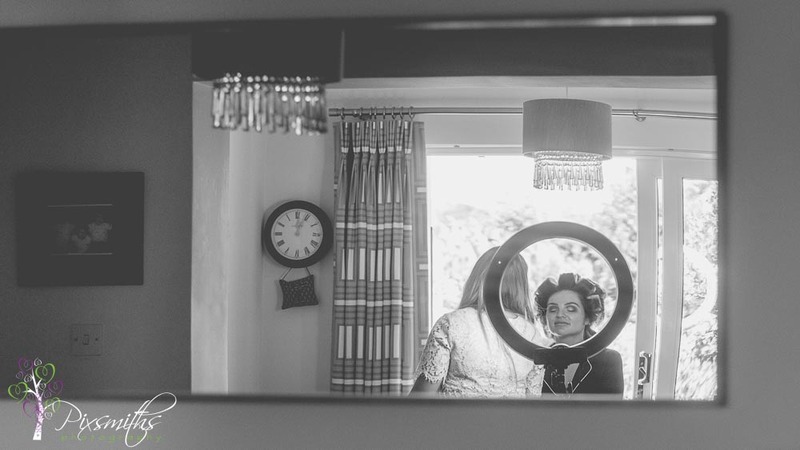 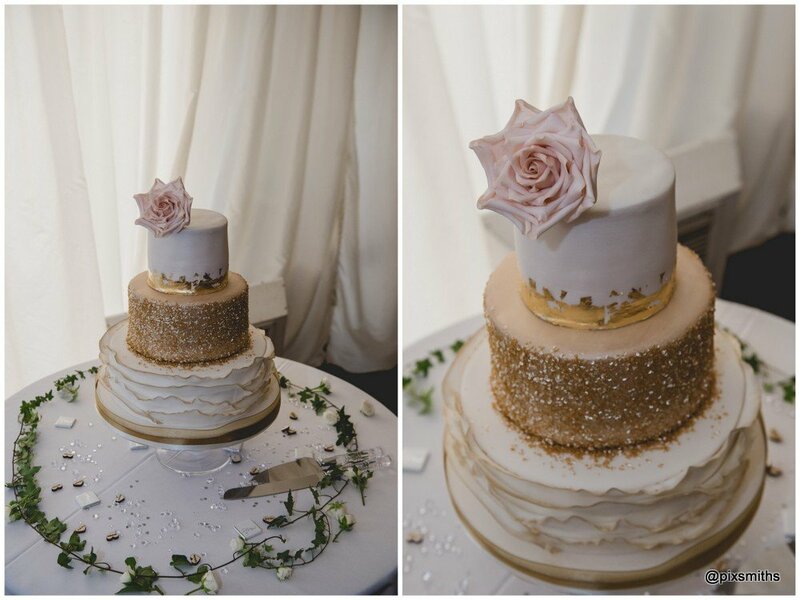 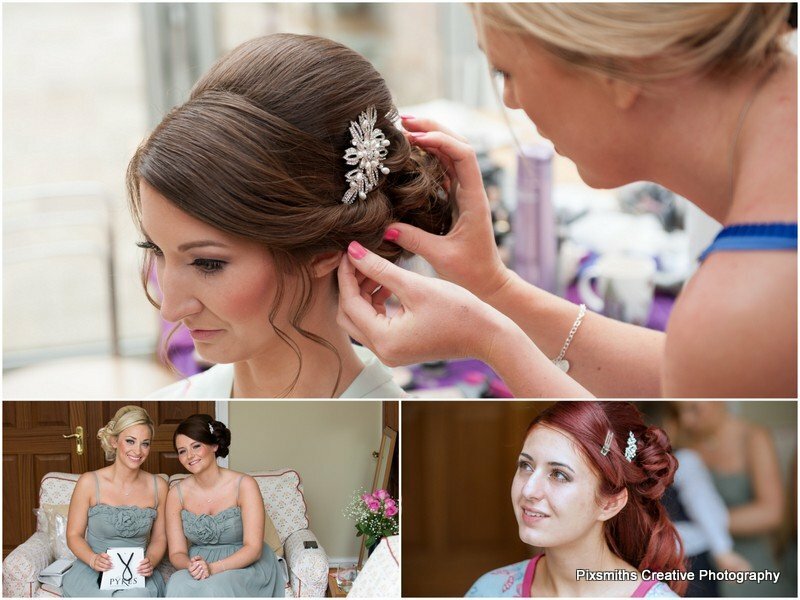 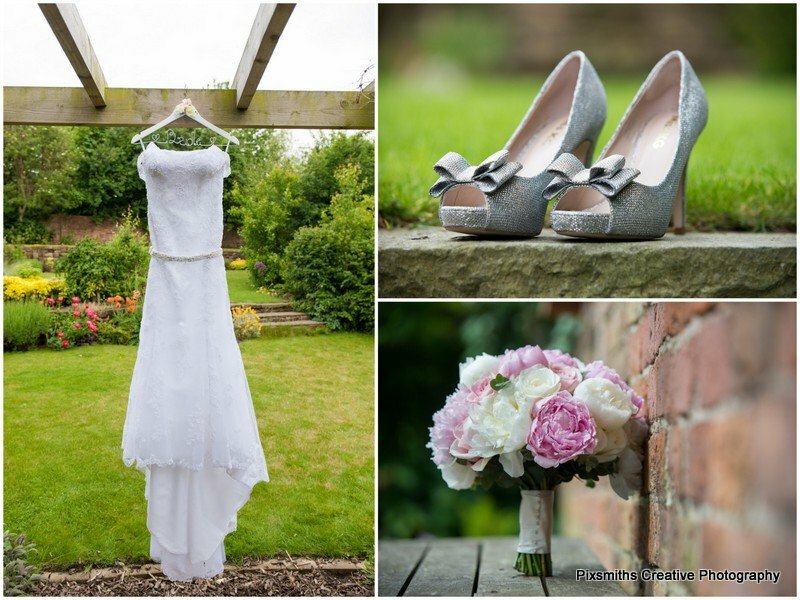 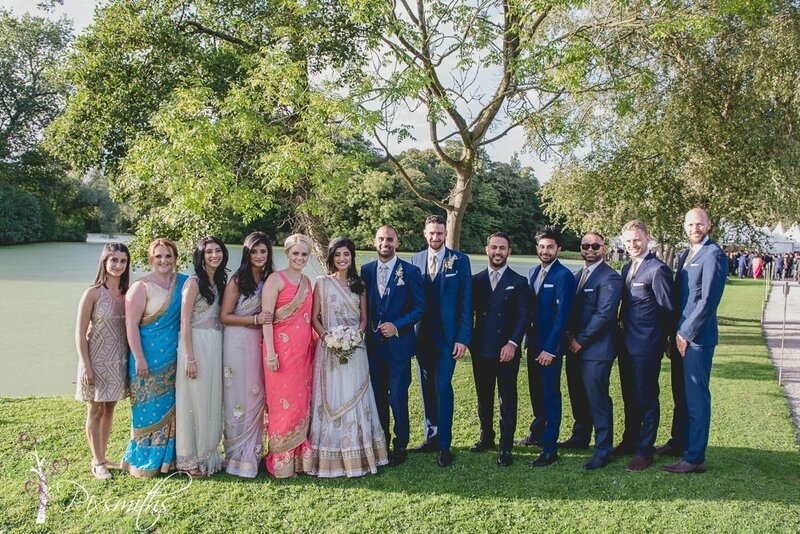 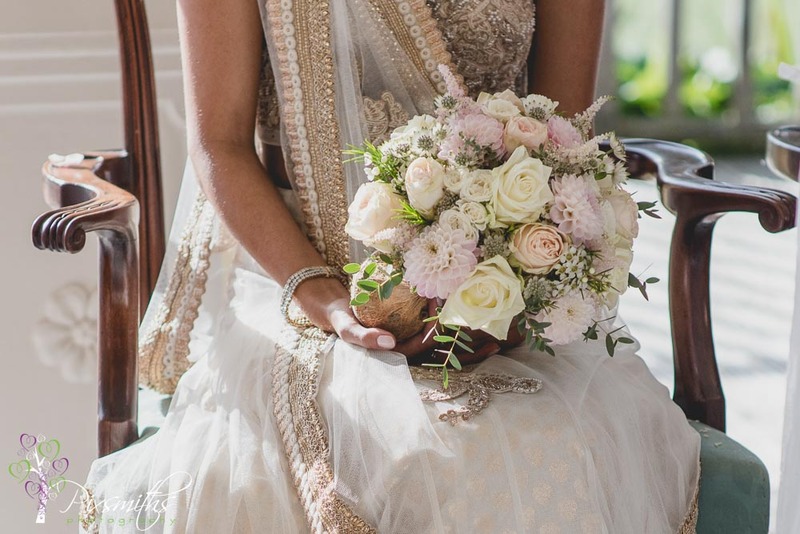 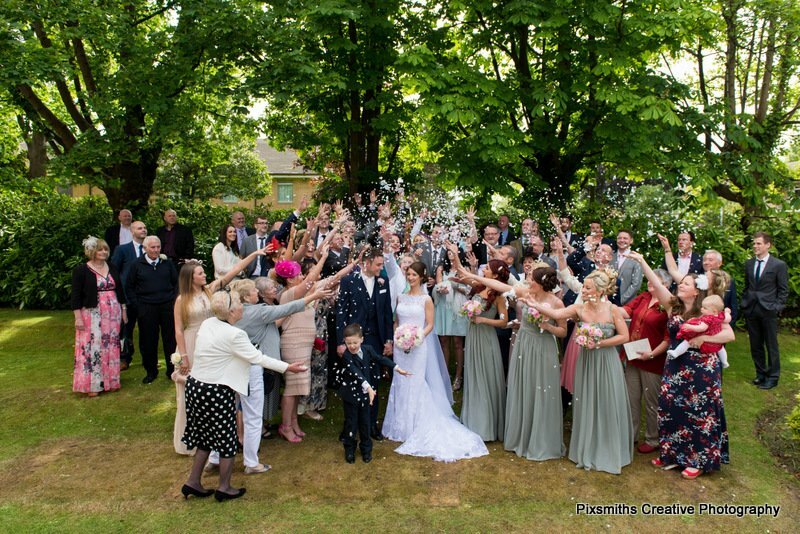 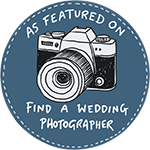 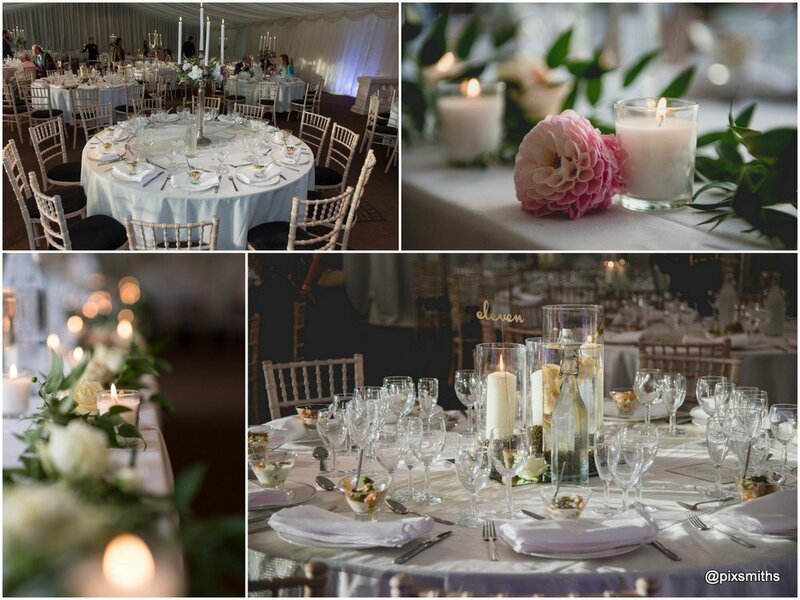 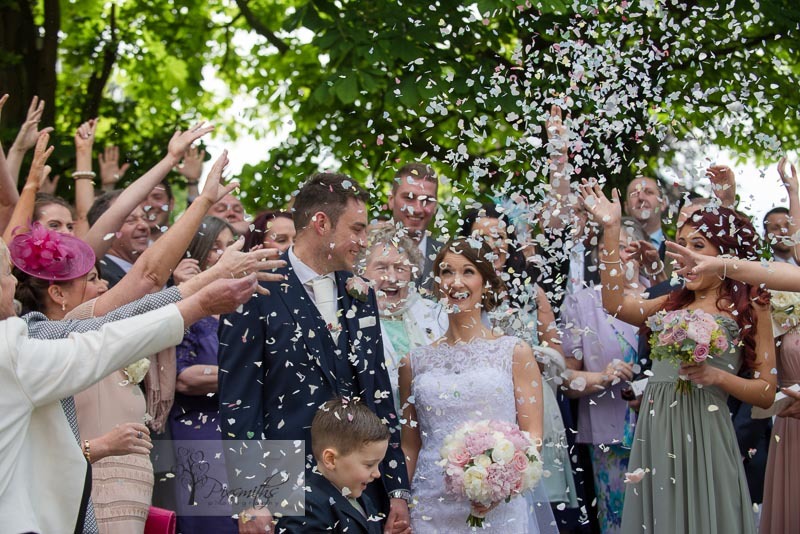 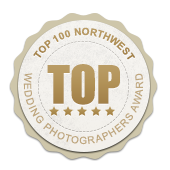 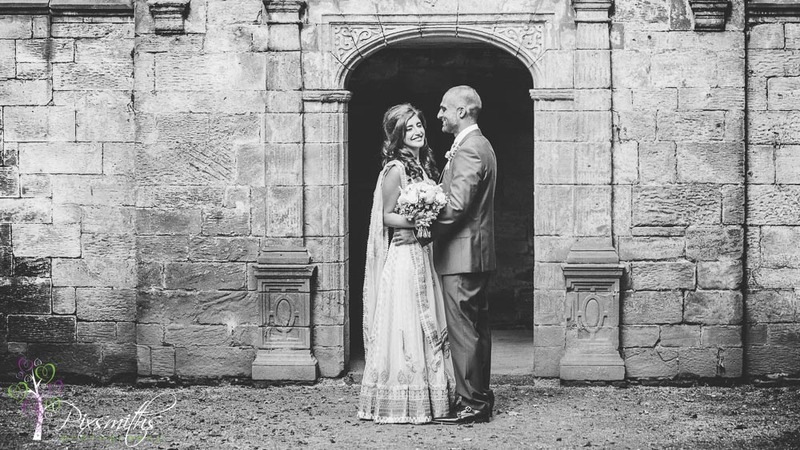 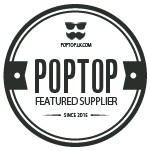 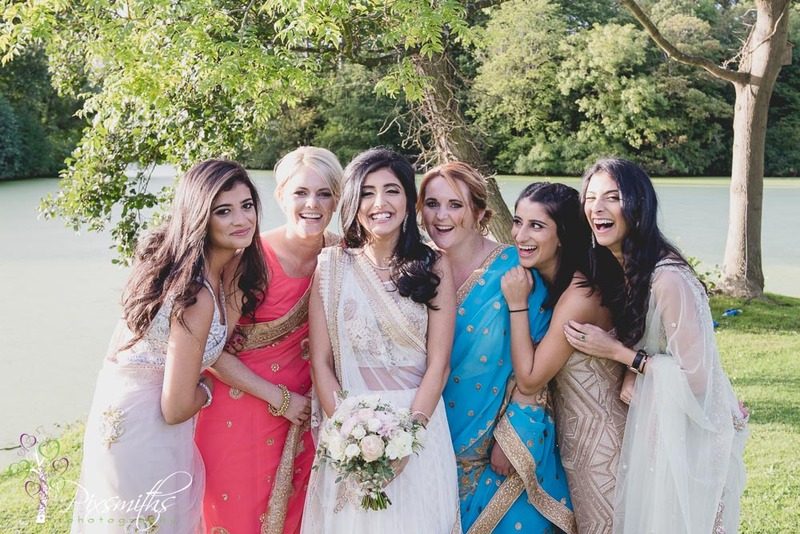 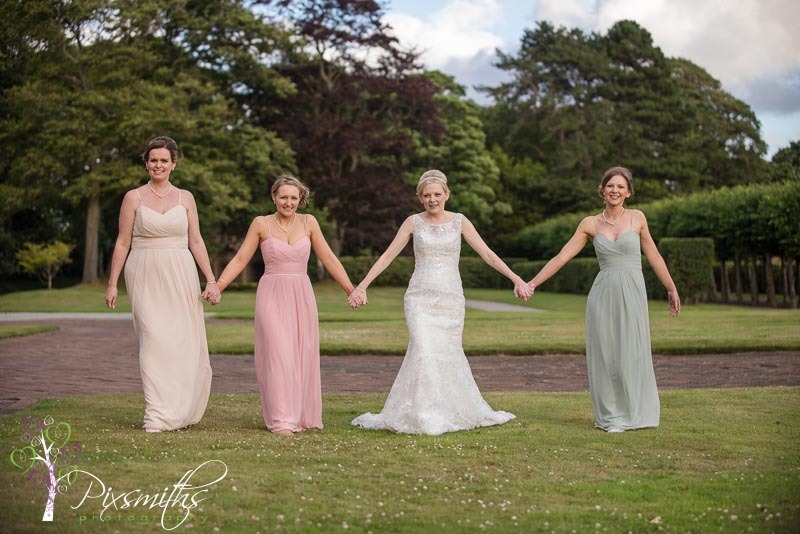 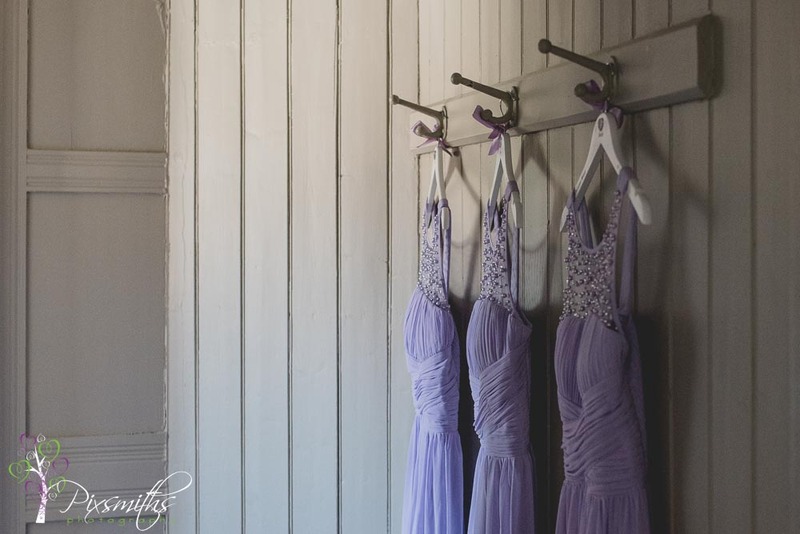 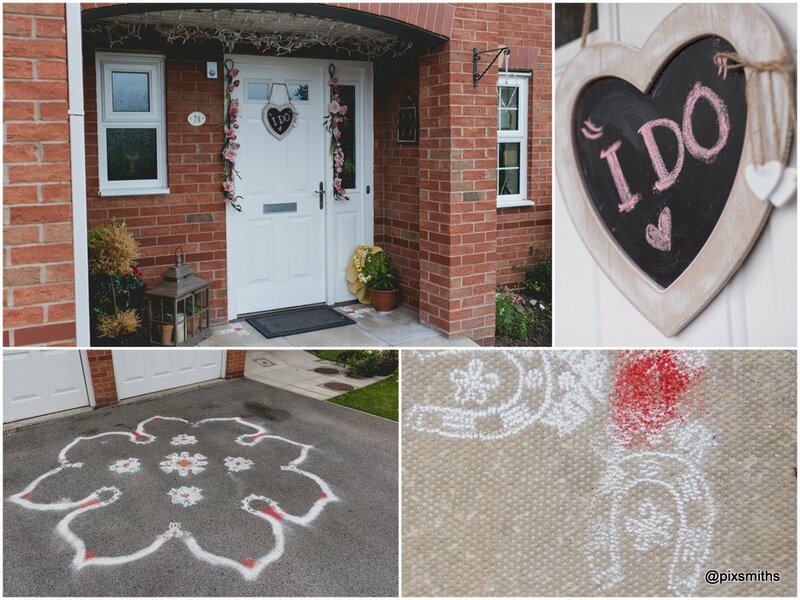 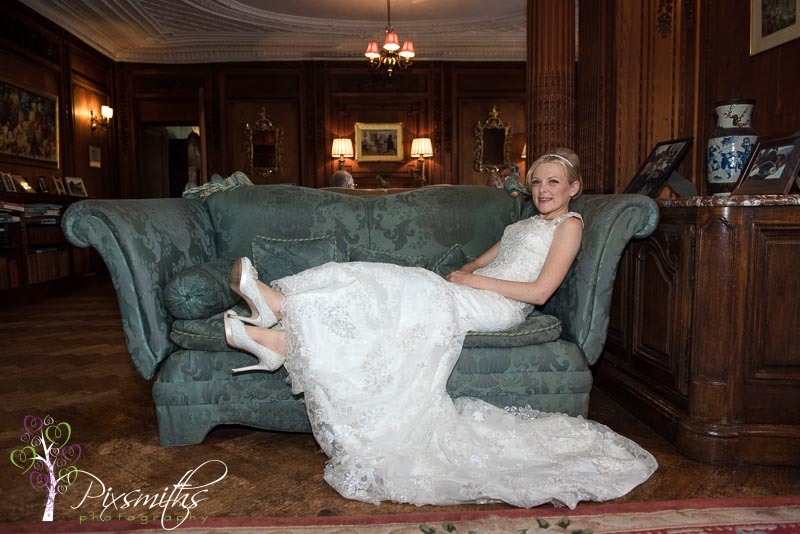 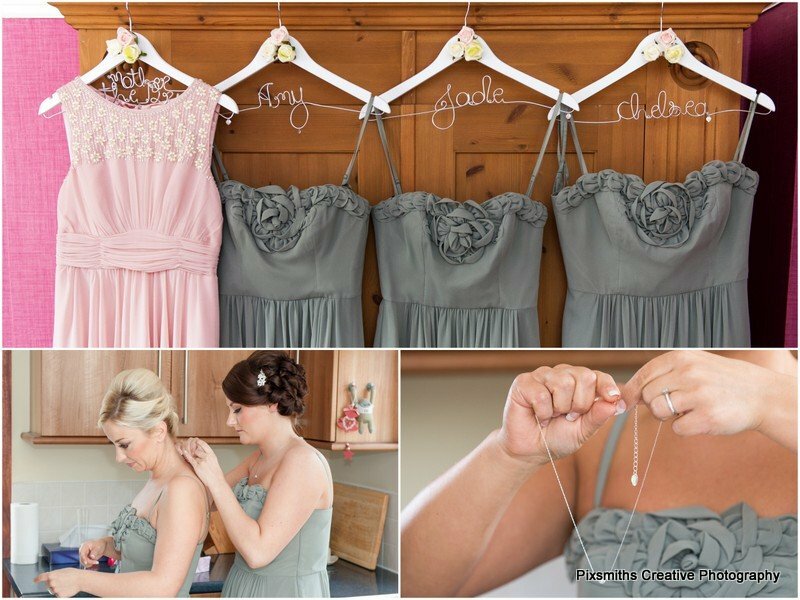 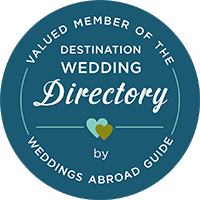 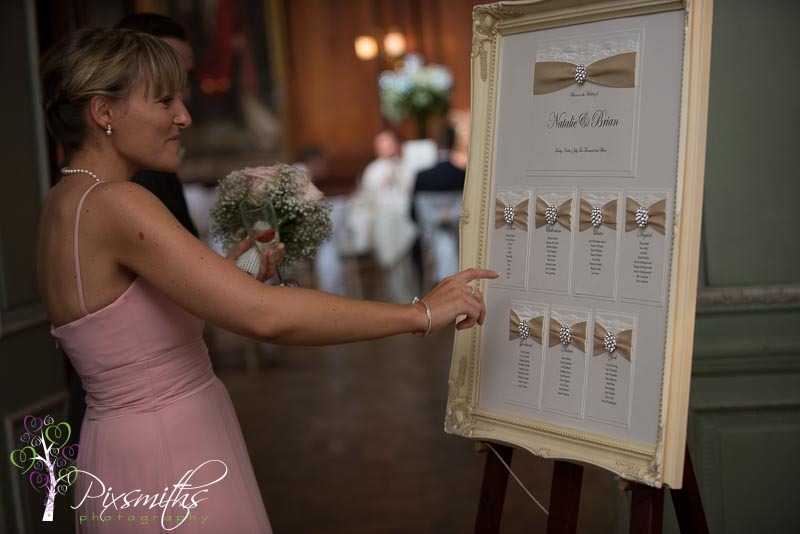 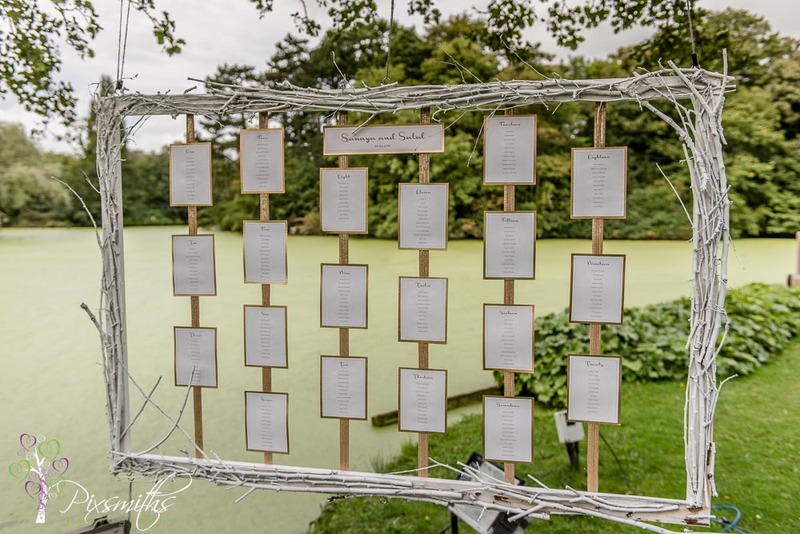 So many fab suppliers involeved in this weddding too – I’ll try to list them all at the end! 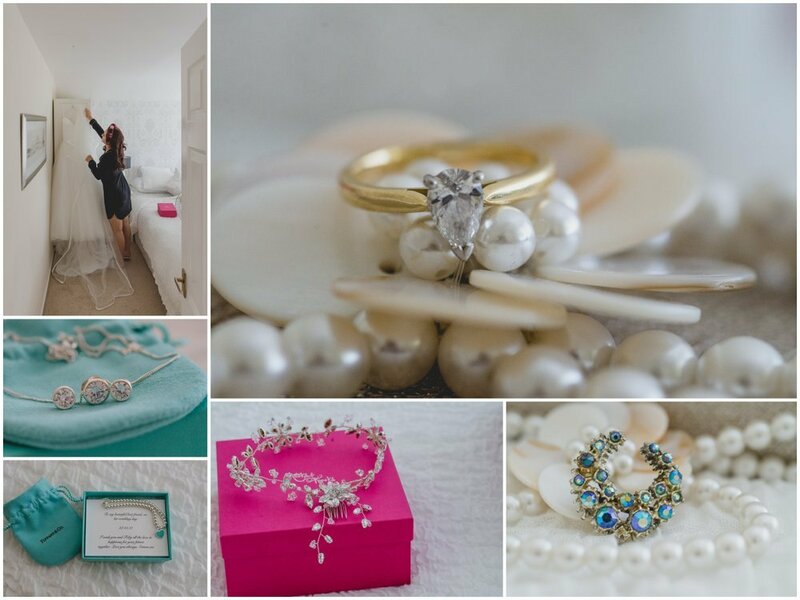 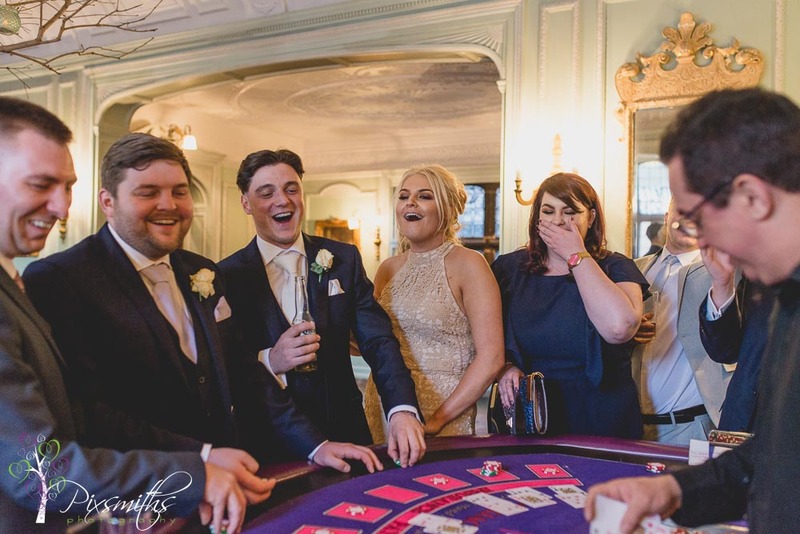 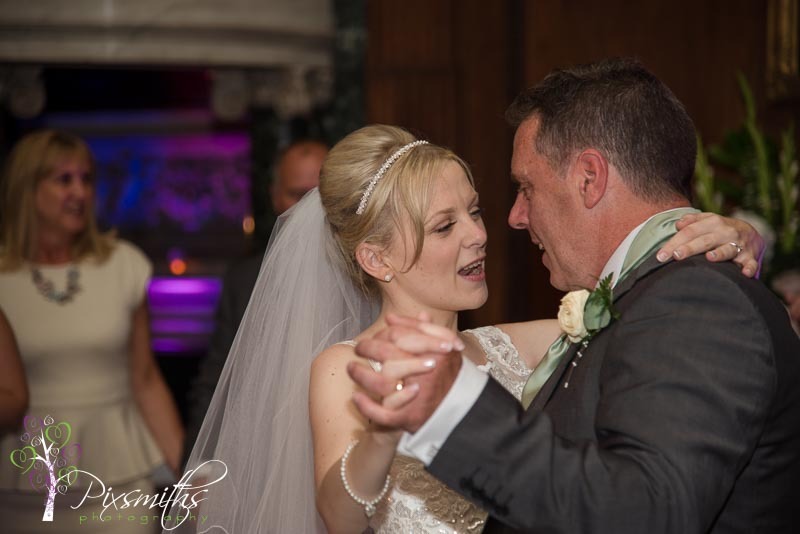 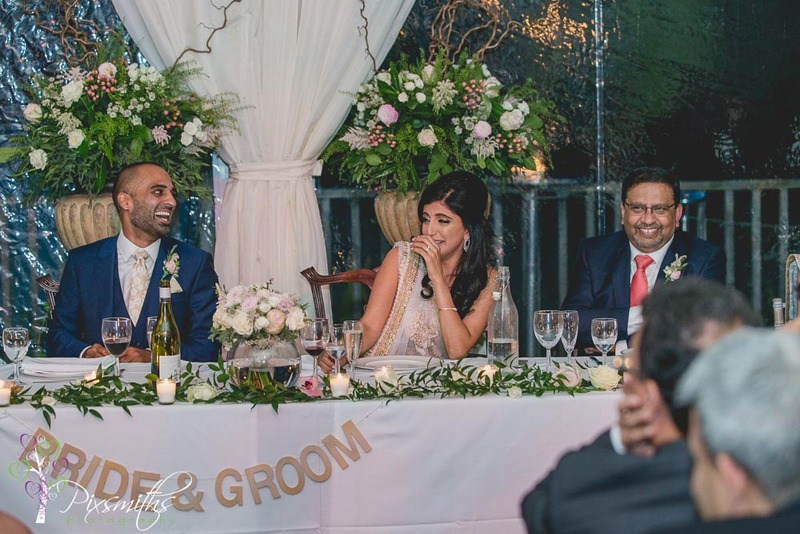 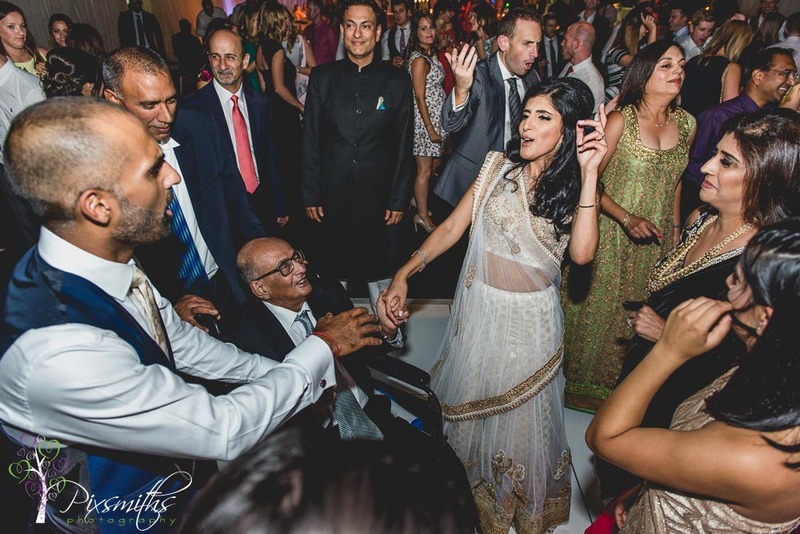 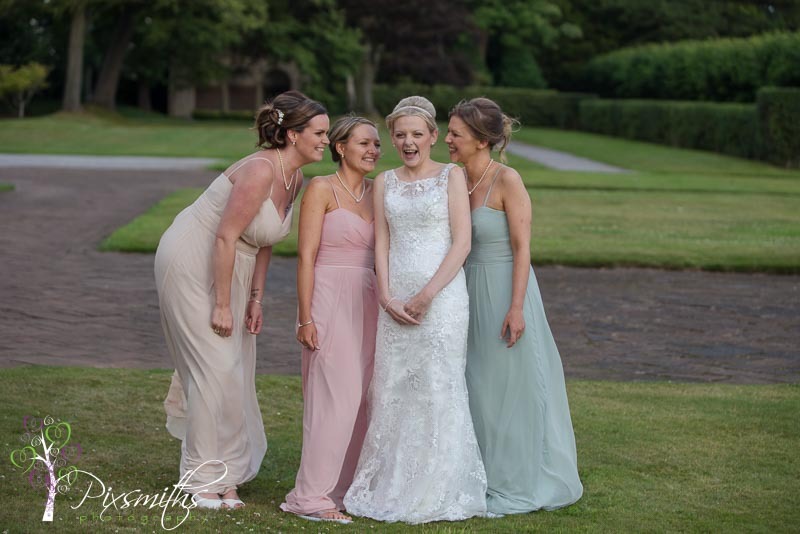 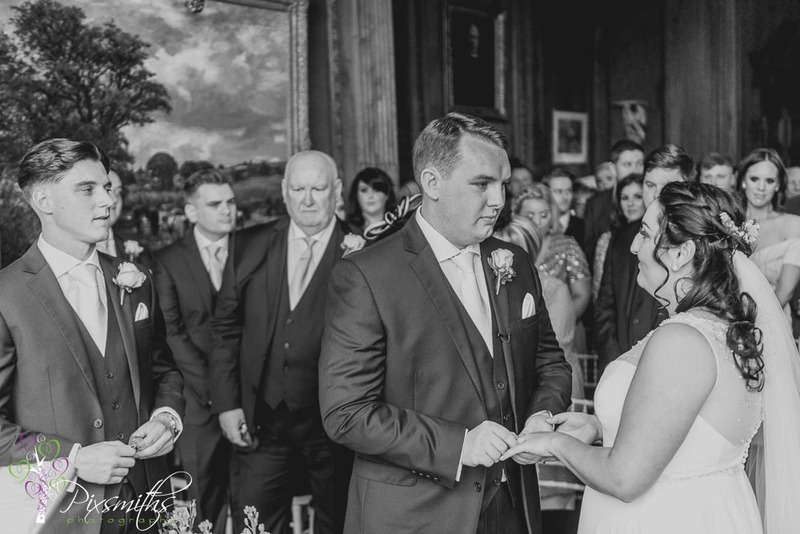 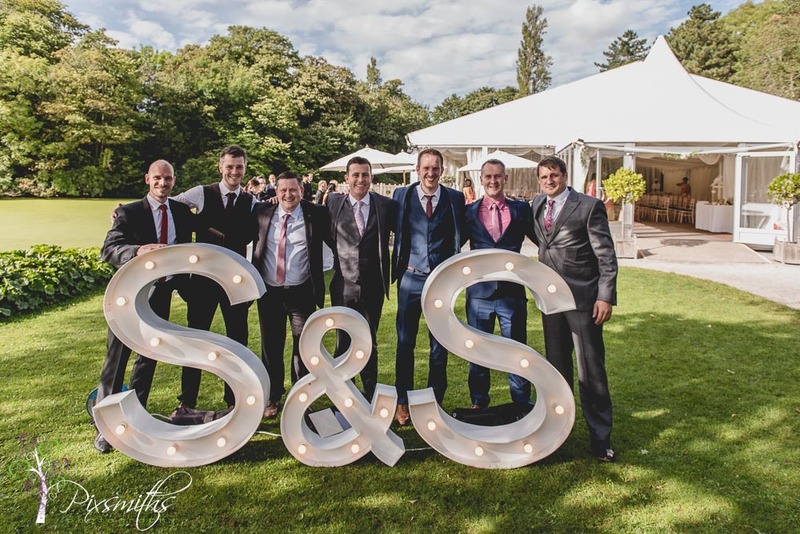 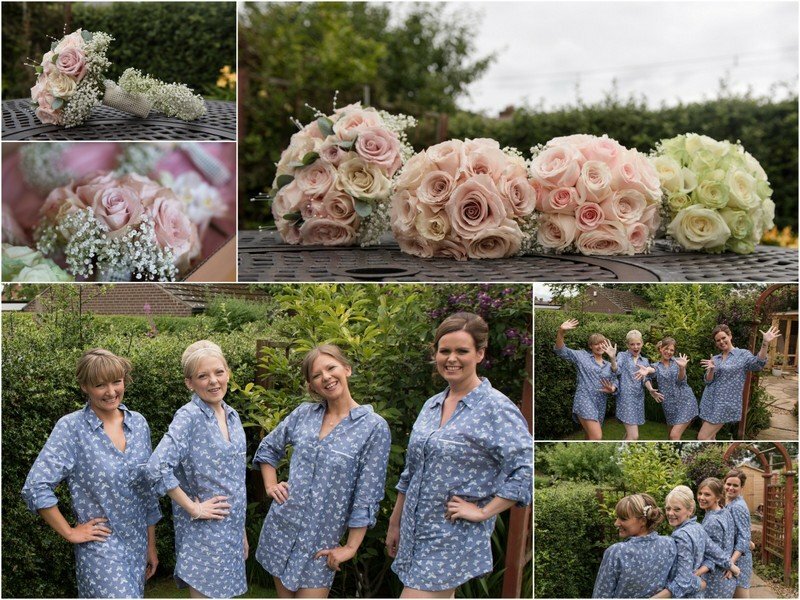 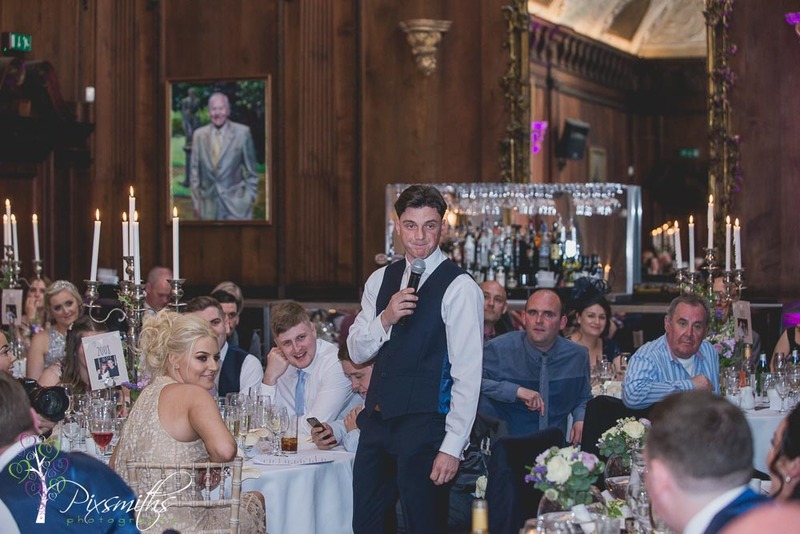 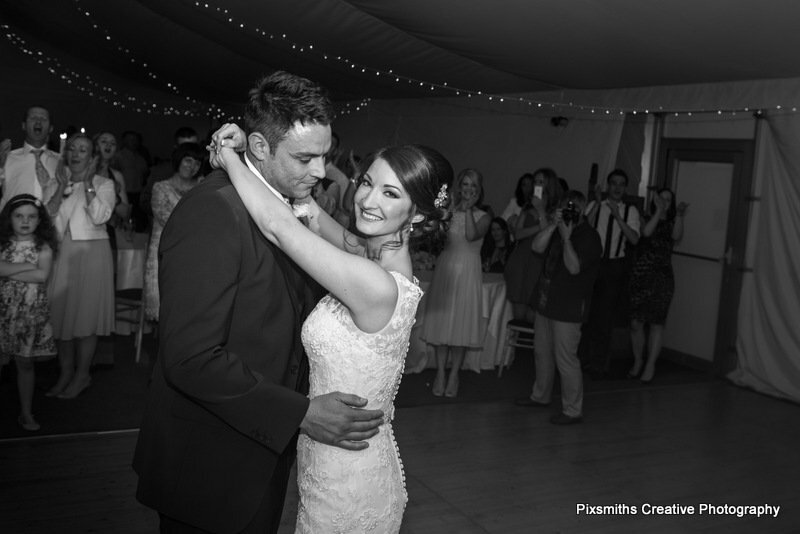 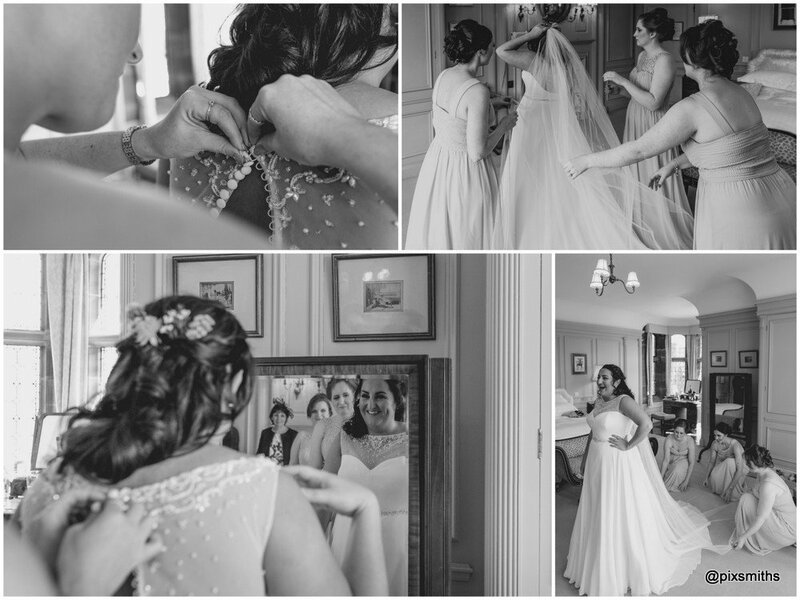 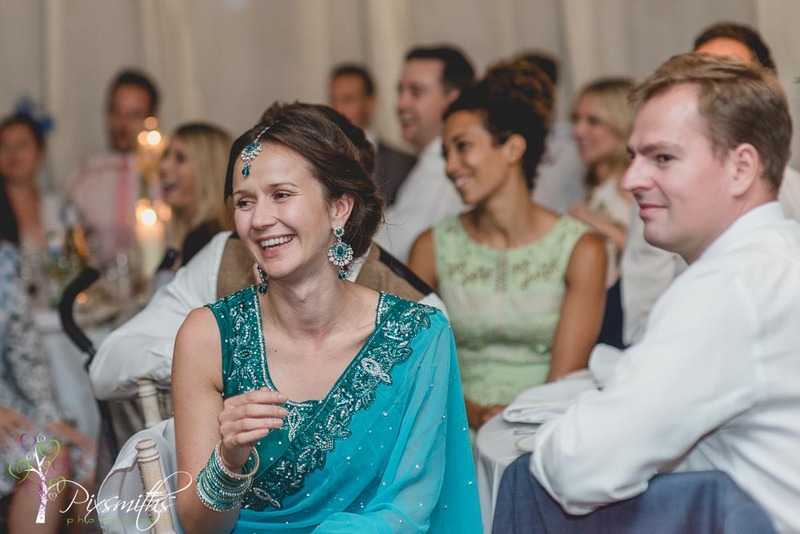 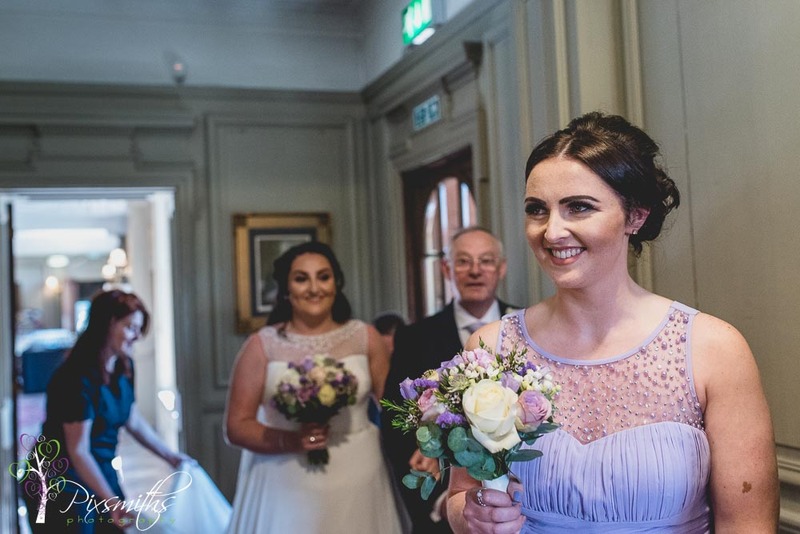 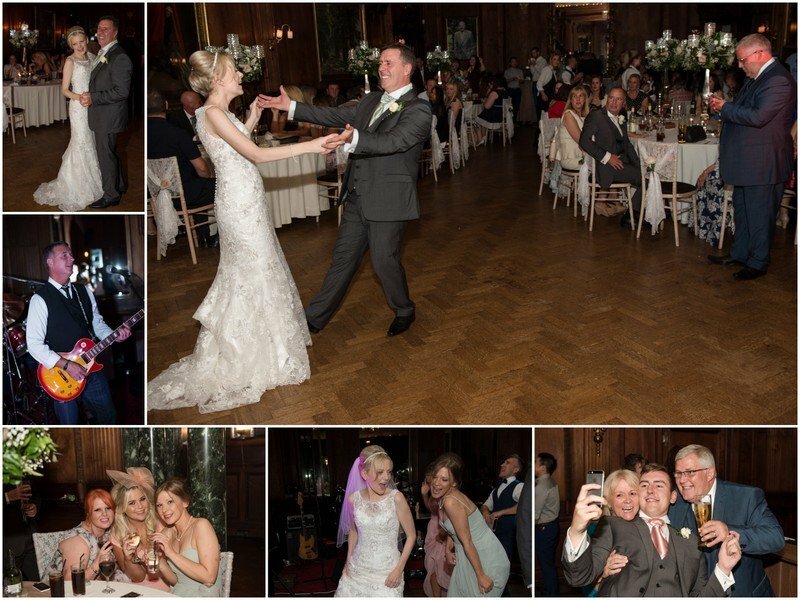 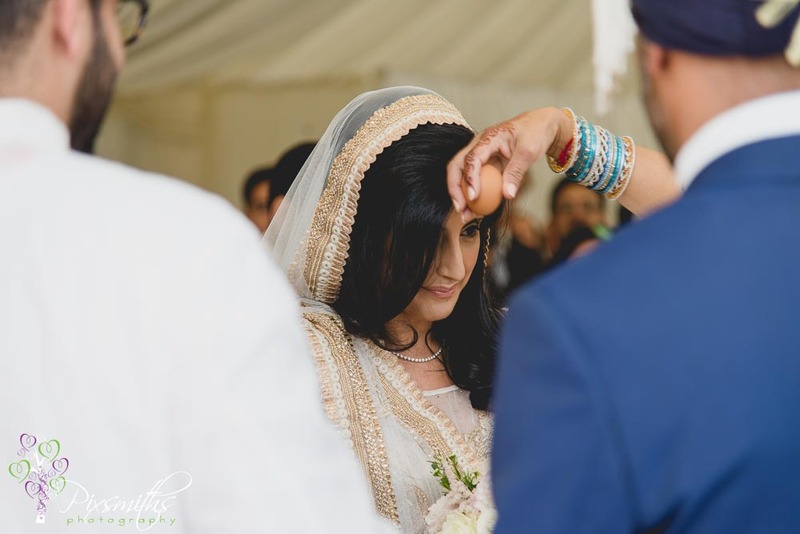 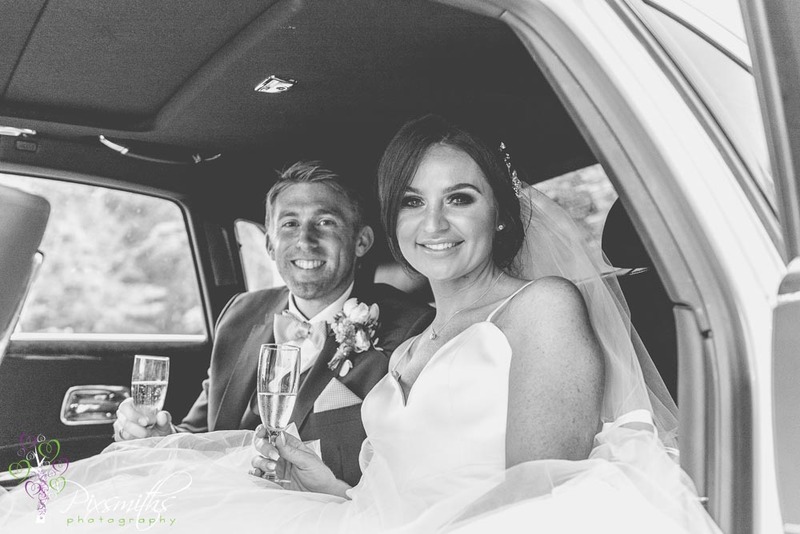 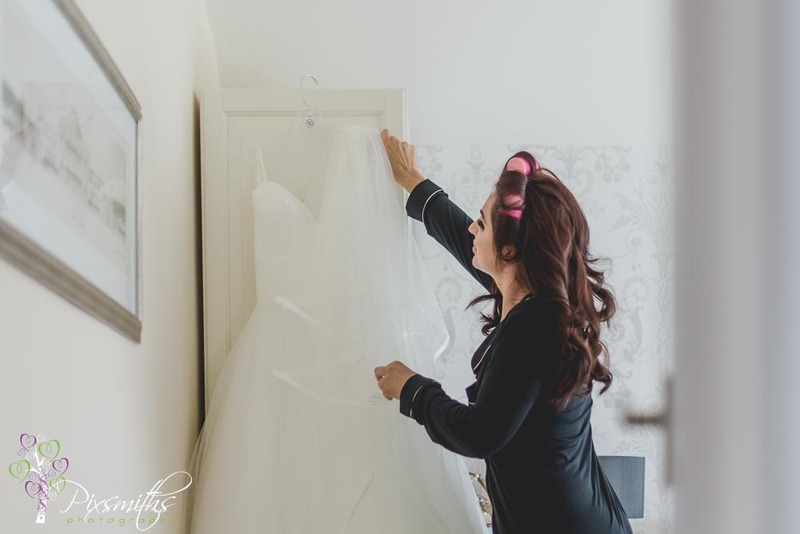 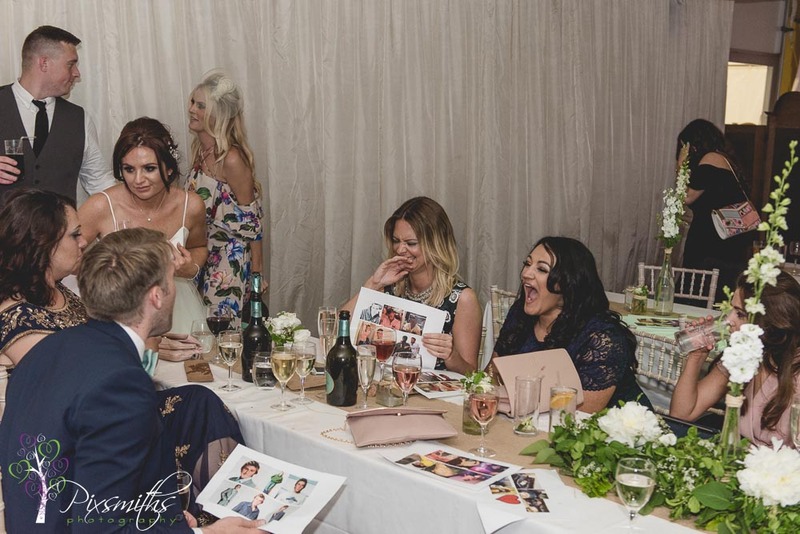 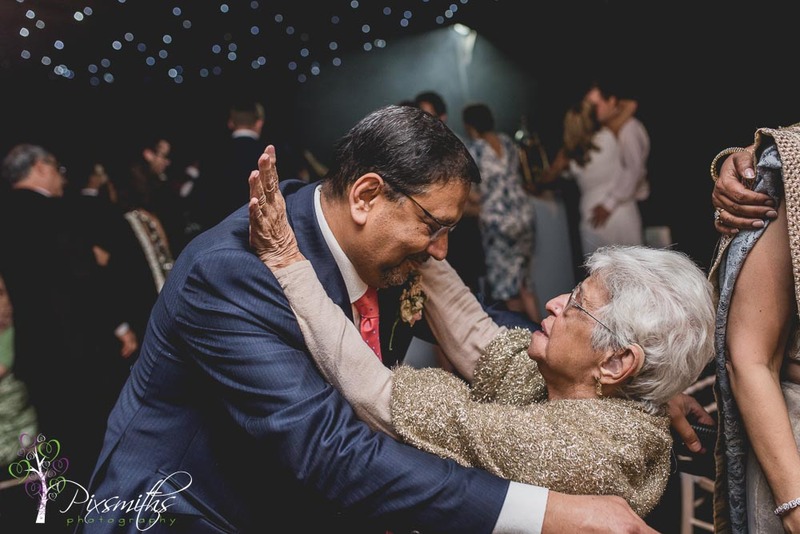 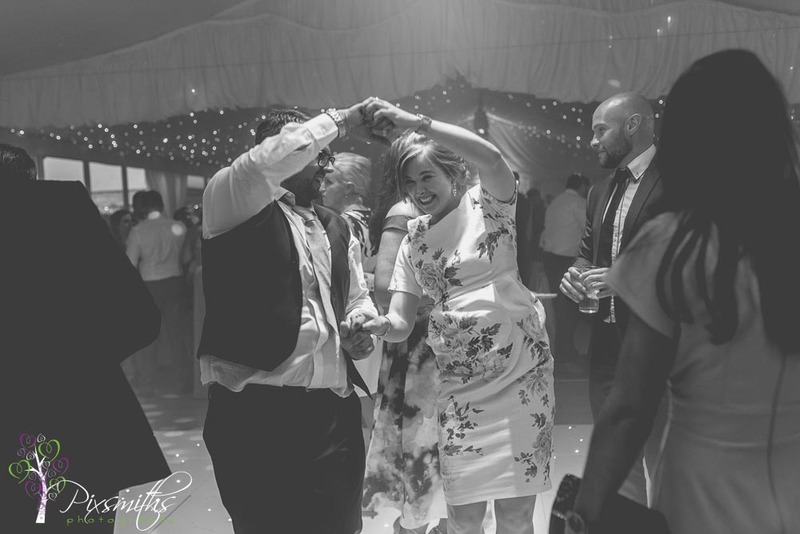 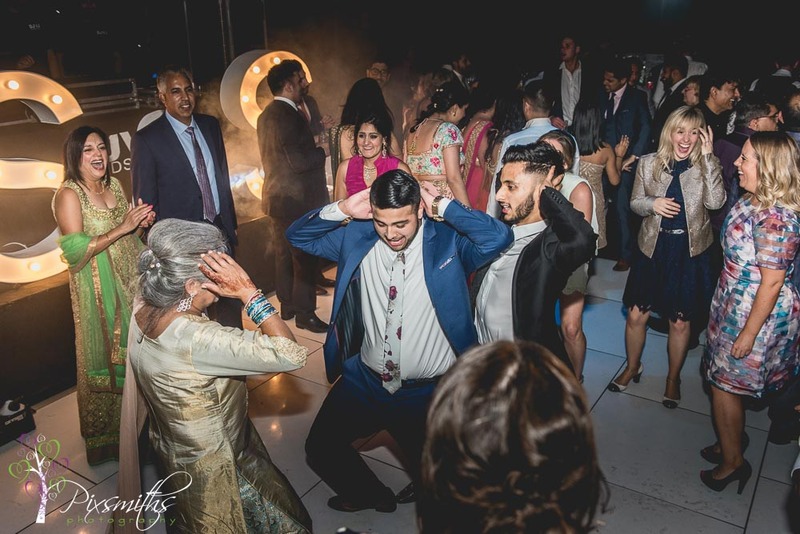 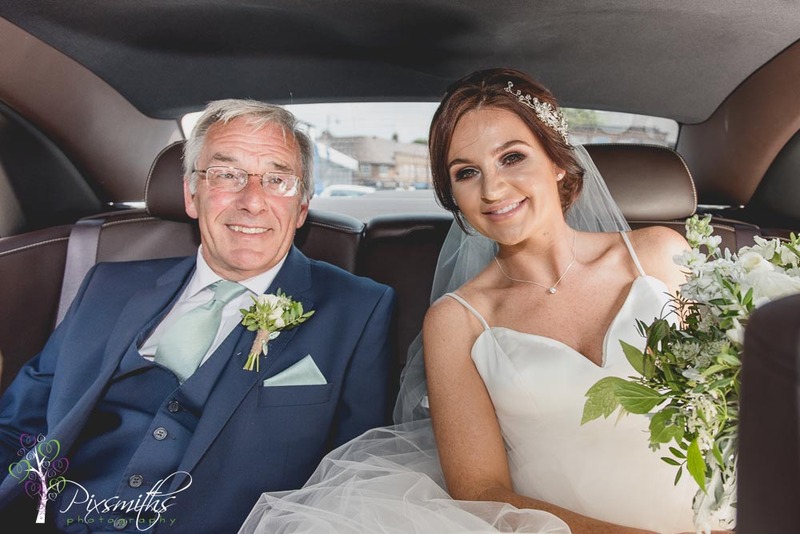 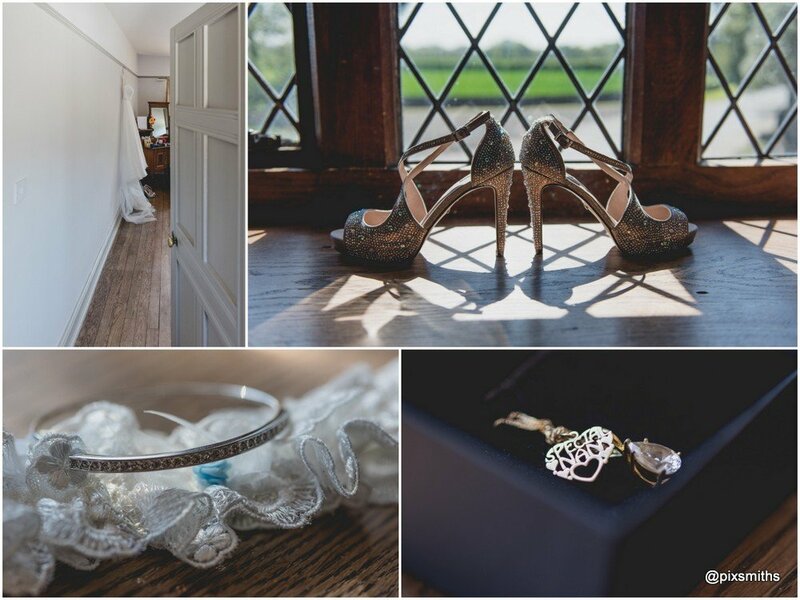 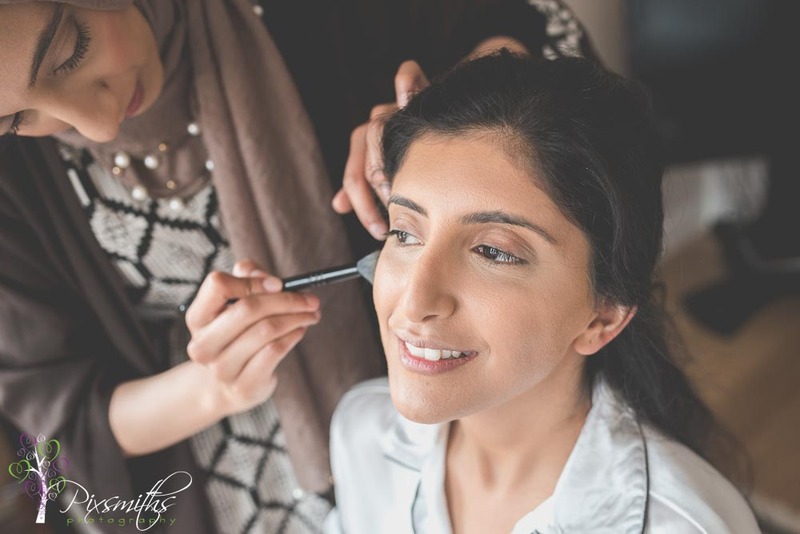 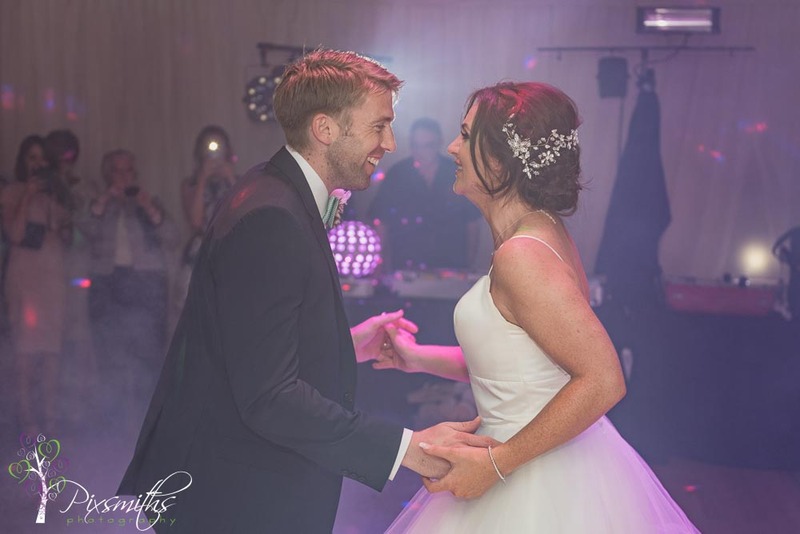 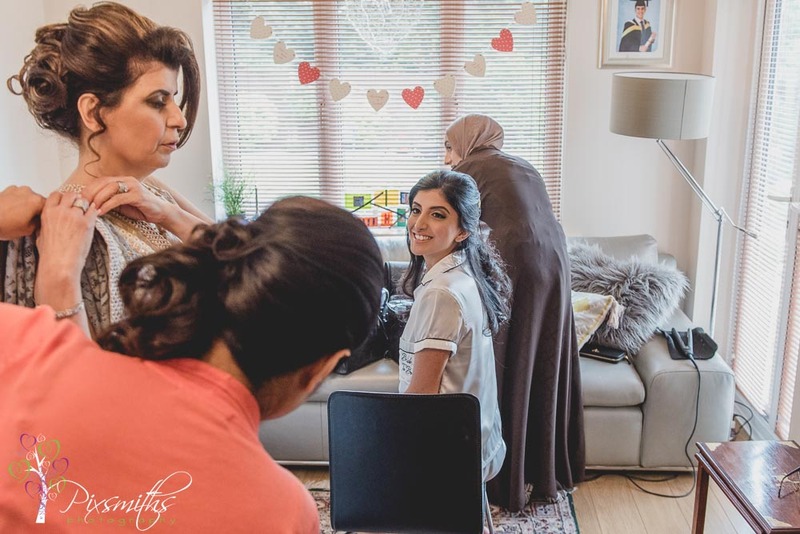 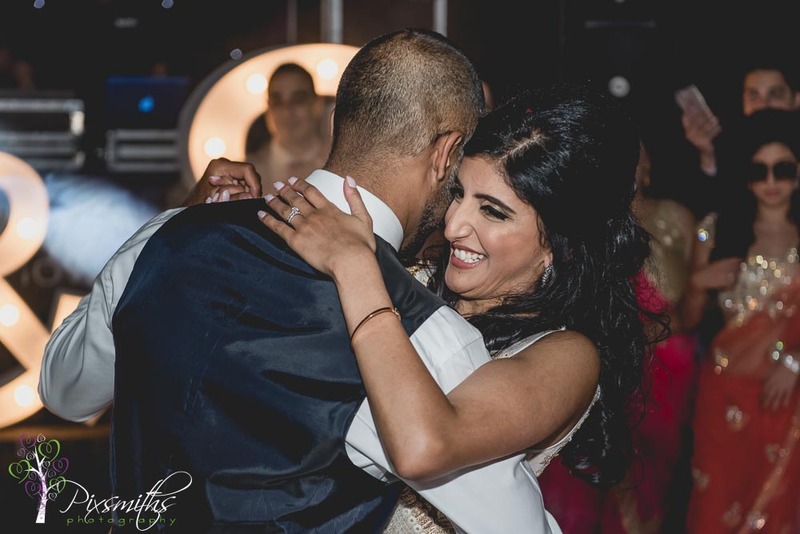 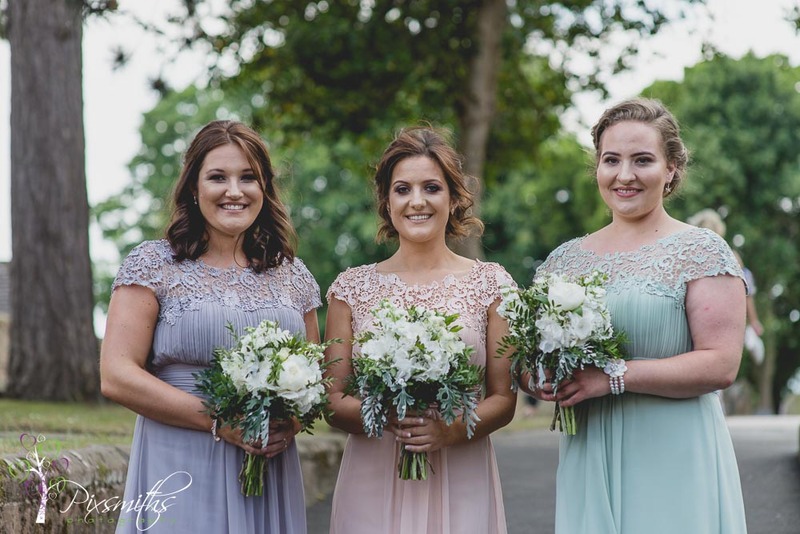 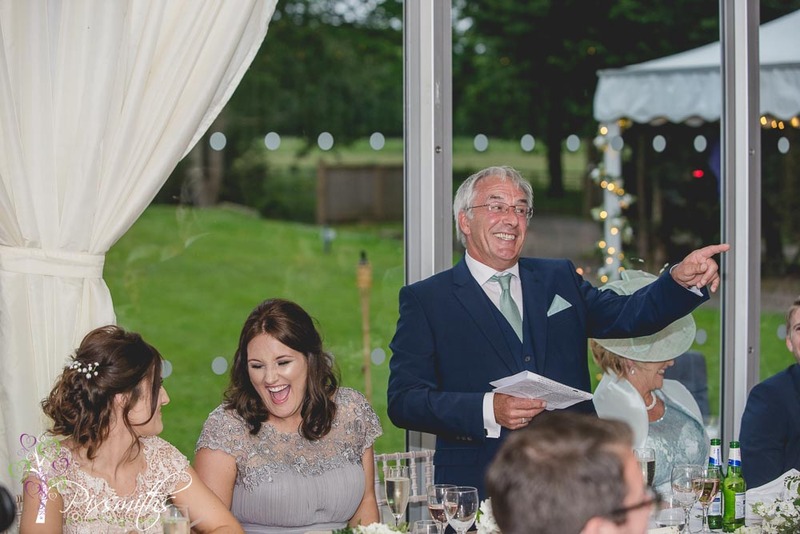 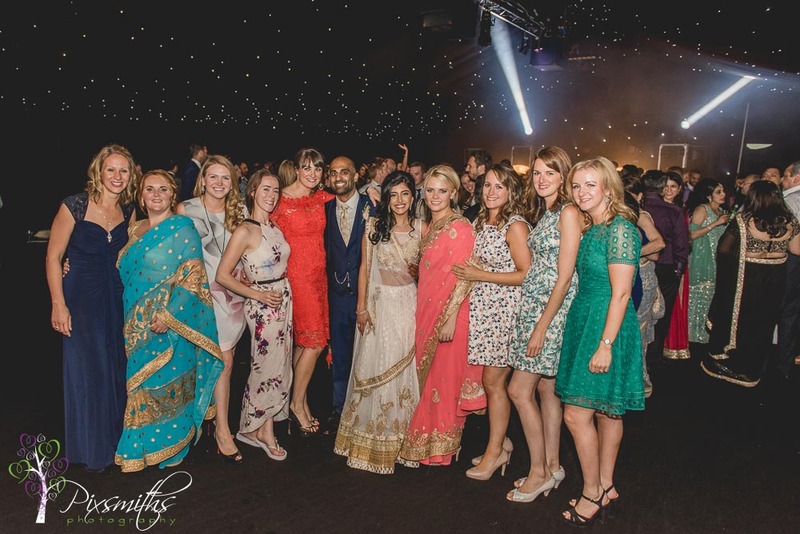 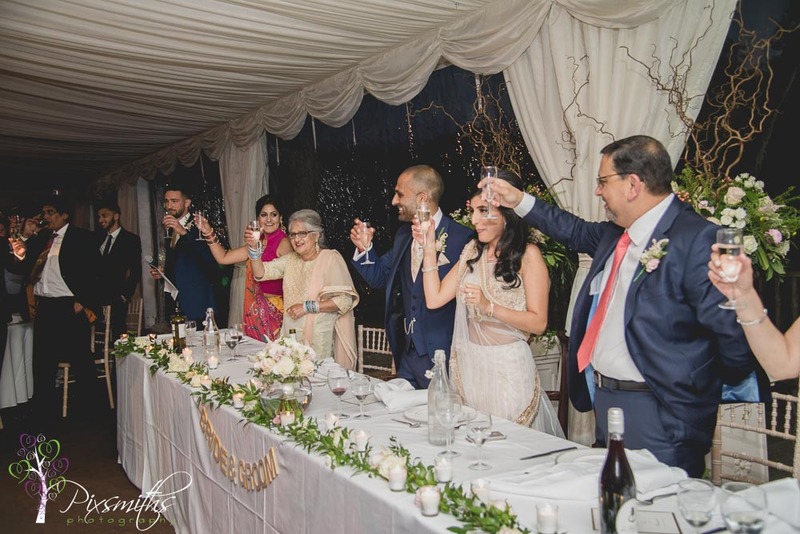 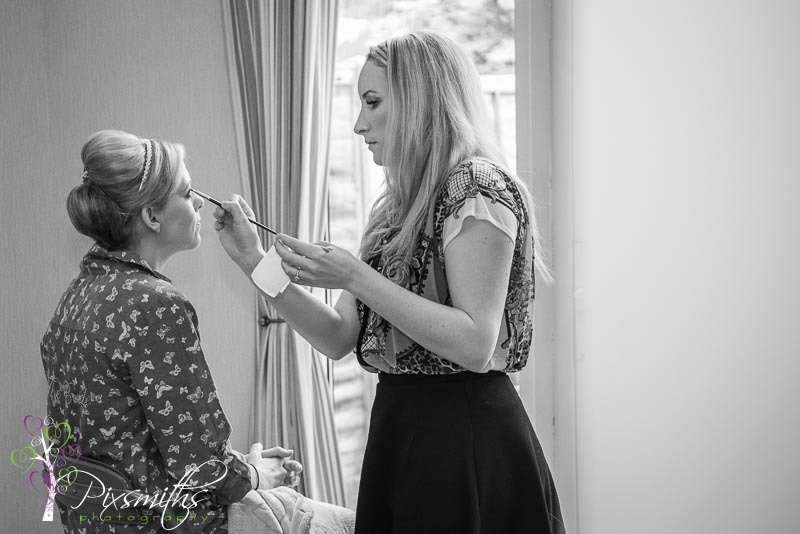 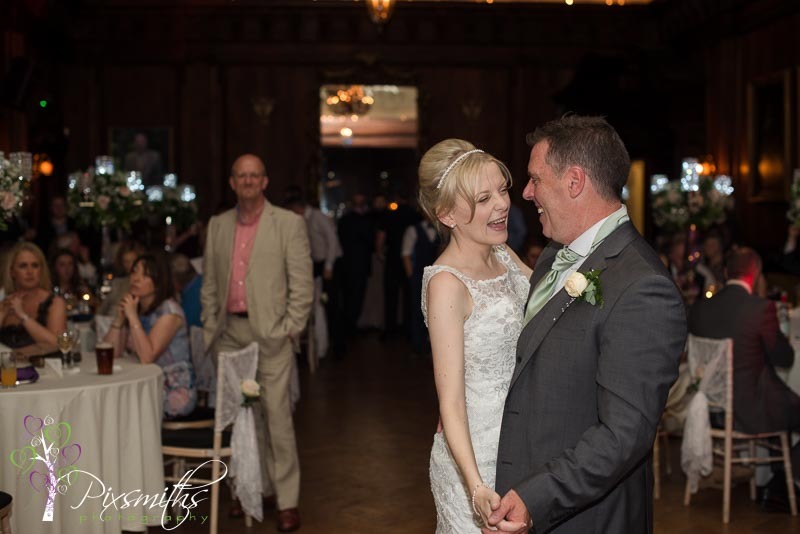 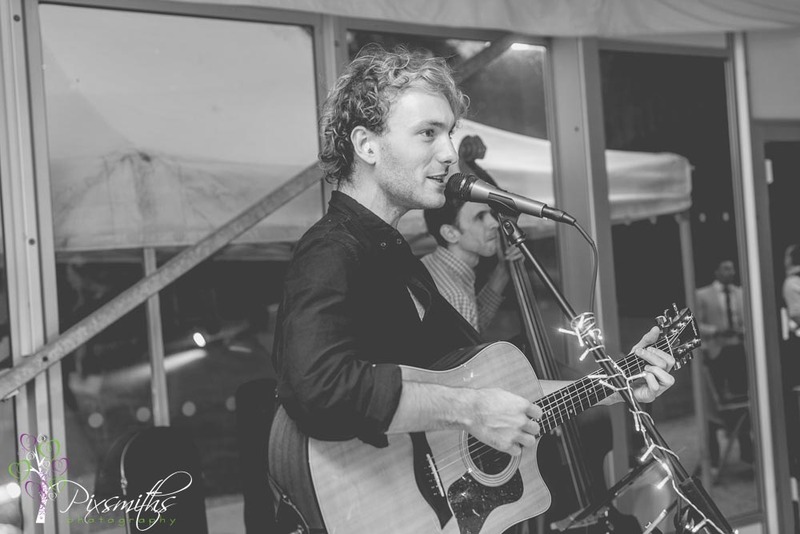 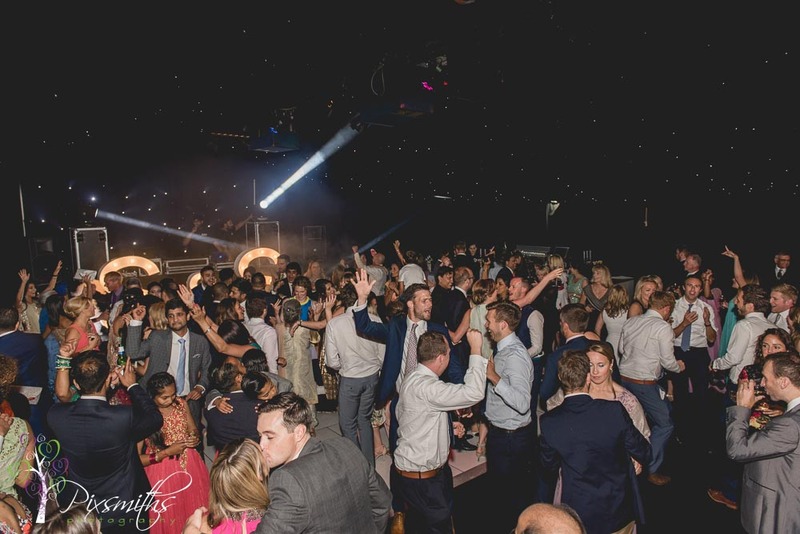 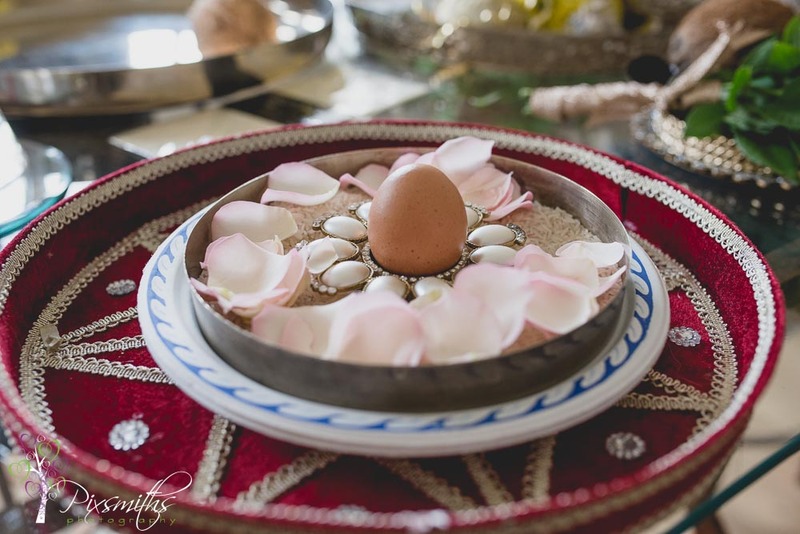 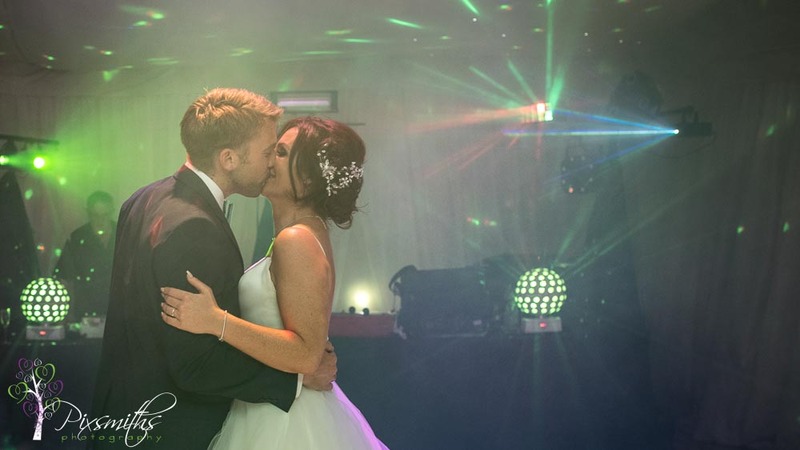 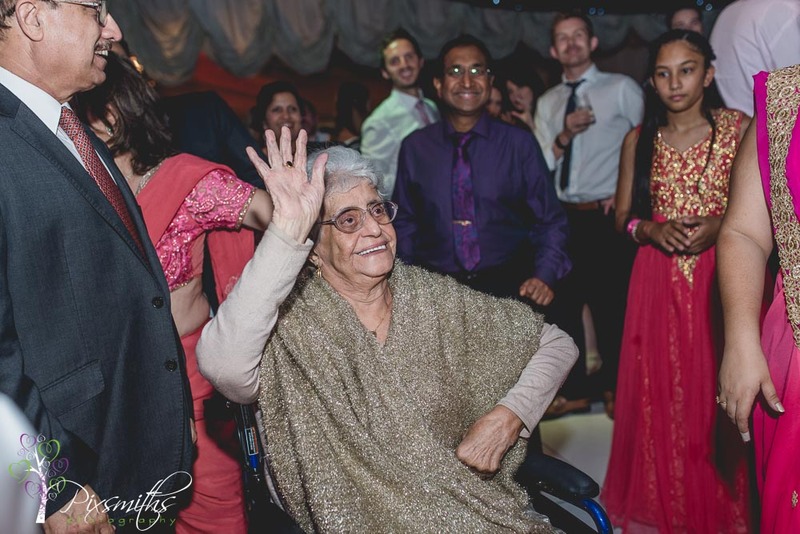 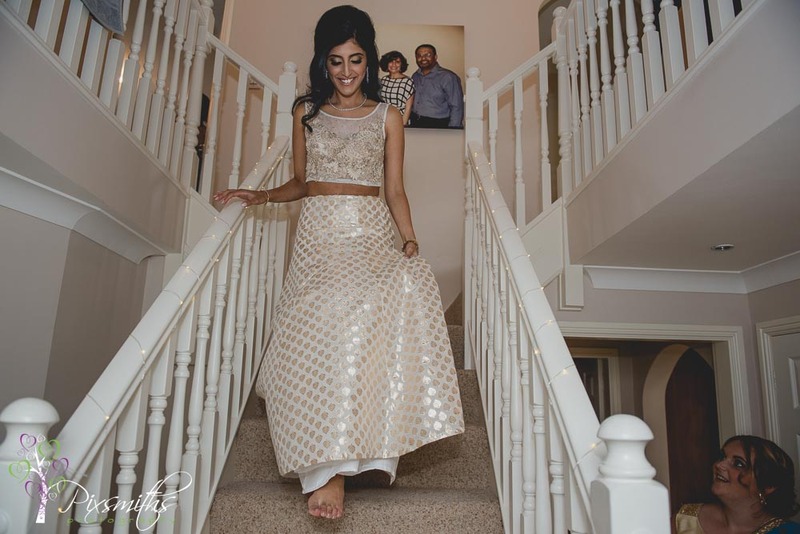 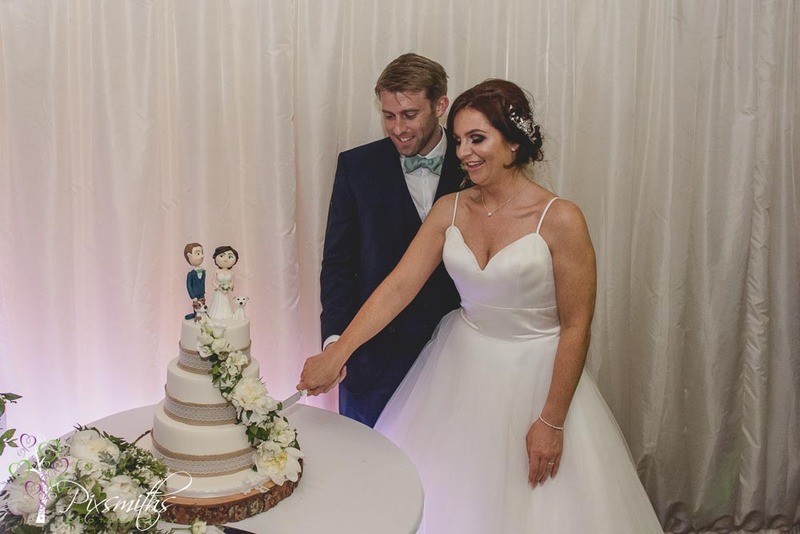 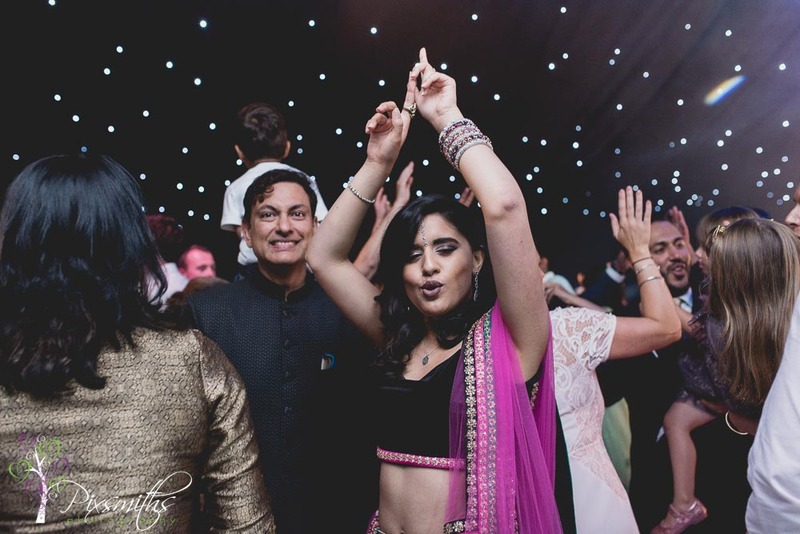 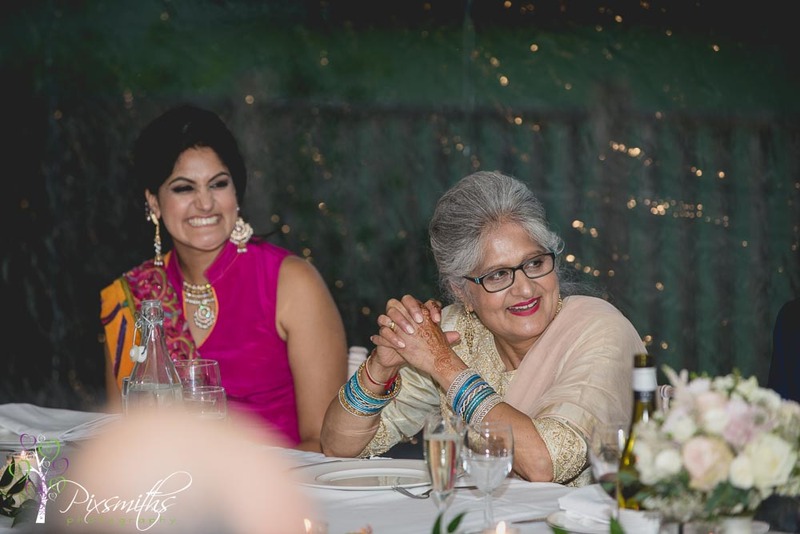 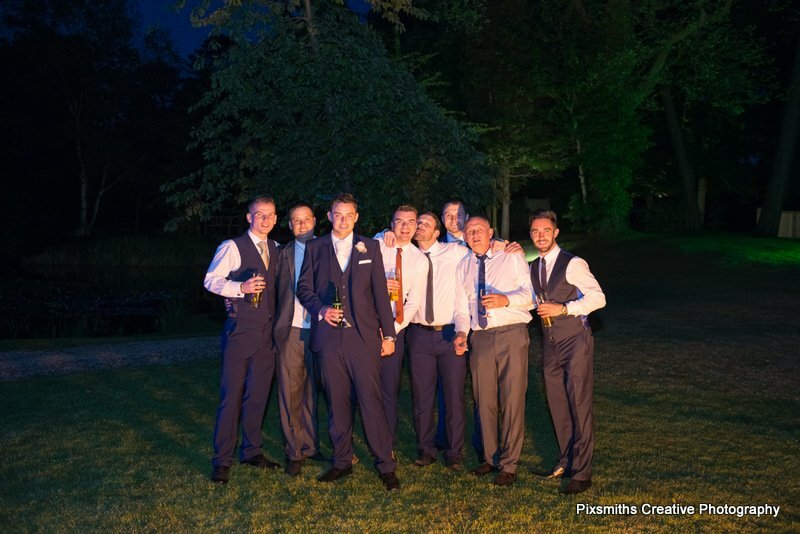 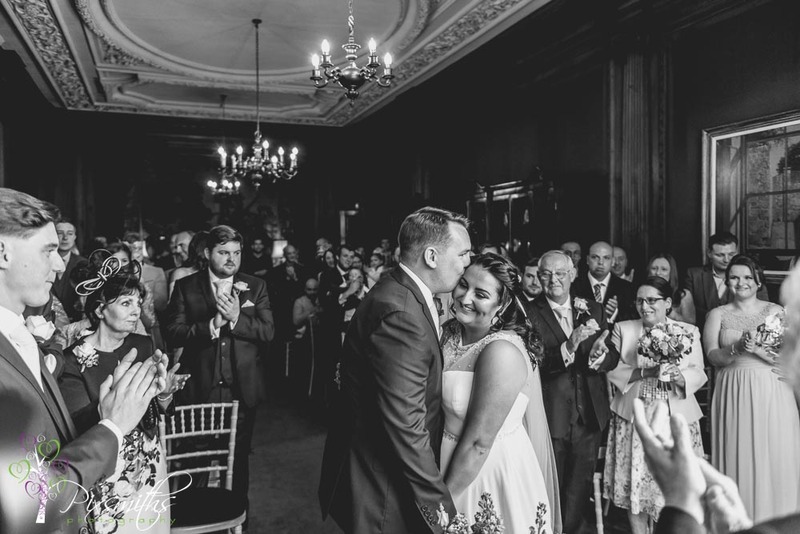 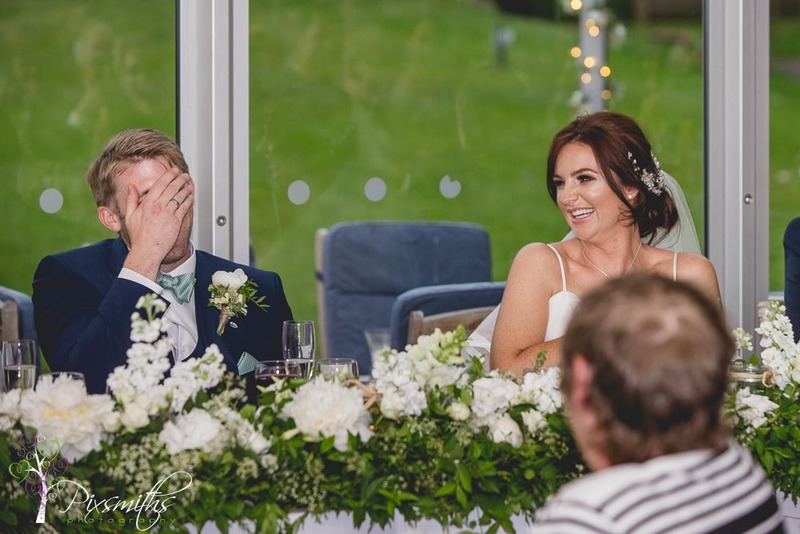 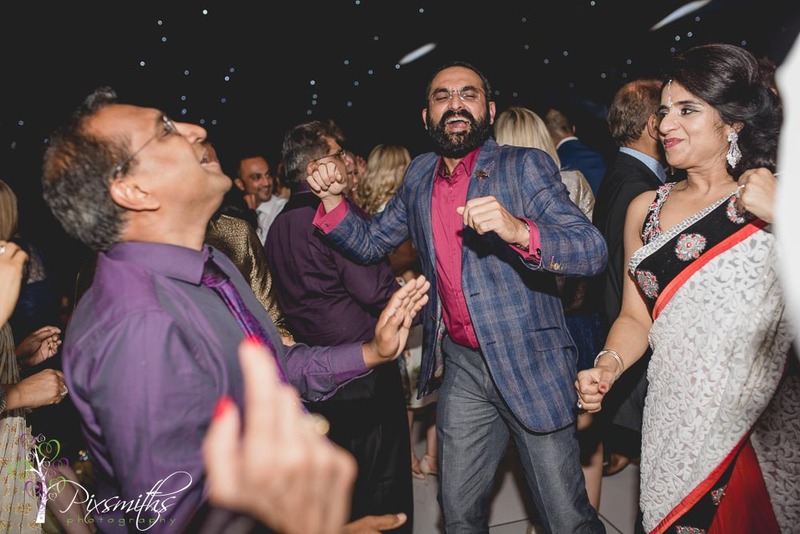 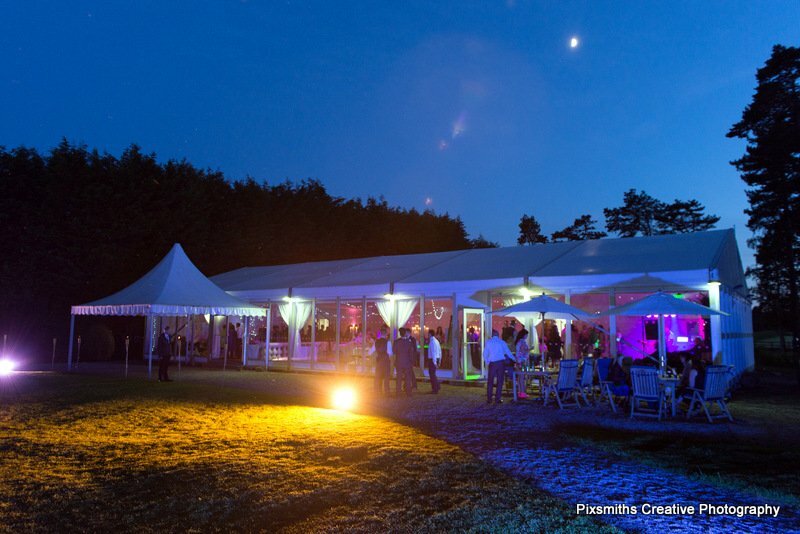 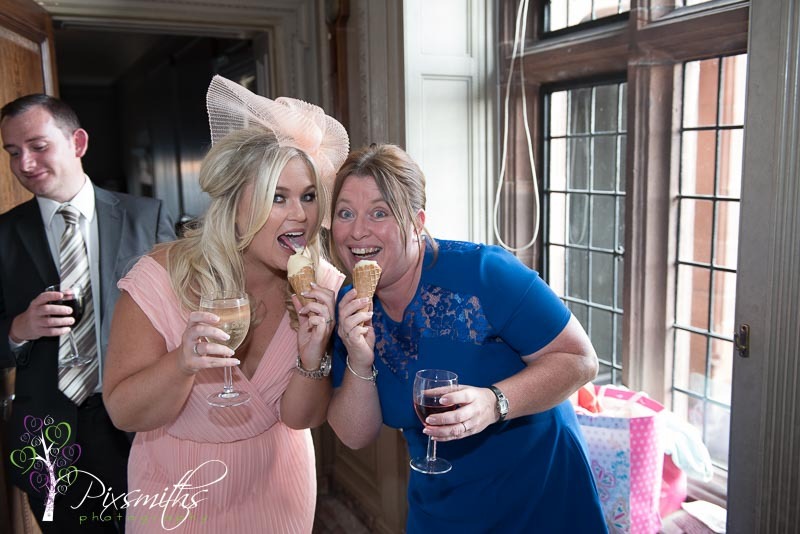 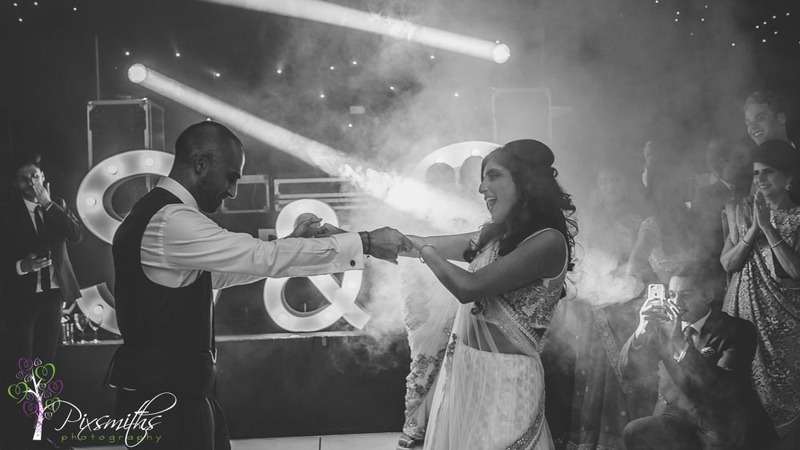 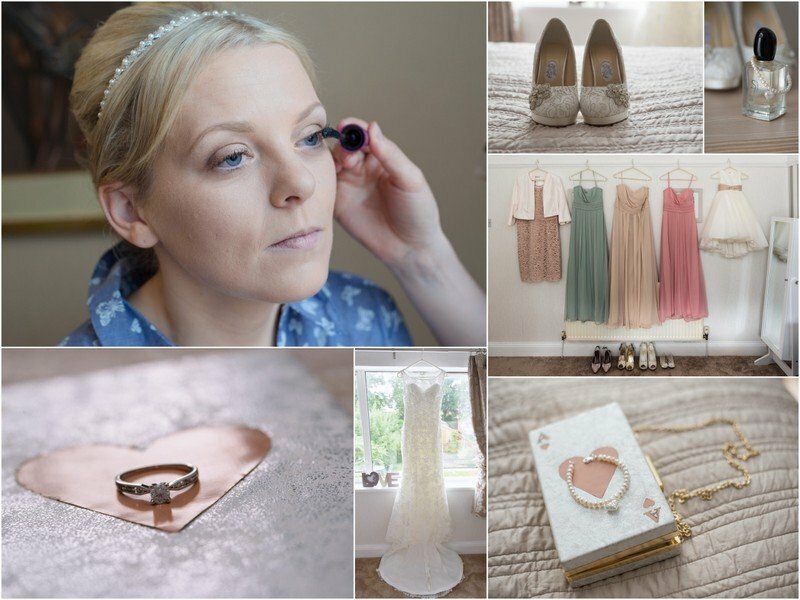 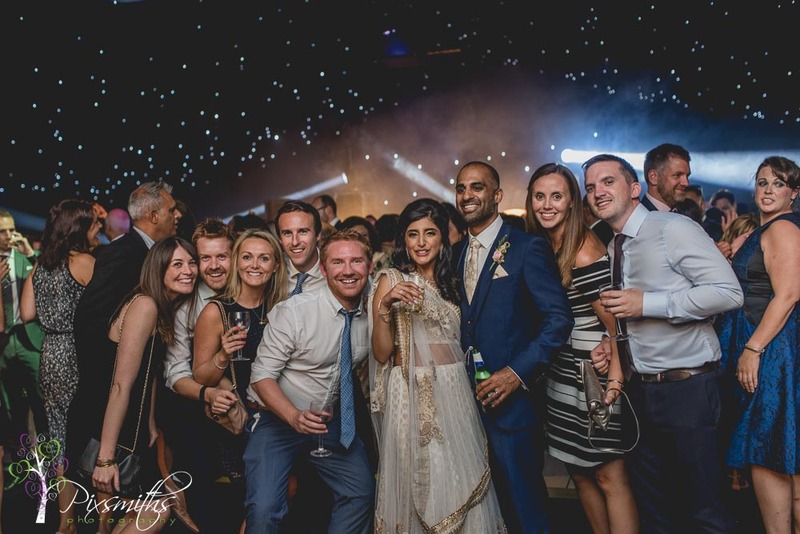 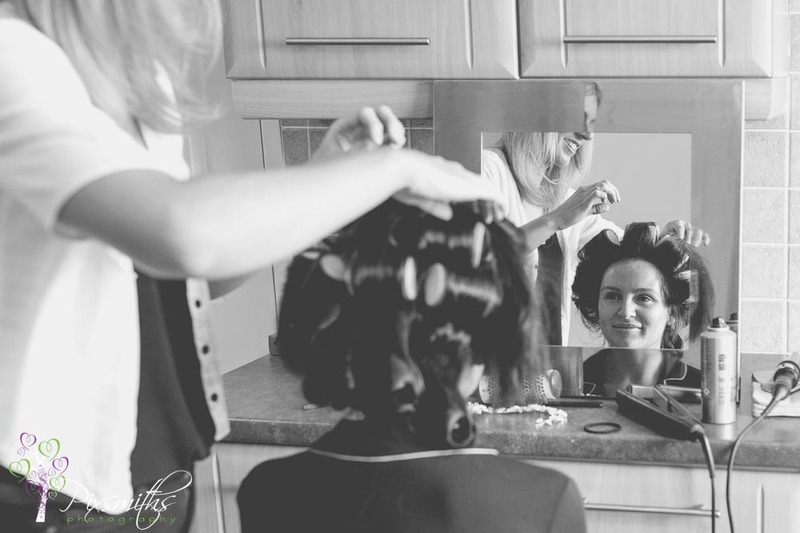 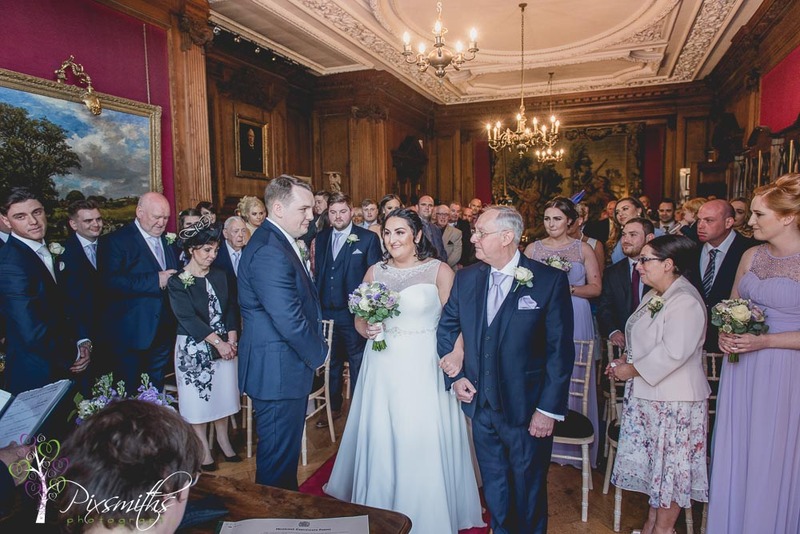 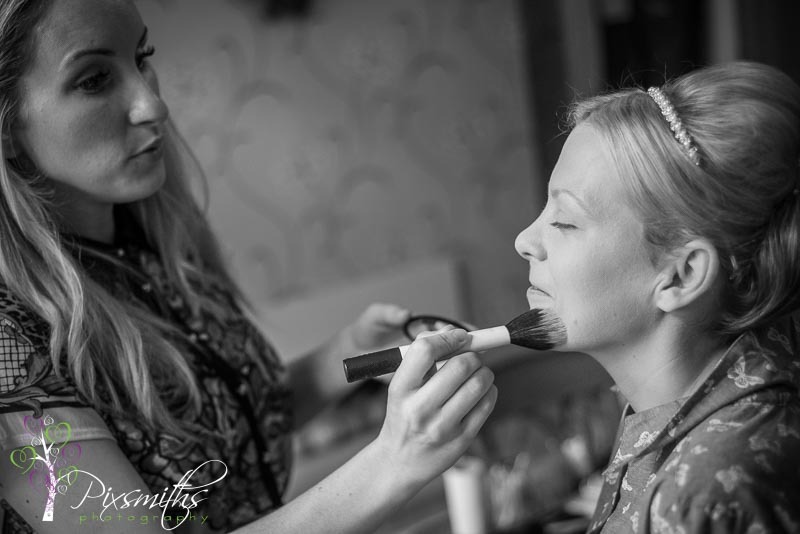 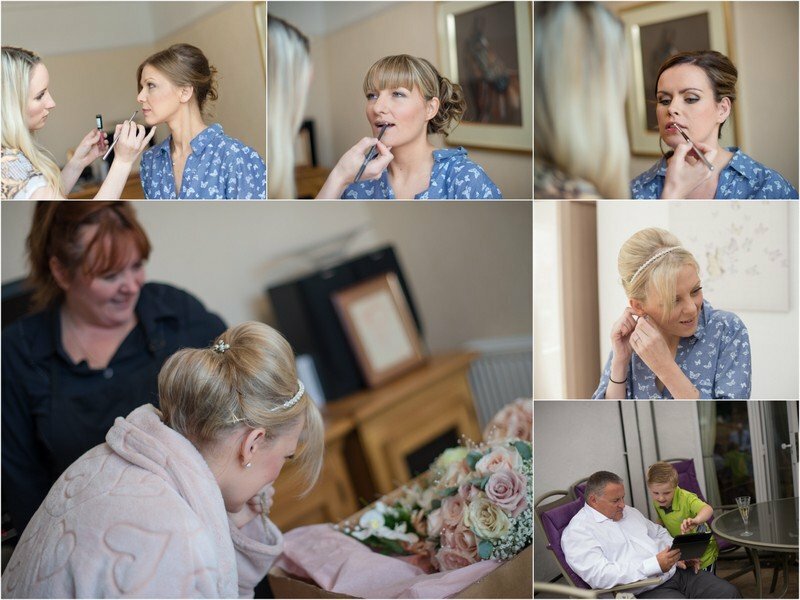 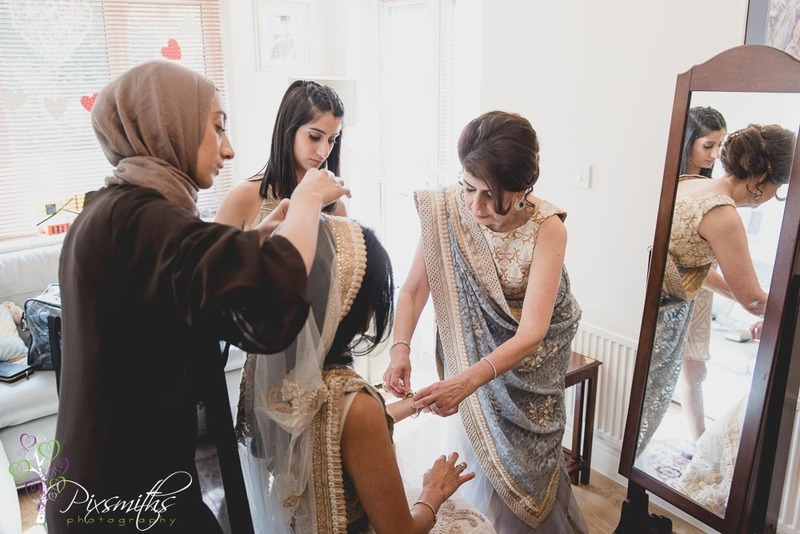 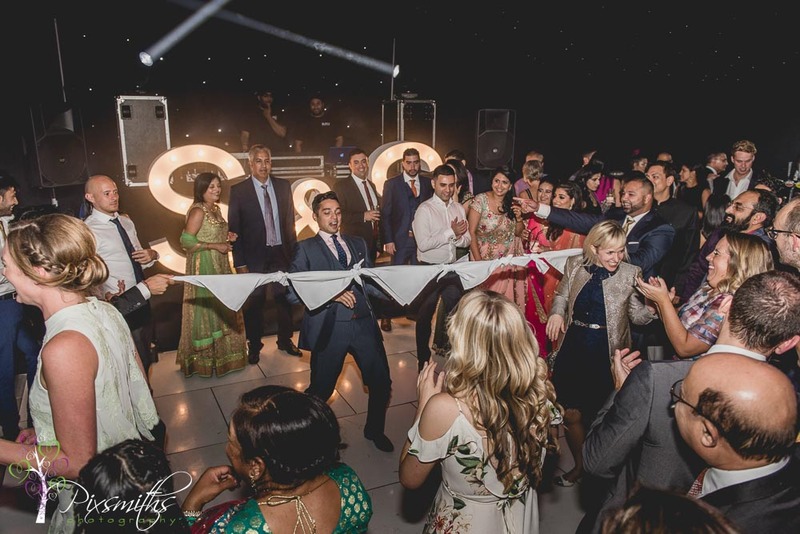 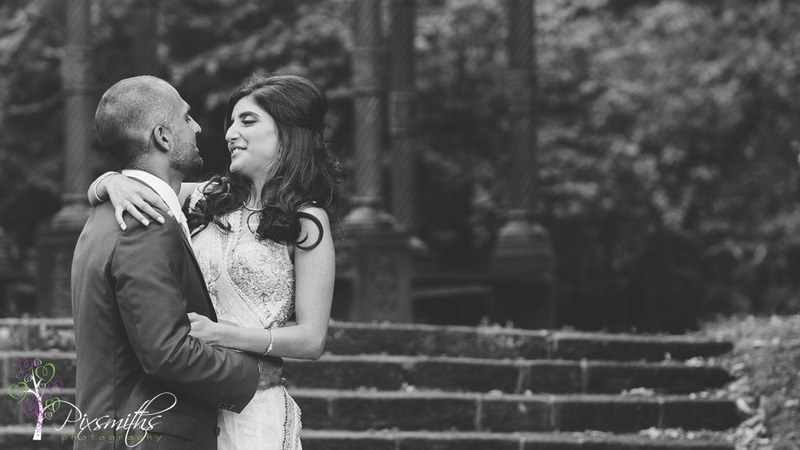 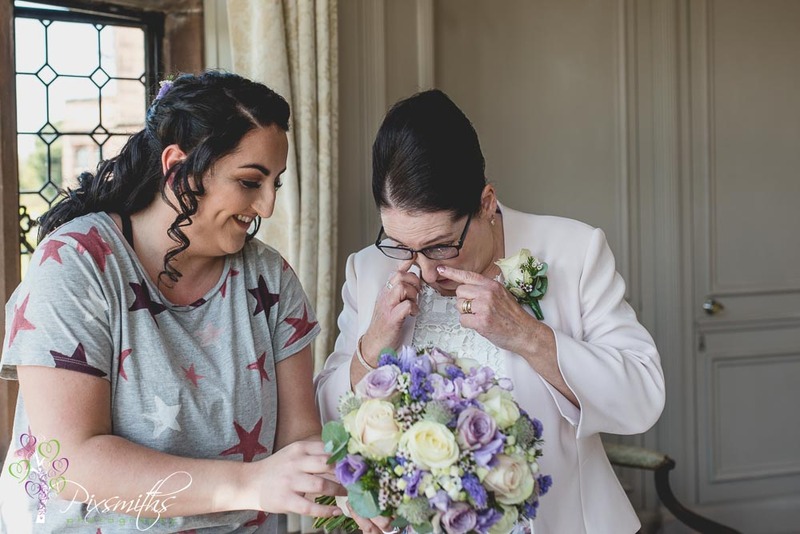 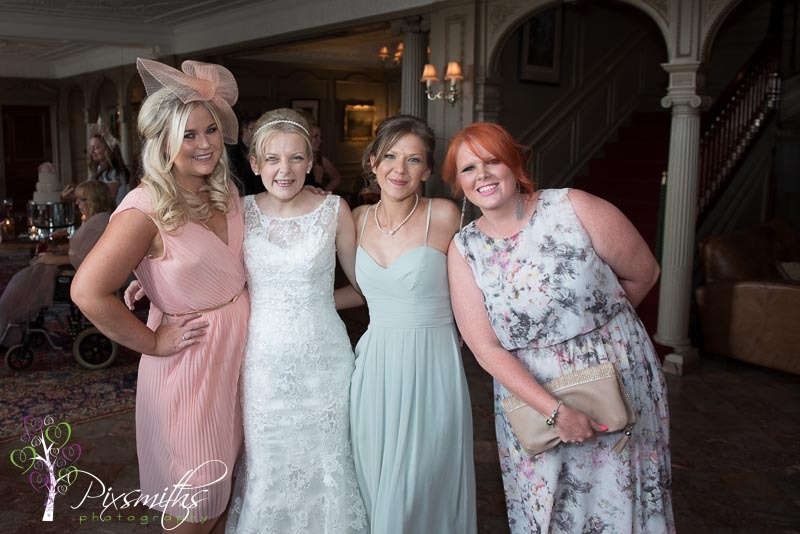 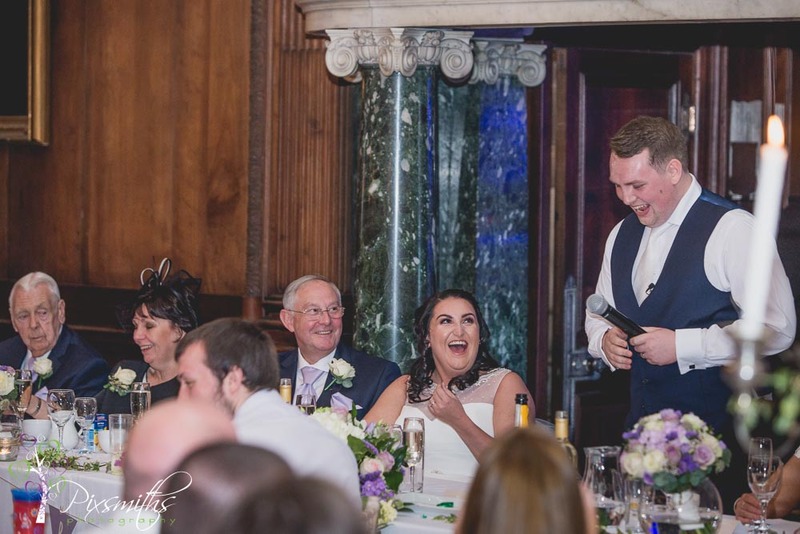 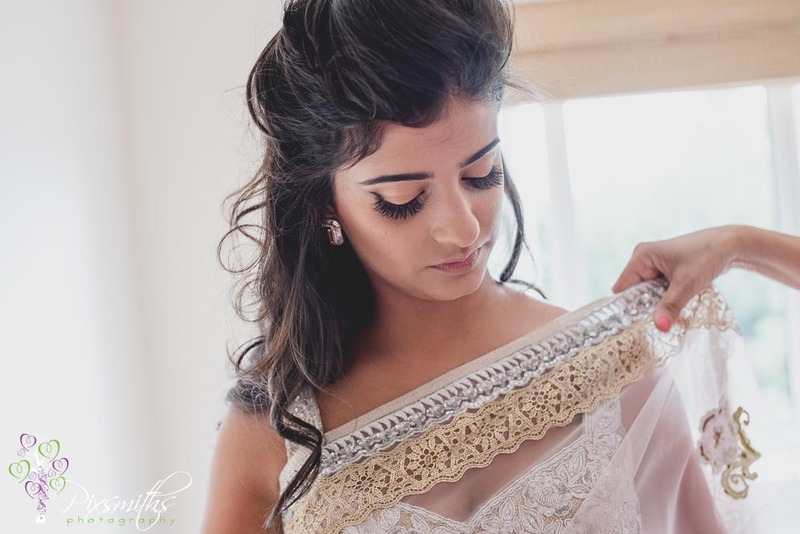 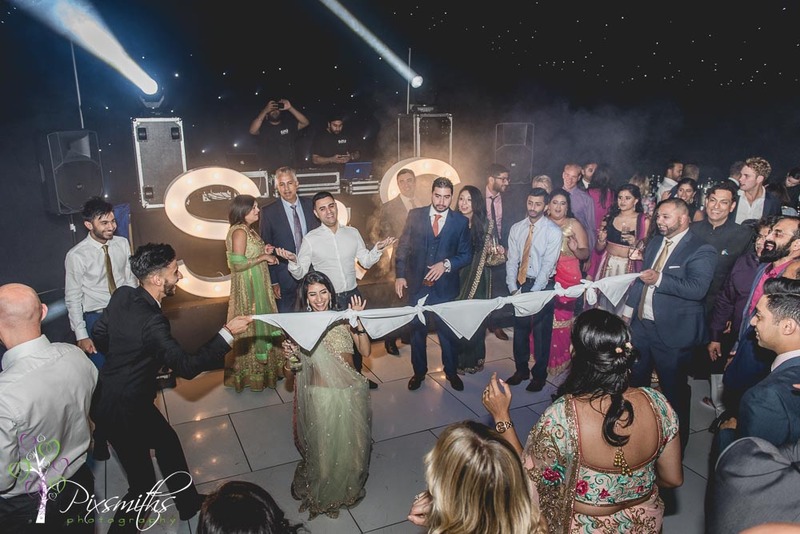 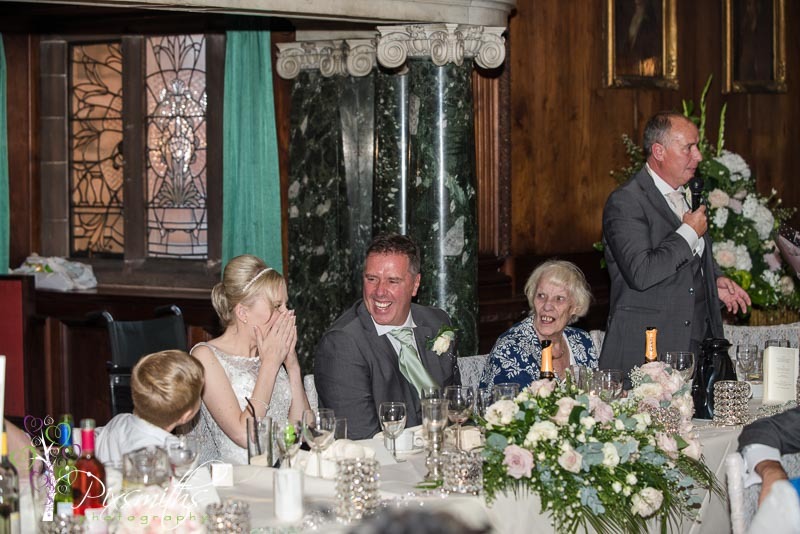 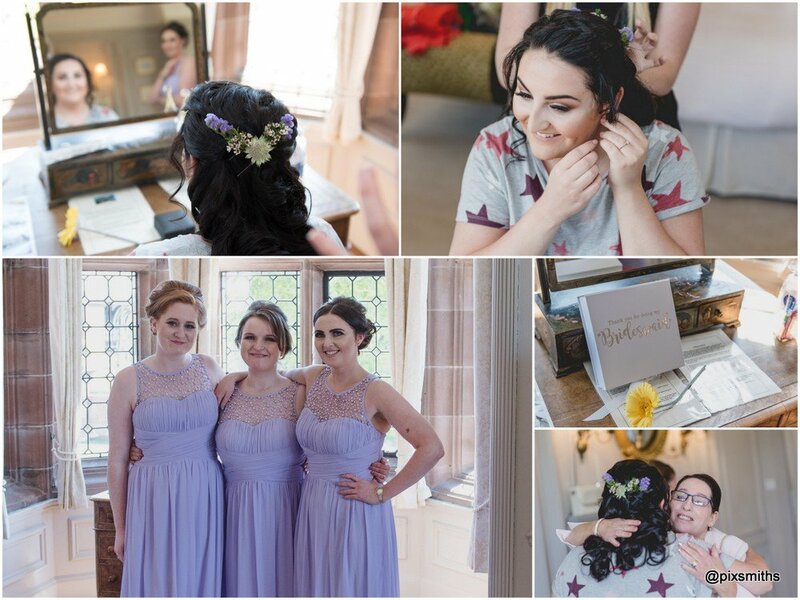 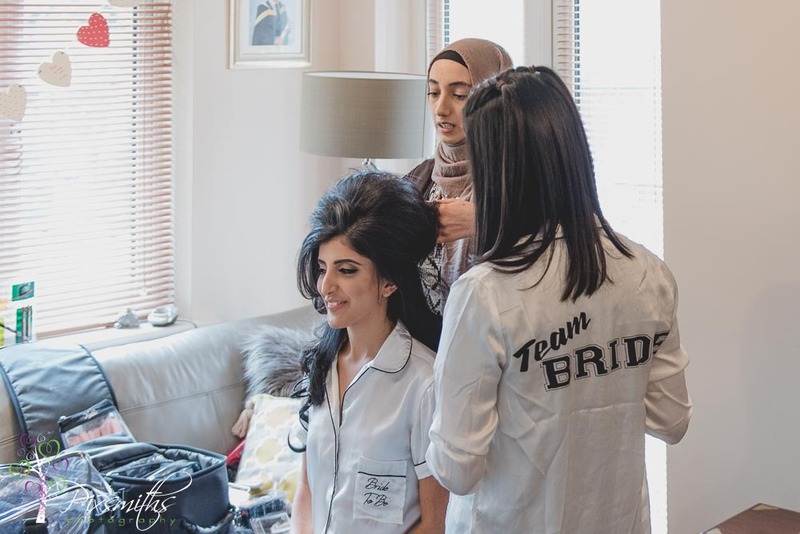 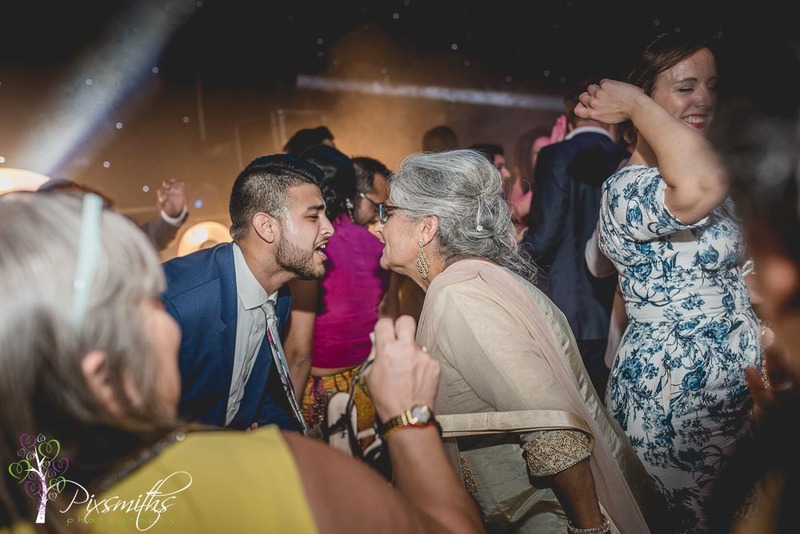 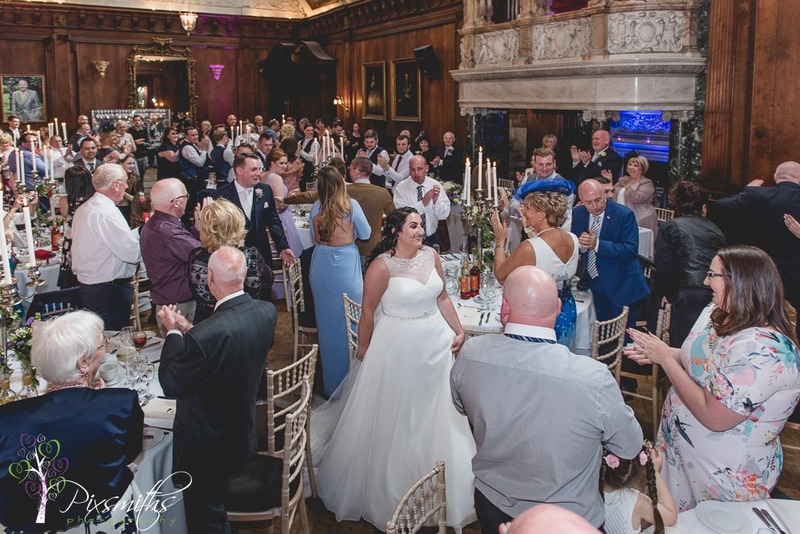 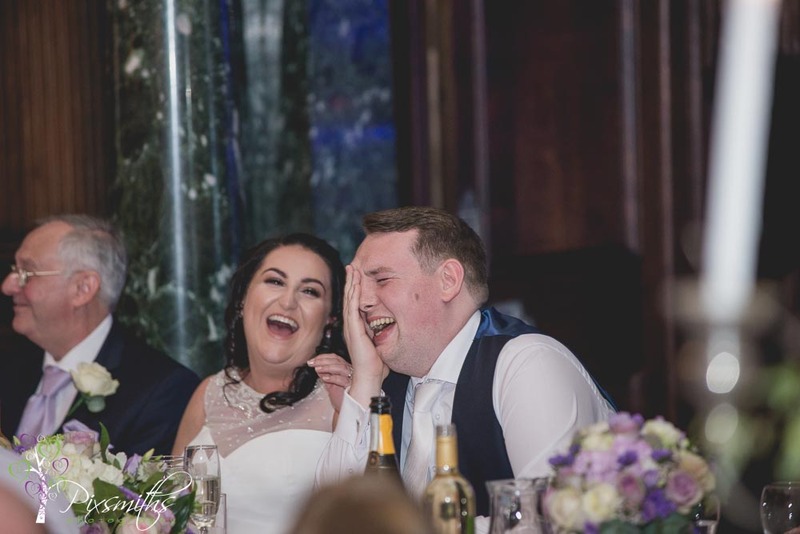 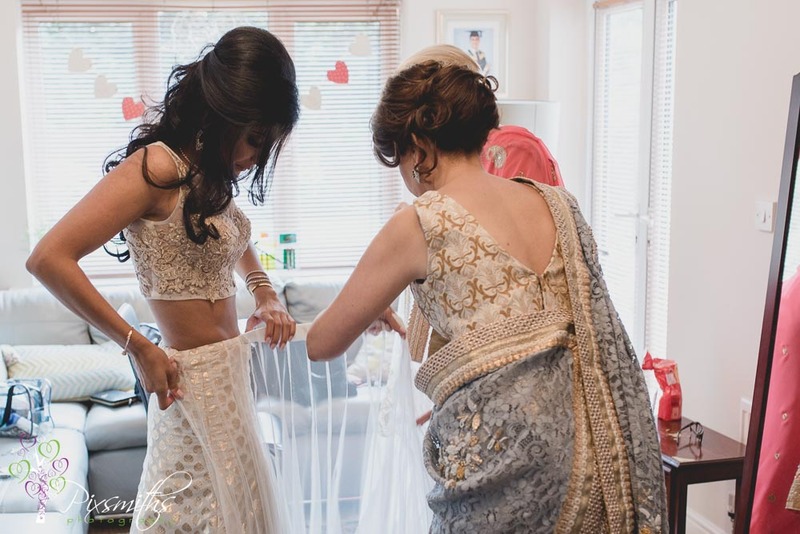 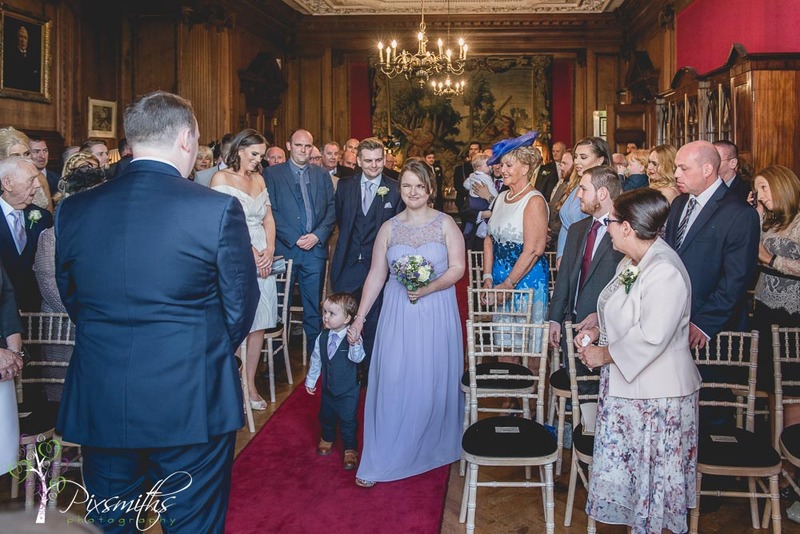 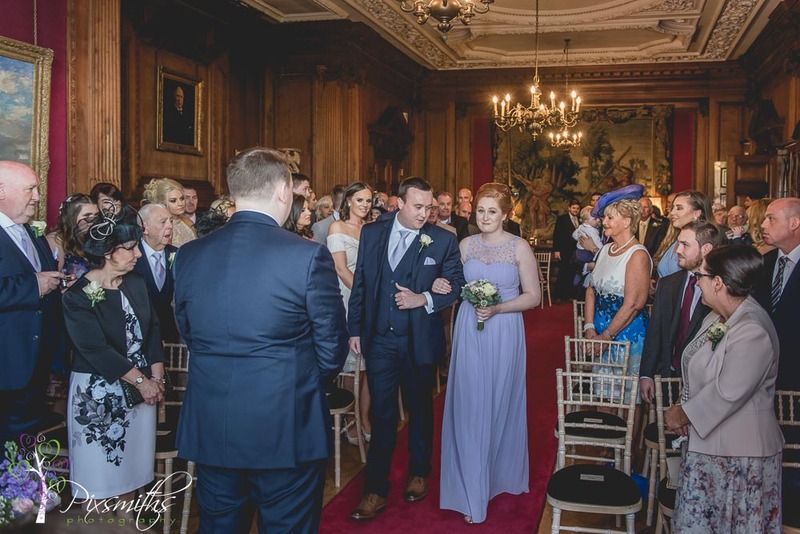 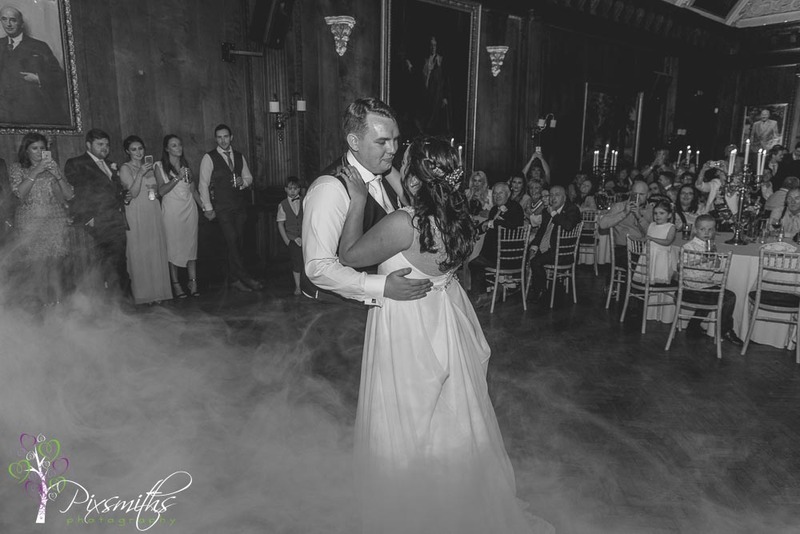 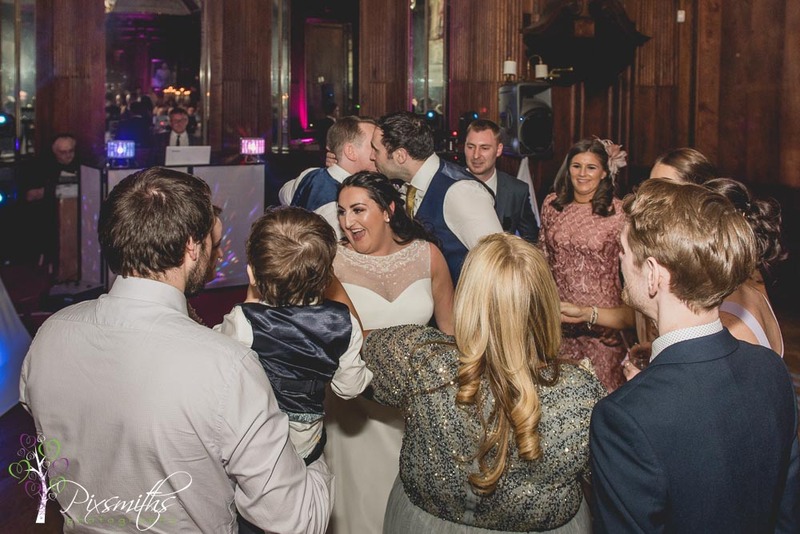 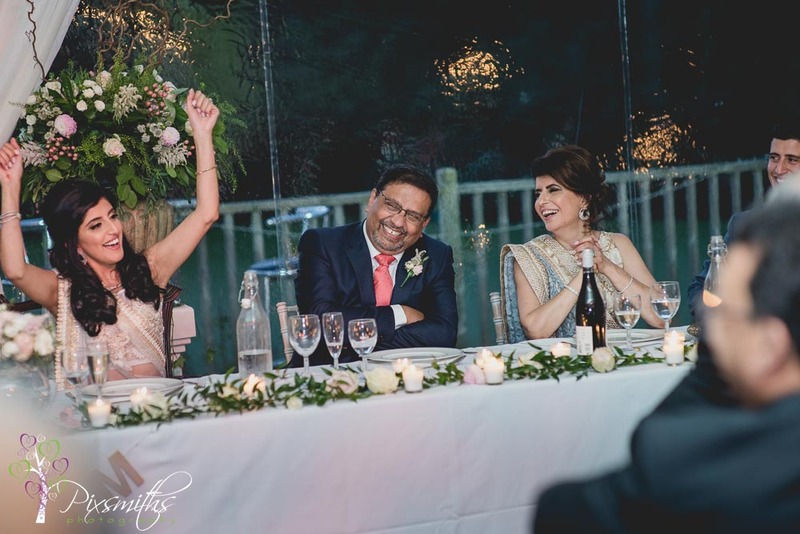 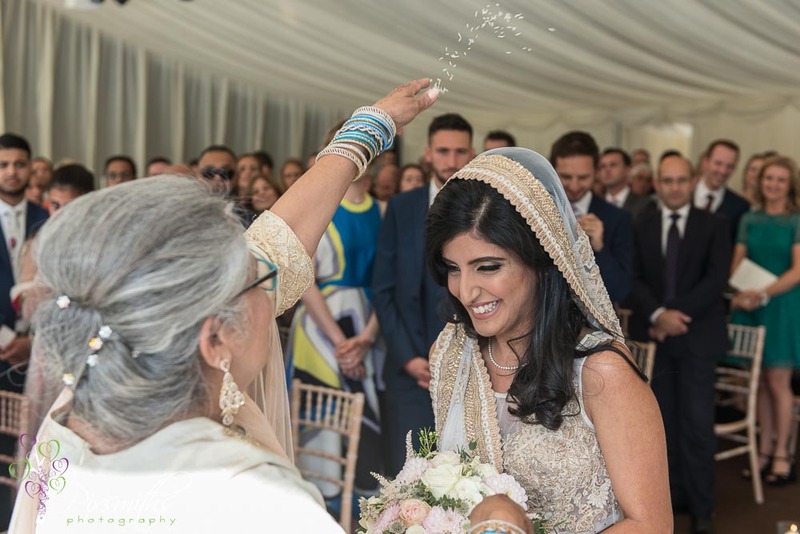 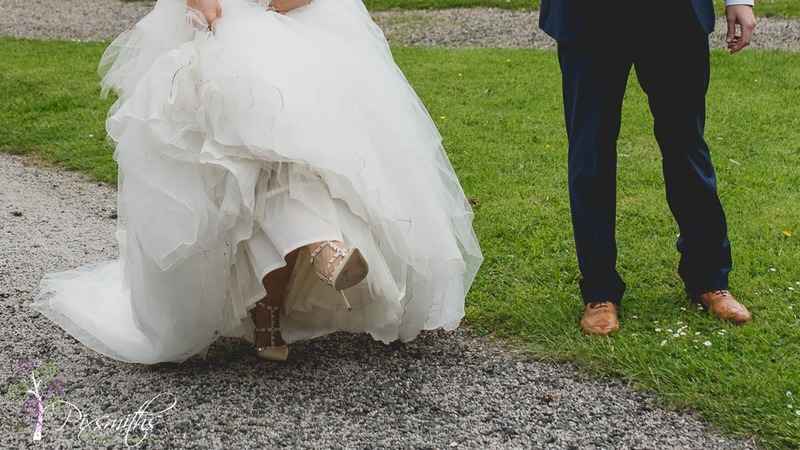 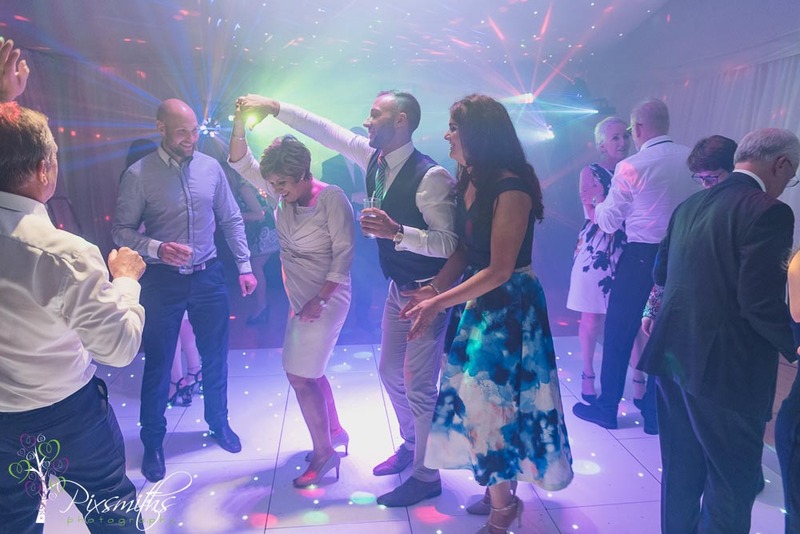 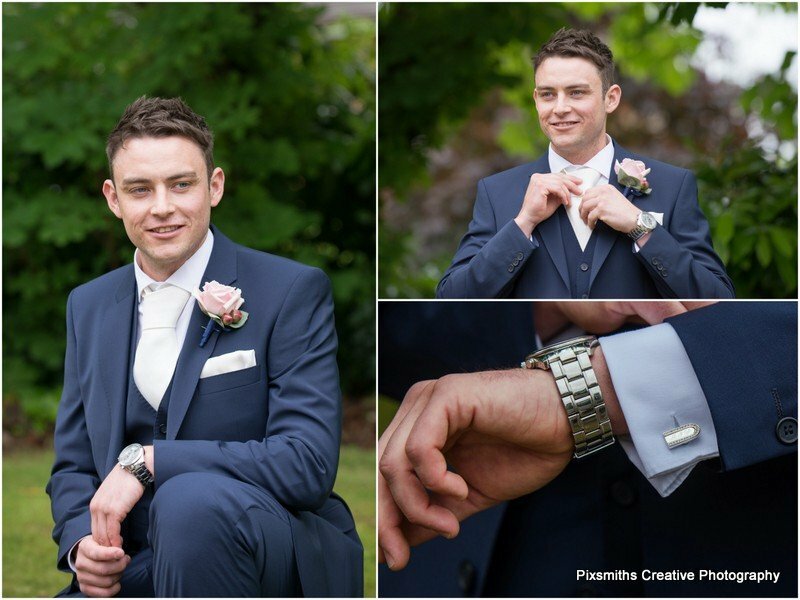 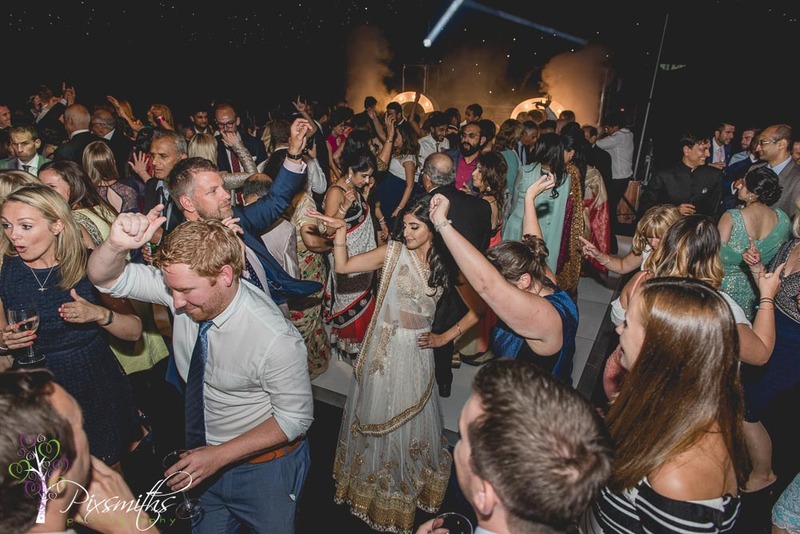 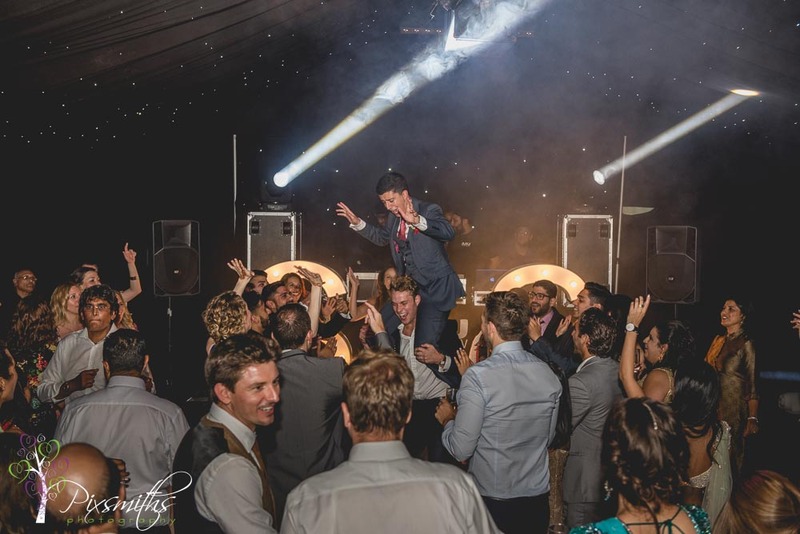 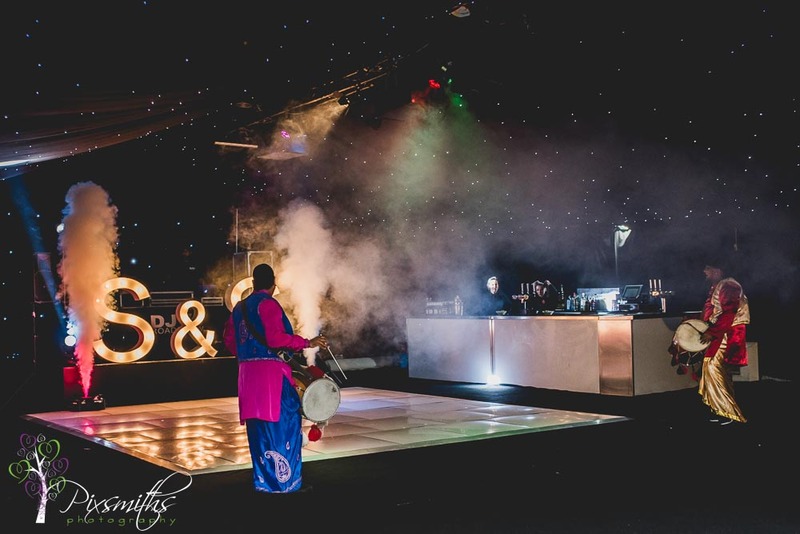 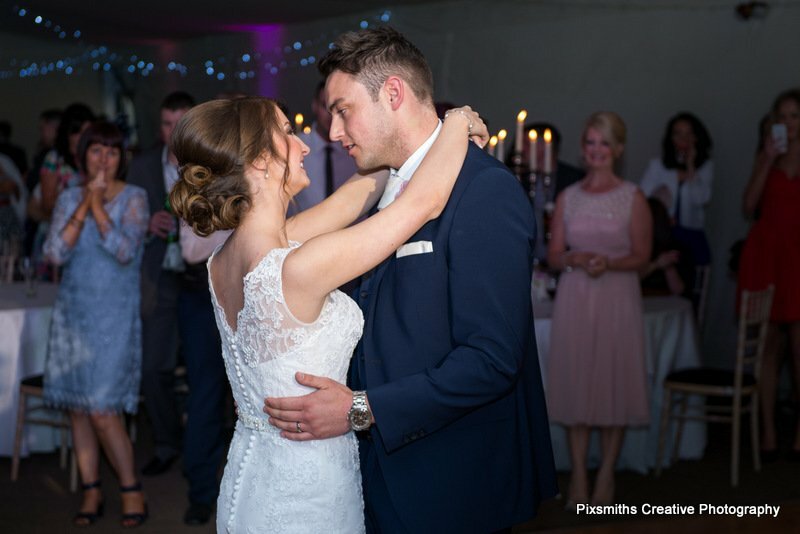 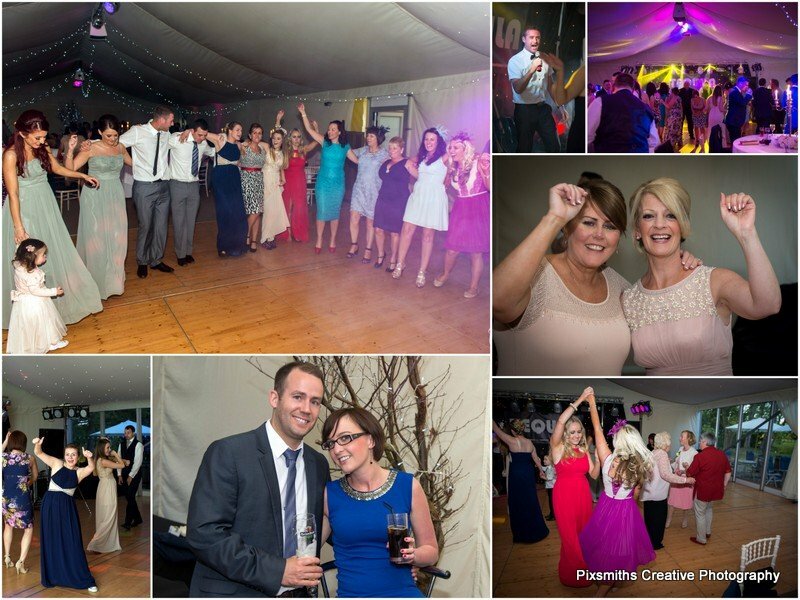 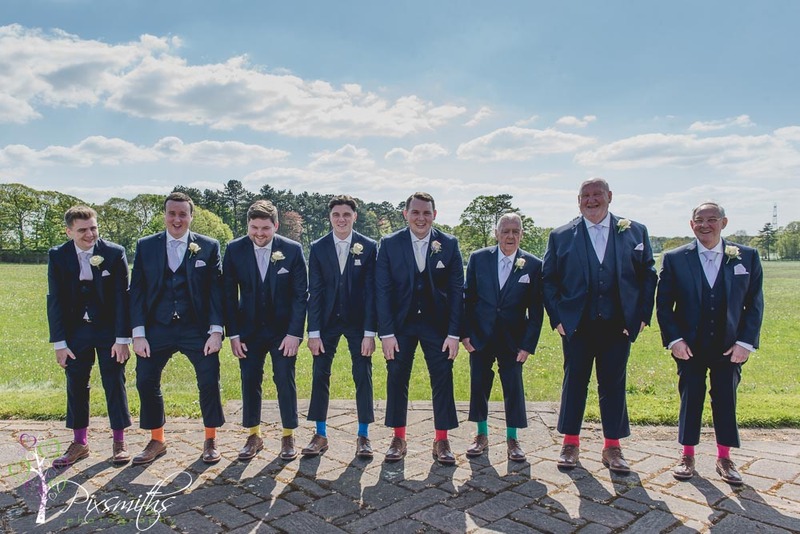 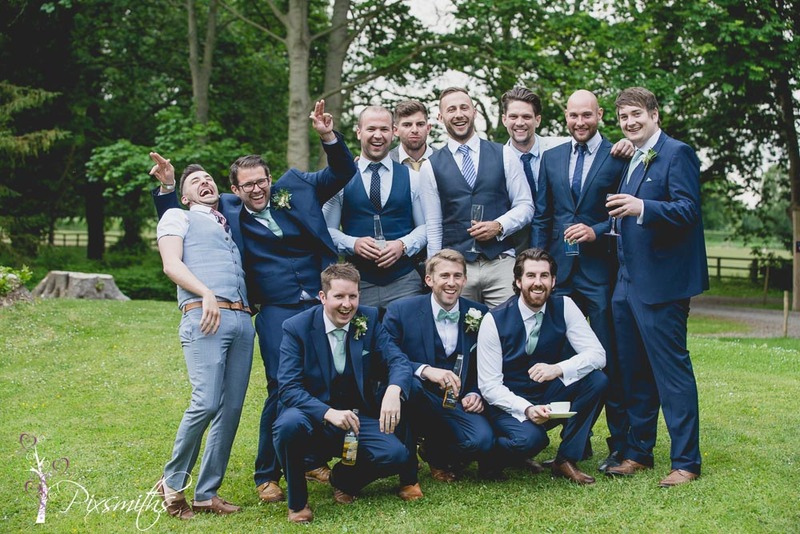 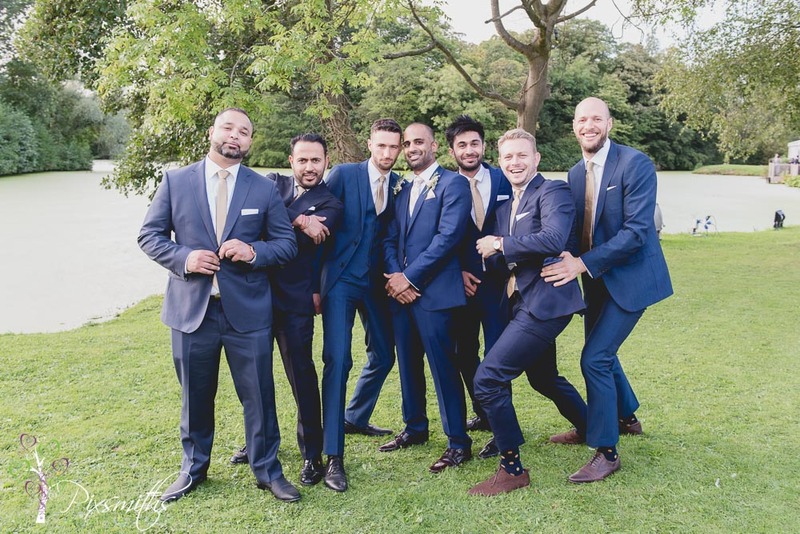 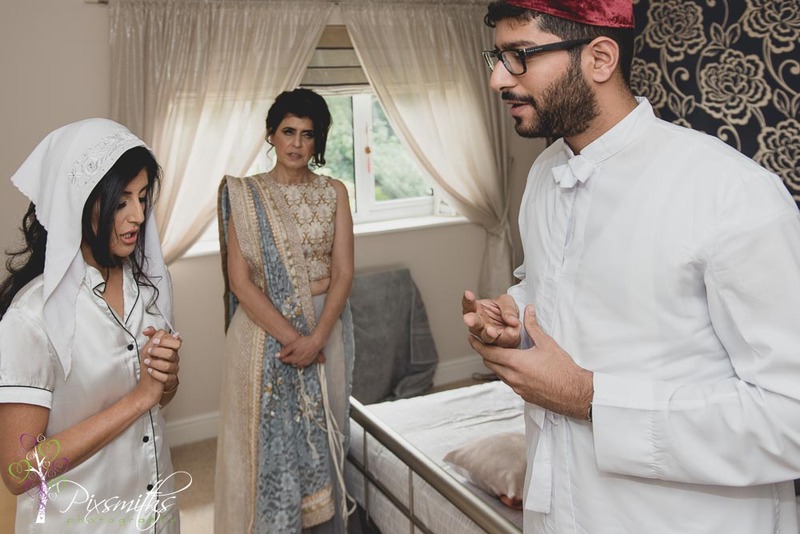 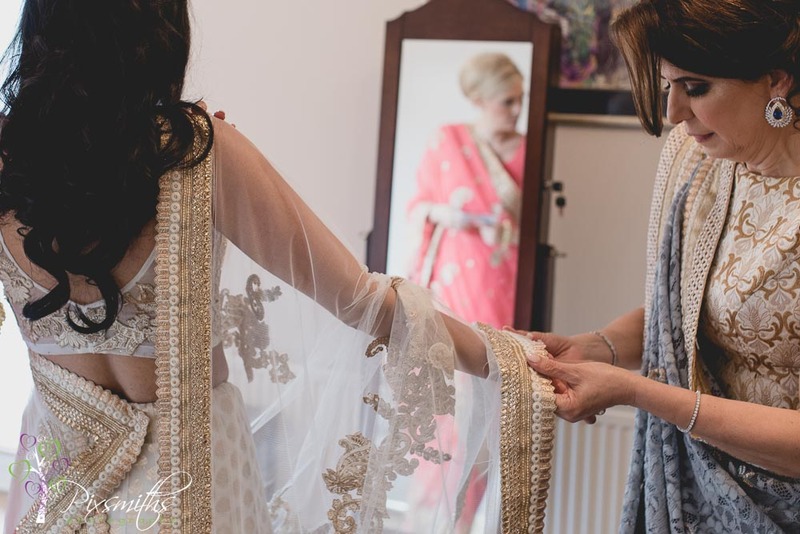 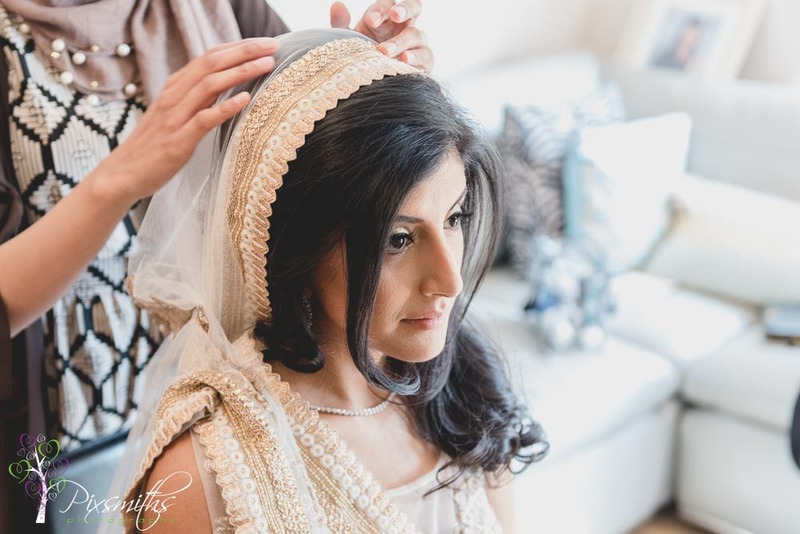 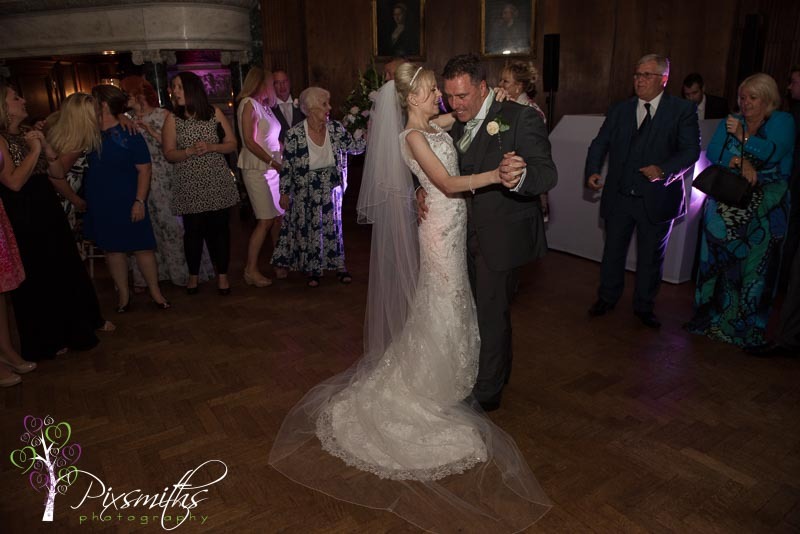 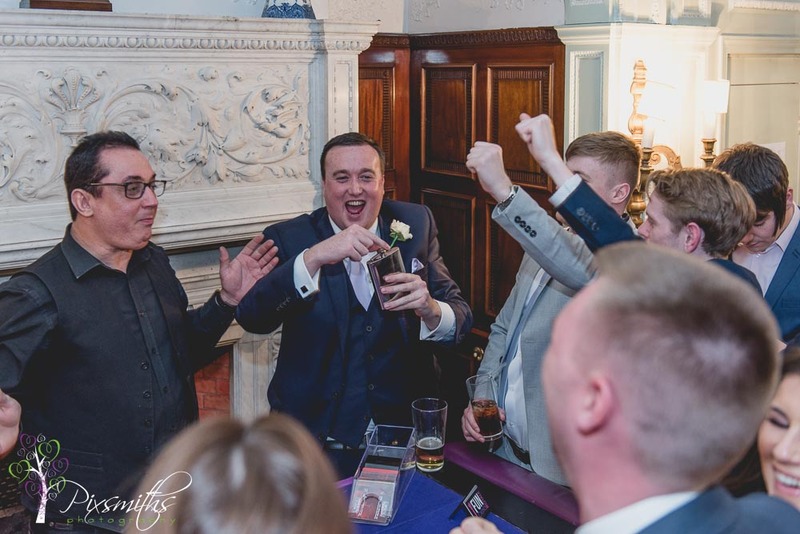 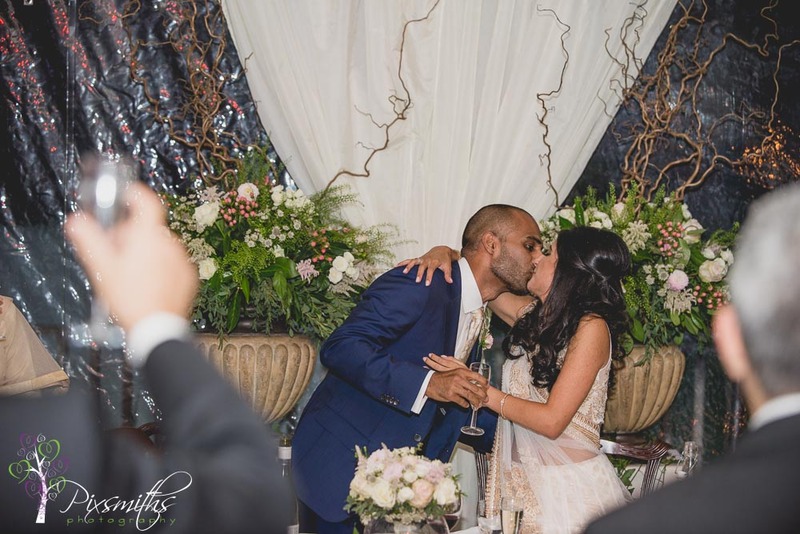 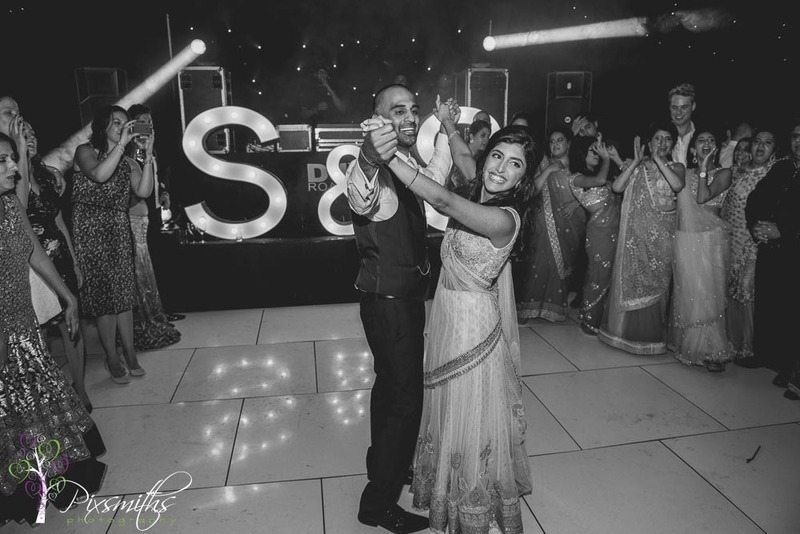 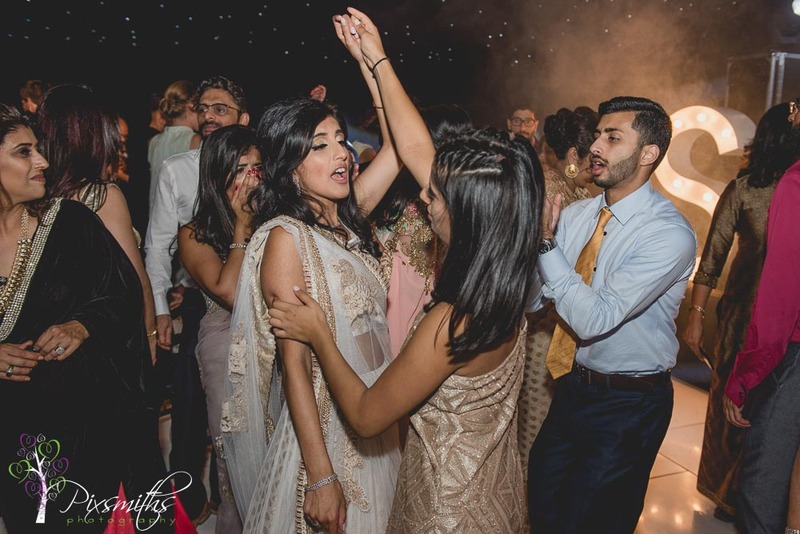 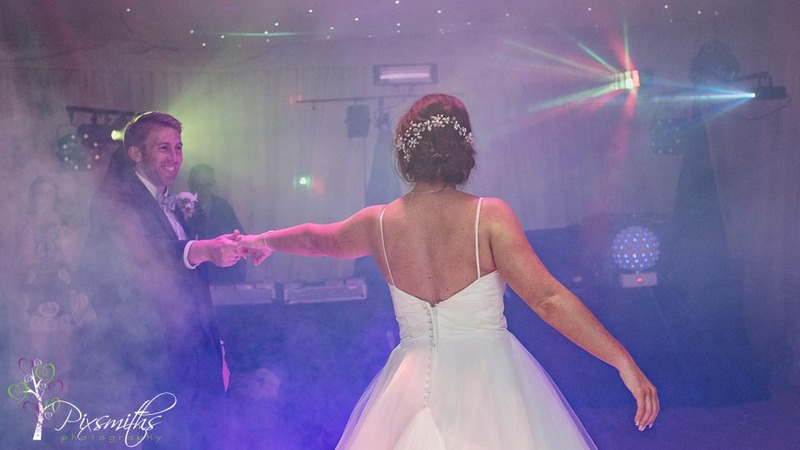 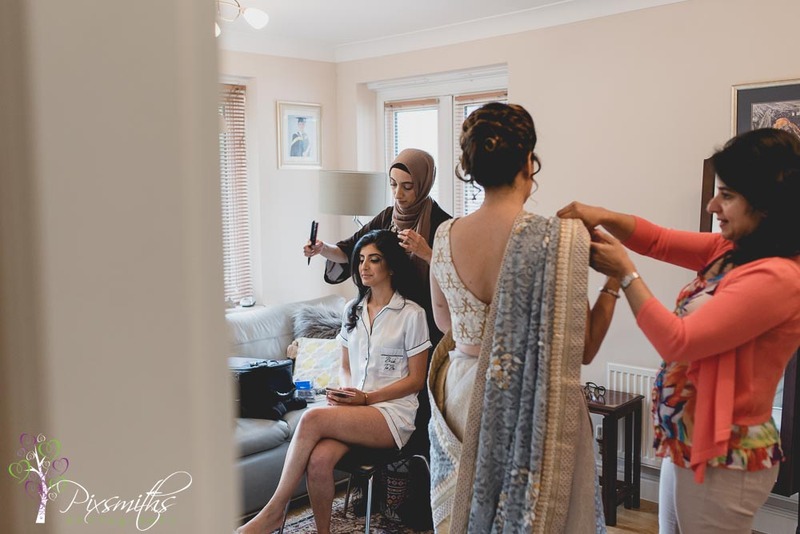 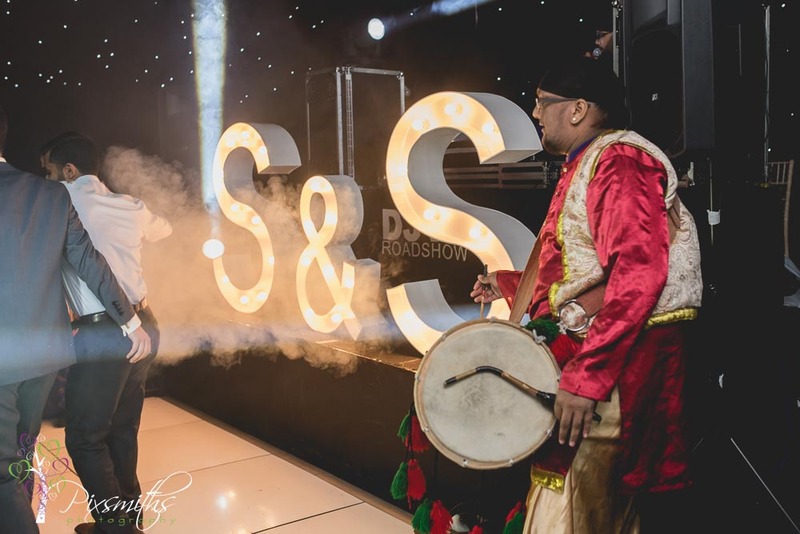 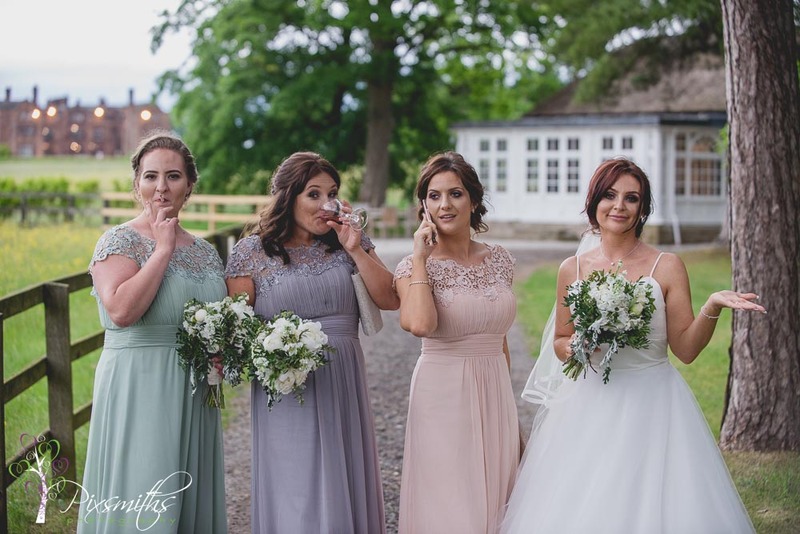 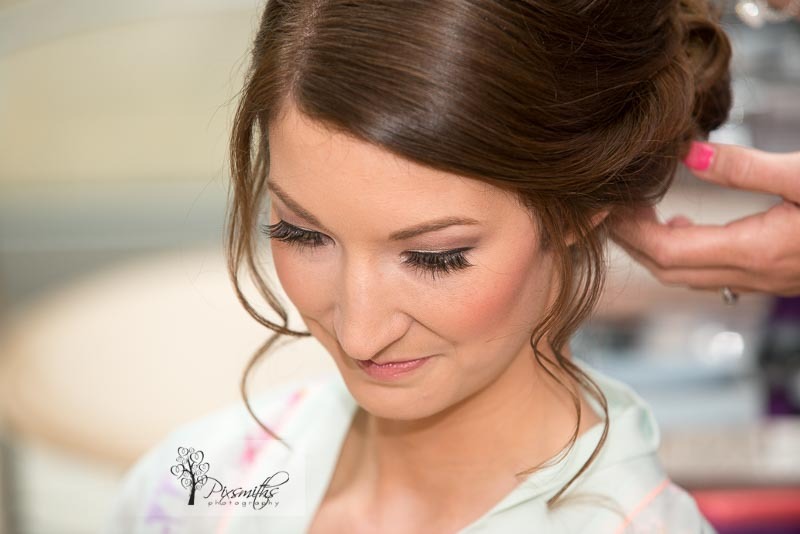 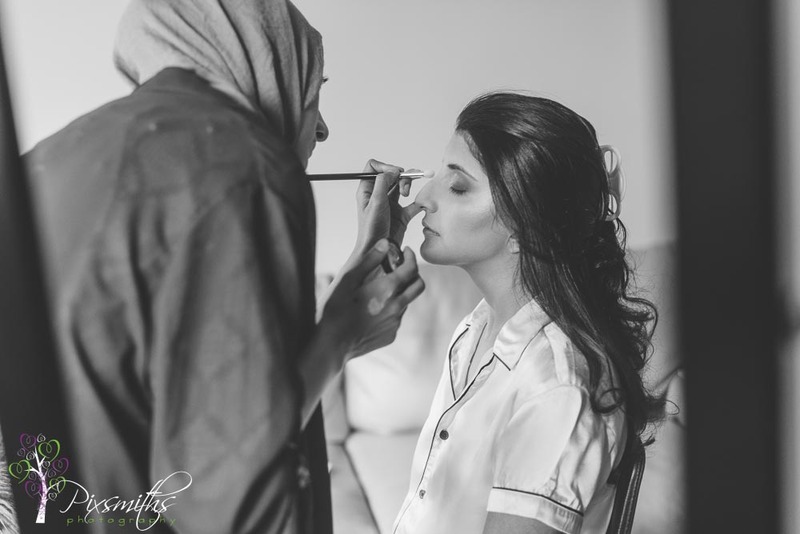 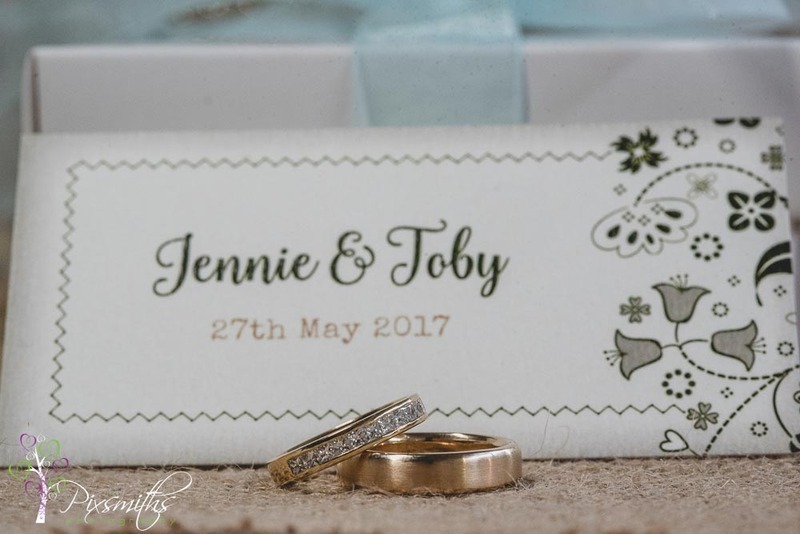 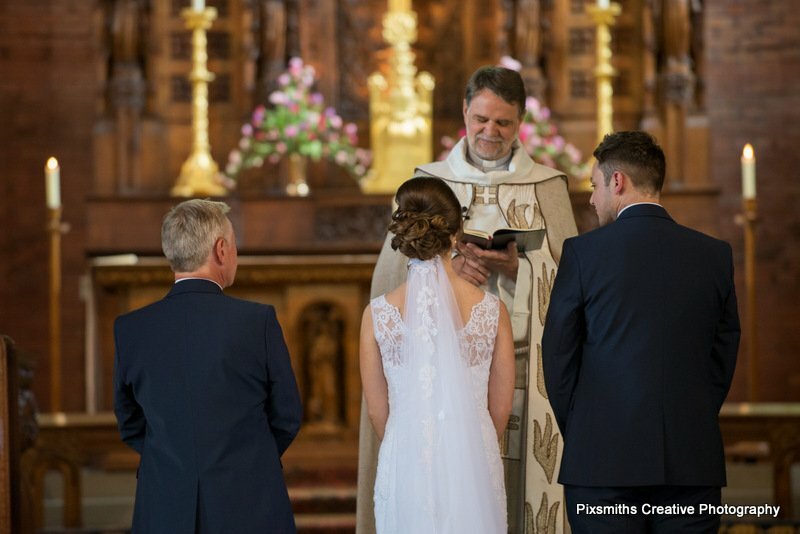 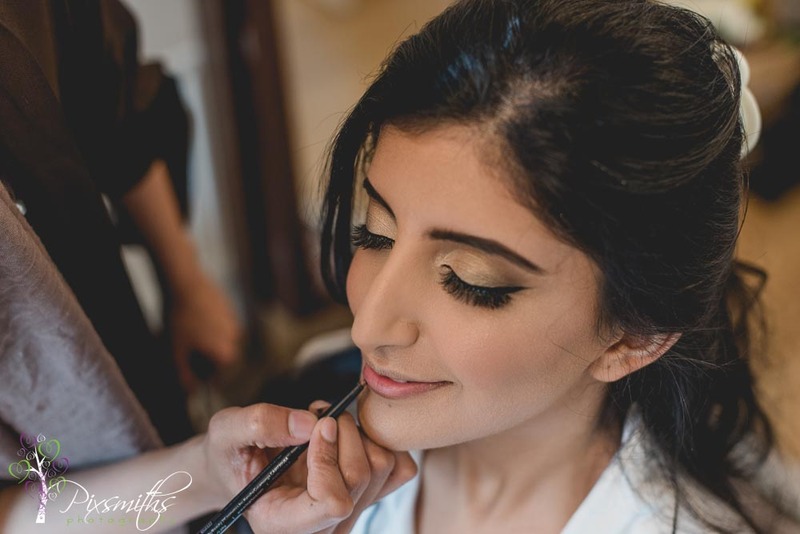 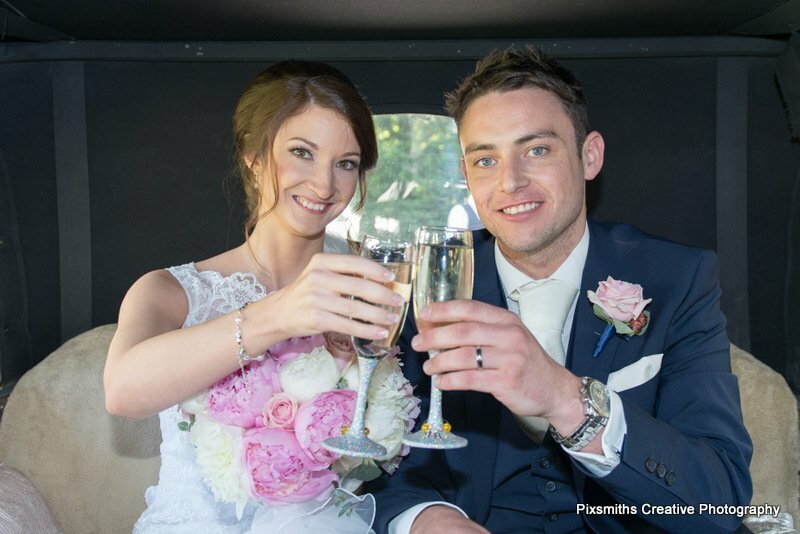 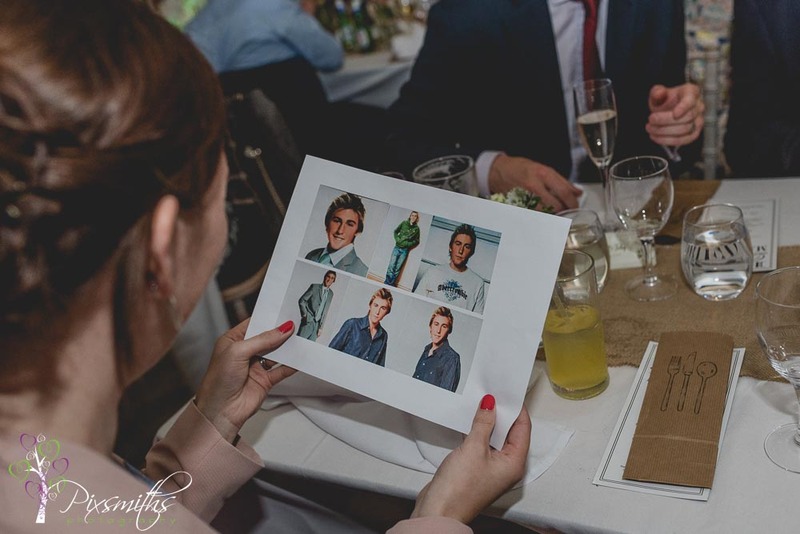 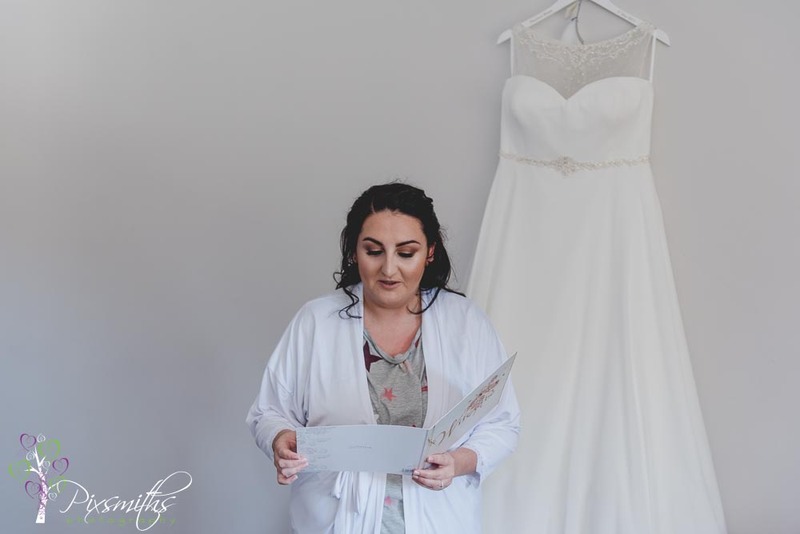 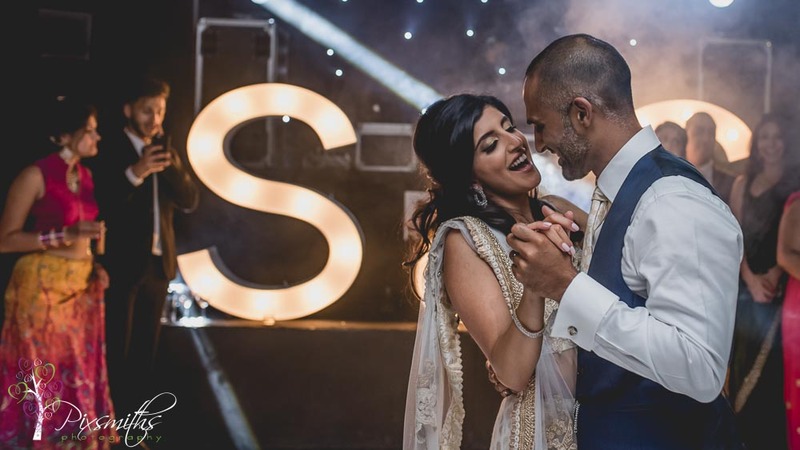 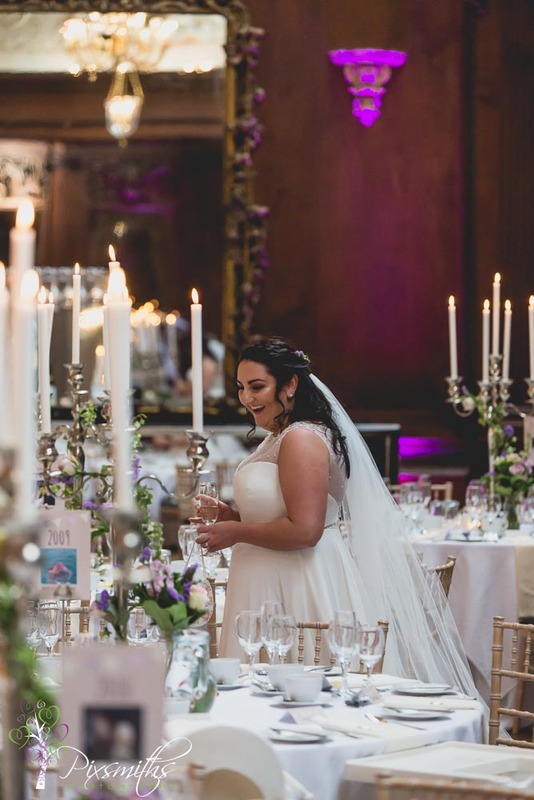 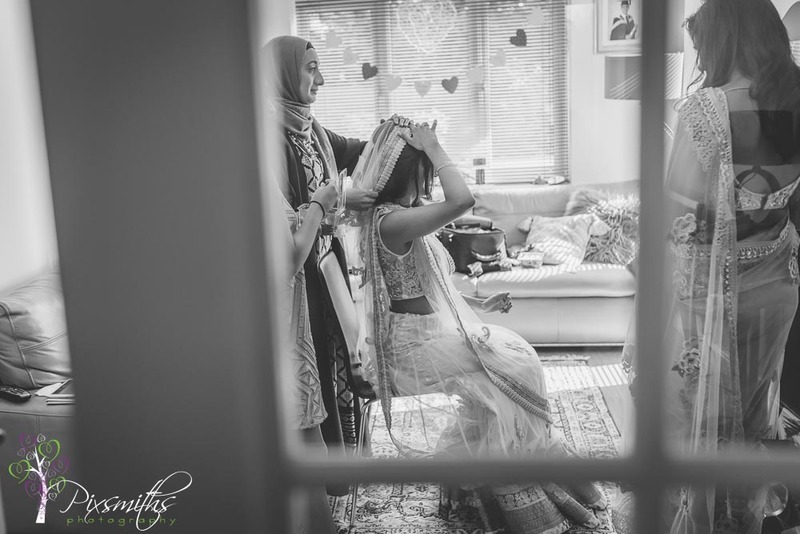 Please enjoy the story of the day as we go from bridal preps right the way through to the evening parrty with Tequilla in full swing – the band not the drink!